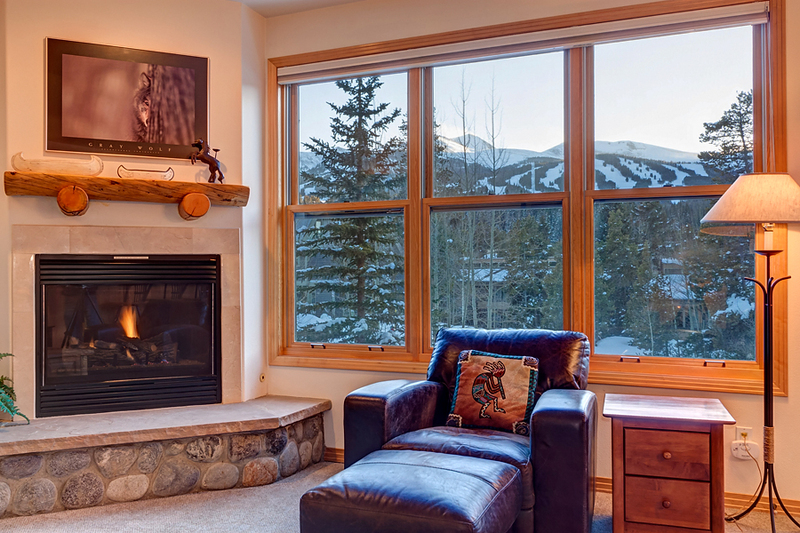 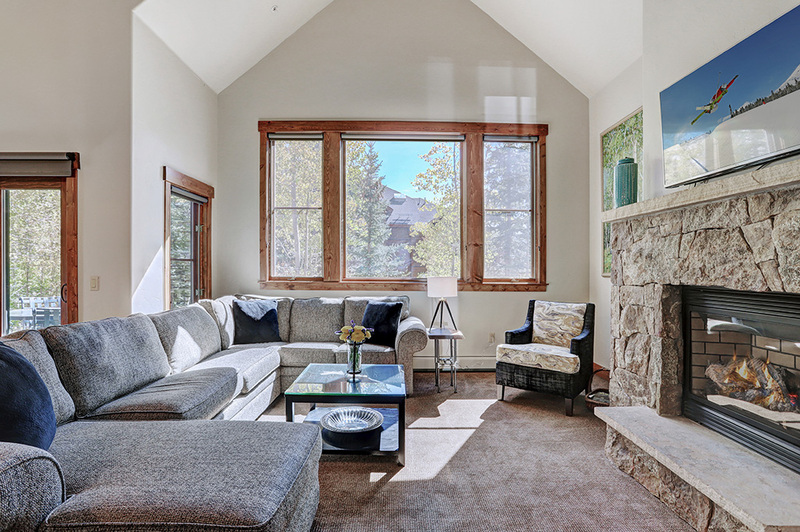 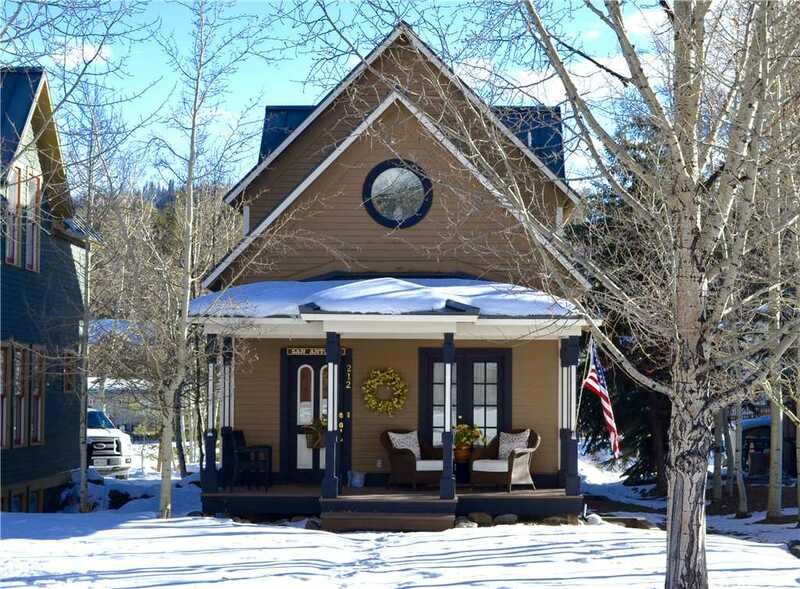 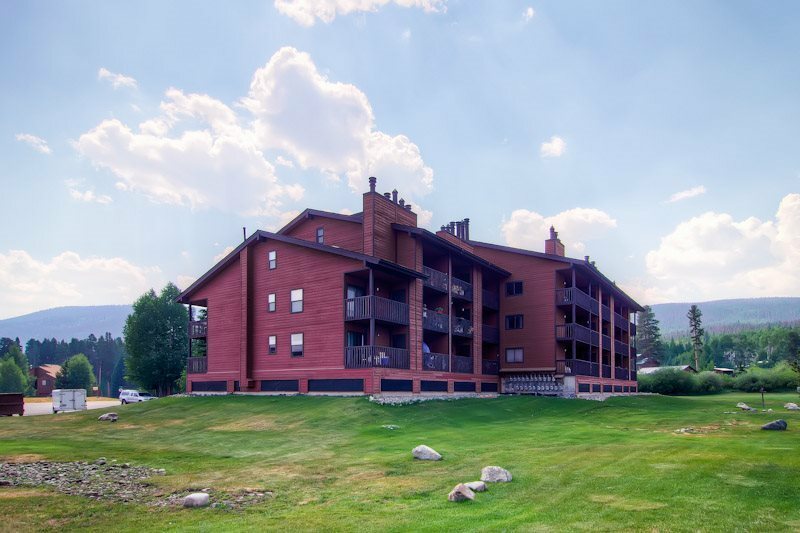 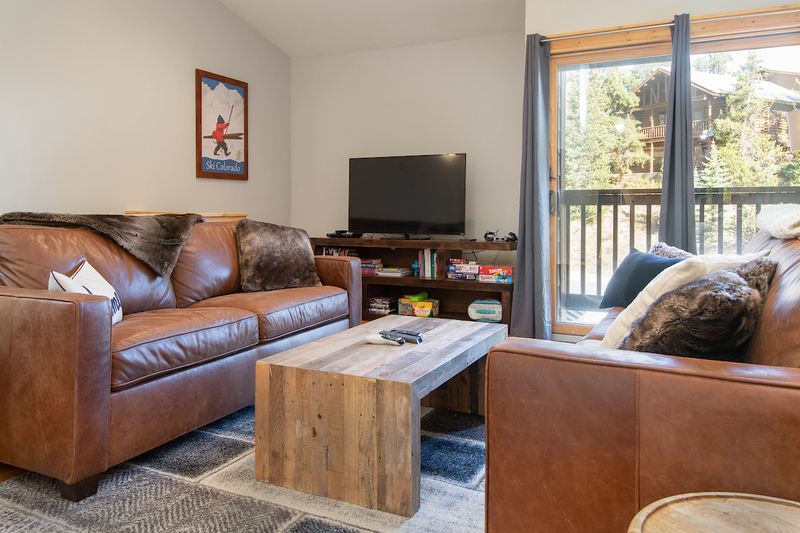 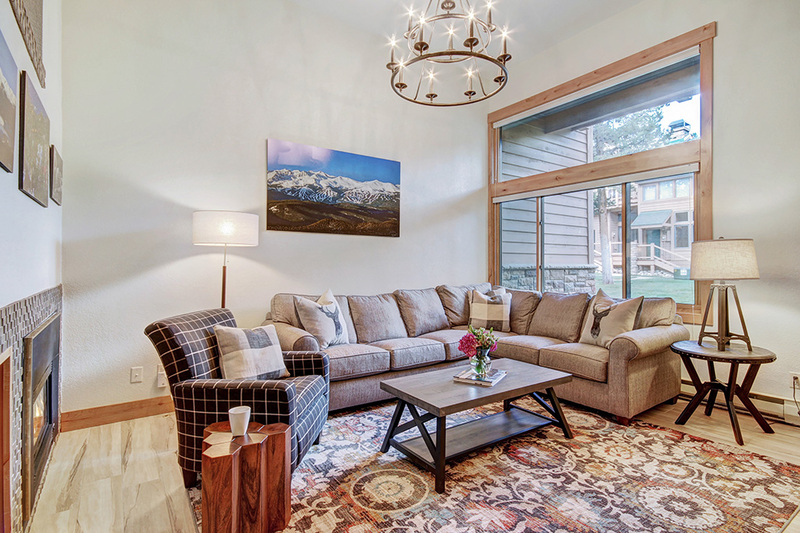 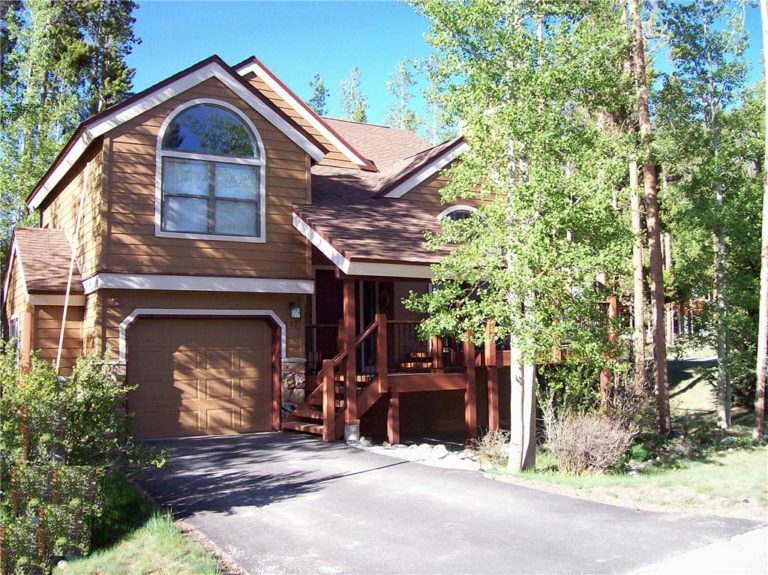 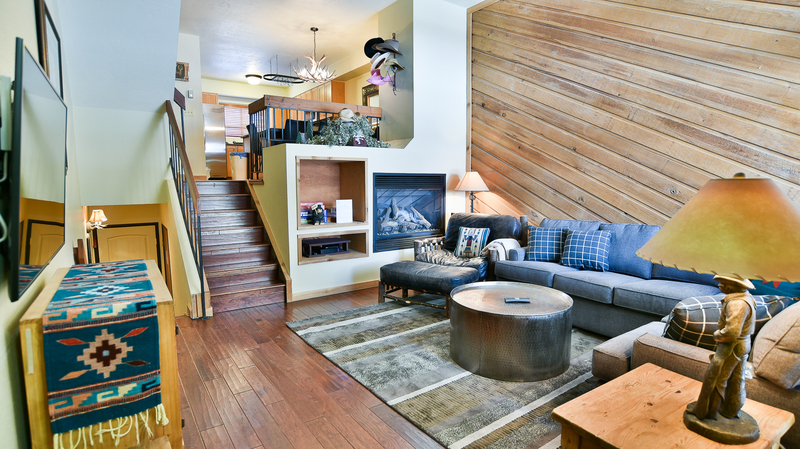 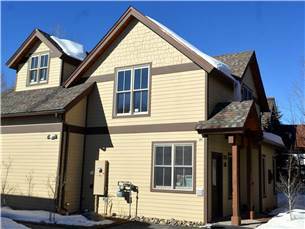 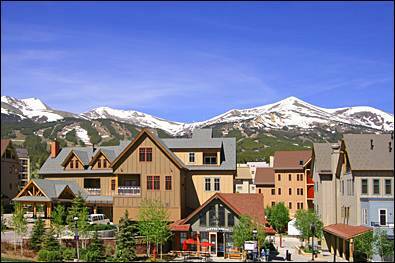 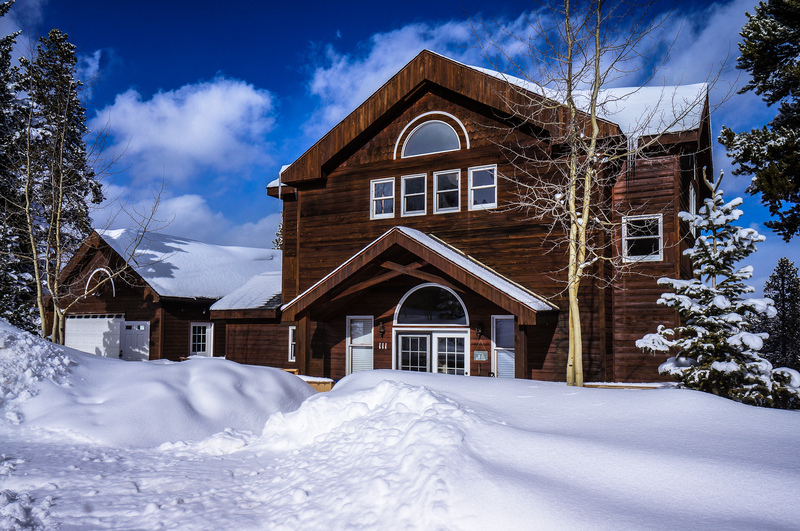 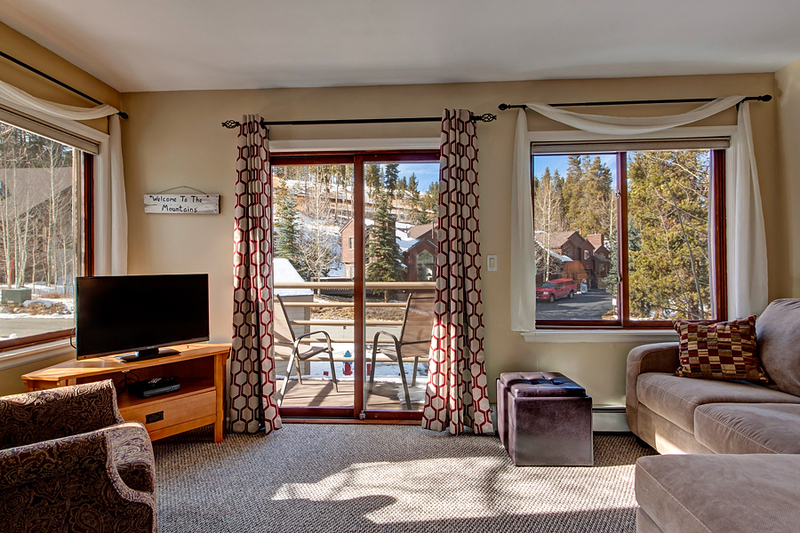 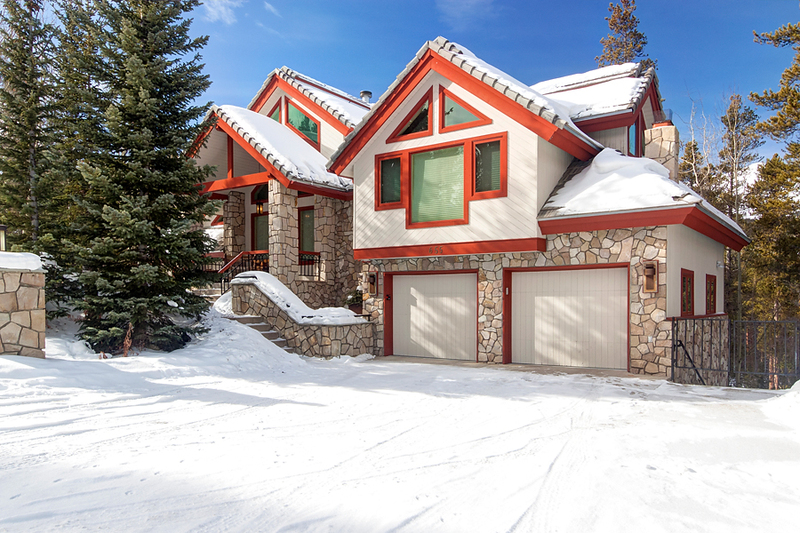 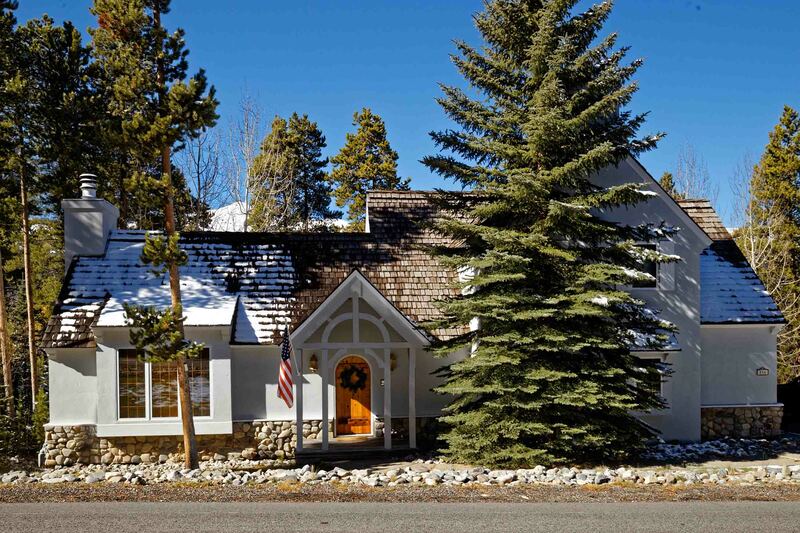 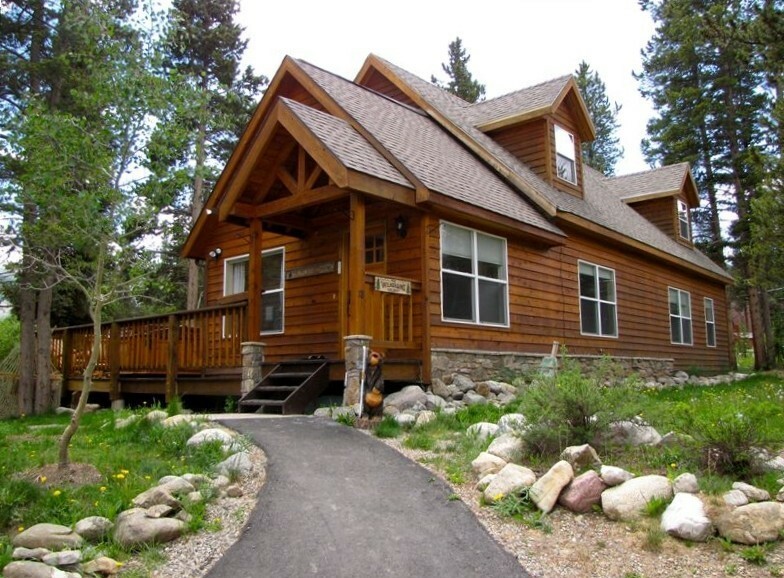 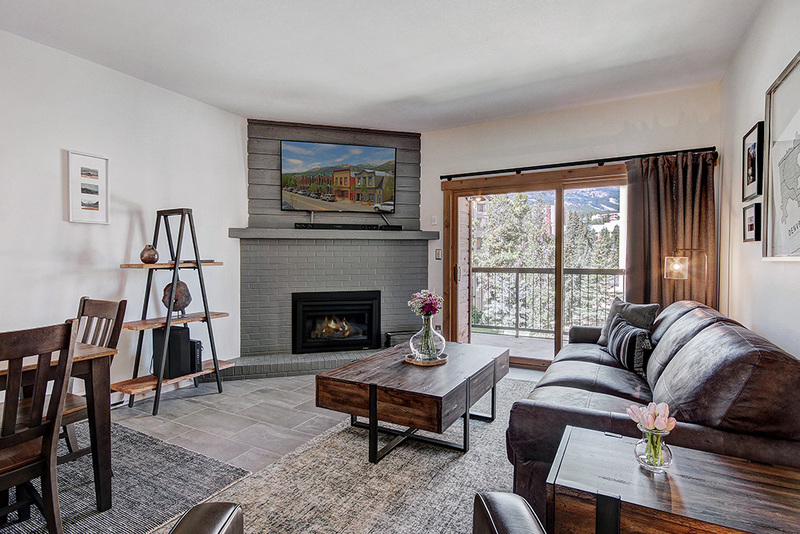 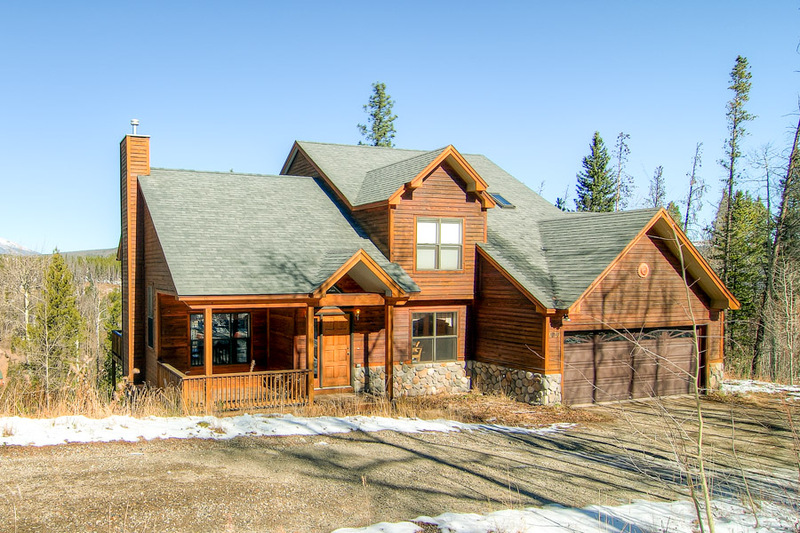 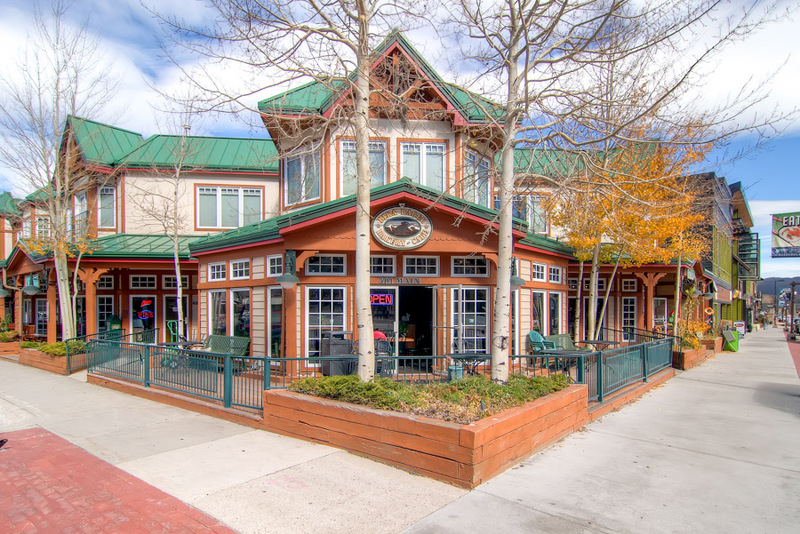 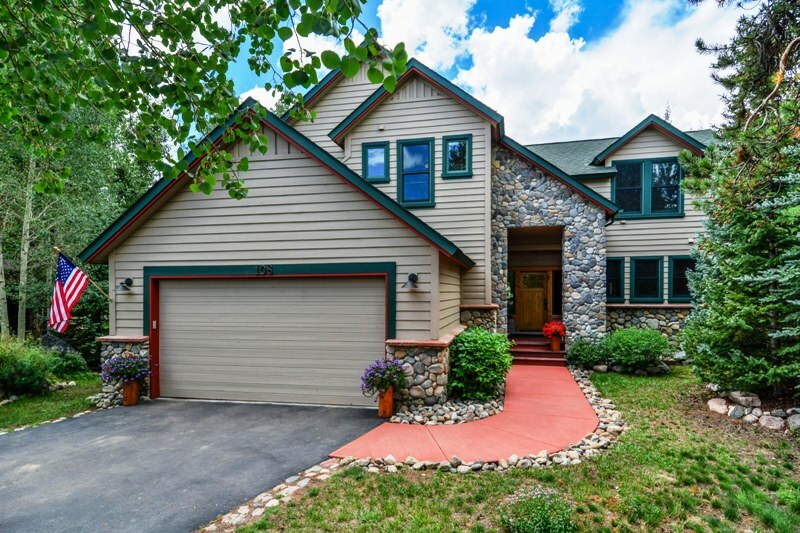 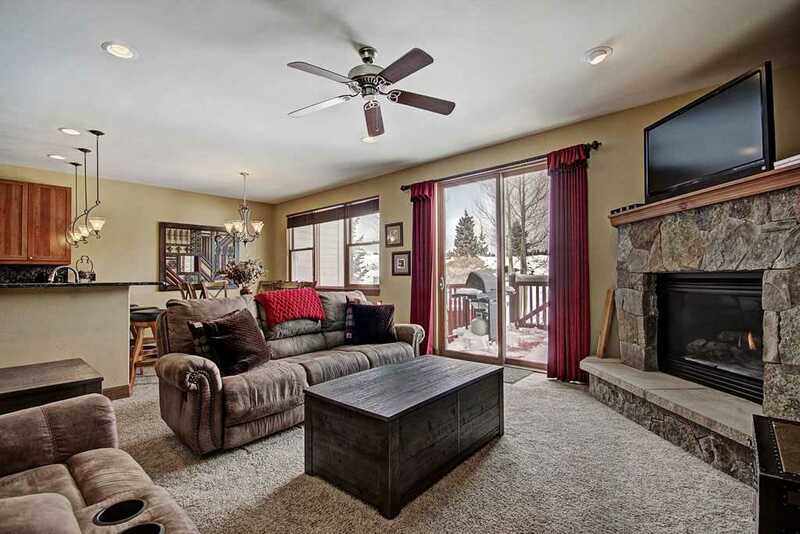 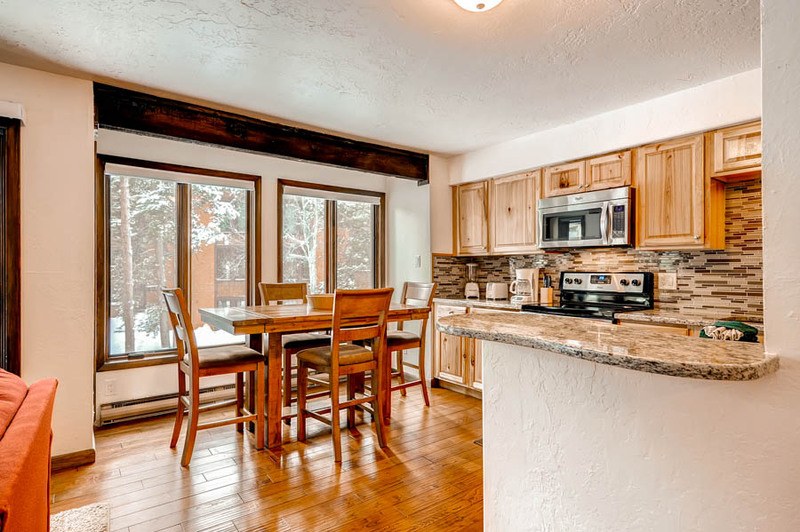 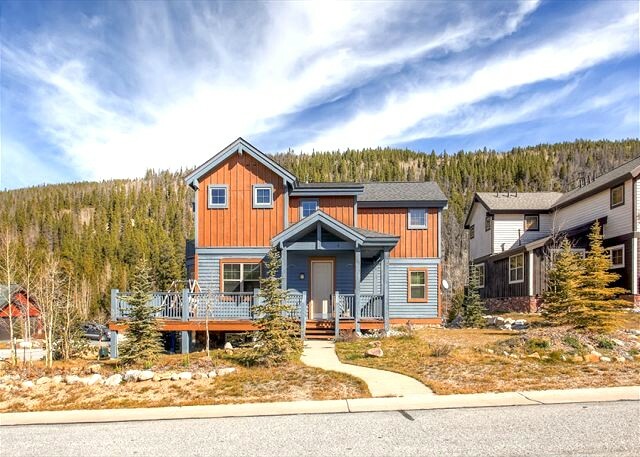 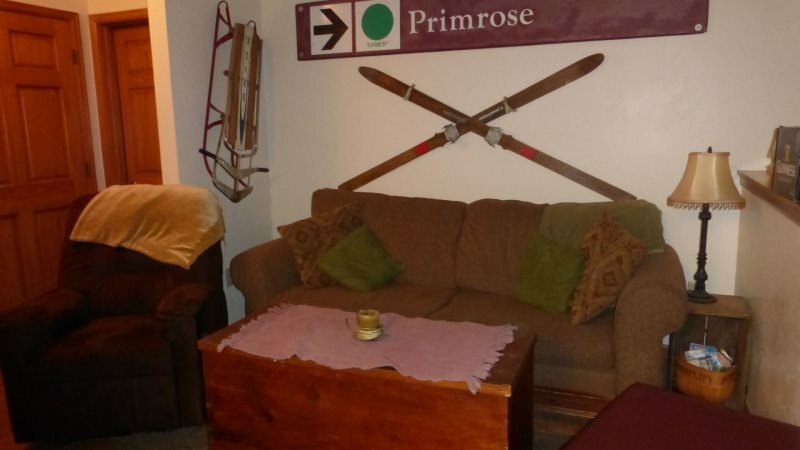 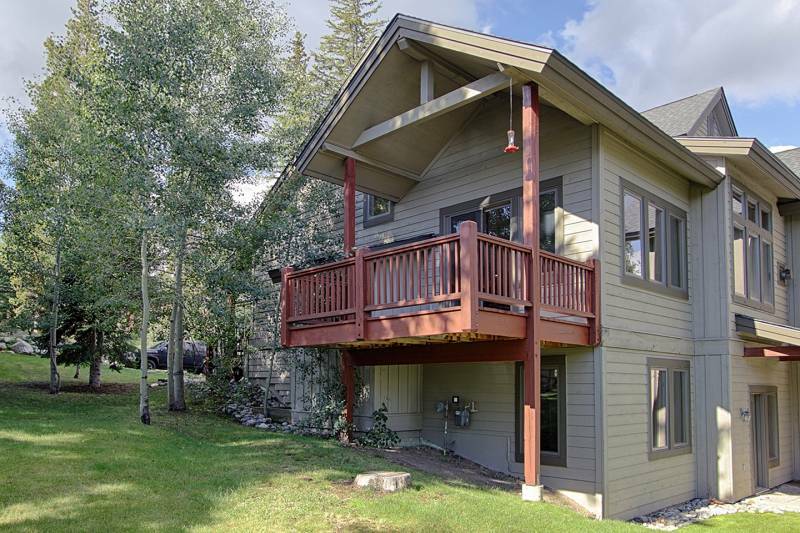 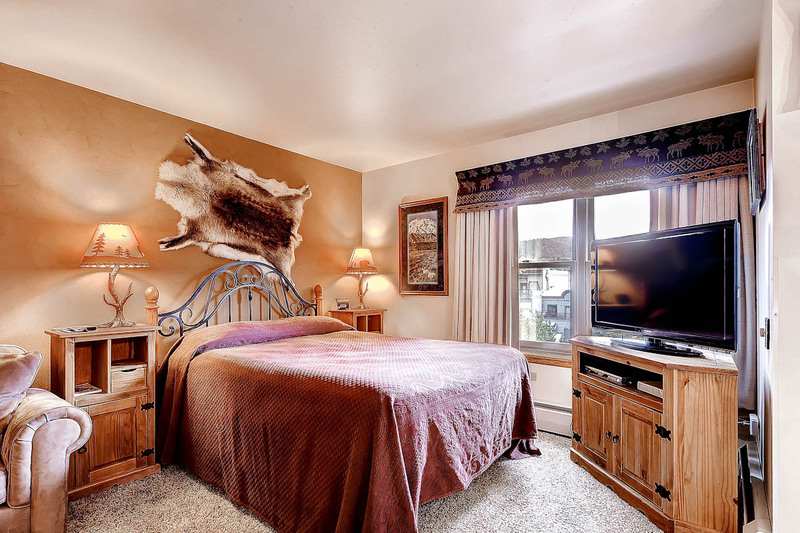 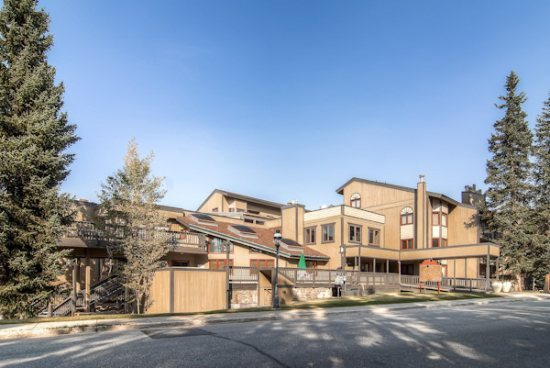 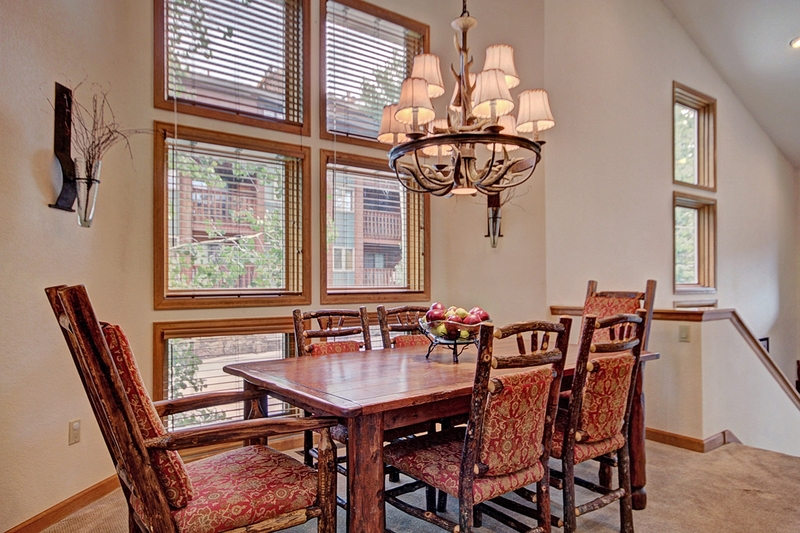 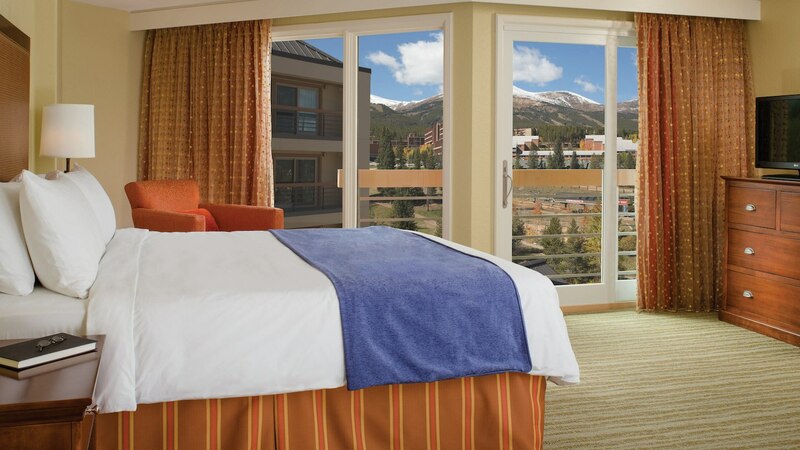 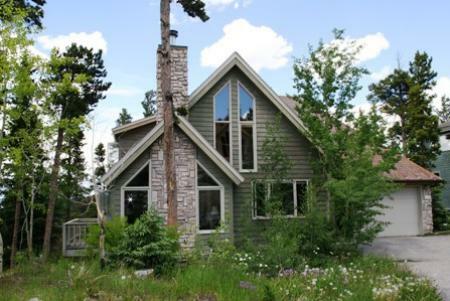 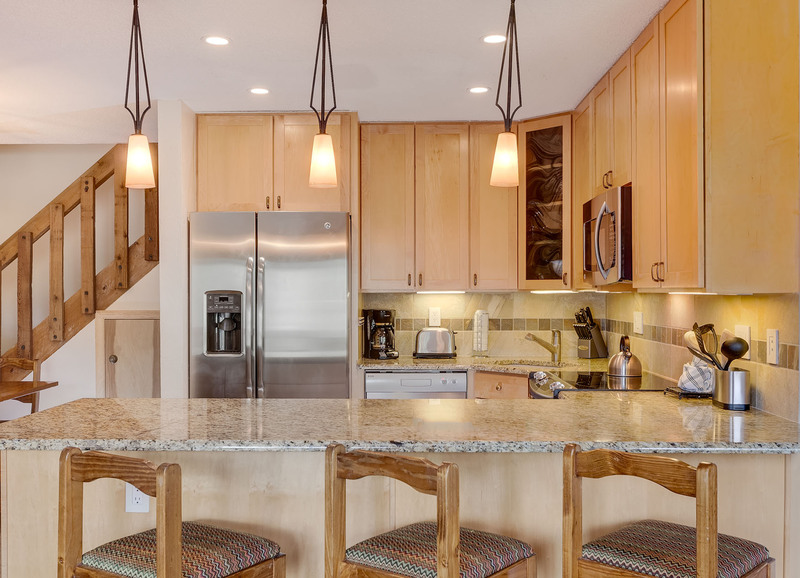 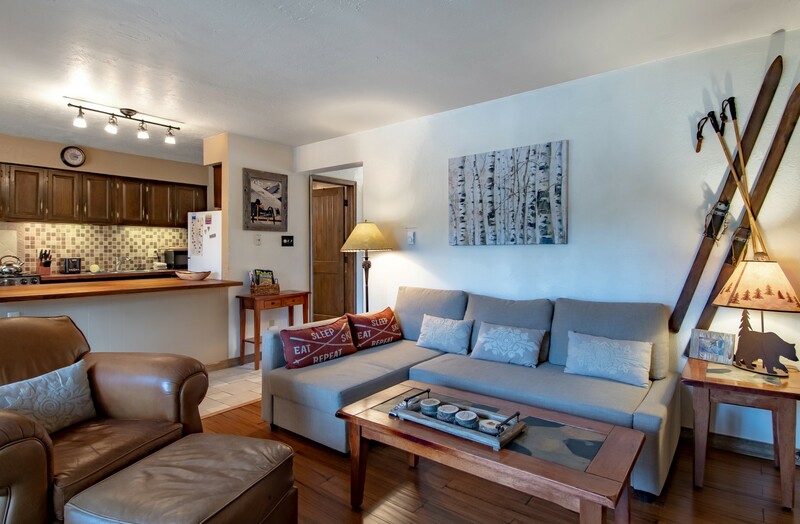 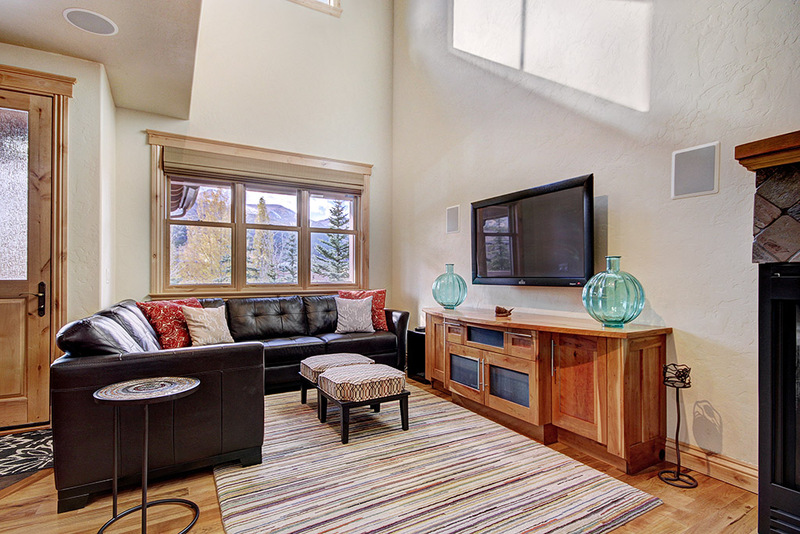 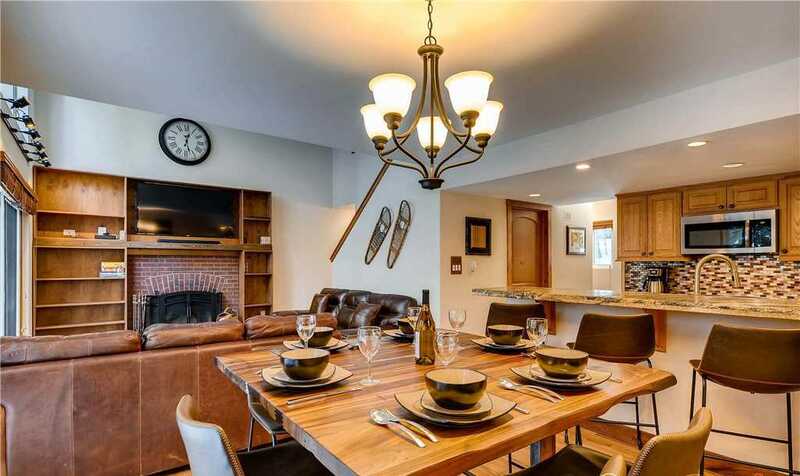 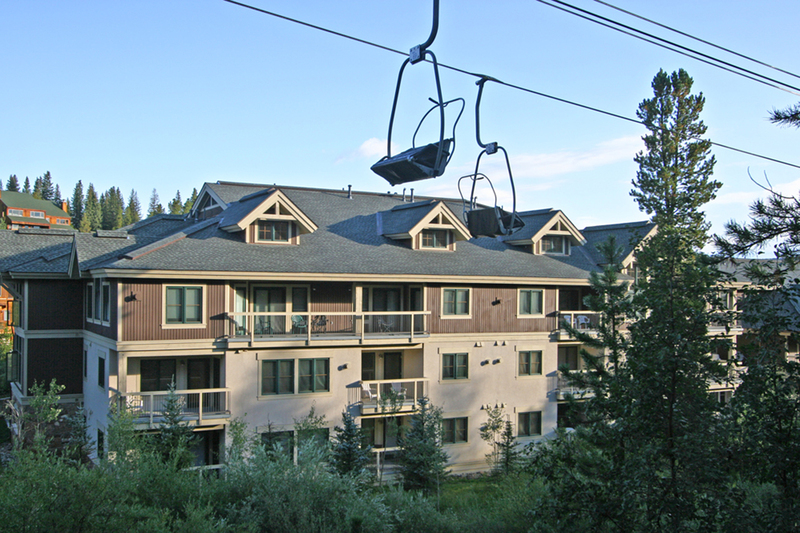 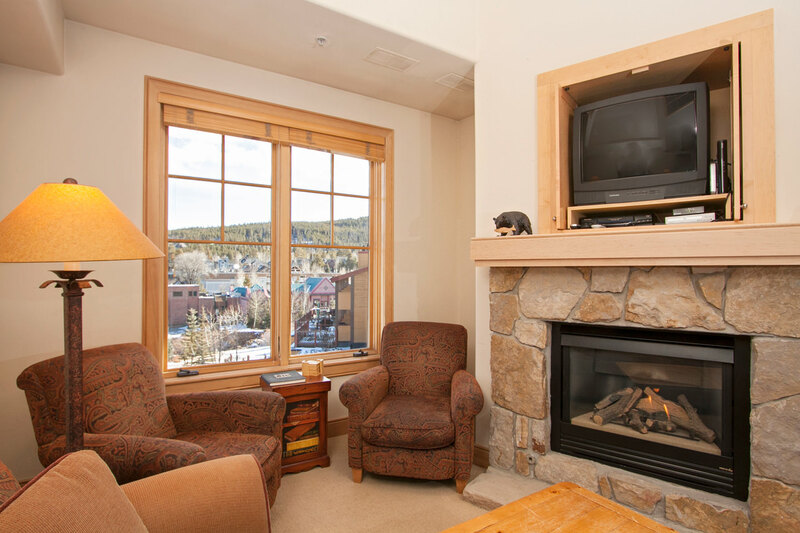 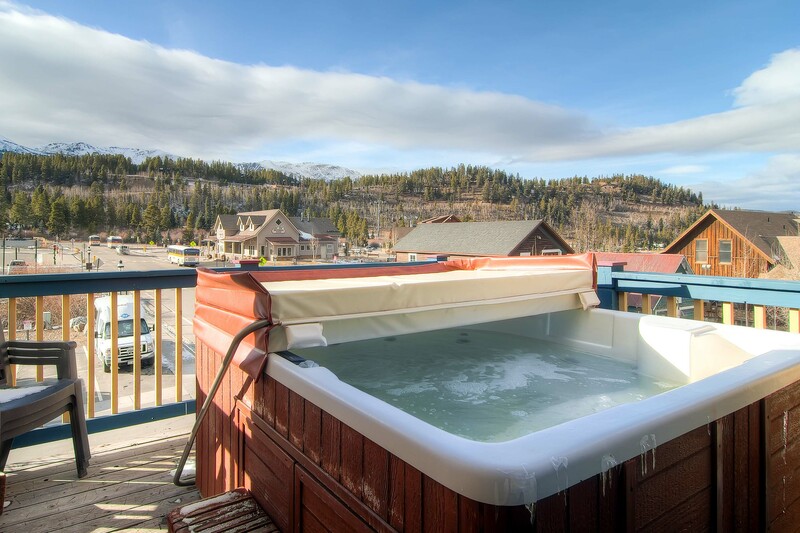 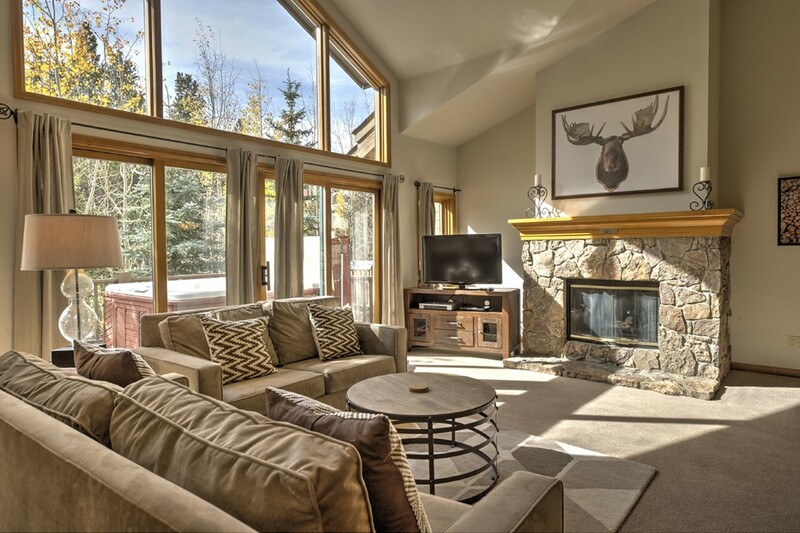 The Columbine complex is conveniently located in the lower Four Seasons neighborhood within walking distance to Main Street shops & restaurants and the Quicksilver chairlift, ski school, and ticket office at the base of Peak 9. 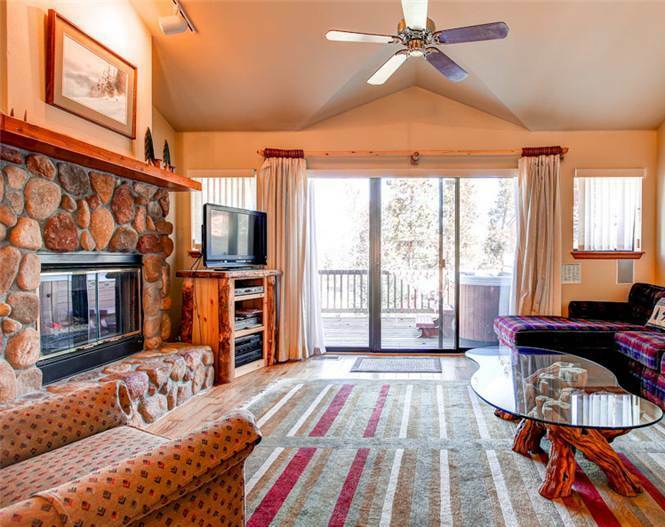 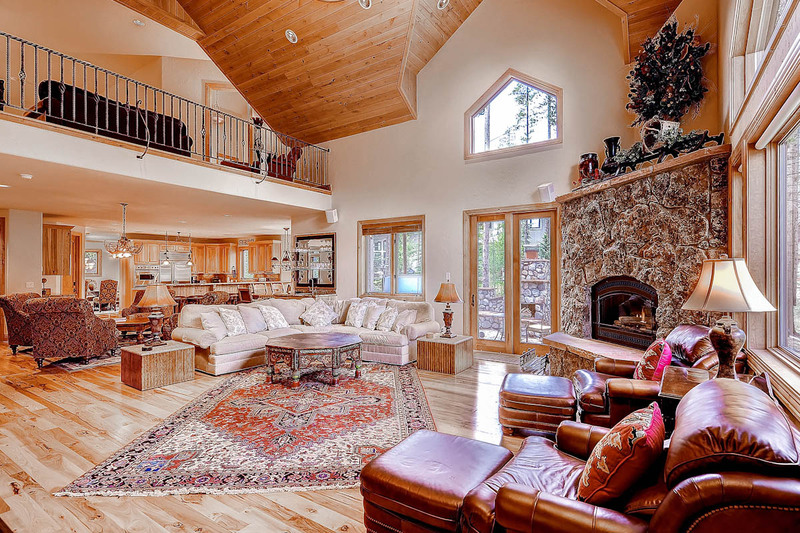 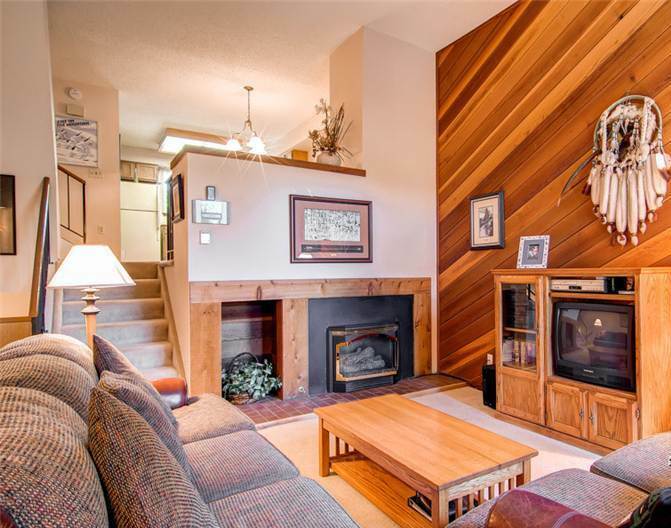 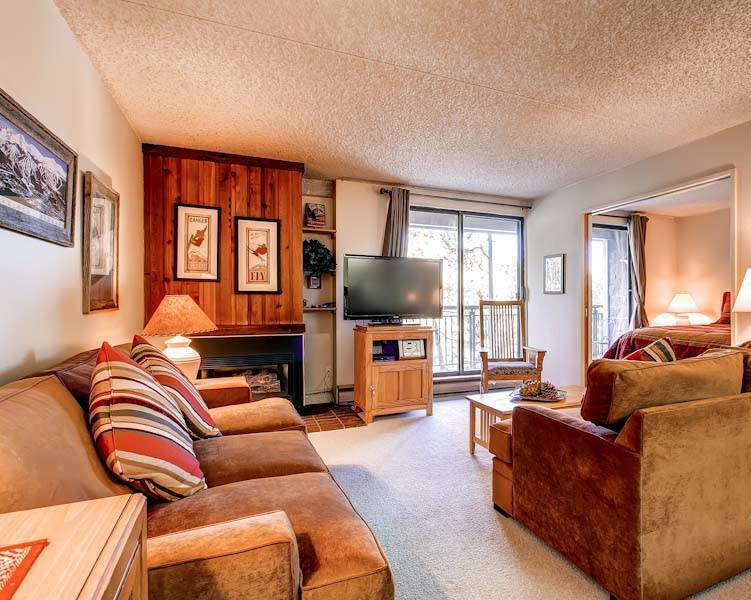 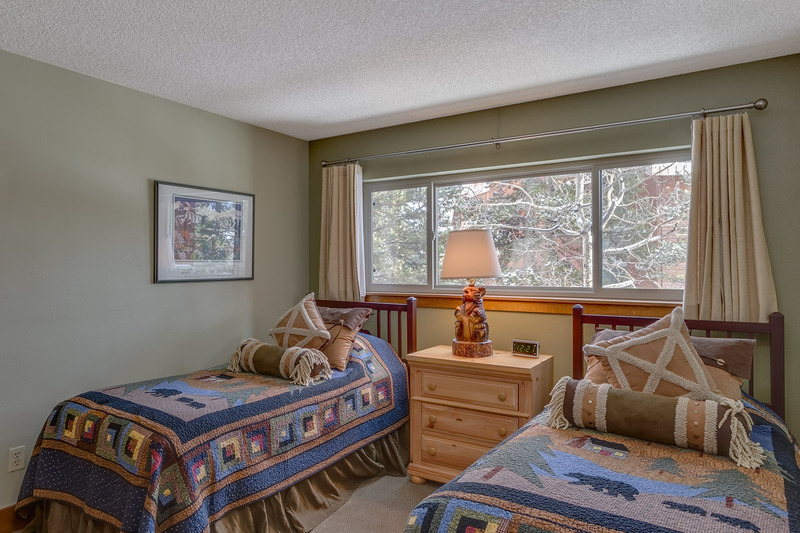 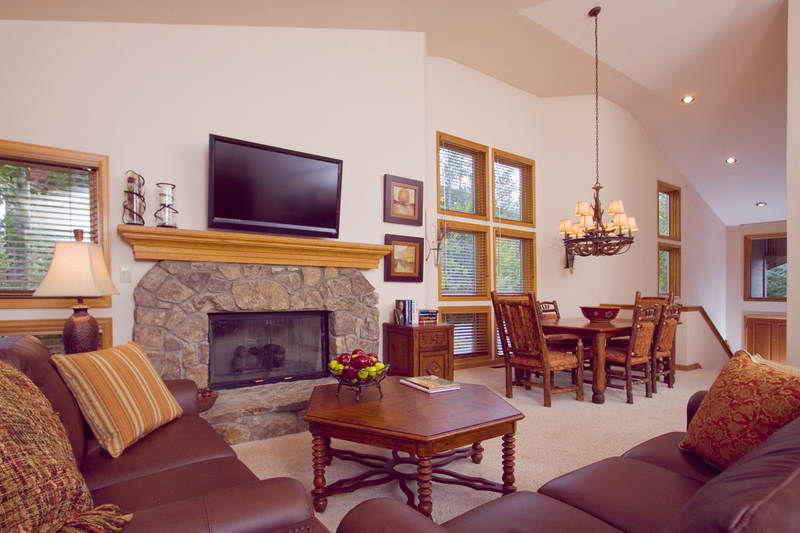 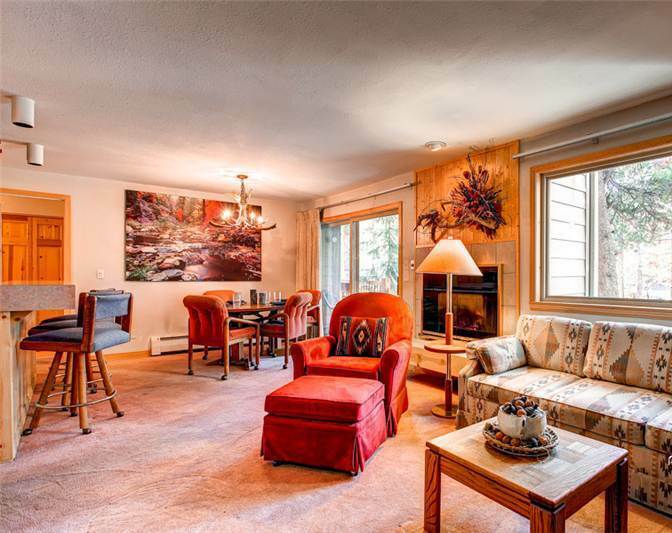 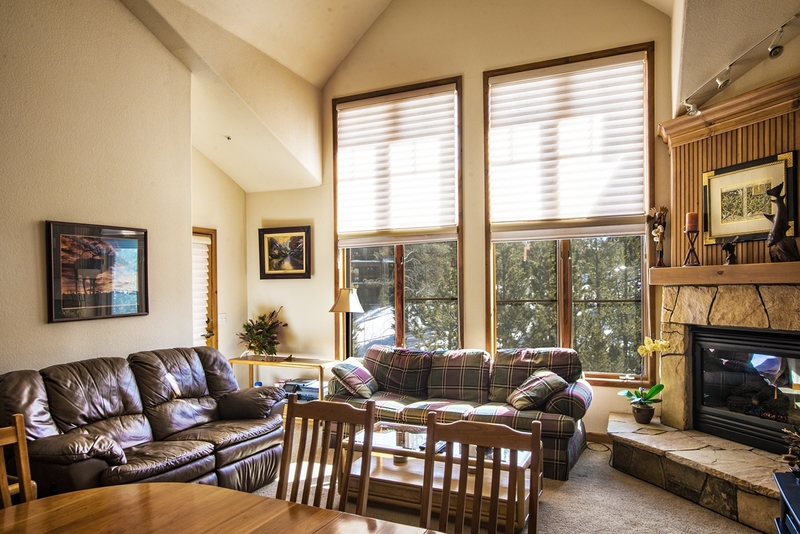 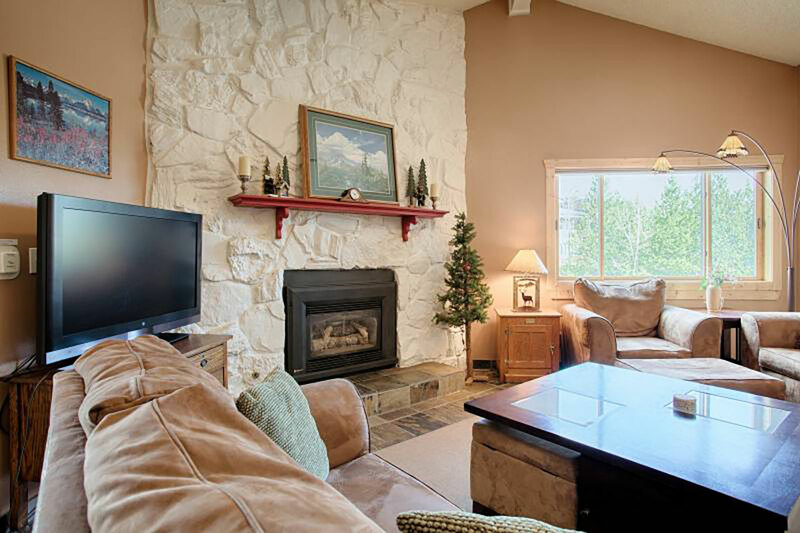 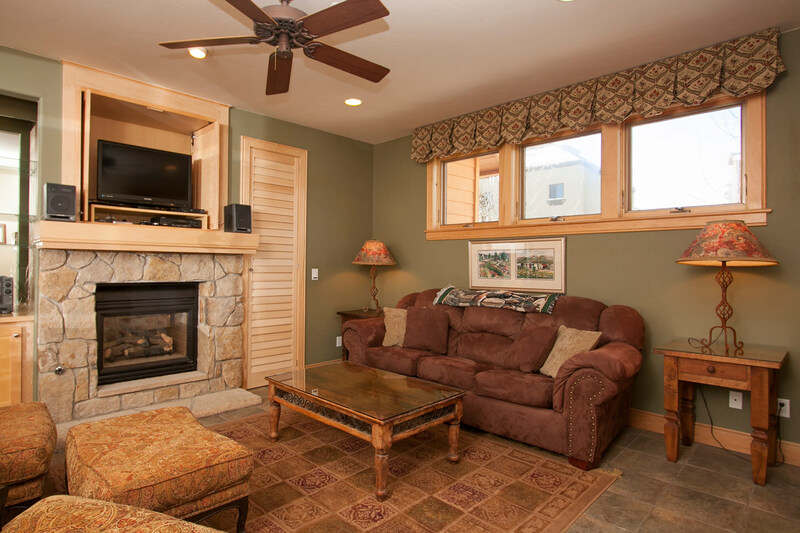 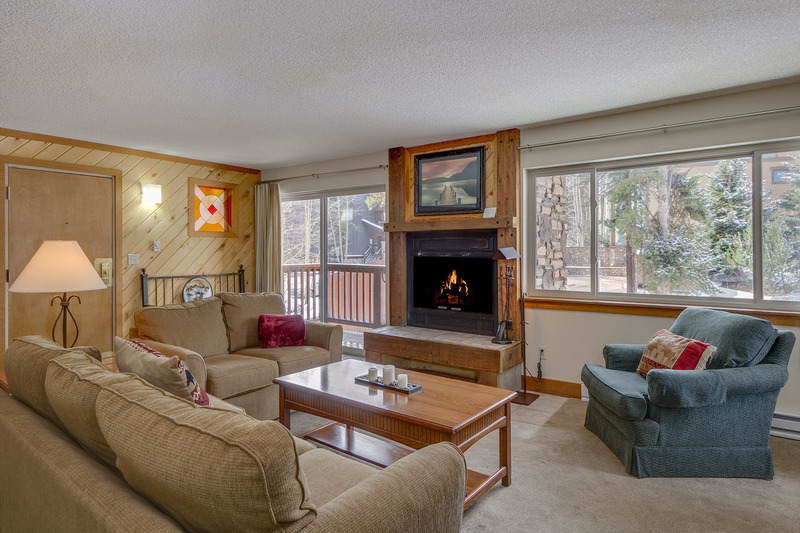 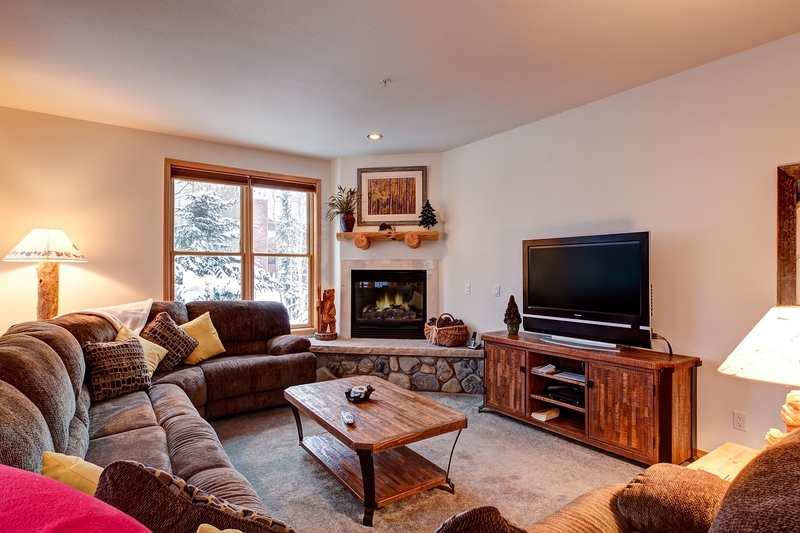 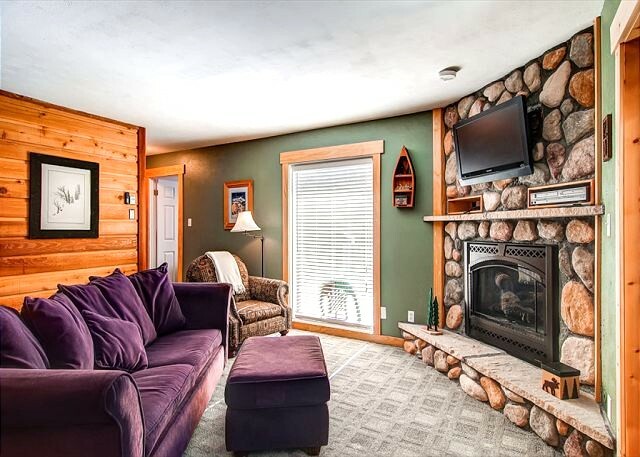 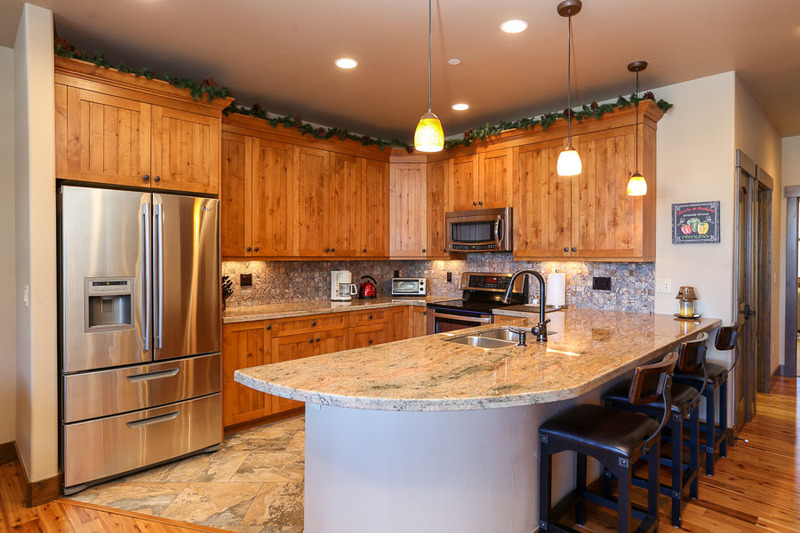 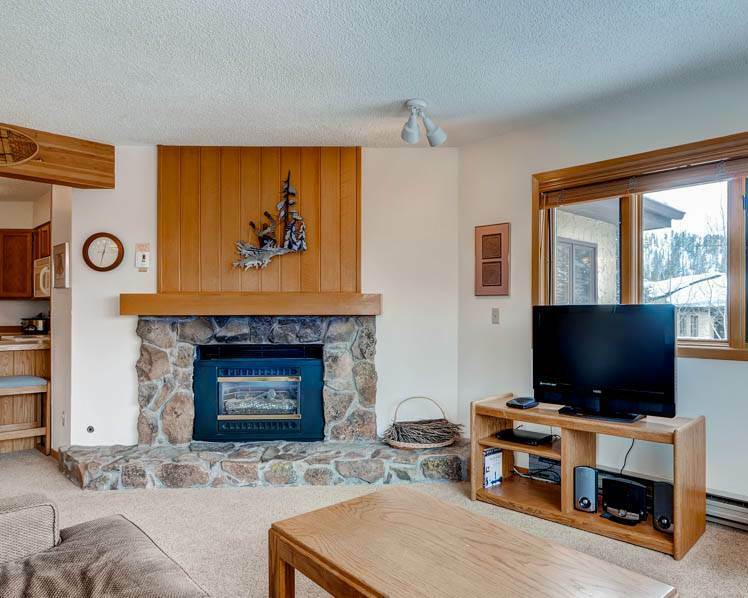 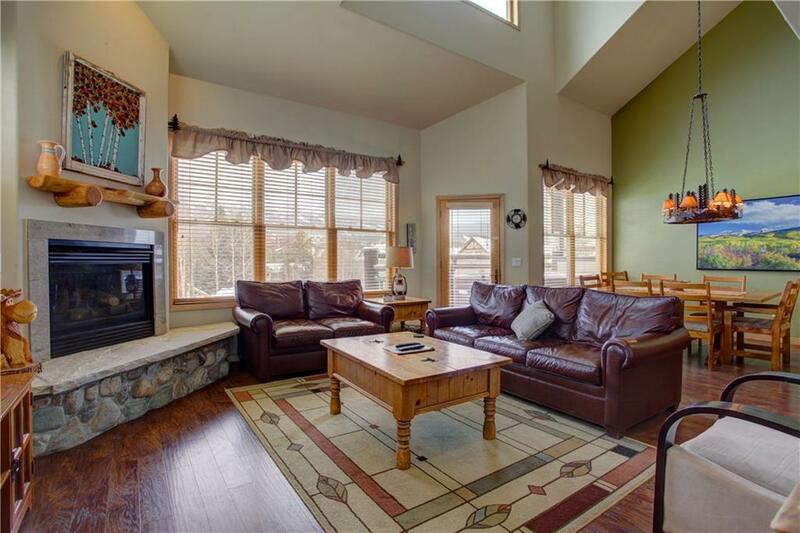 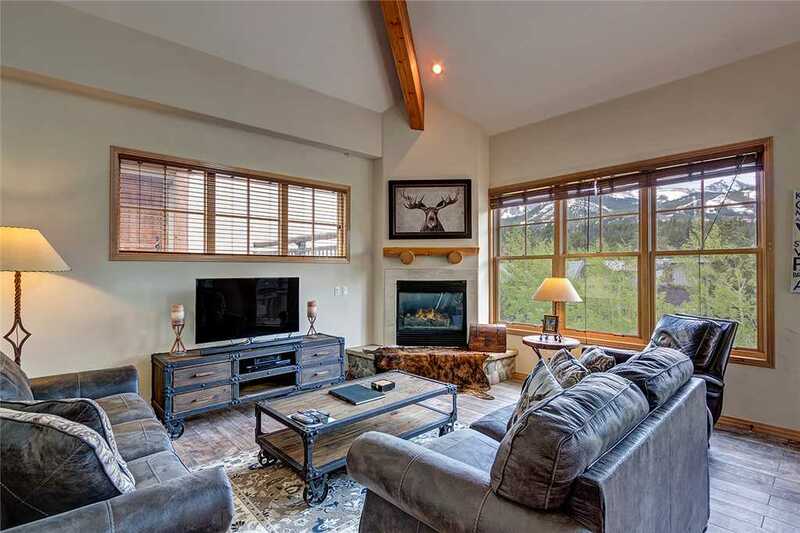 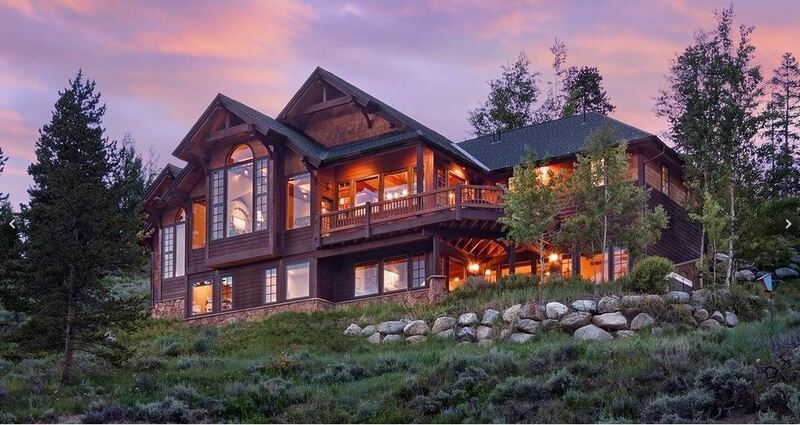 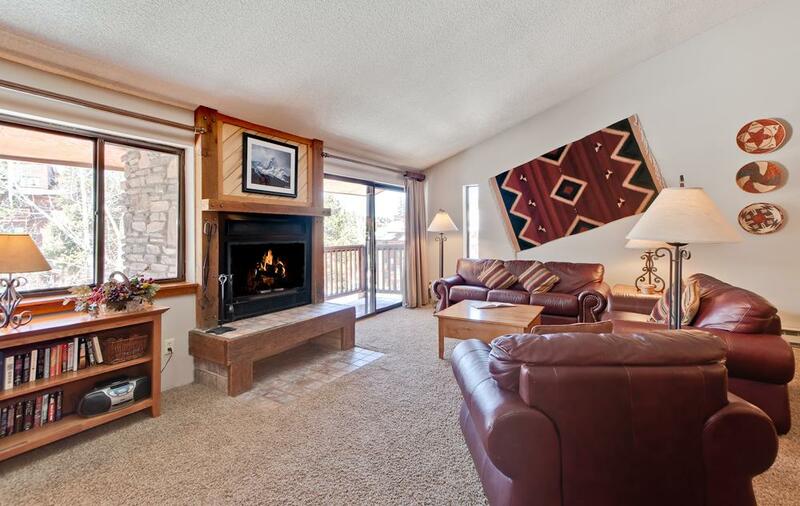 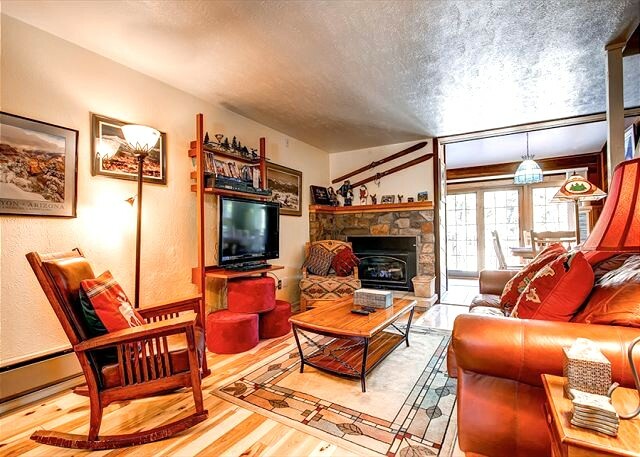 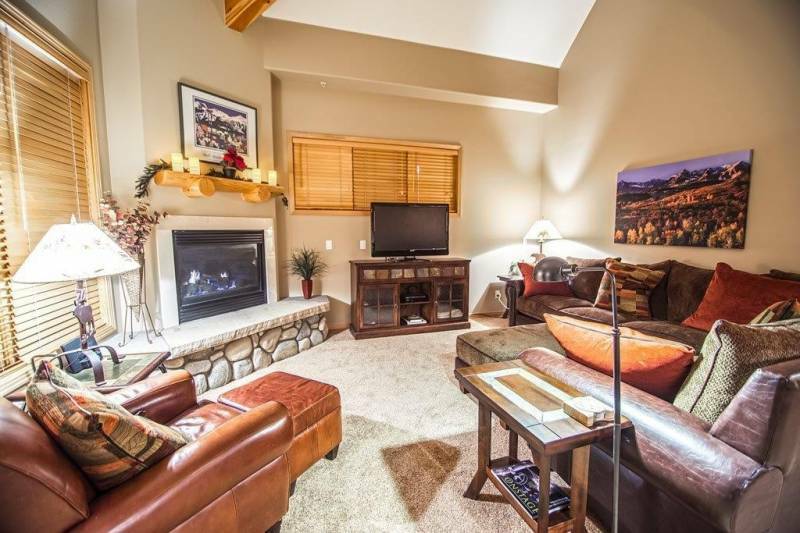 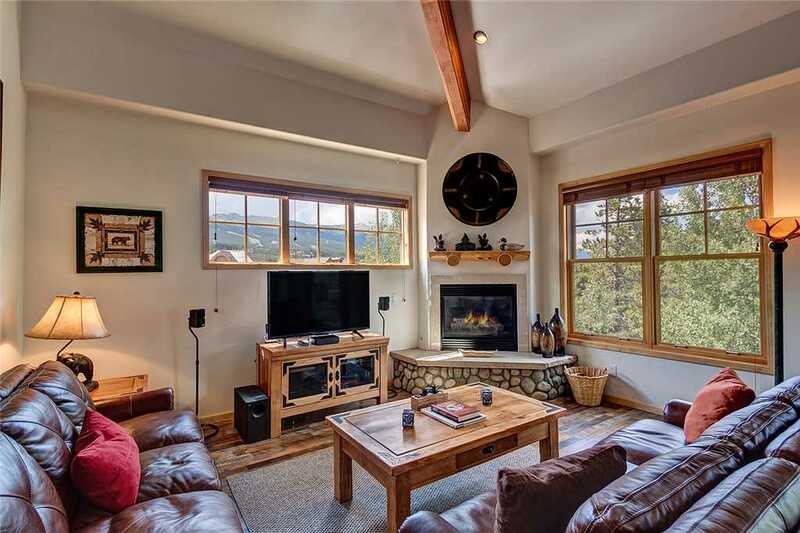 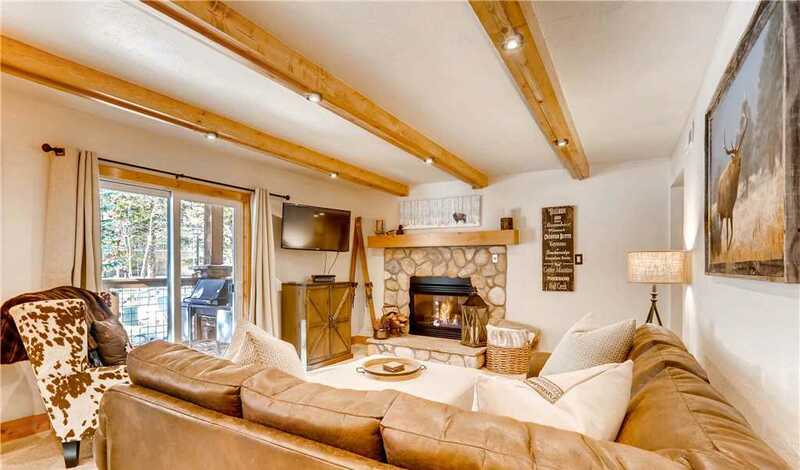 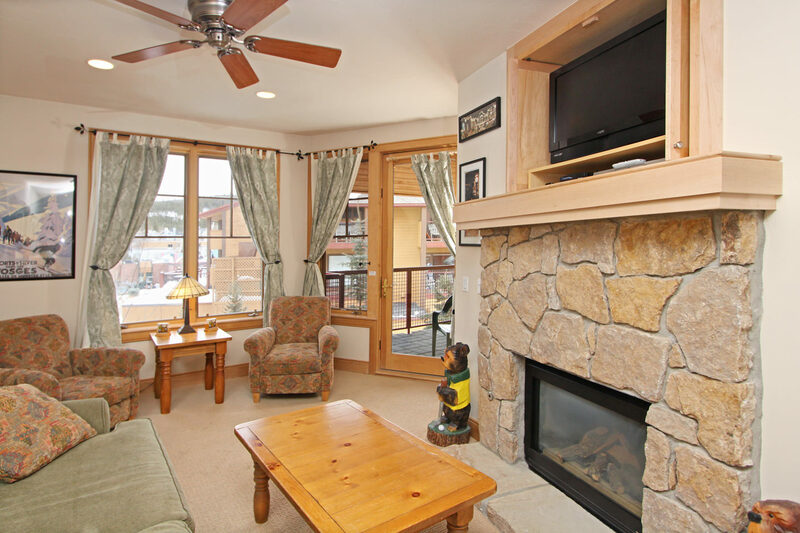 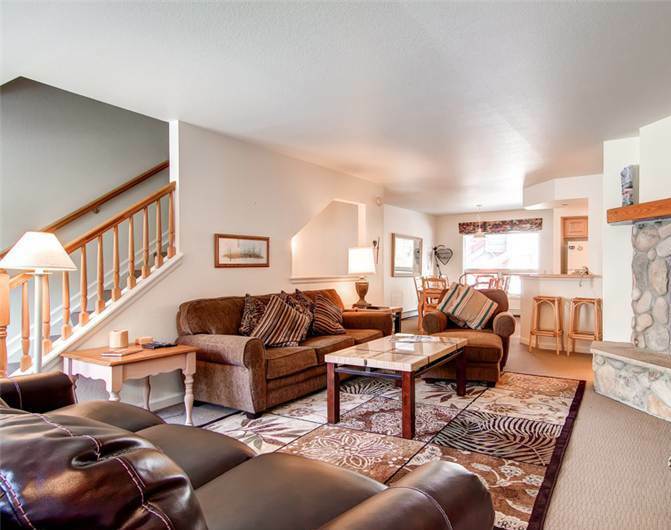 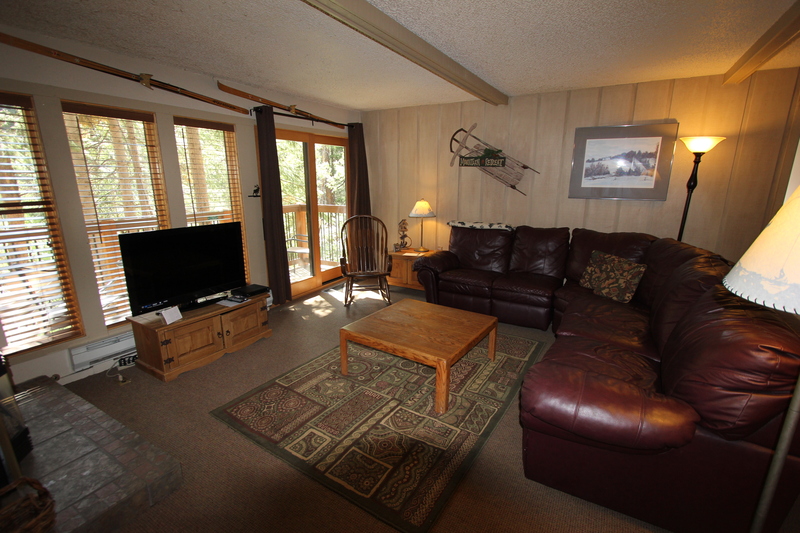 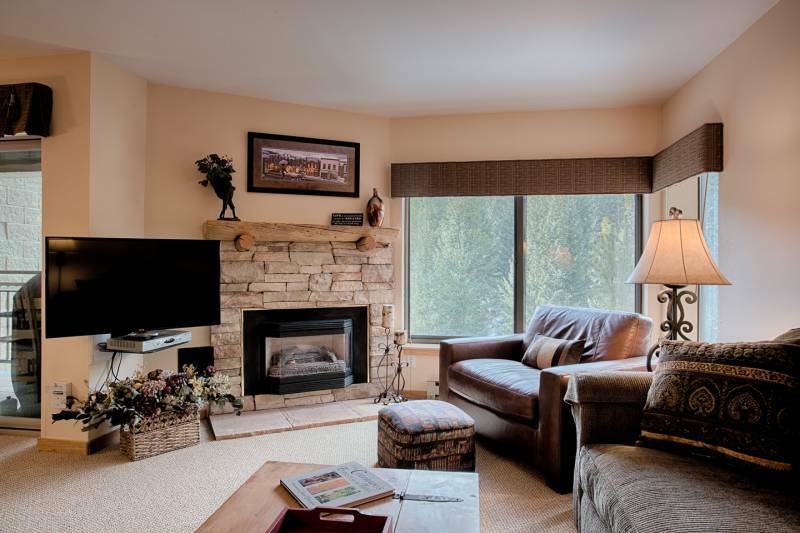 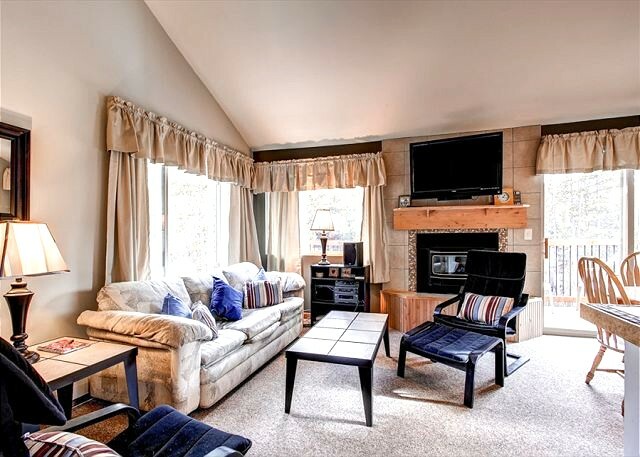 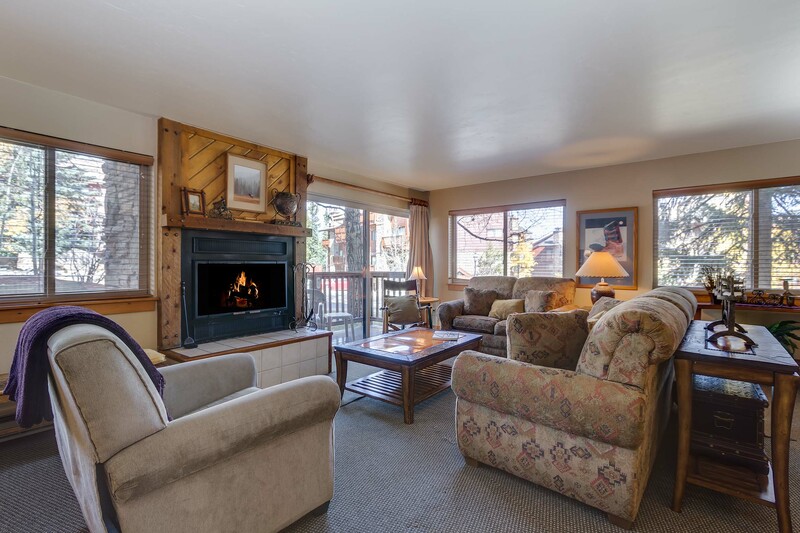 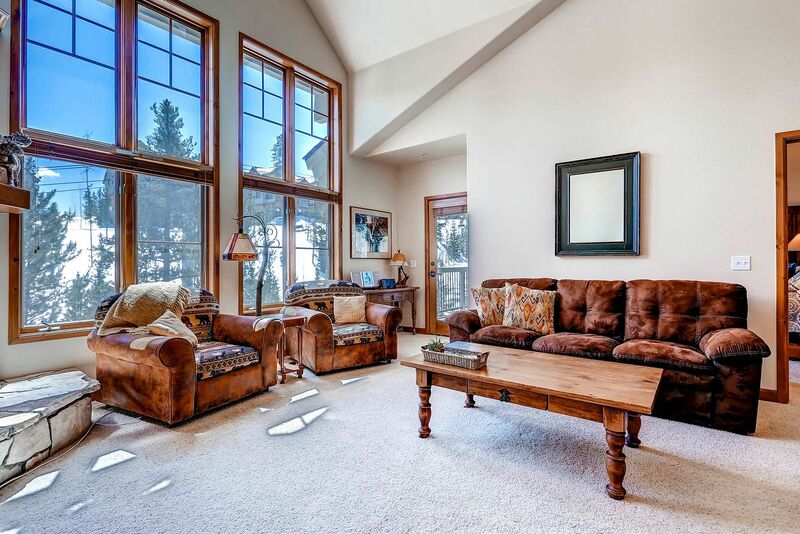 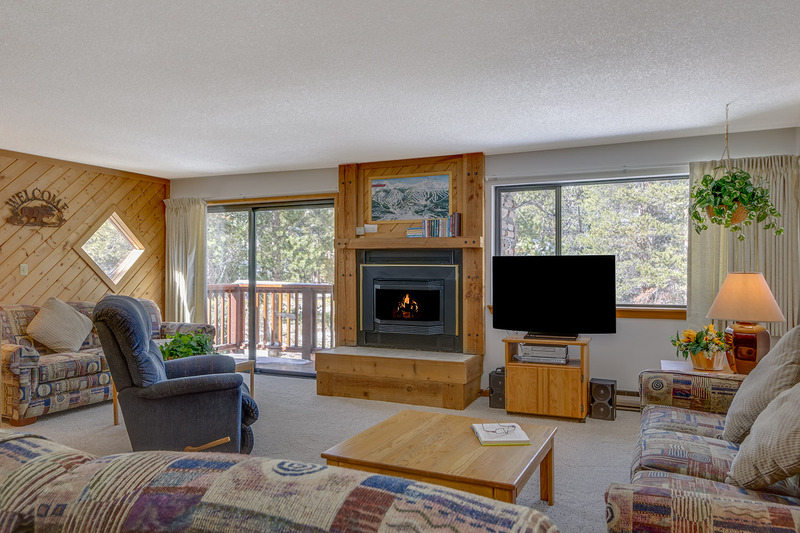 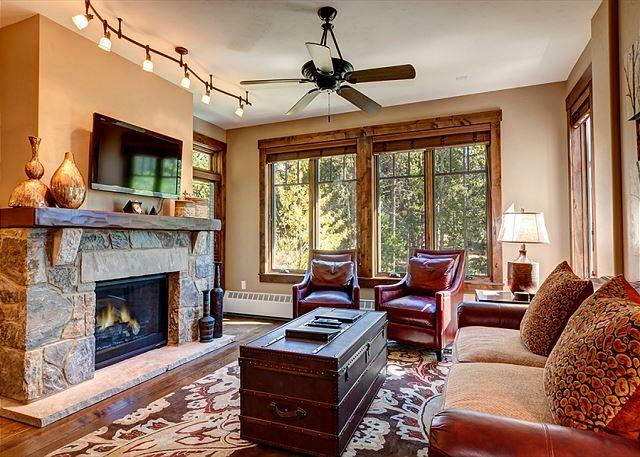 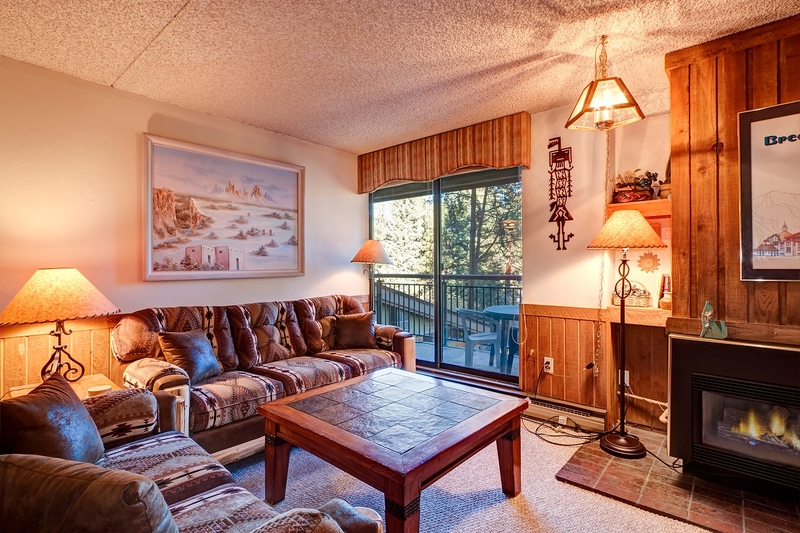 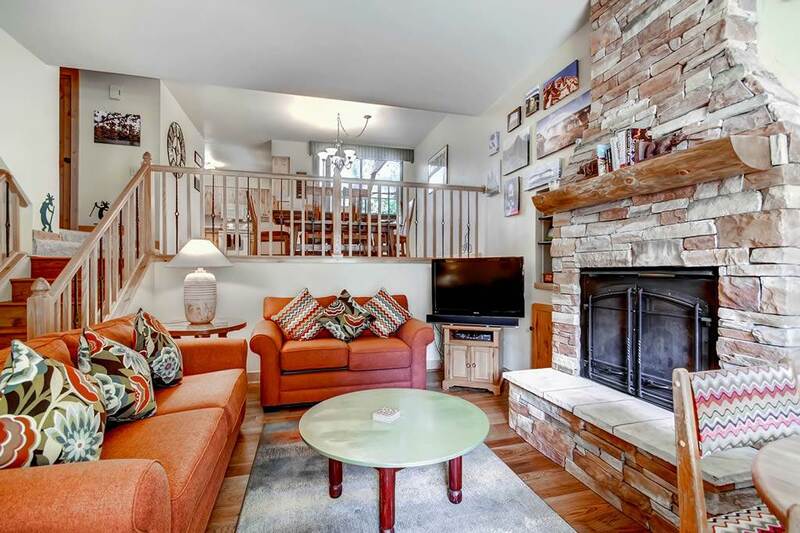 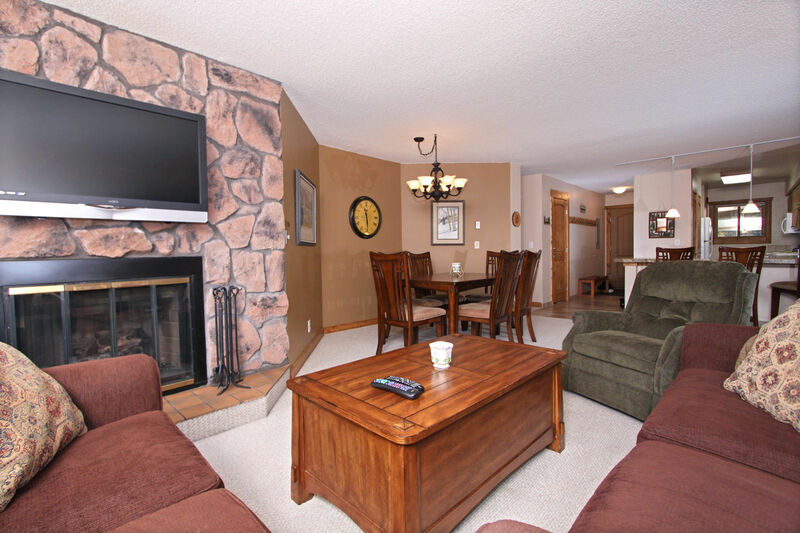 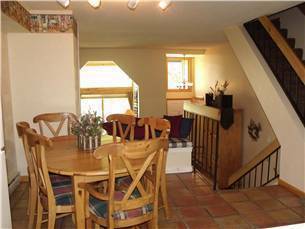 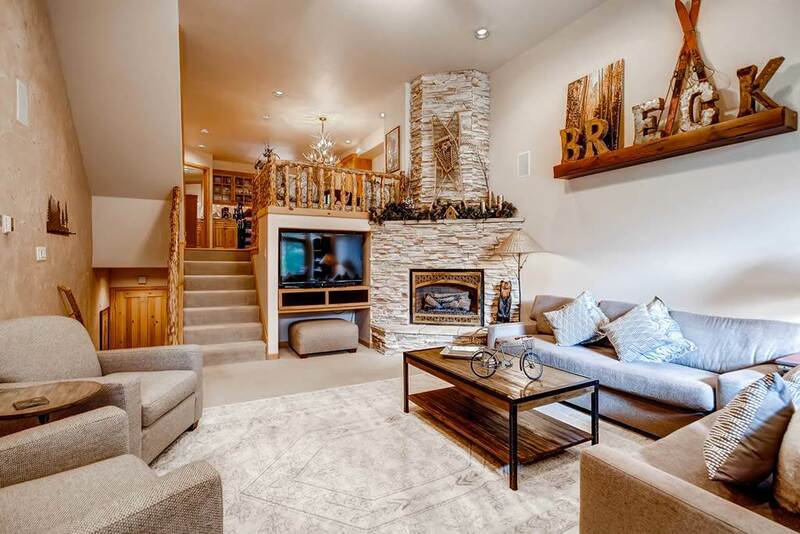 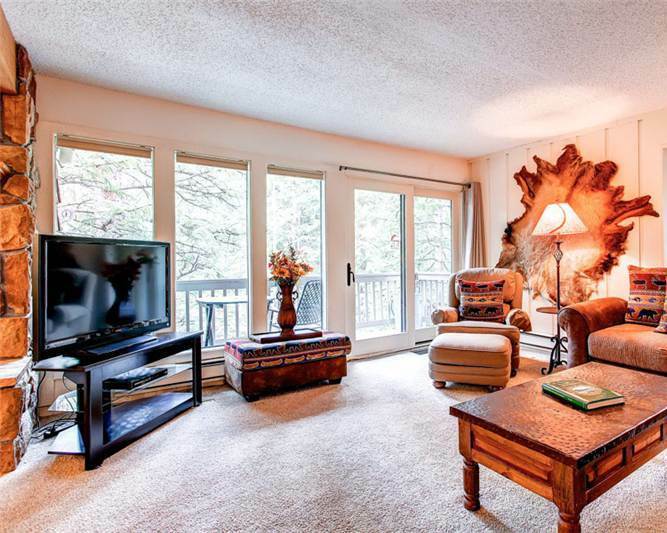 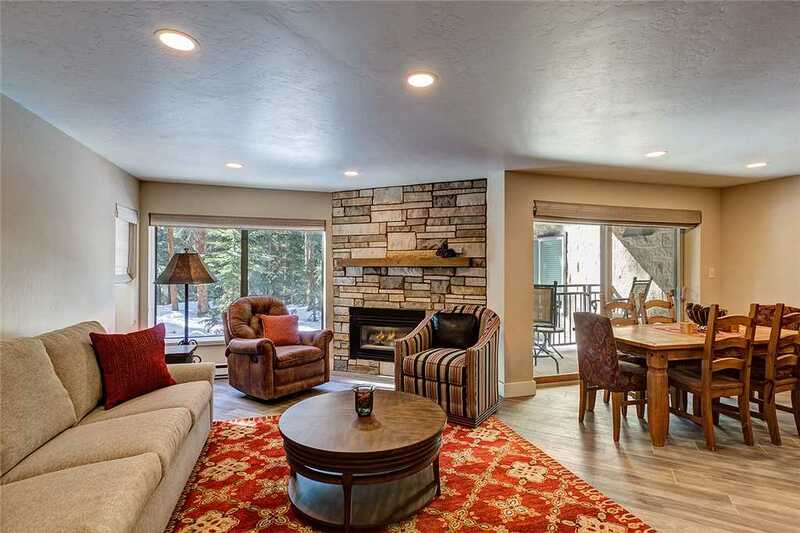 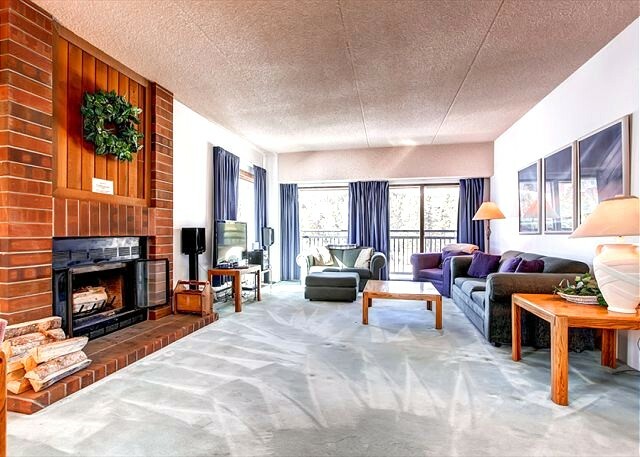 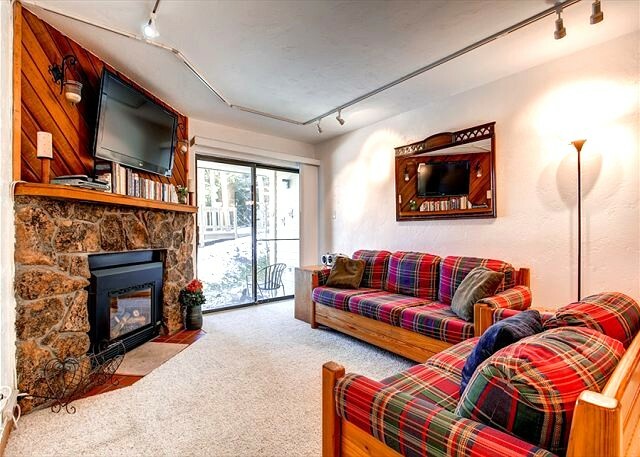 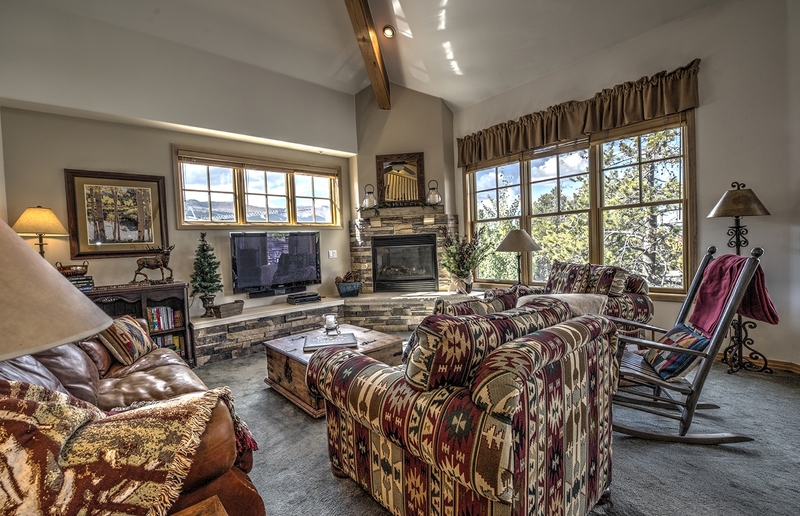 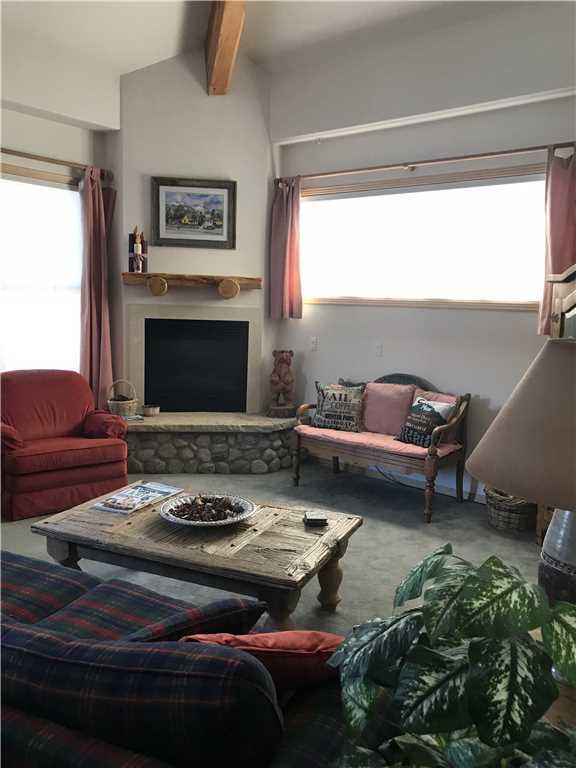 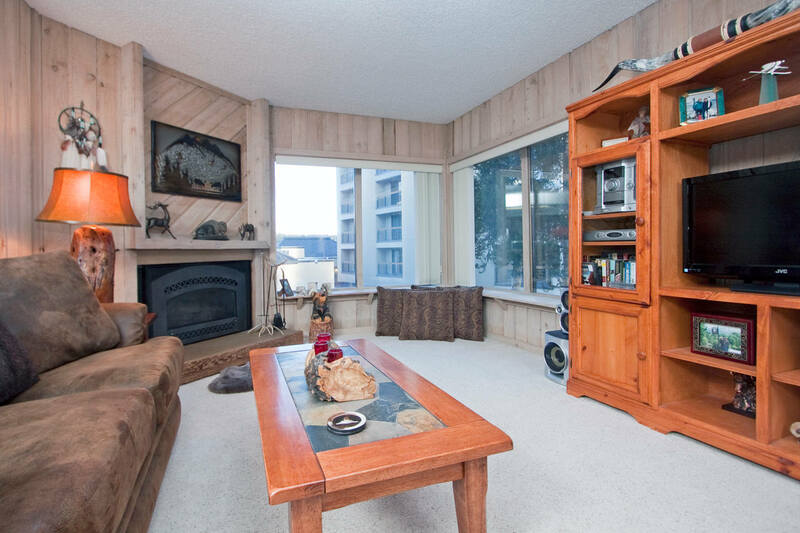 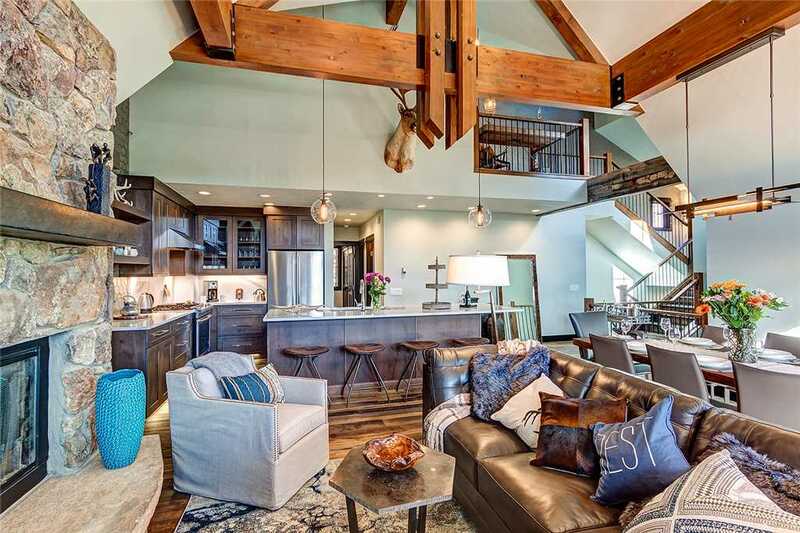 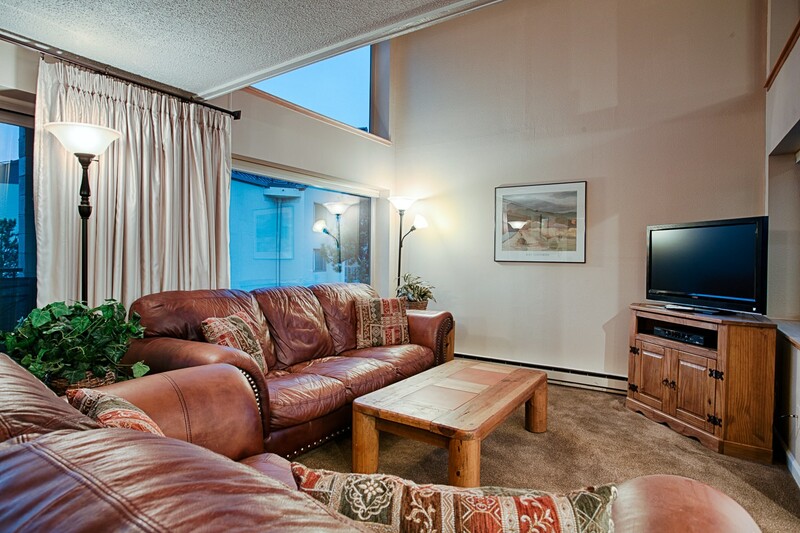 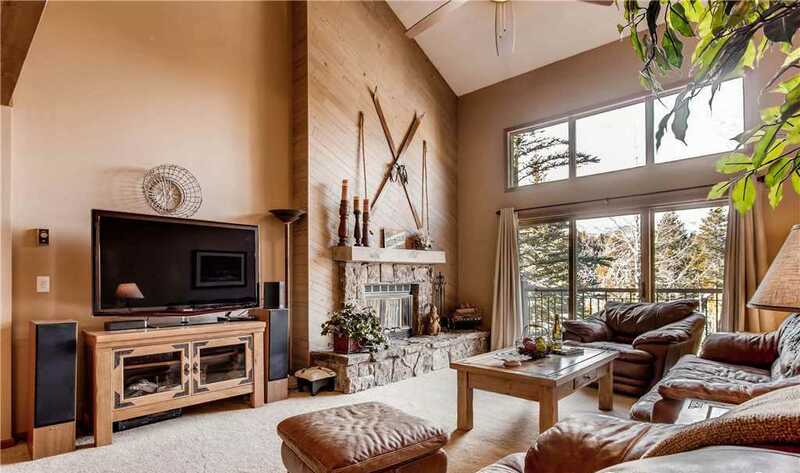 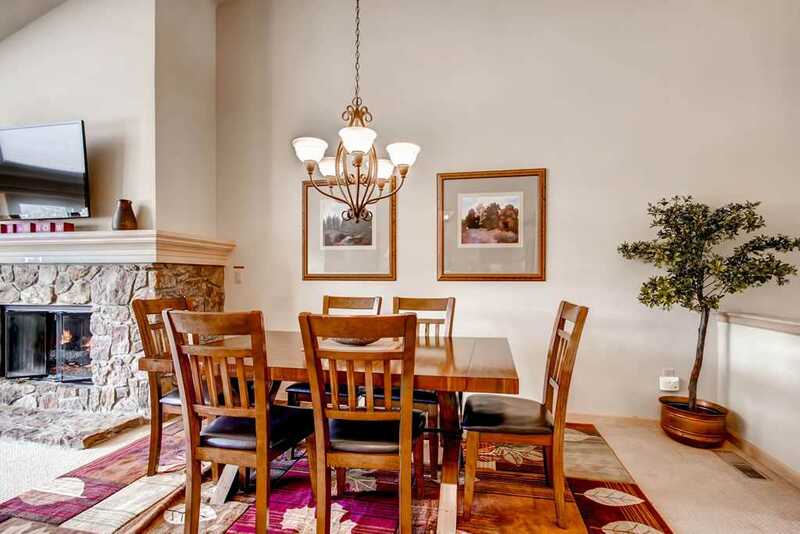 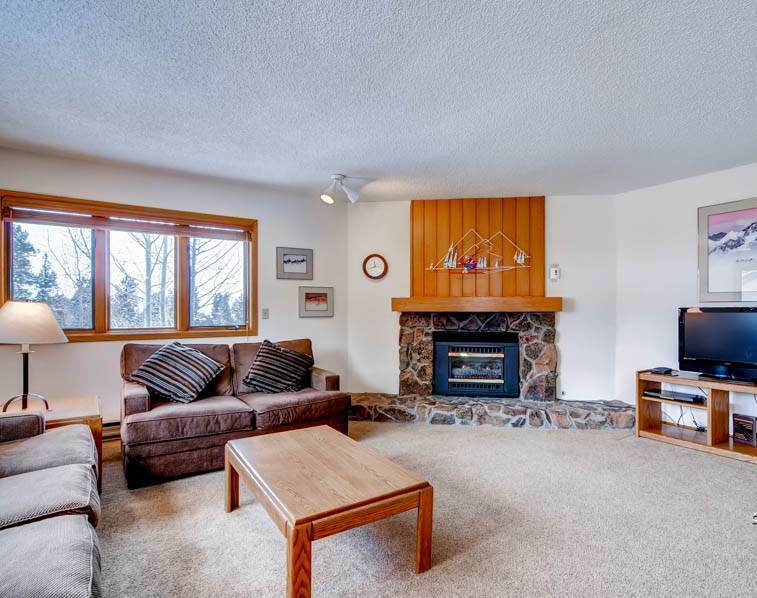 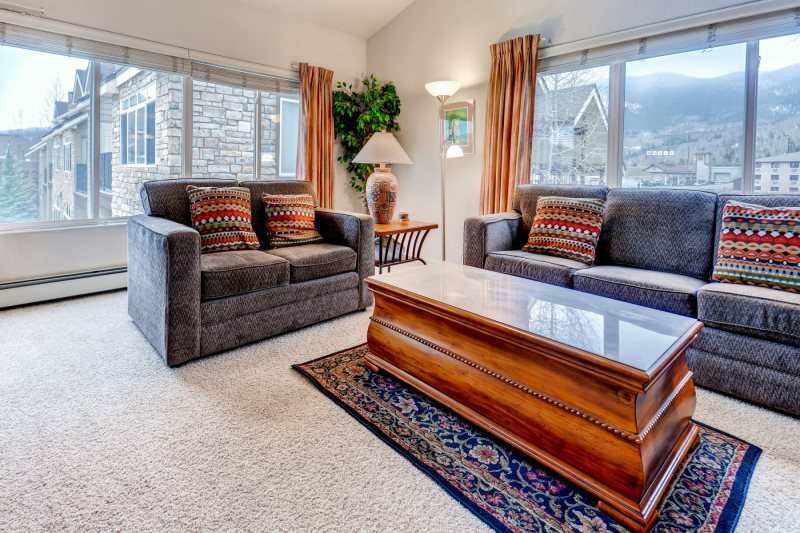 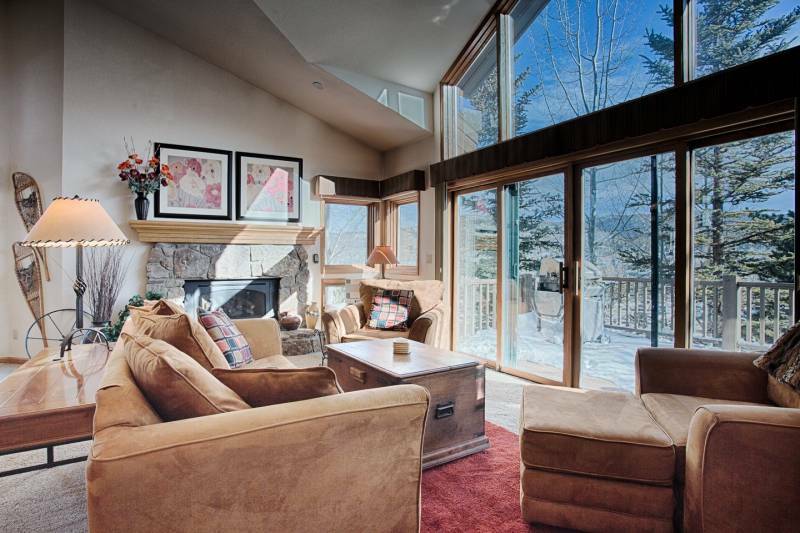 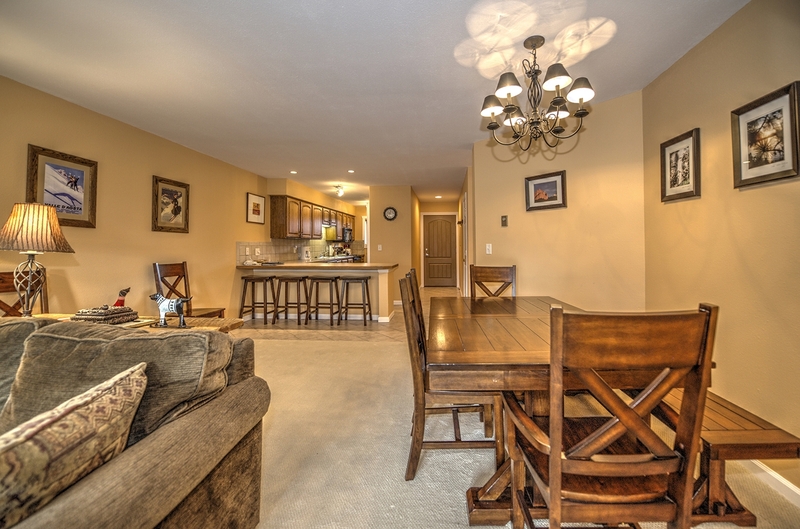 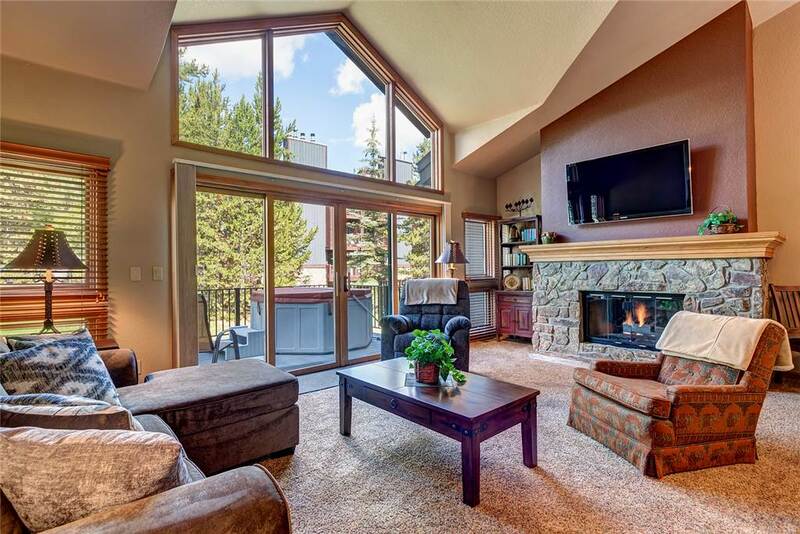 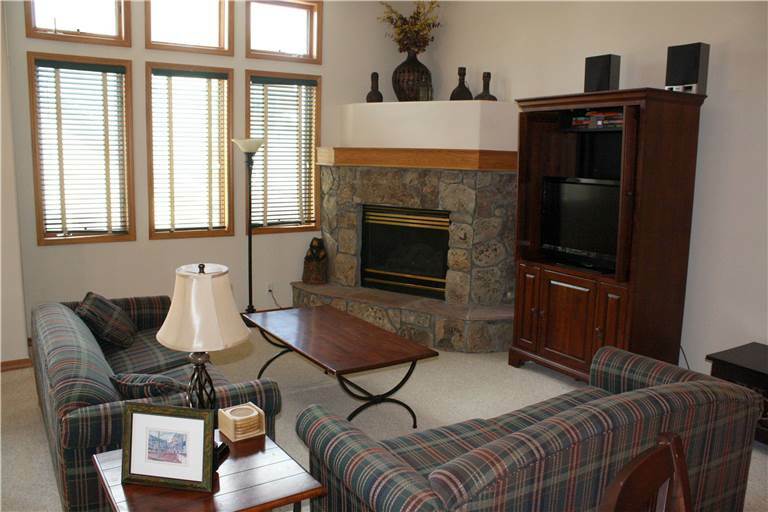 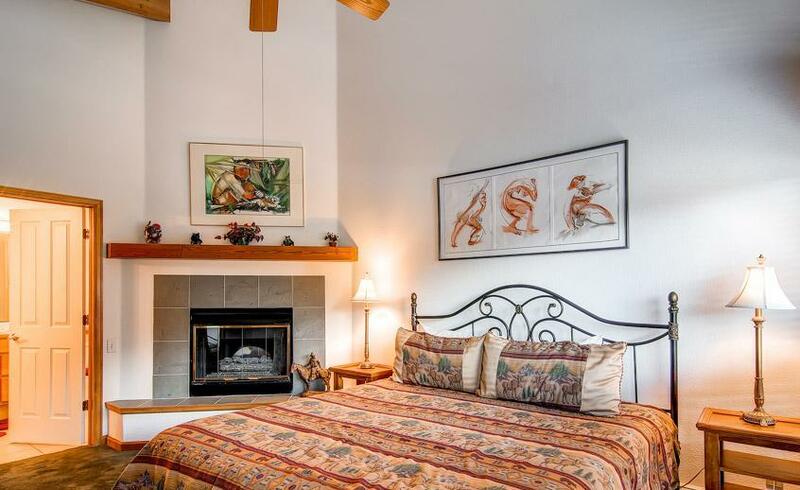 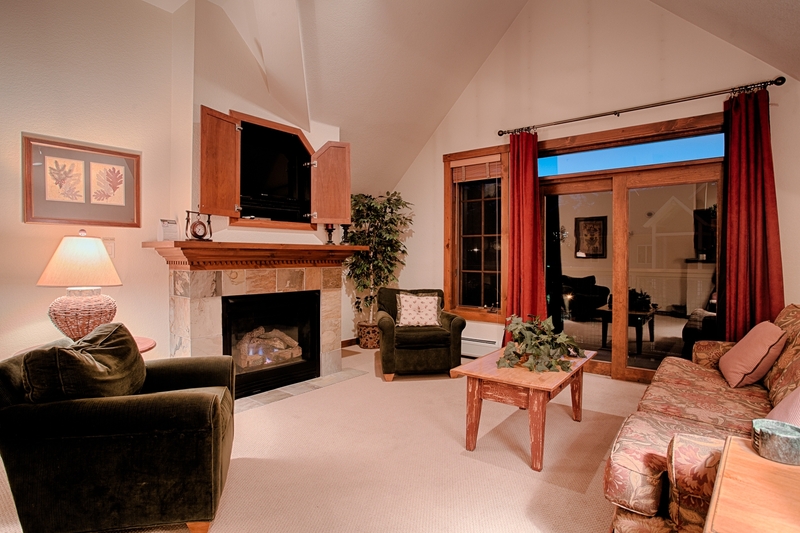 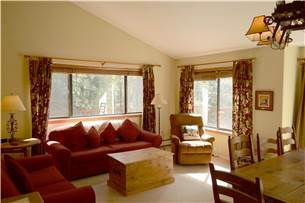 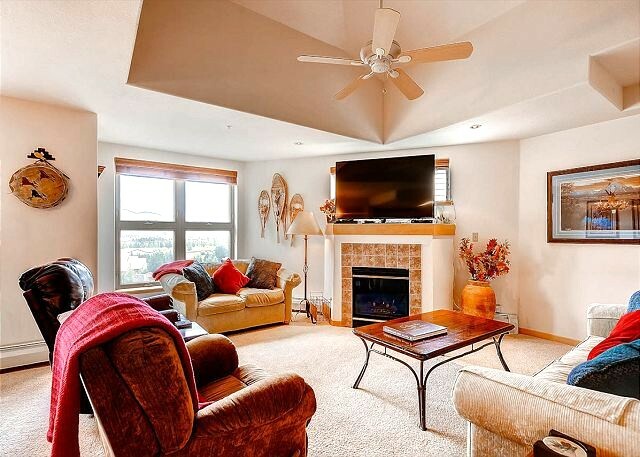 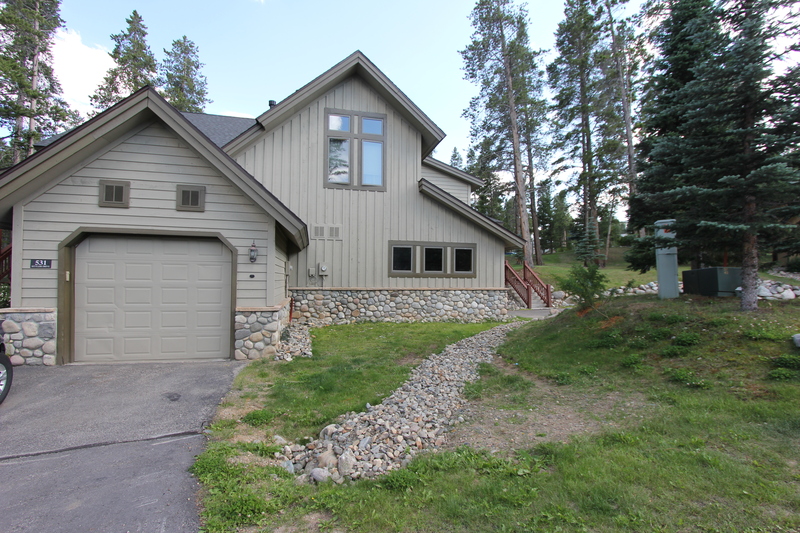 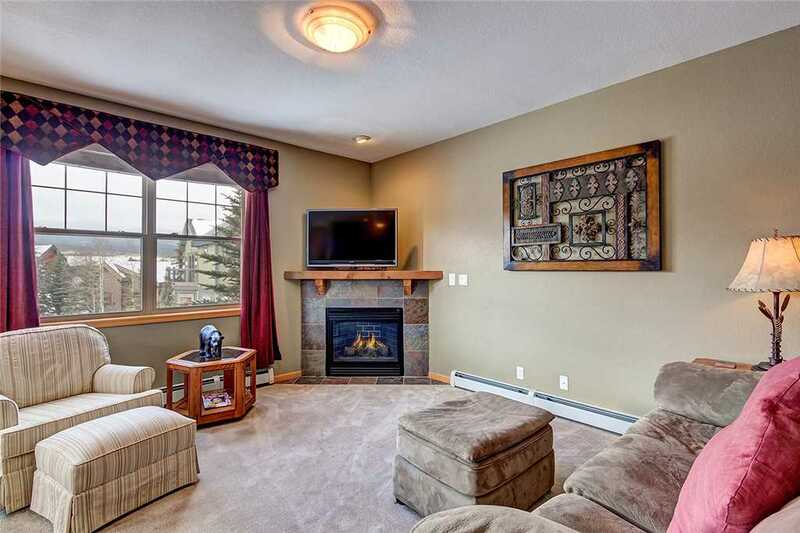 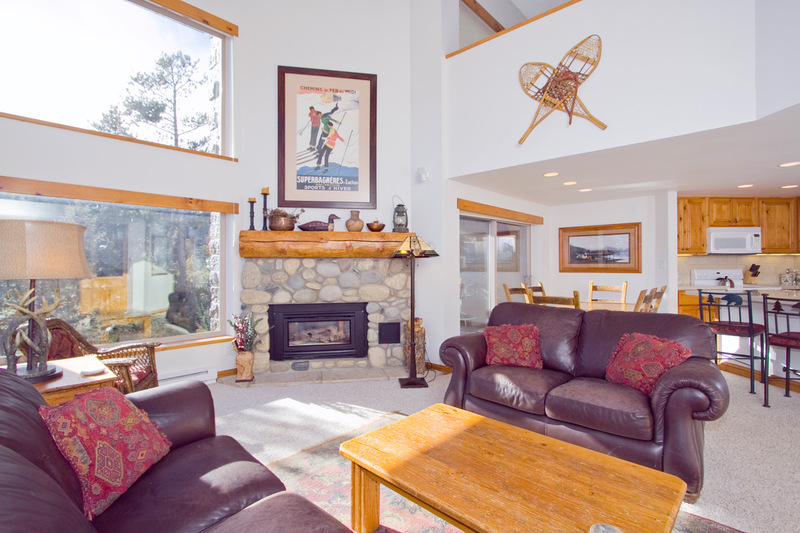 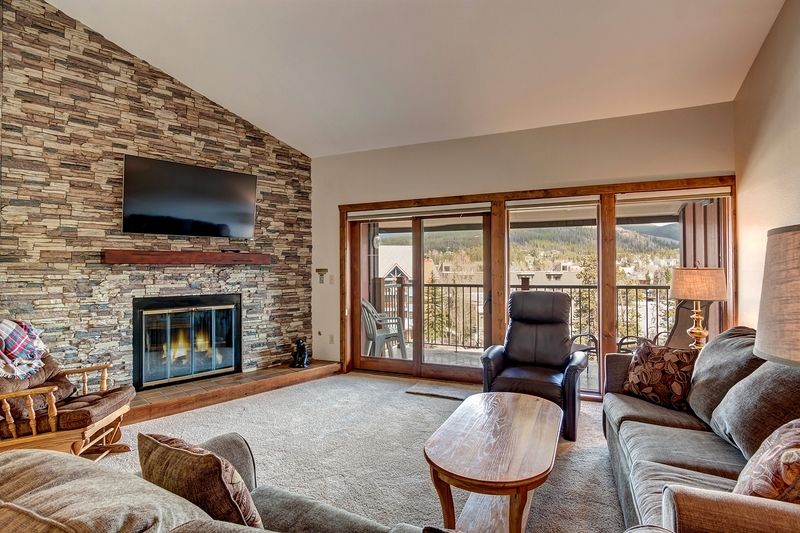 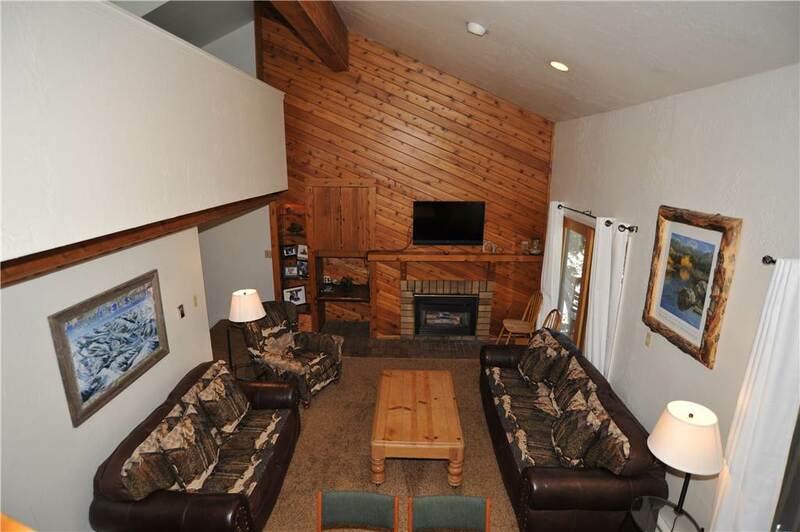 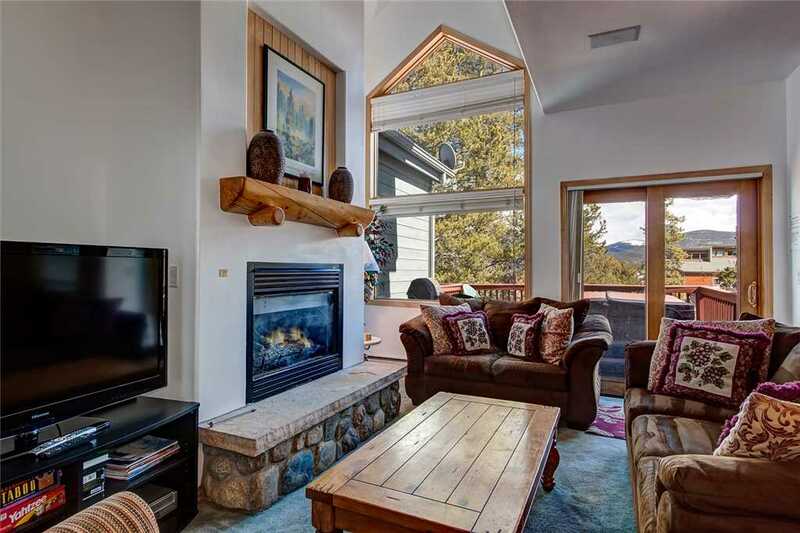 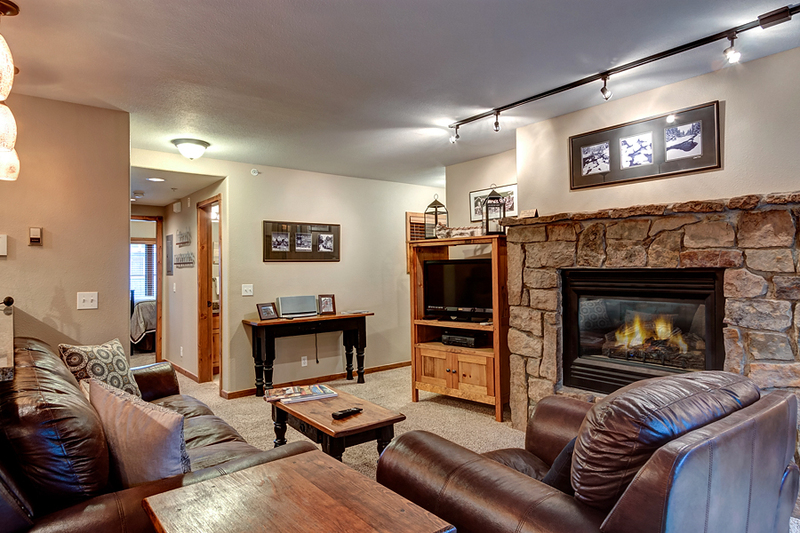 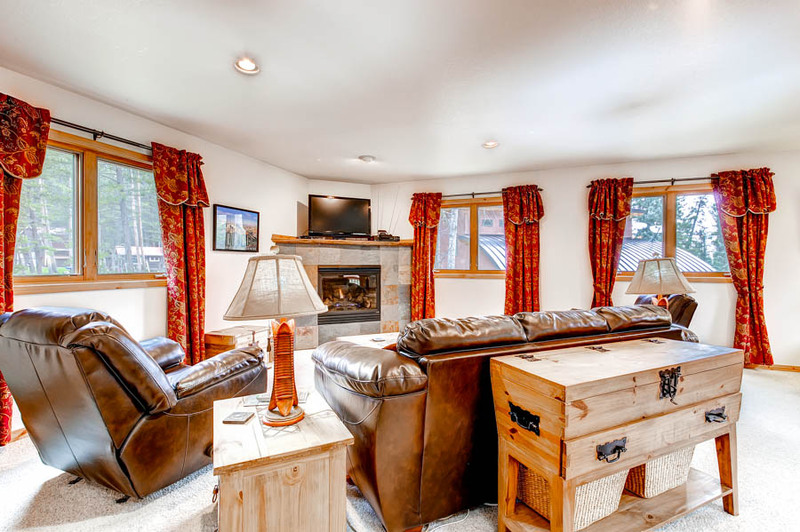 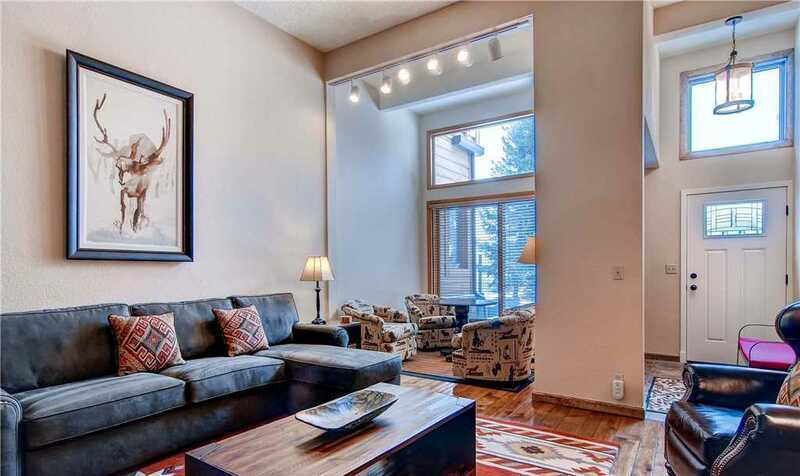 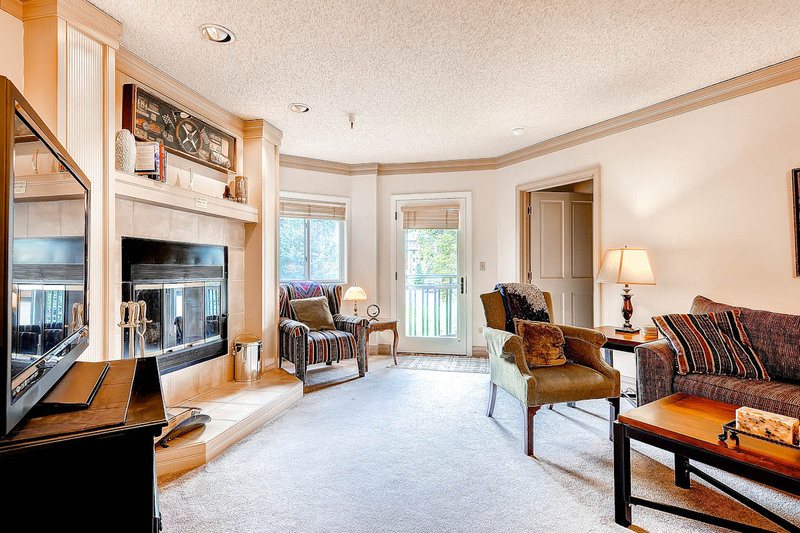 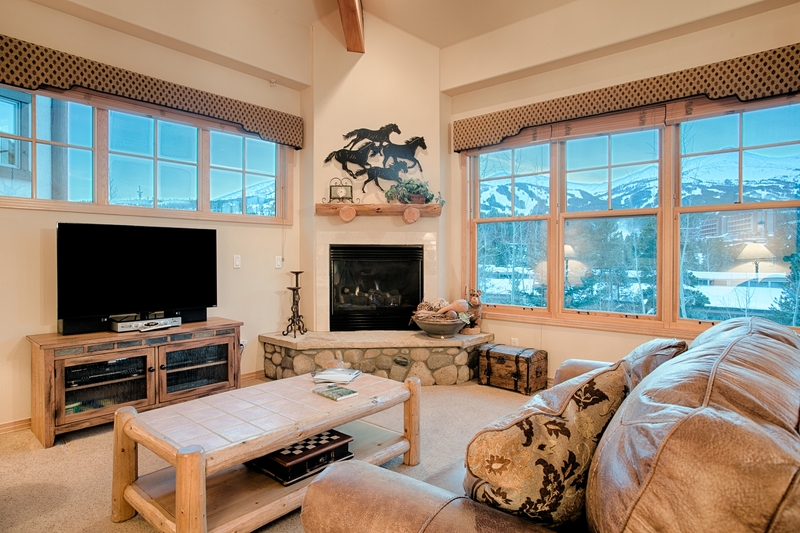 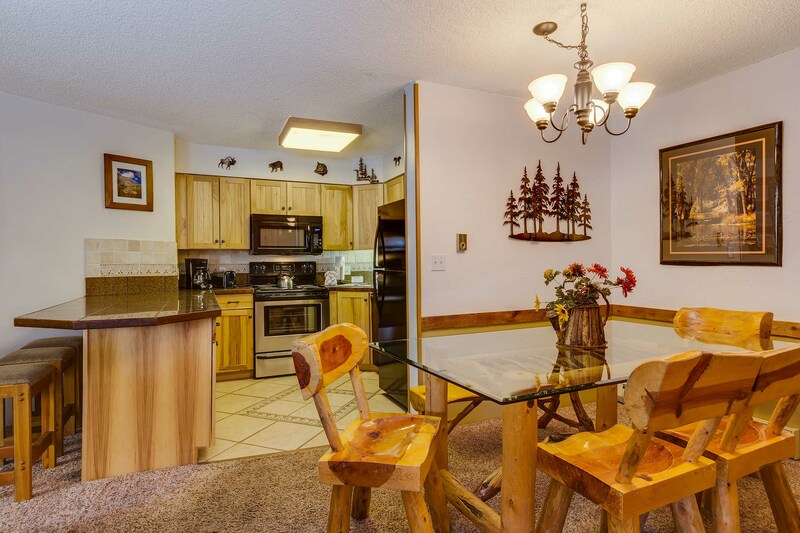 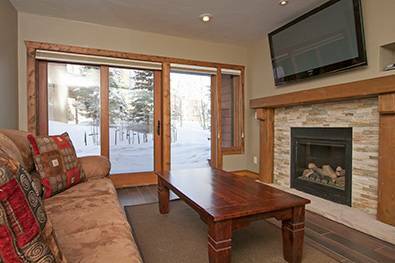 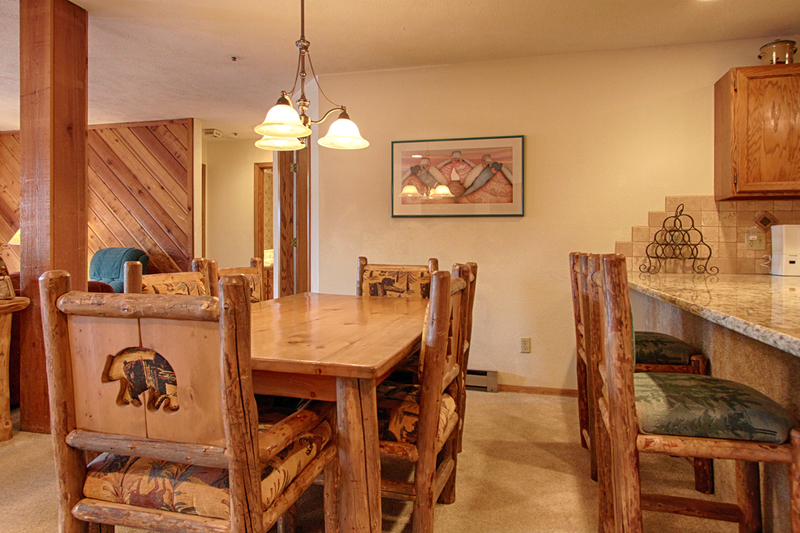 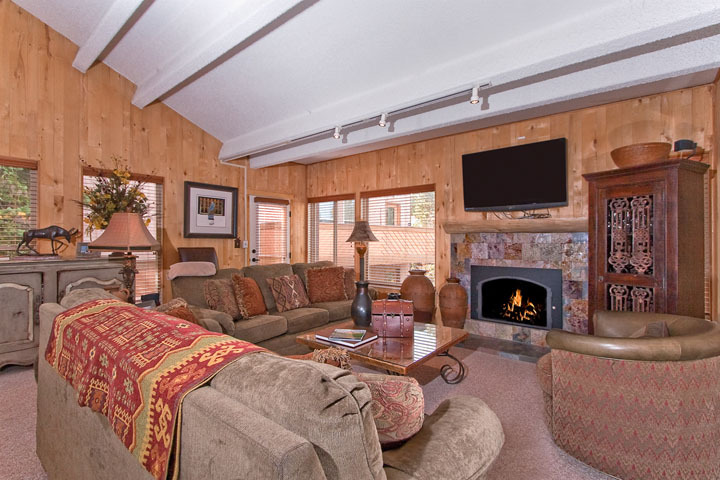 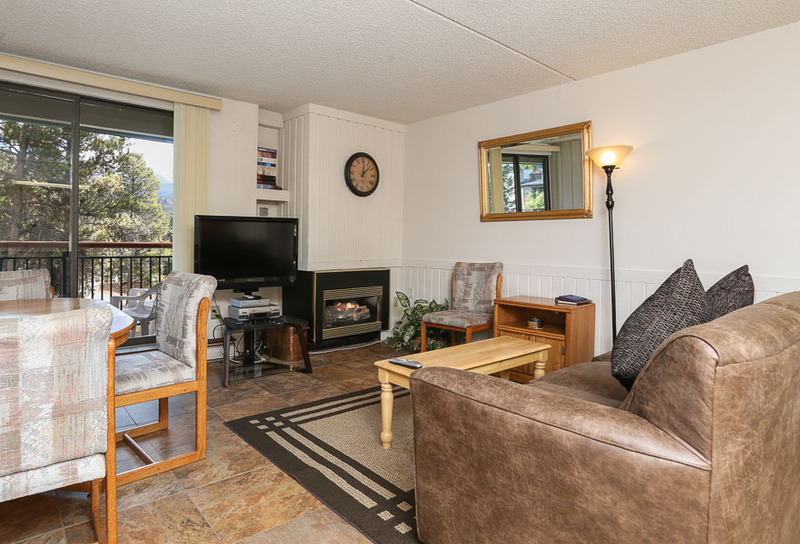 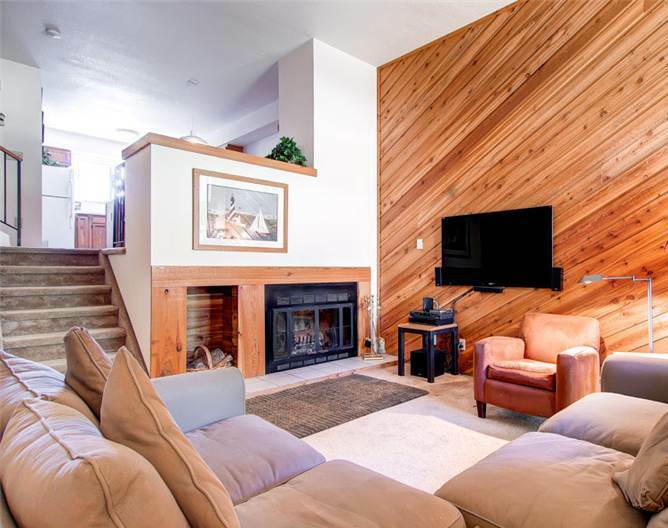 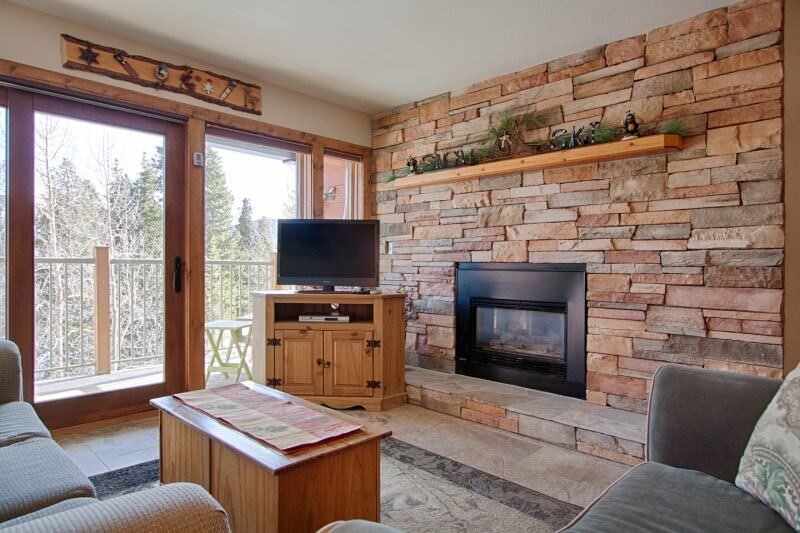 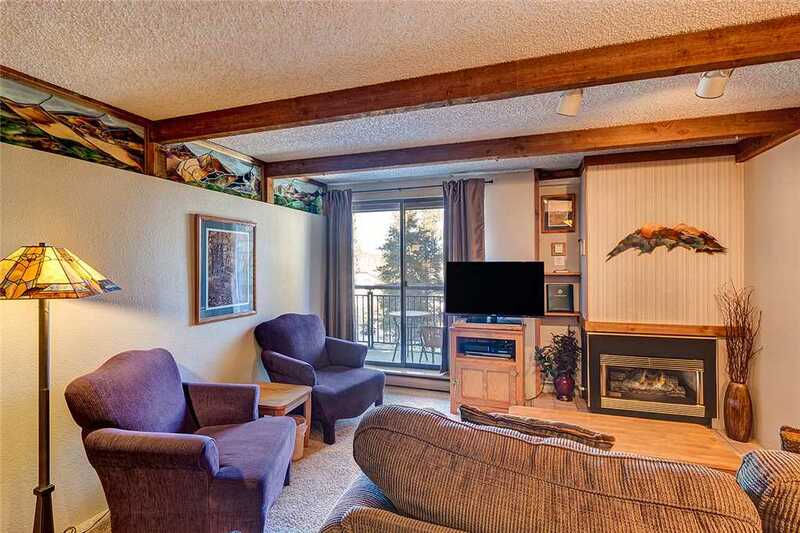 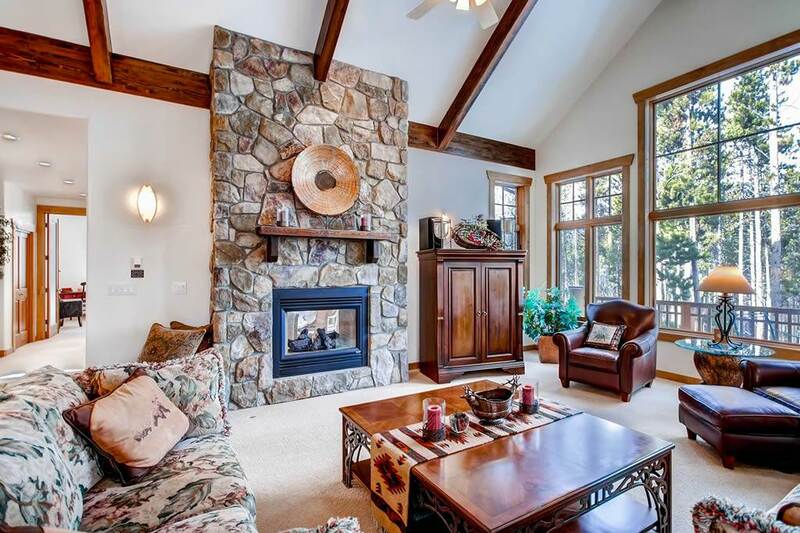 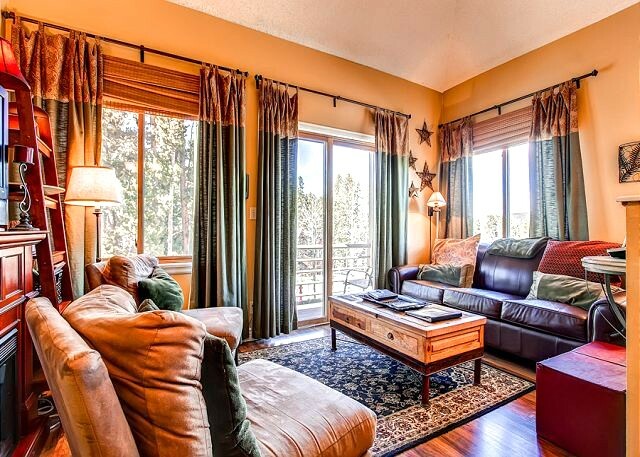 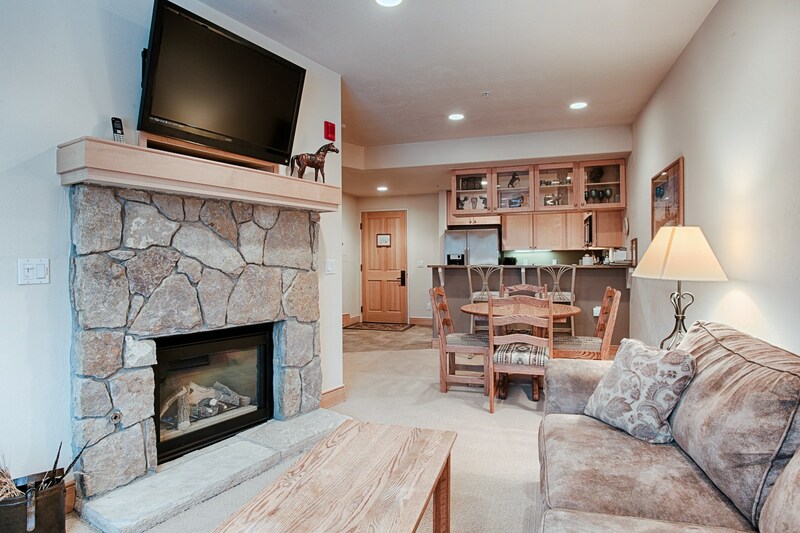 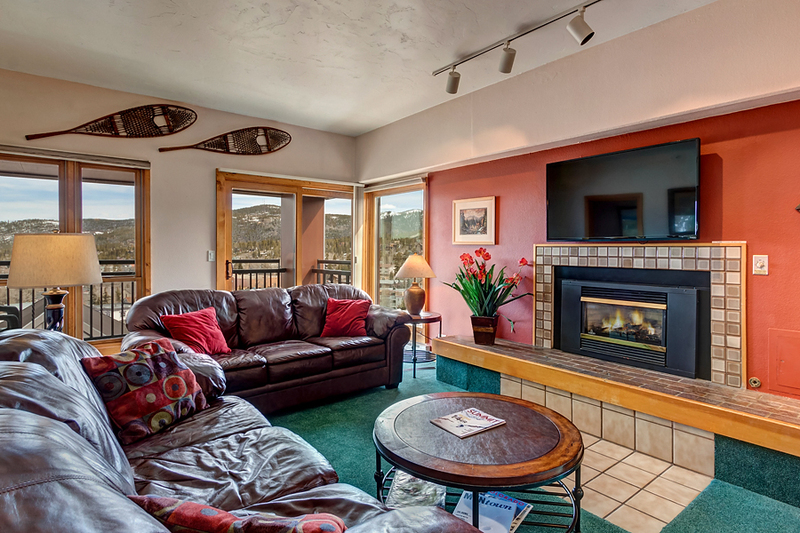 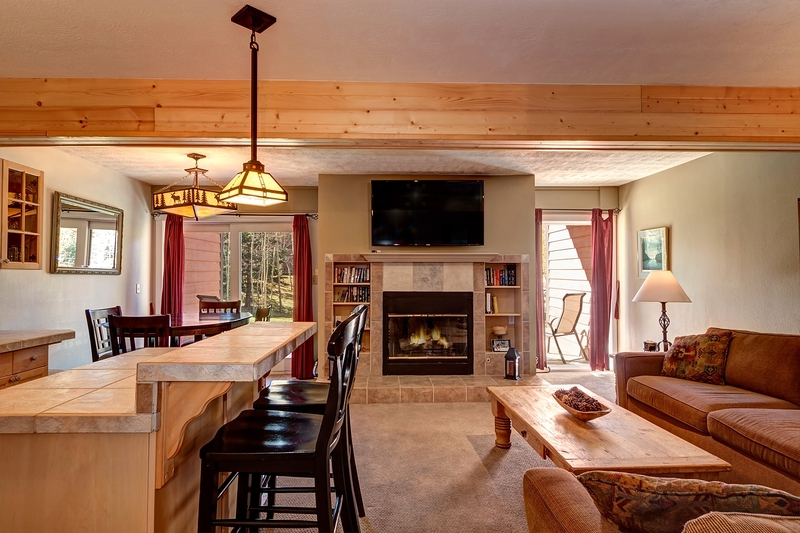 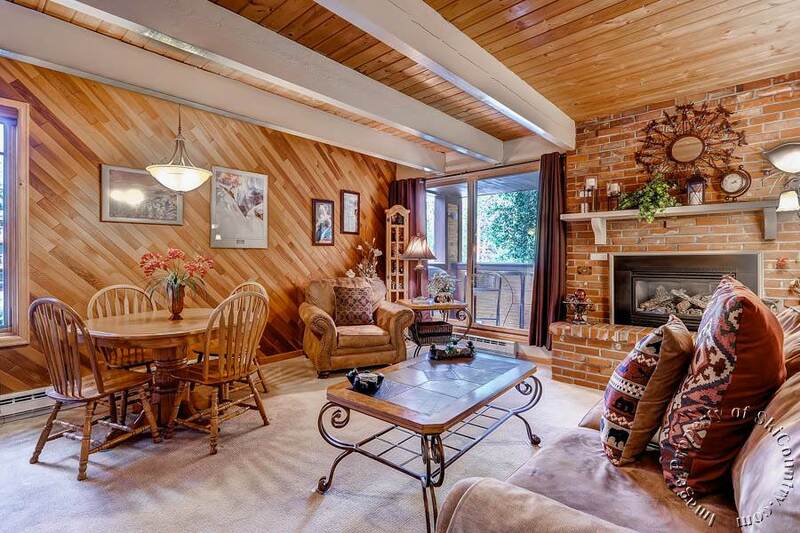 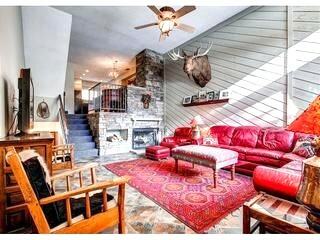 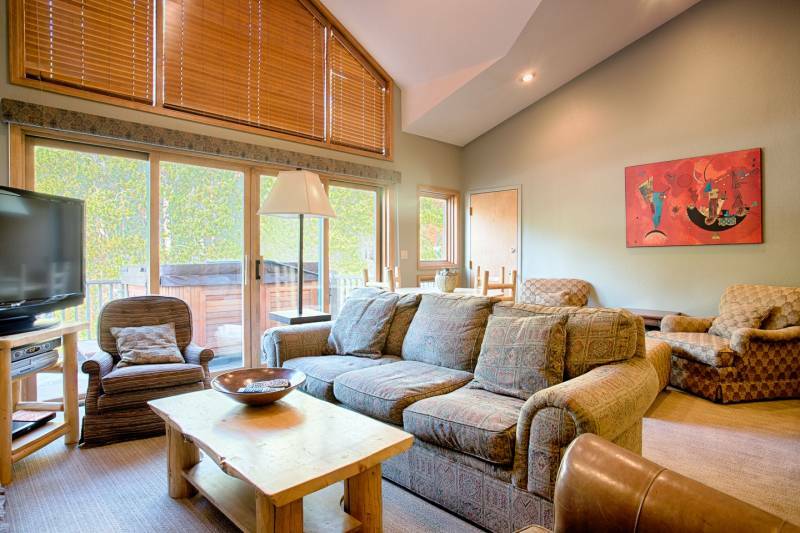 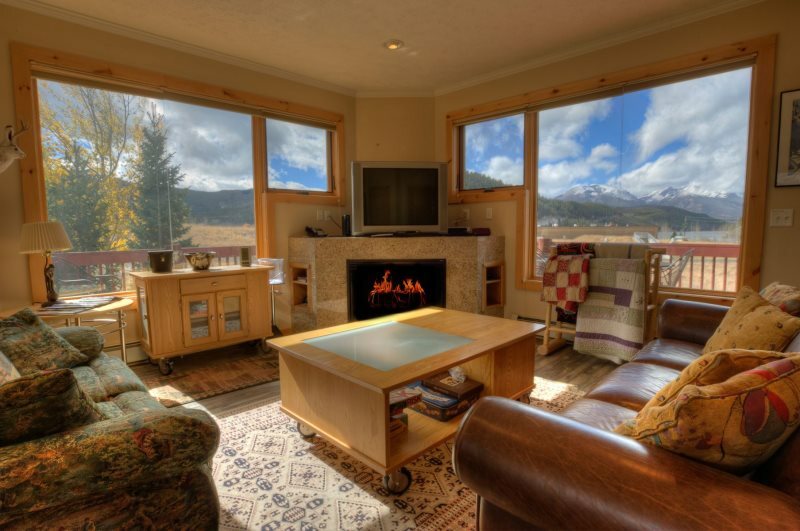 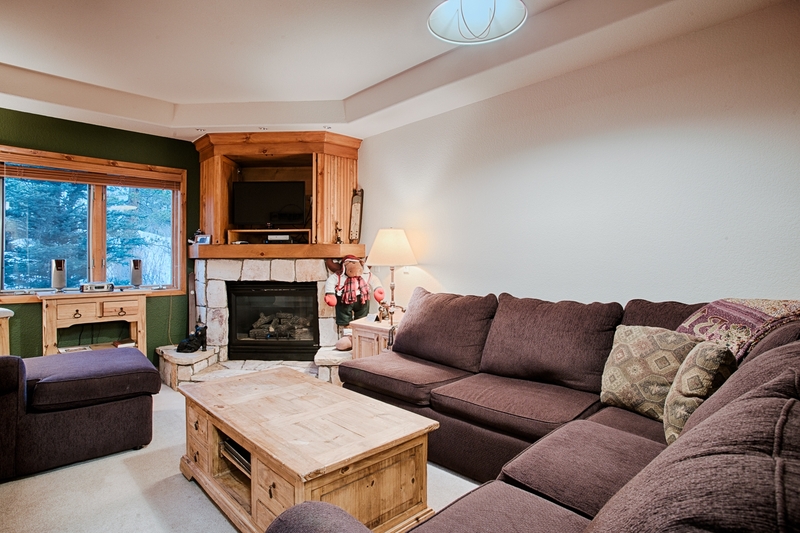 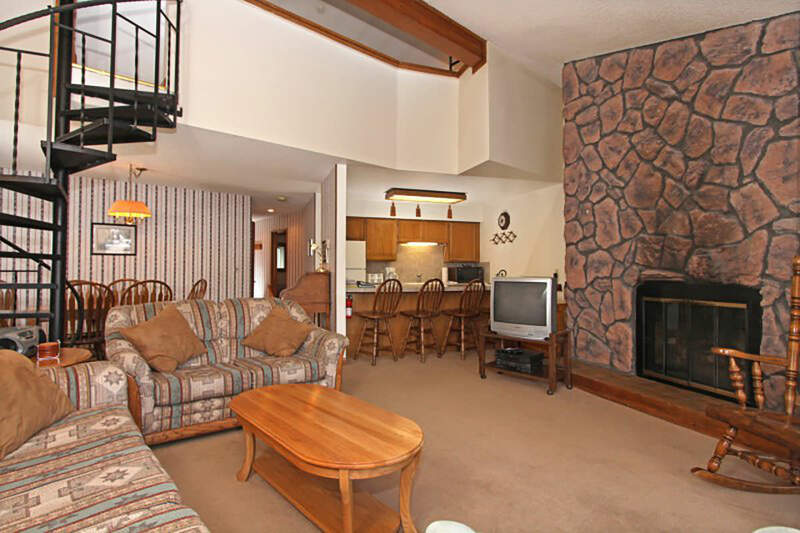 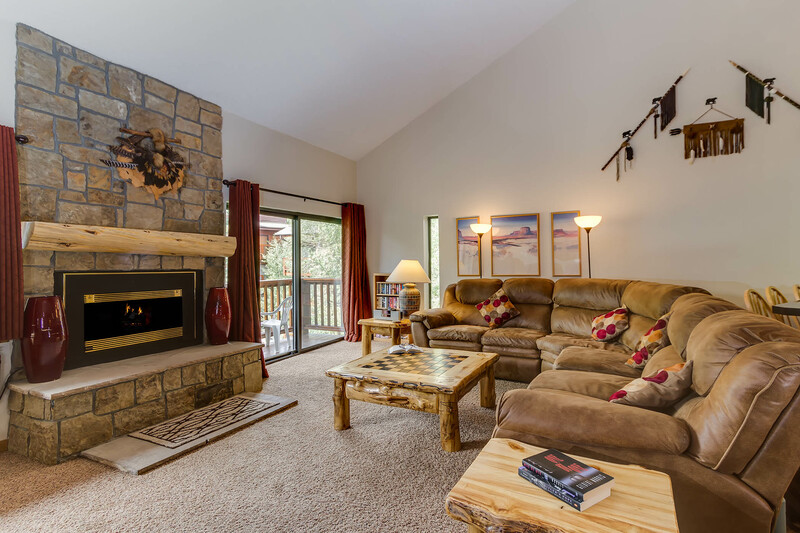 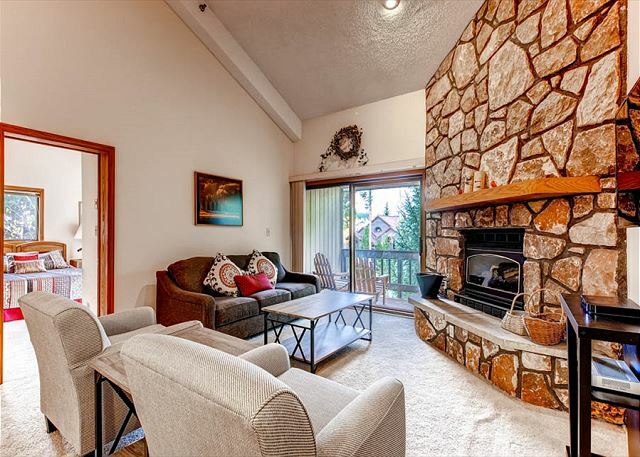 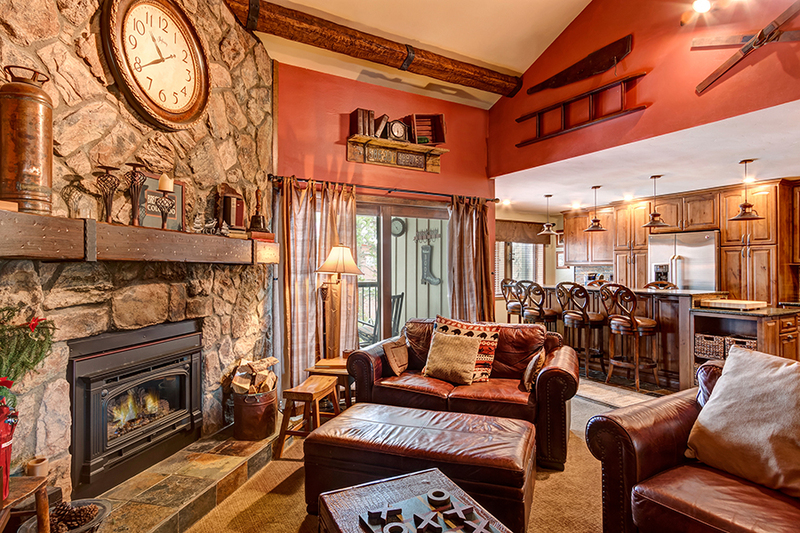 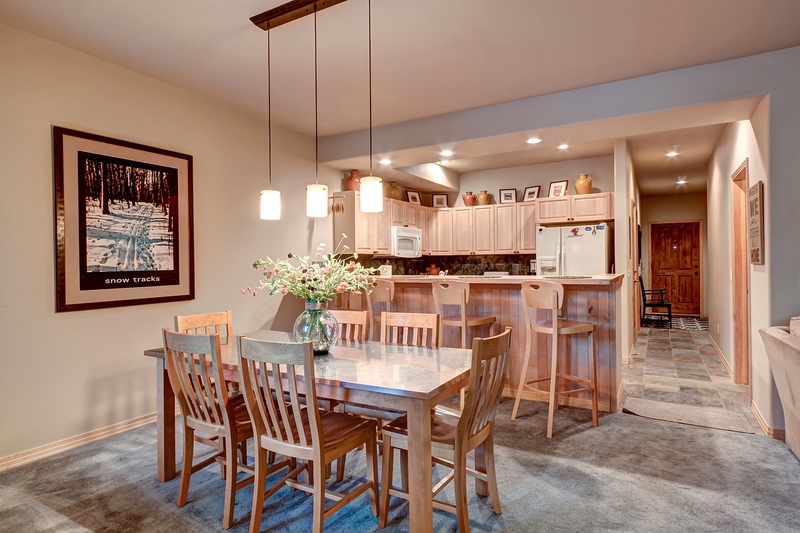 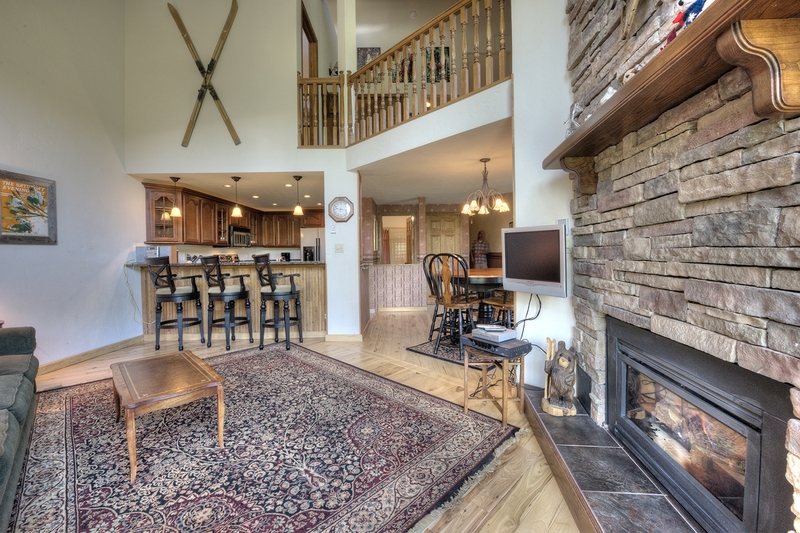 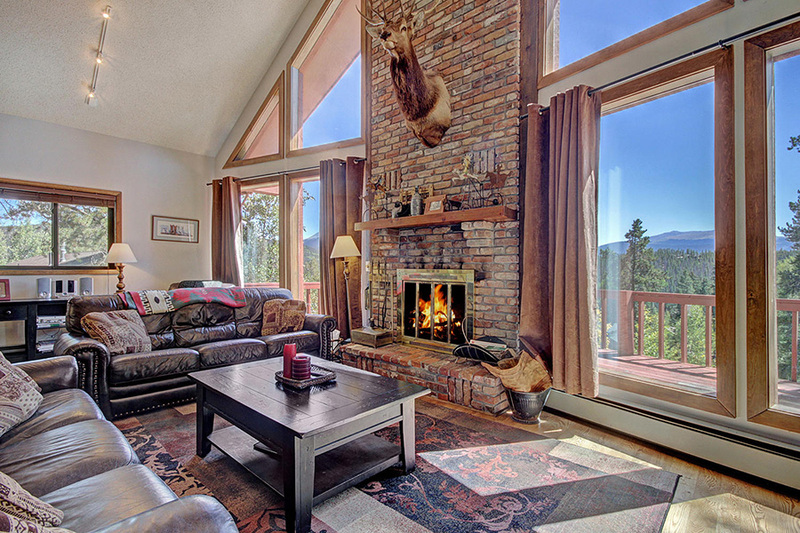 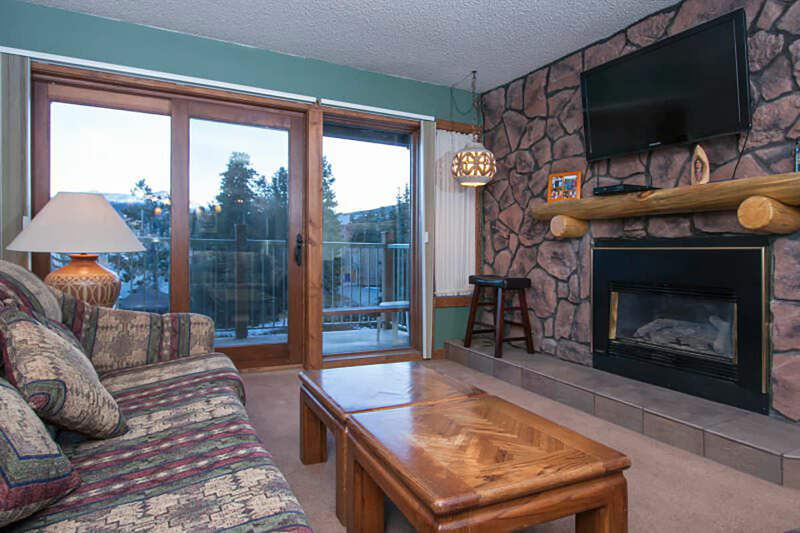 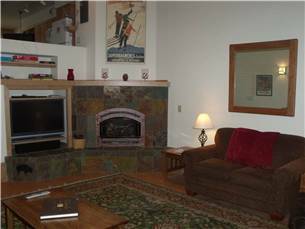 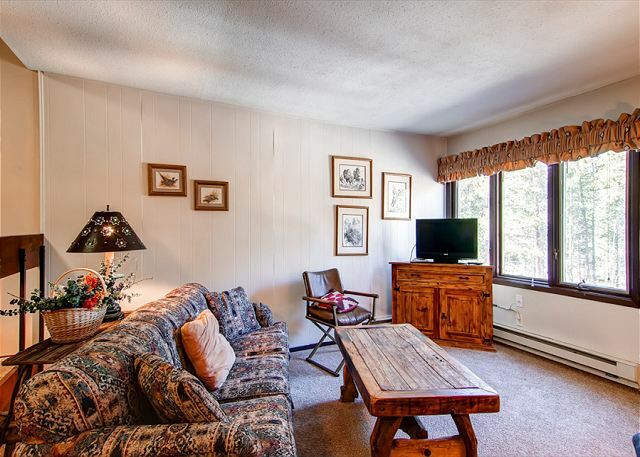 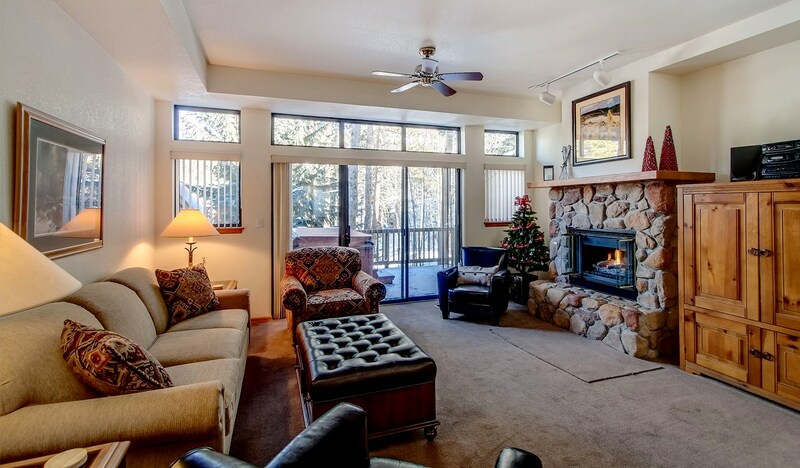 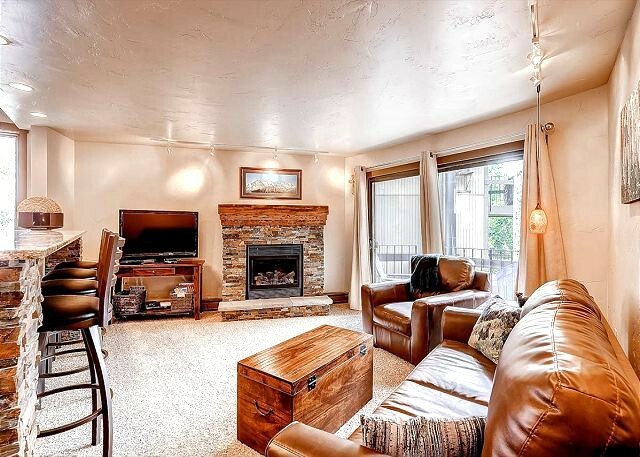 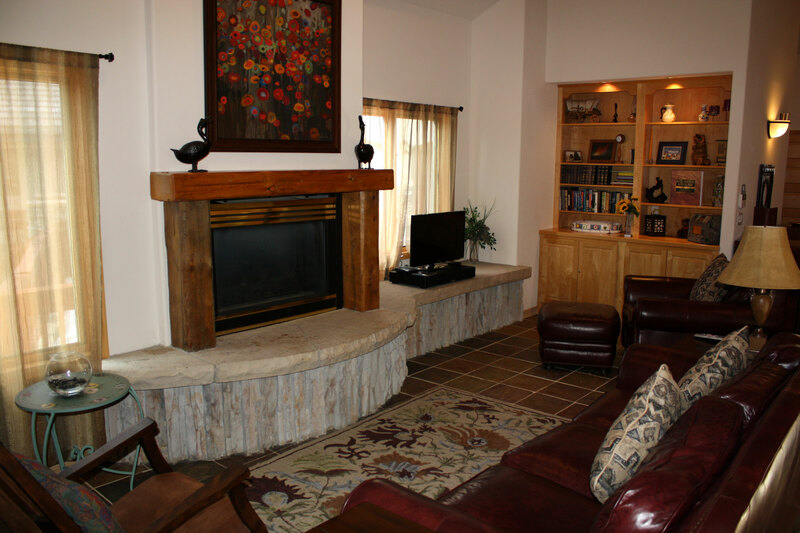 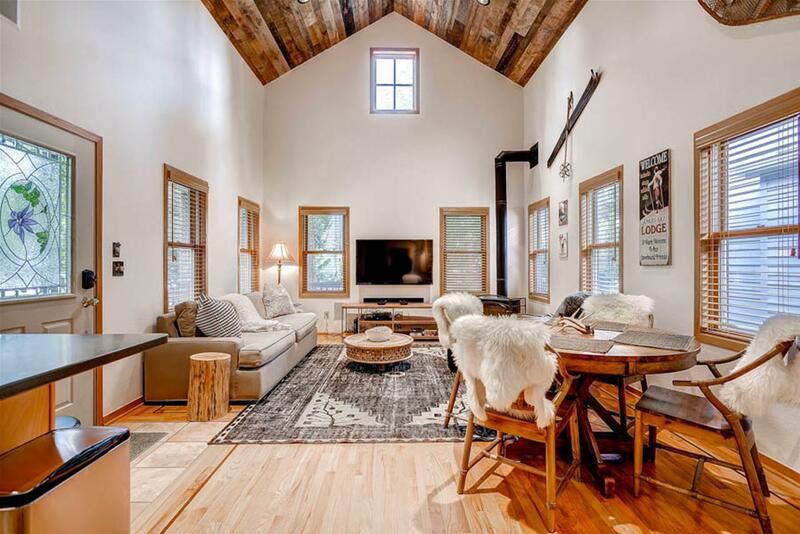 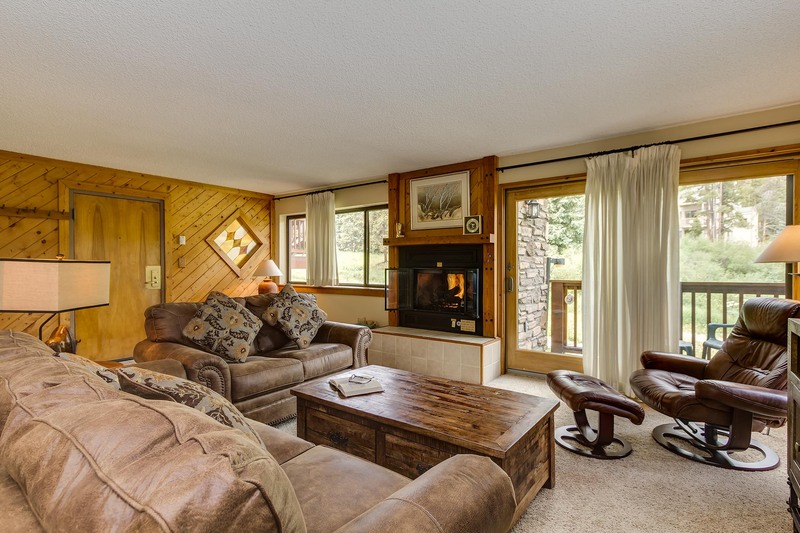 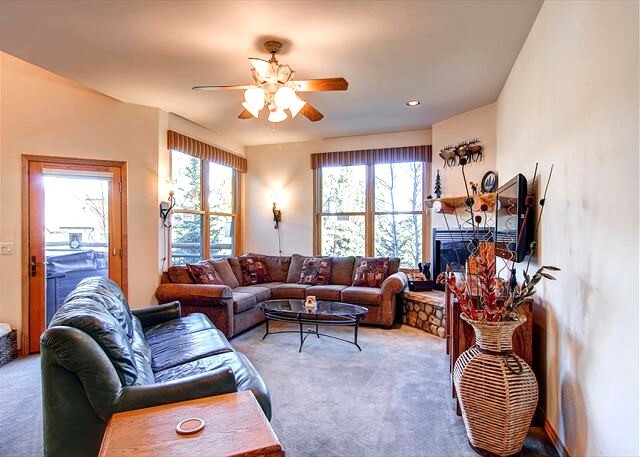 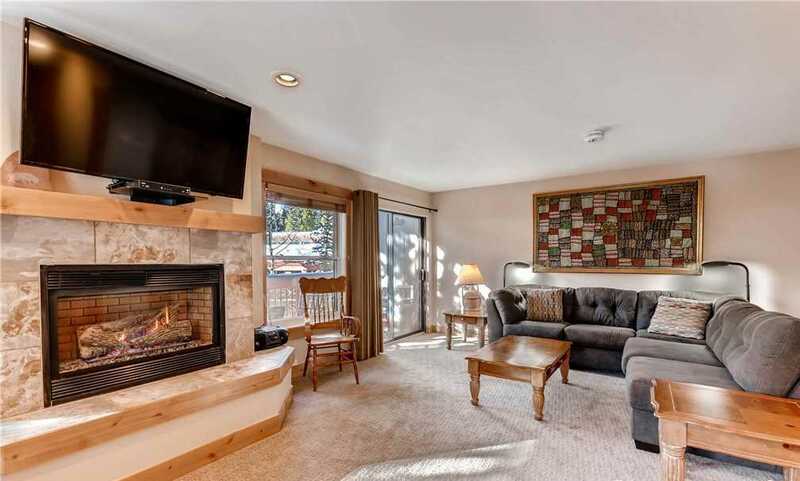 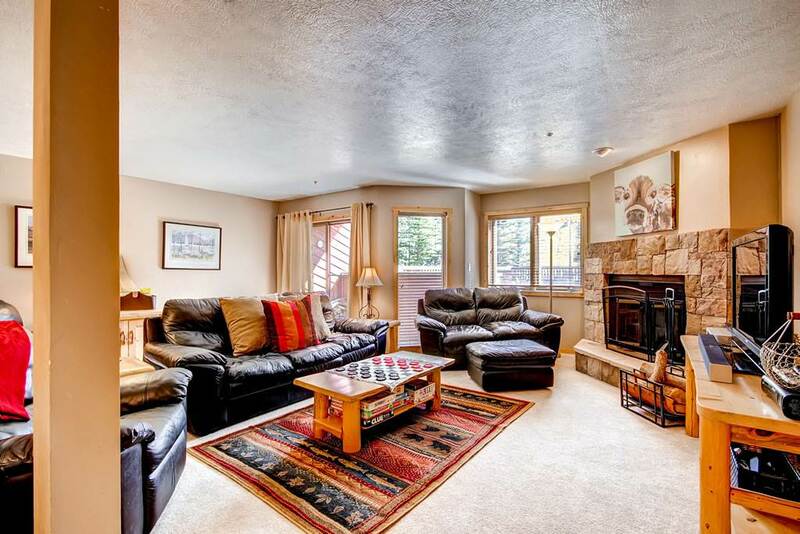 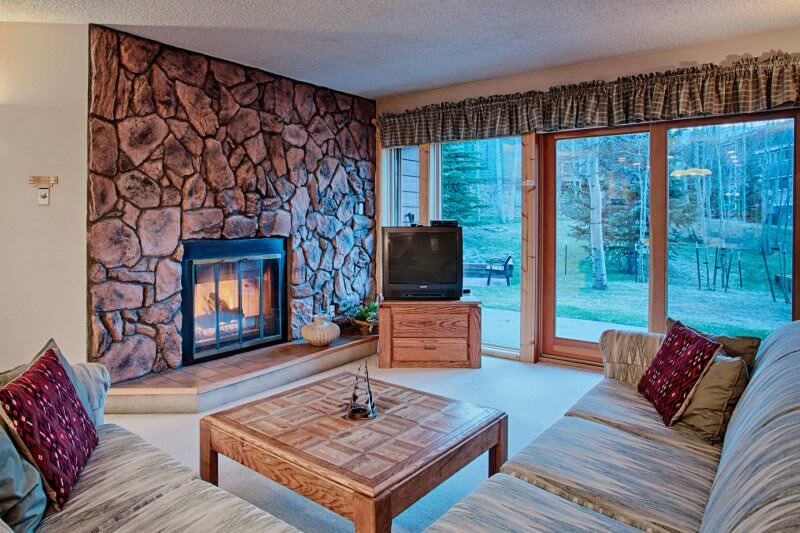 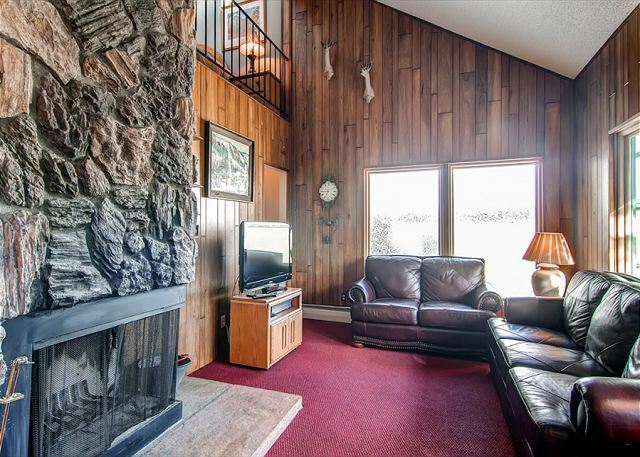 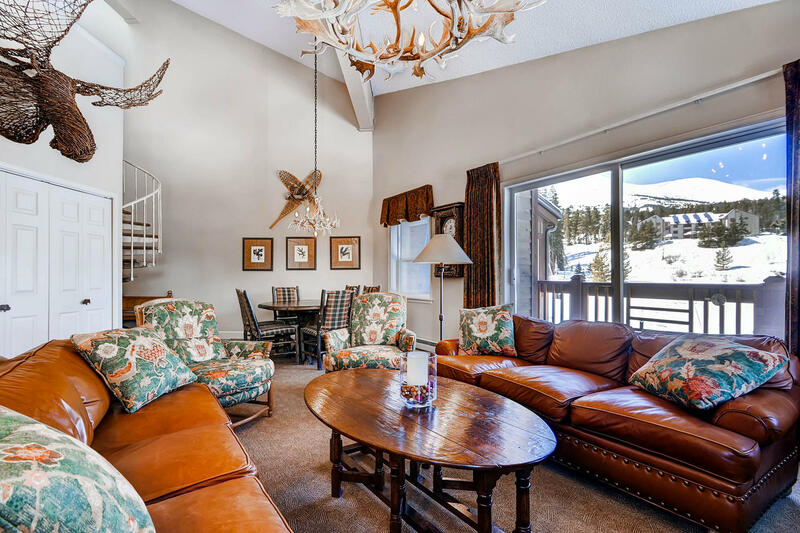 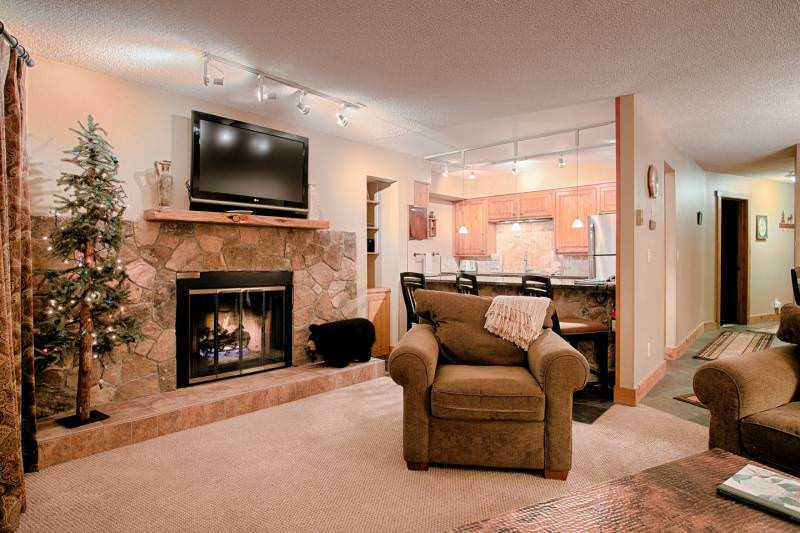 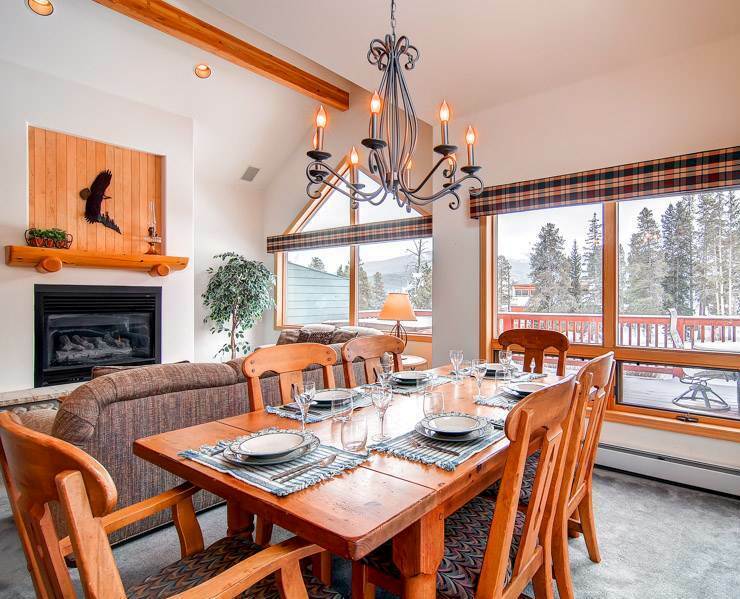 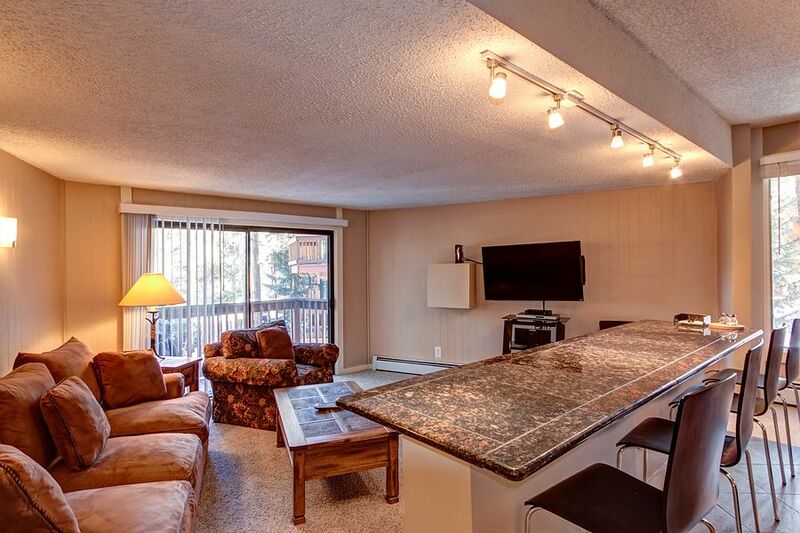 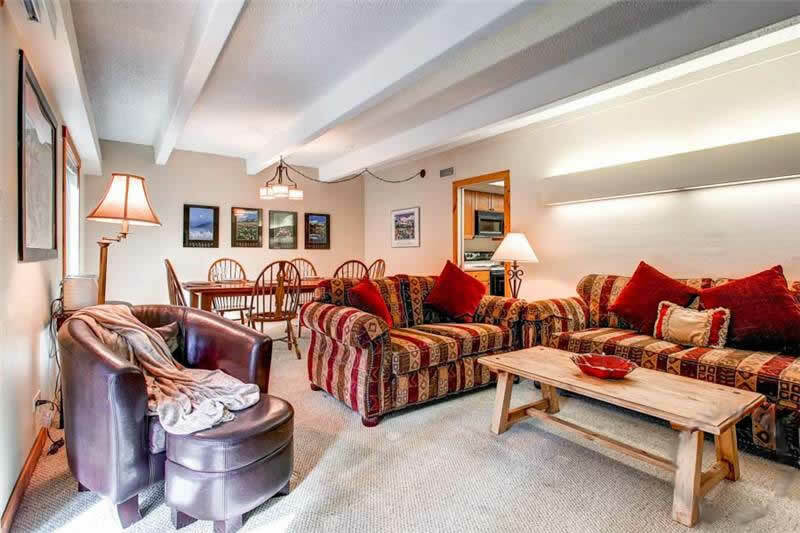 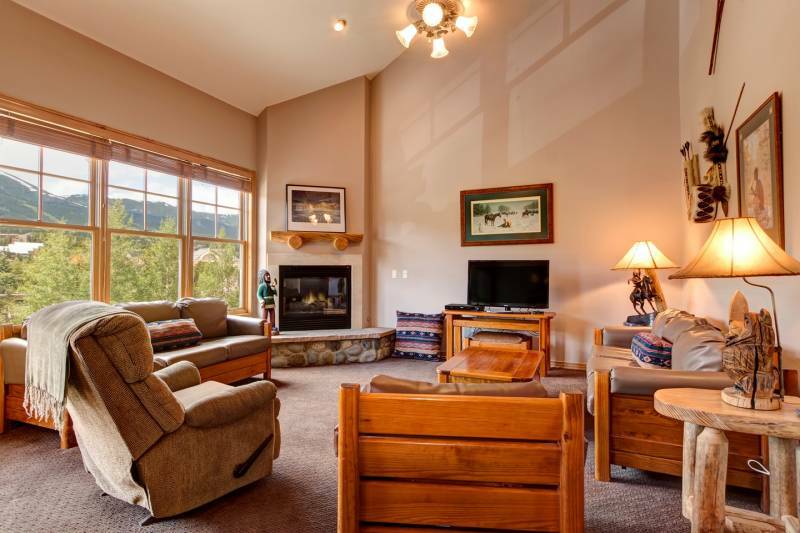 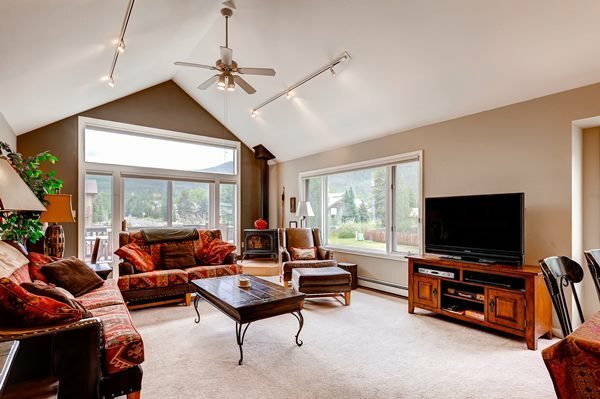 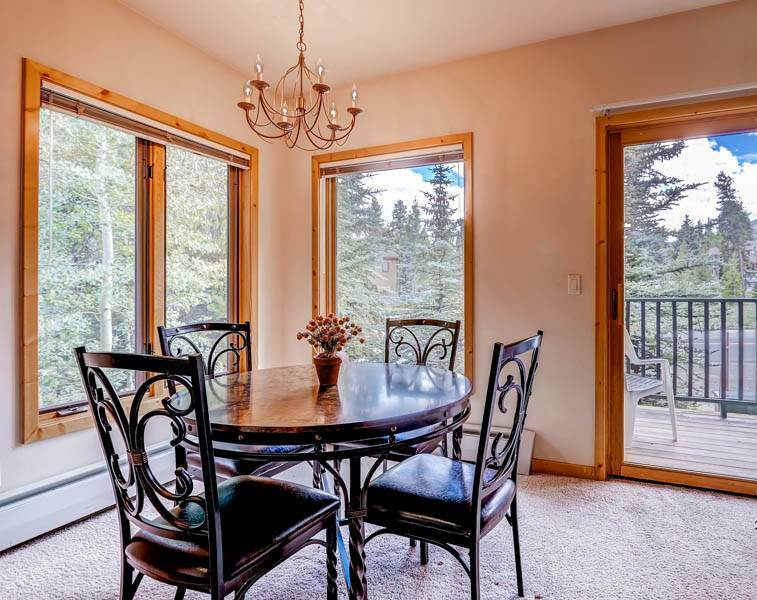 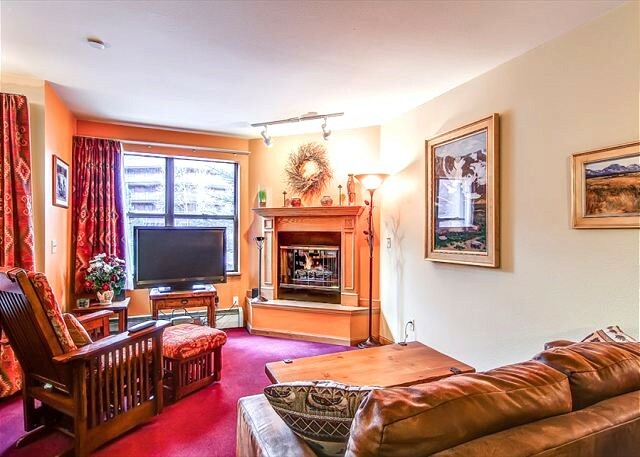 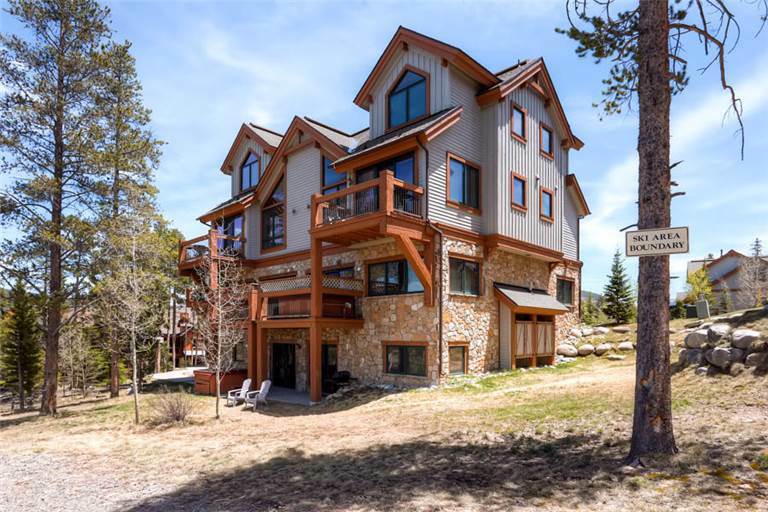 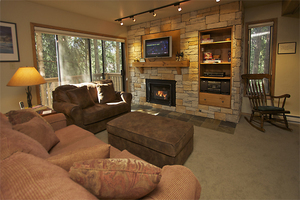 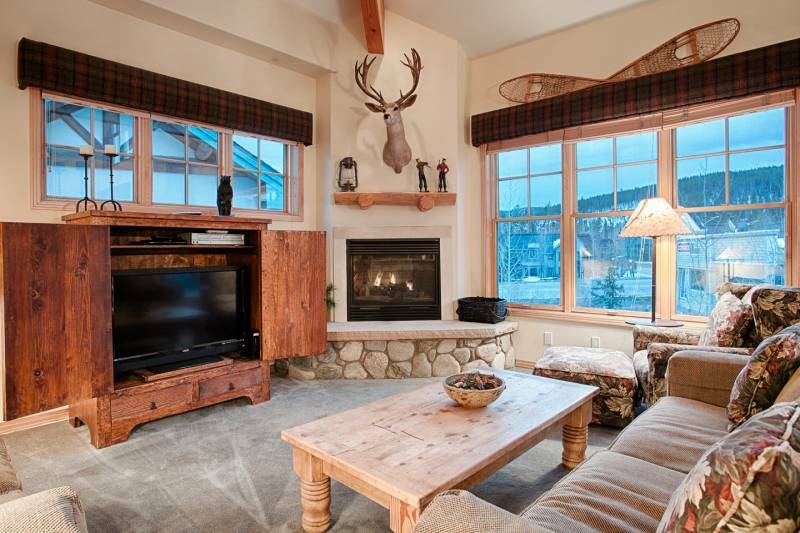 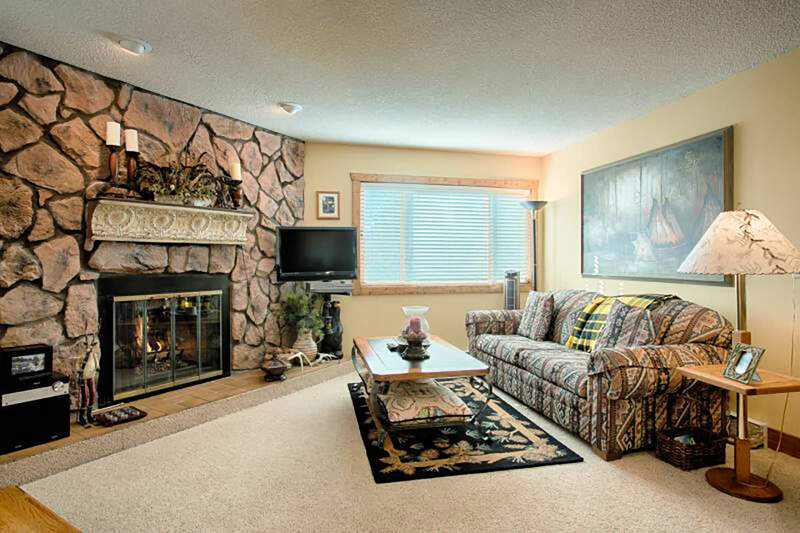 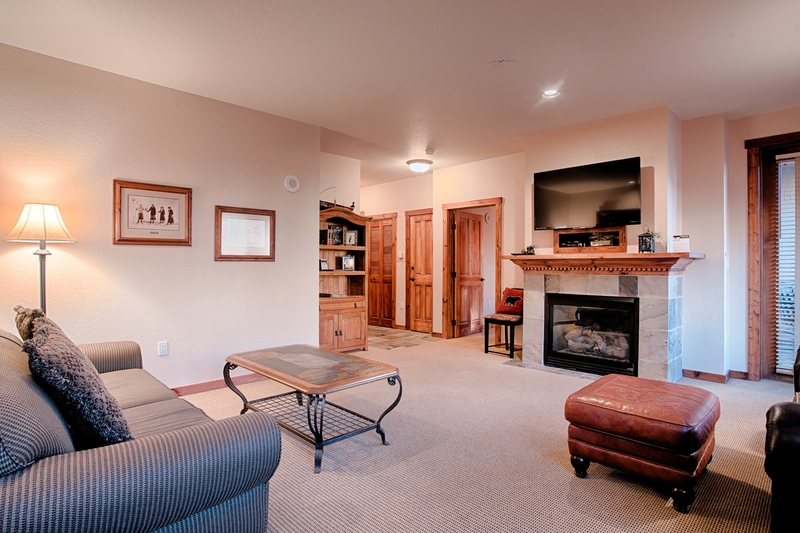 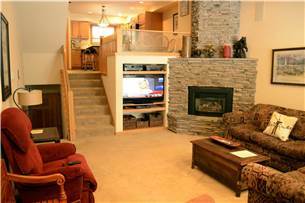 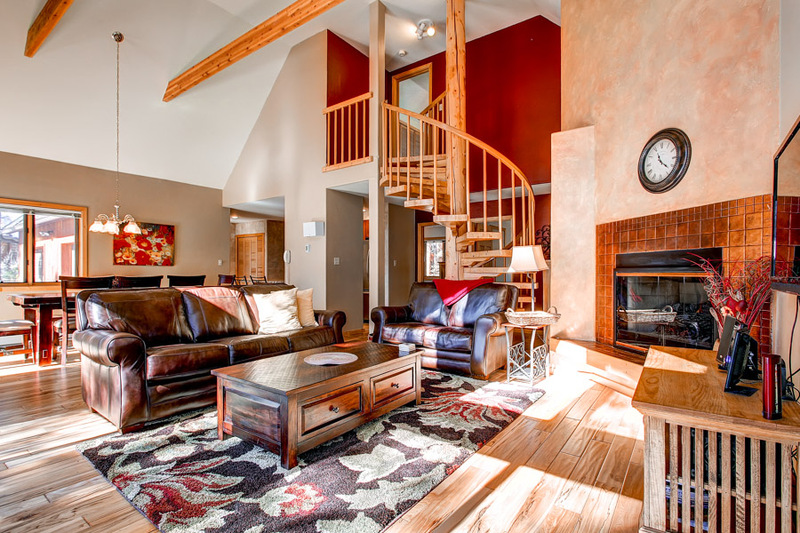 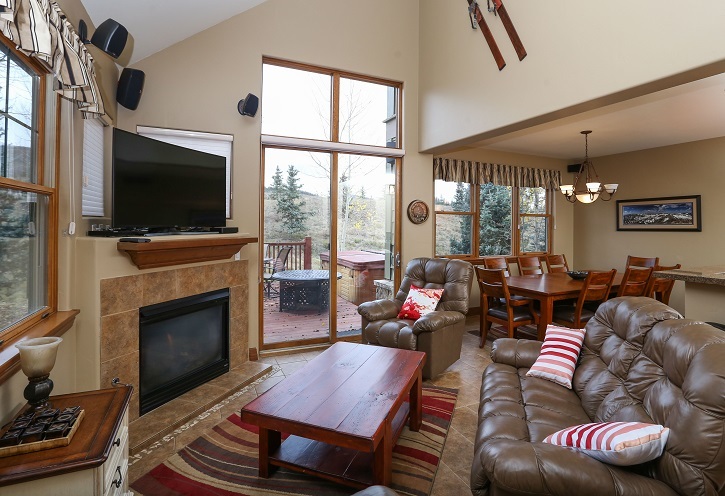 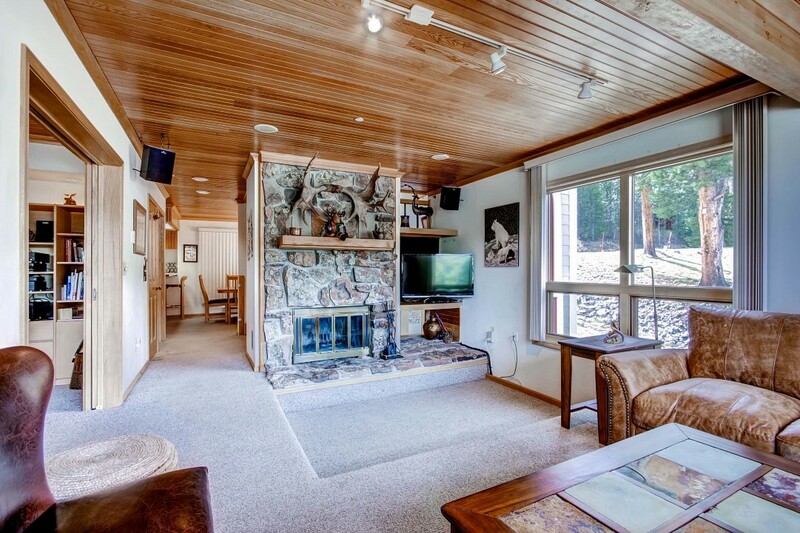 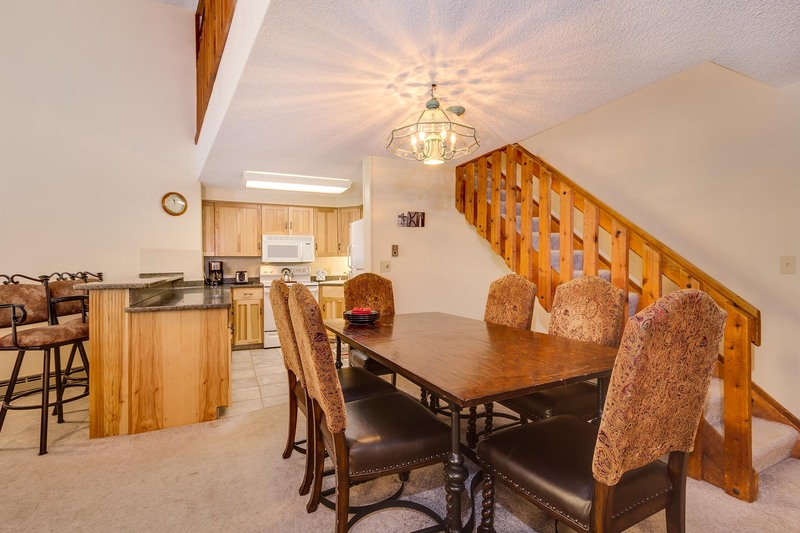 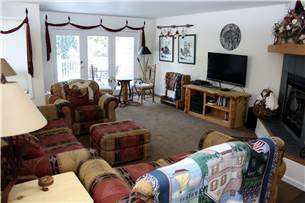 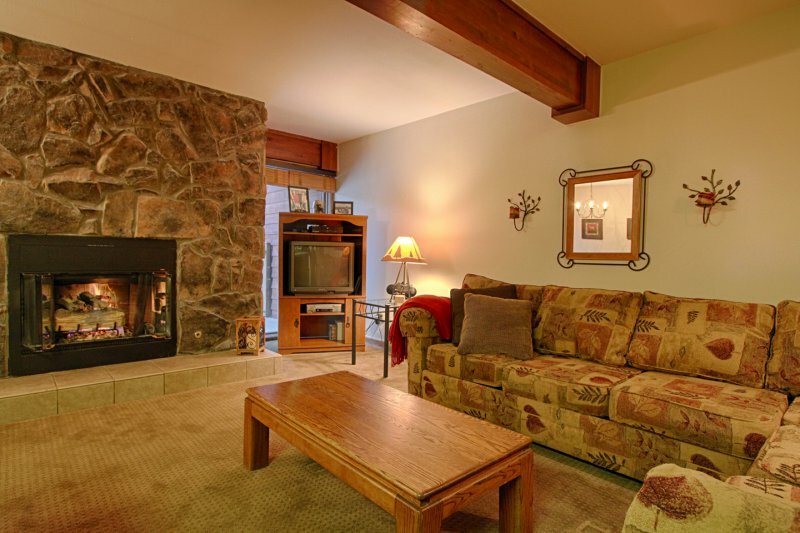 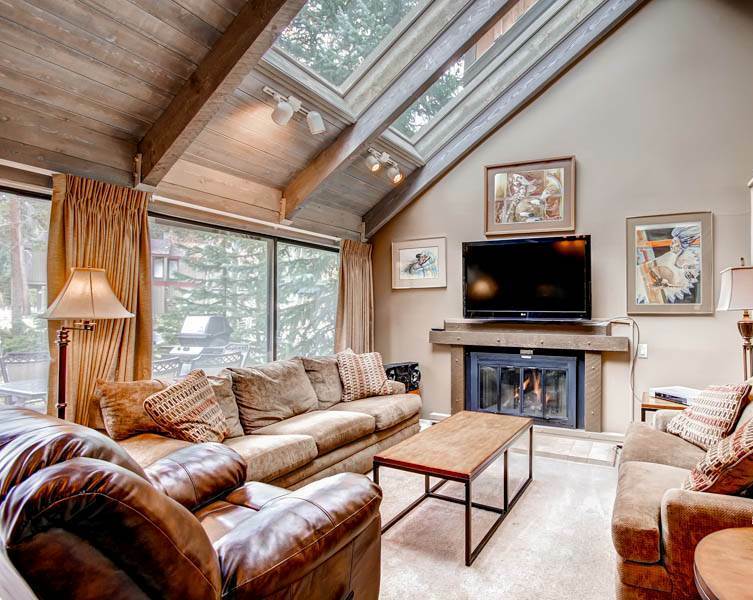 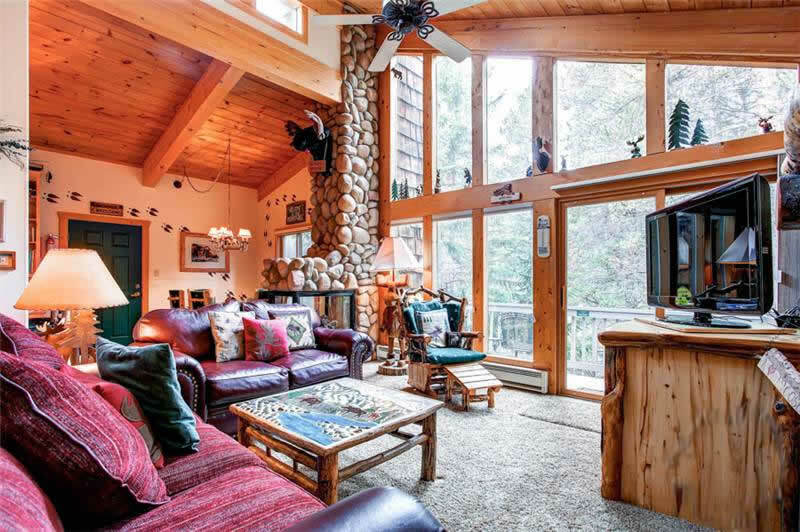 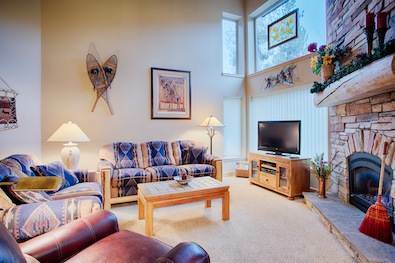 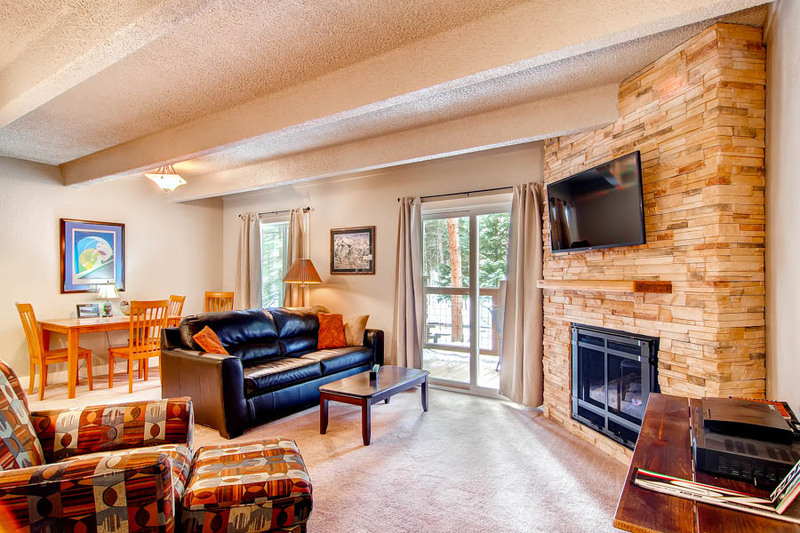 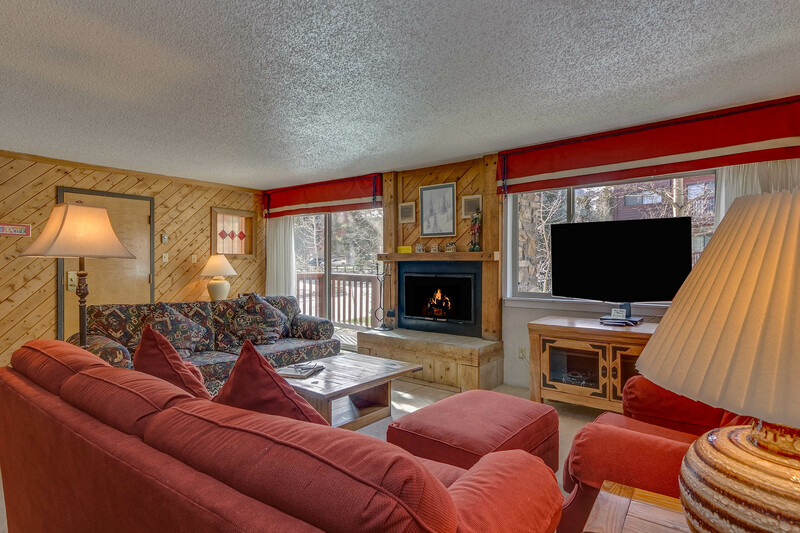 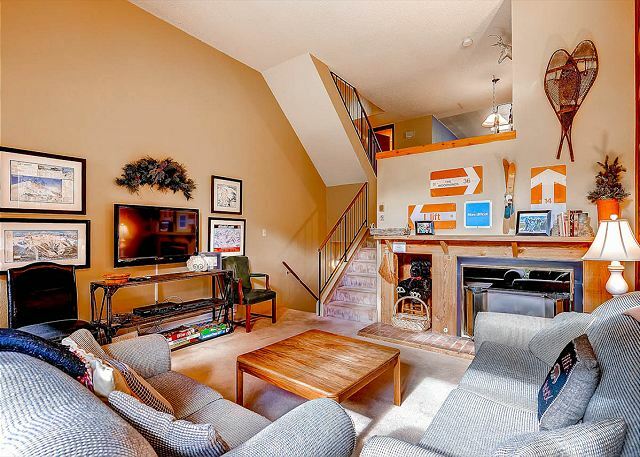 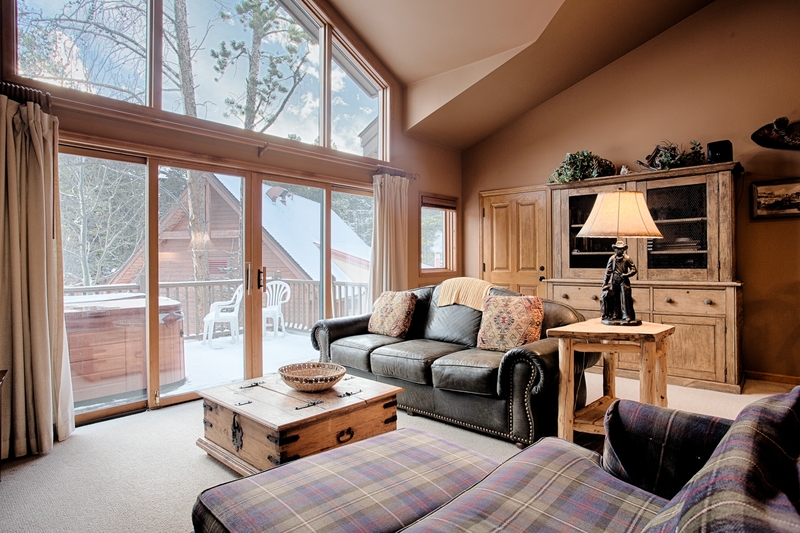 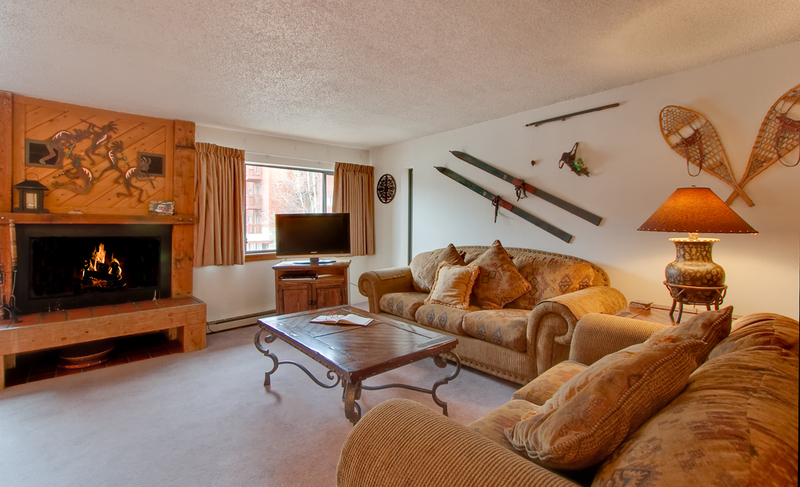 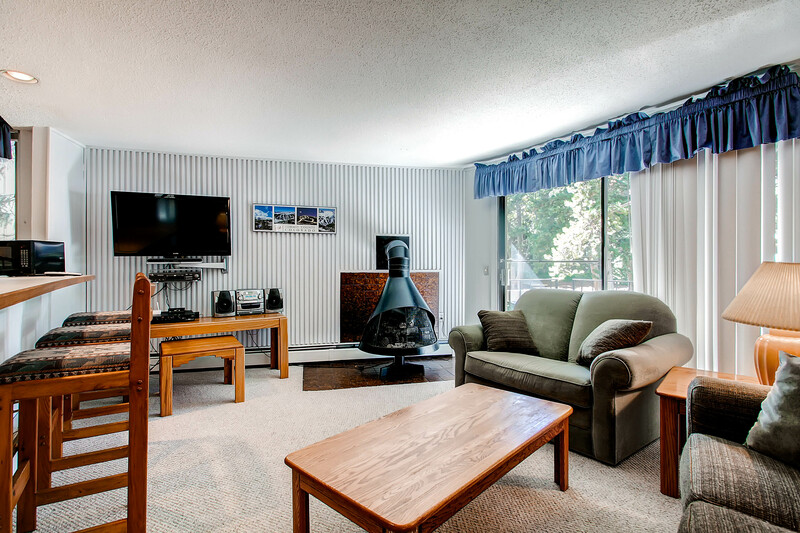 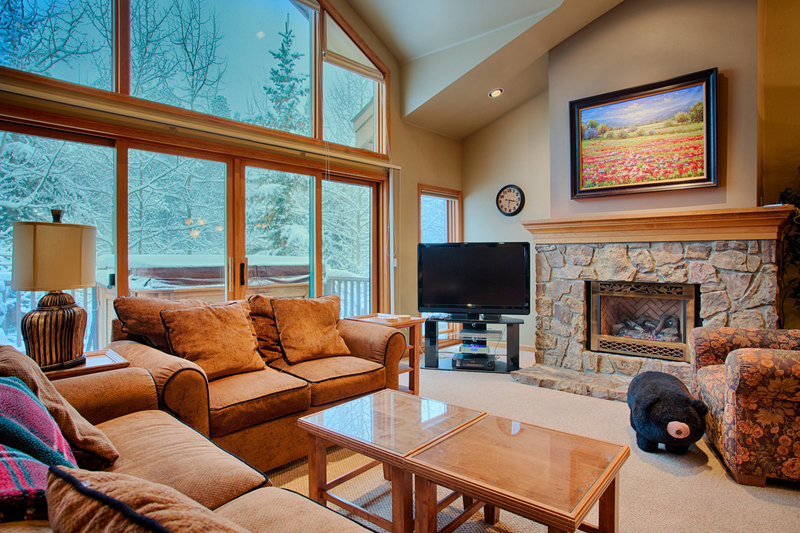 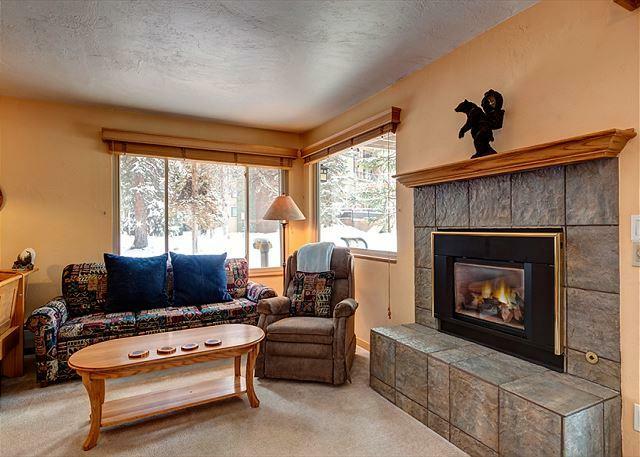 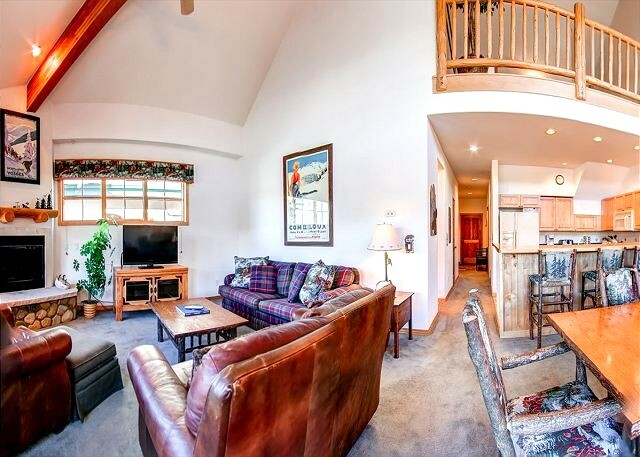 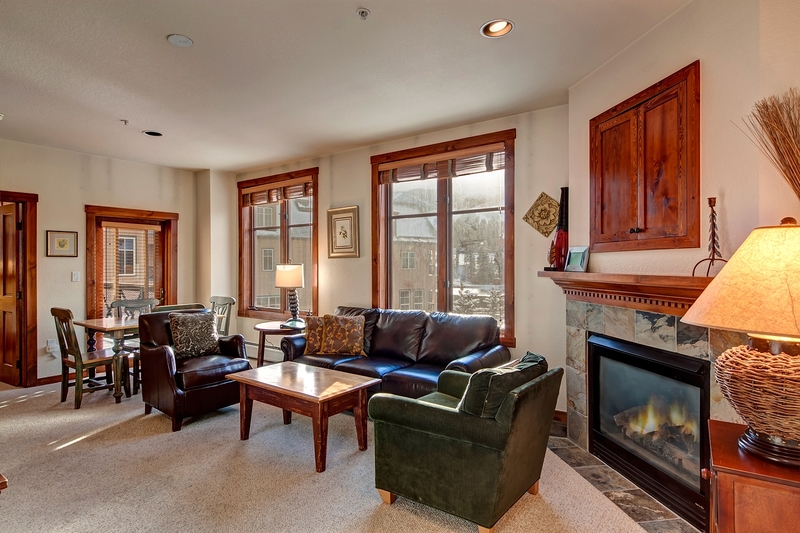 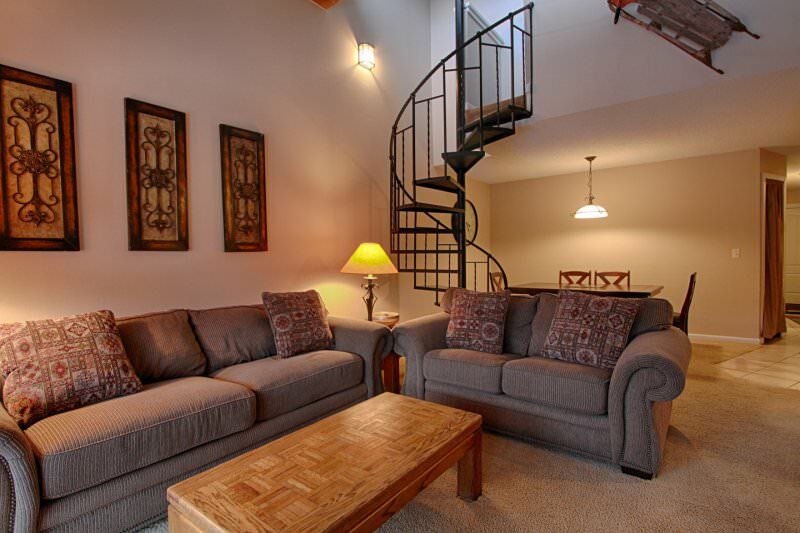 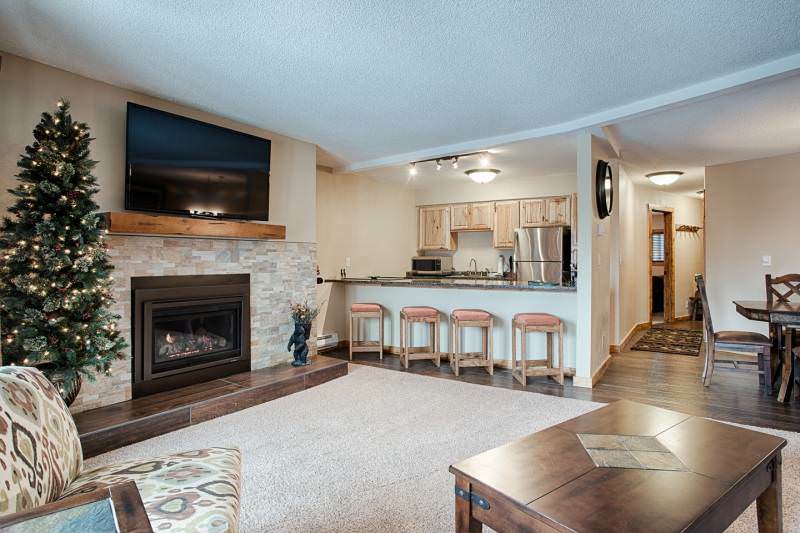 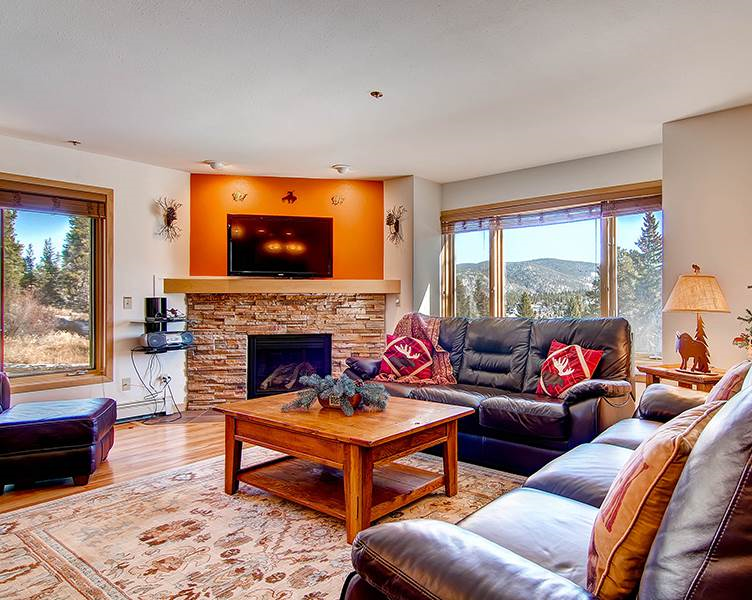 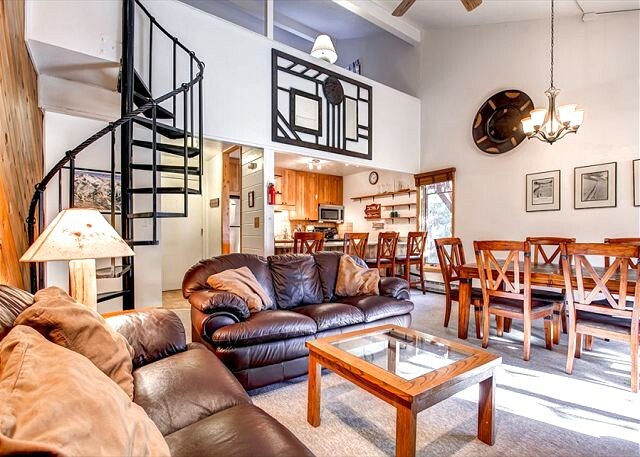 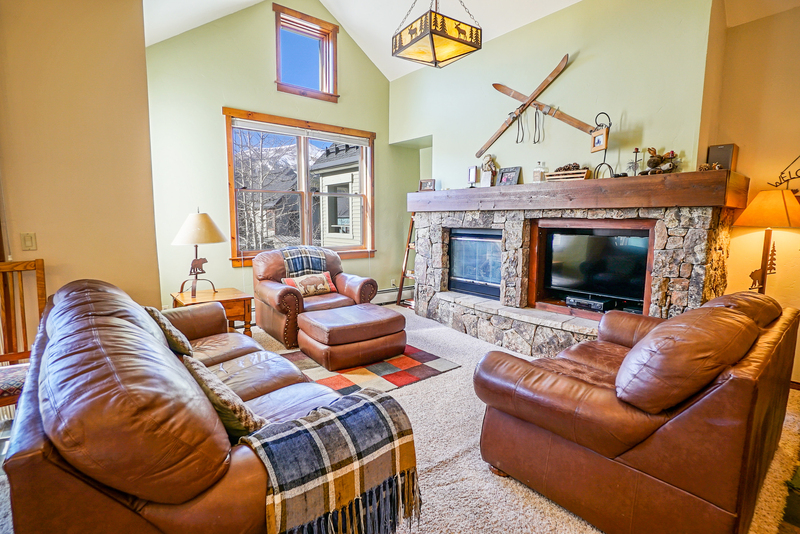 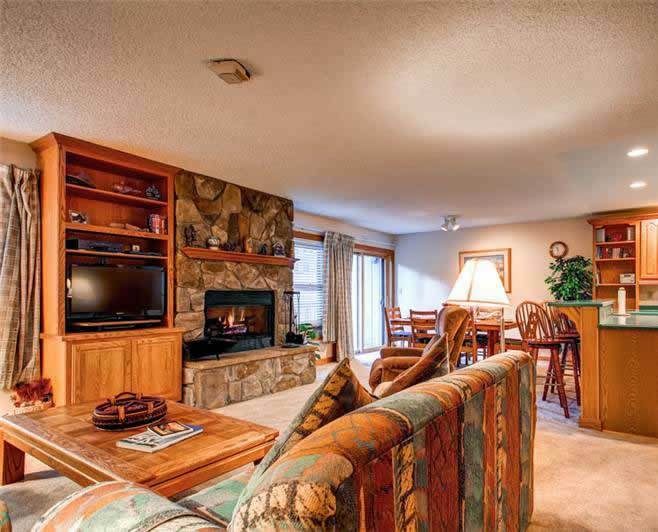 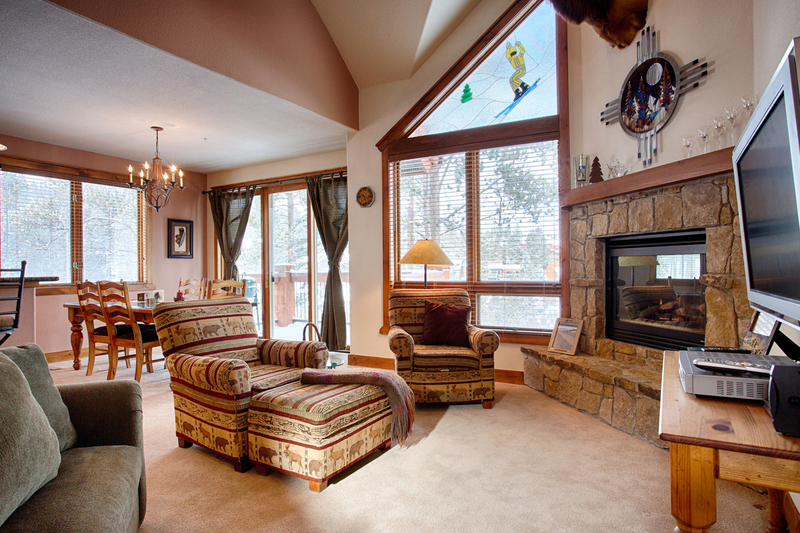 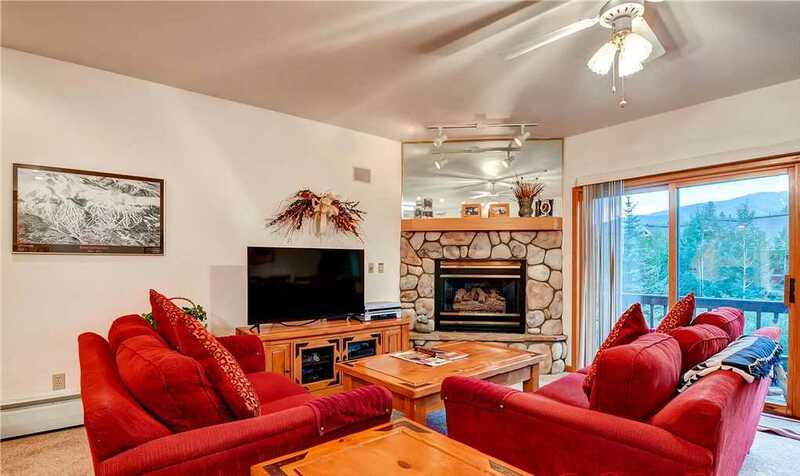 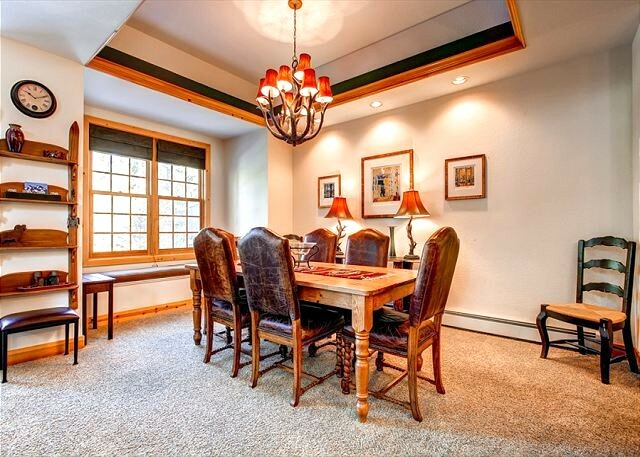 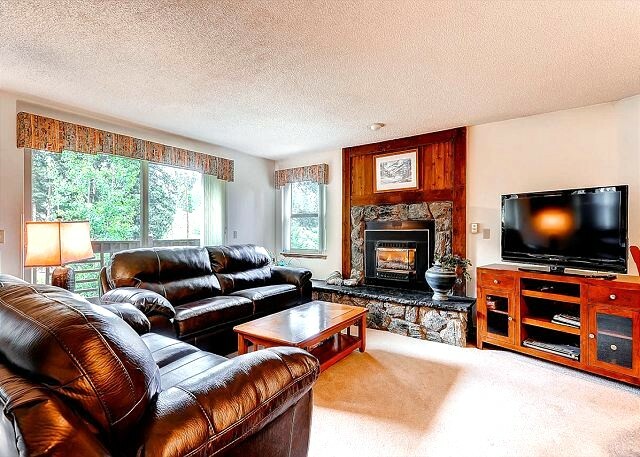 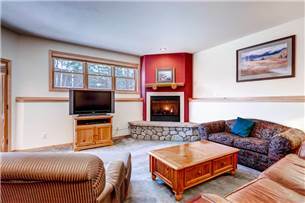 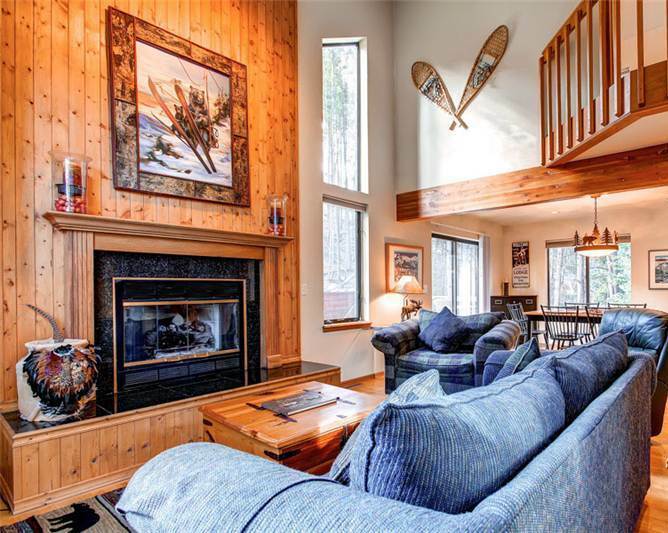 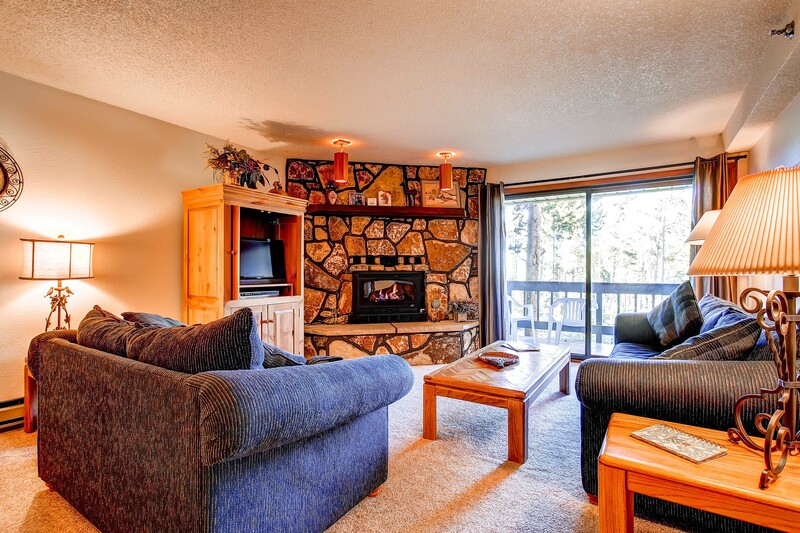 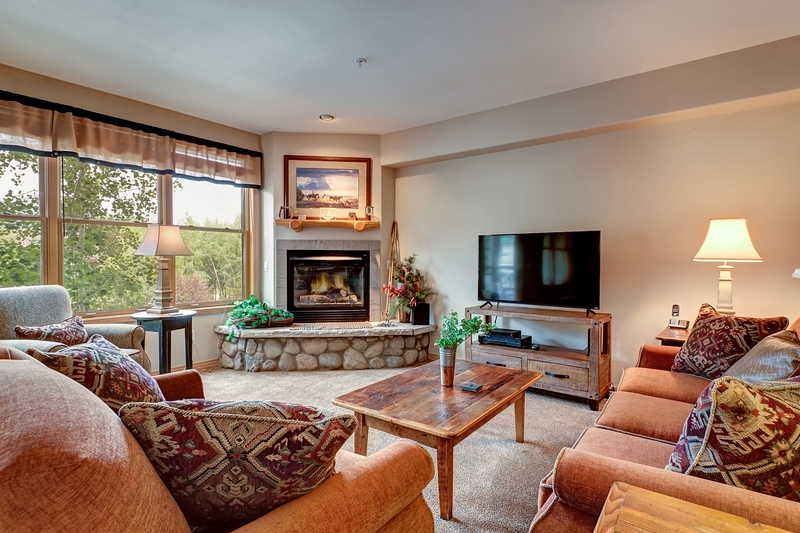 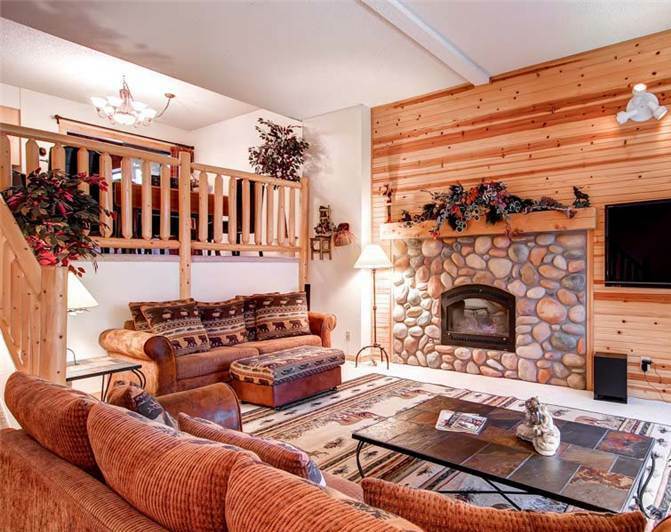 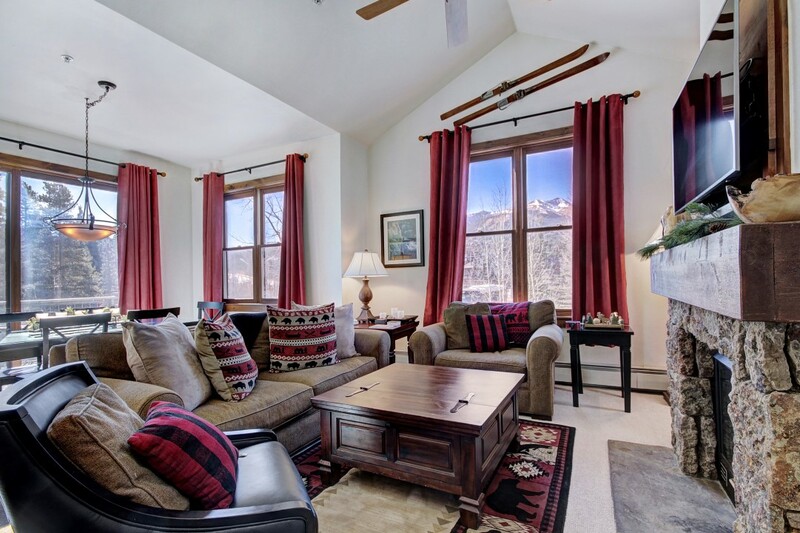 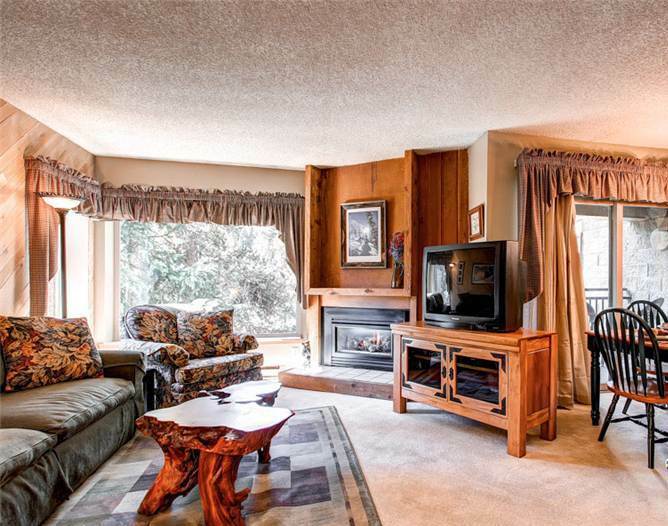 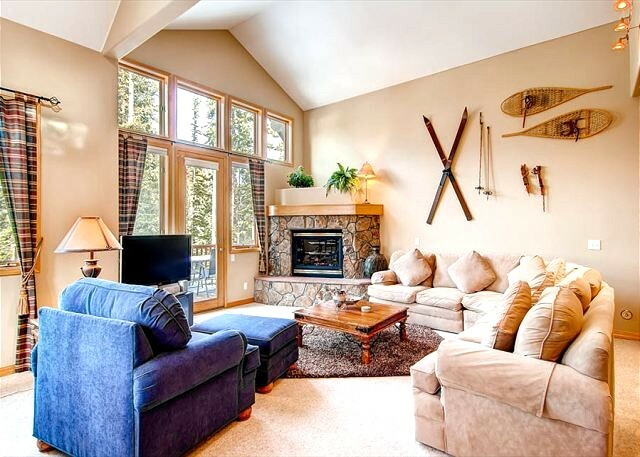 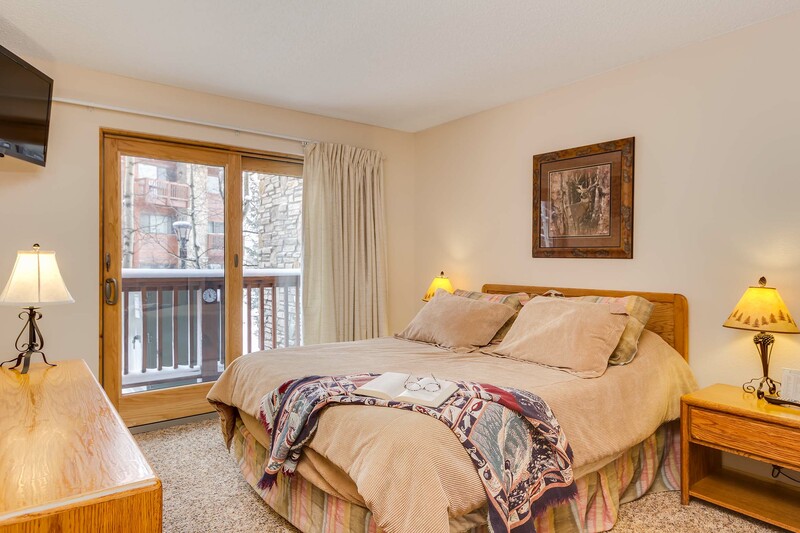 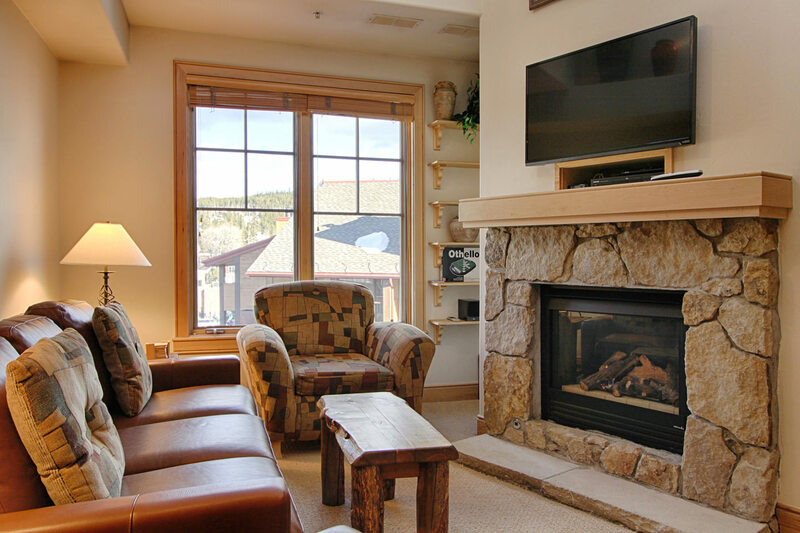 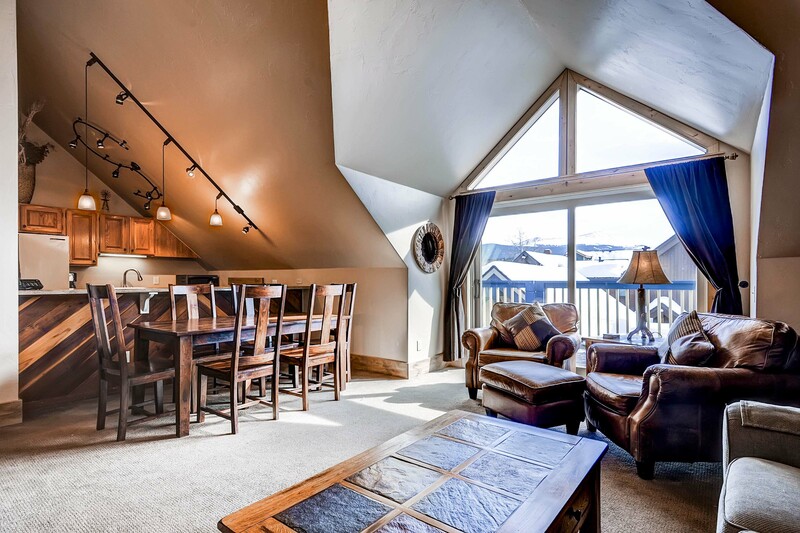 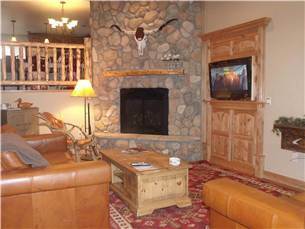 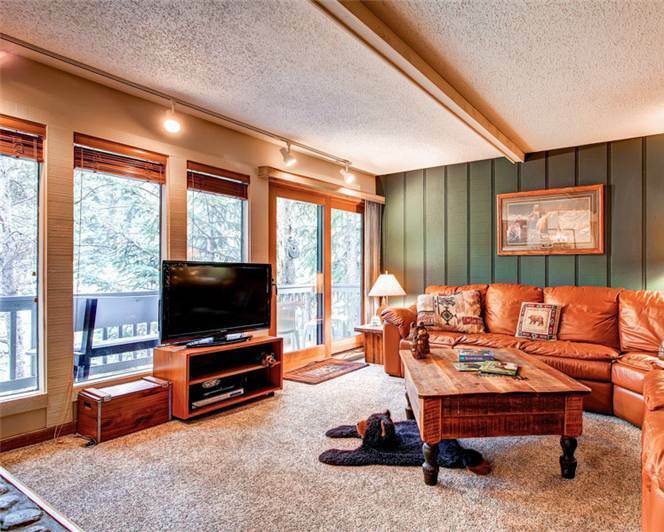 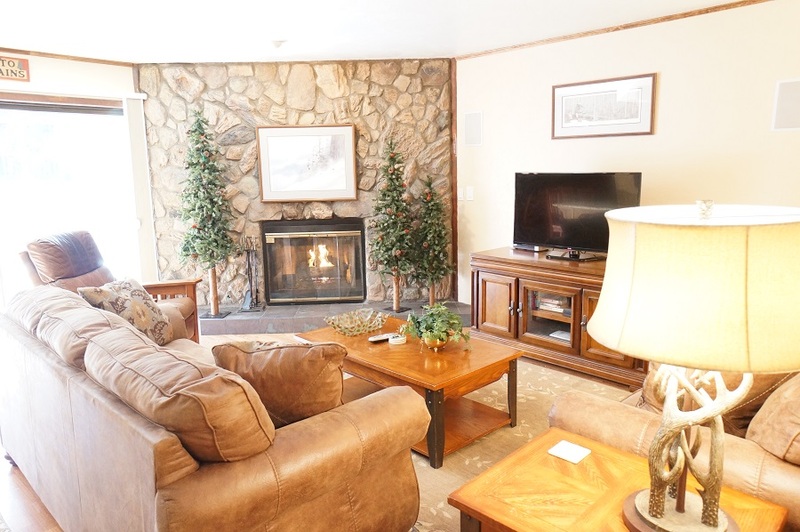 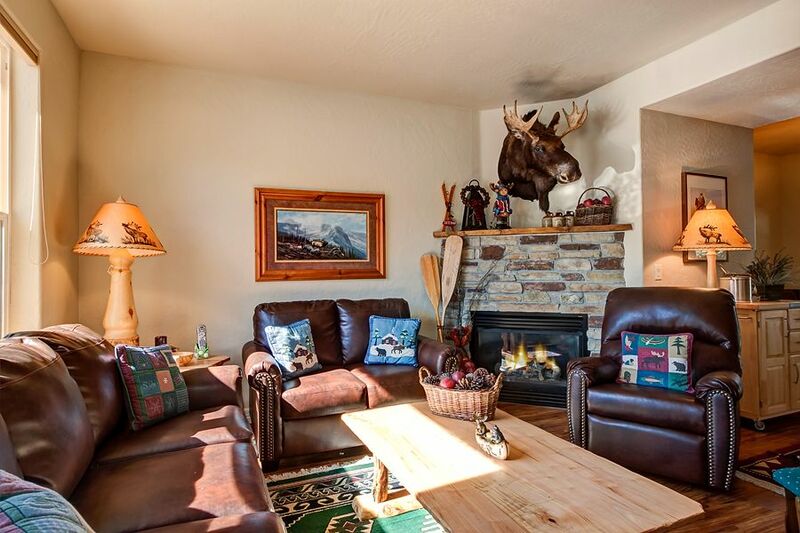 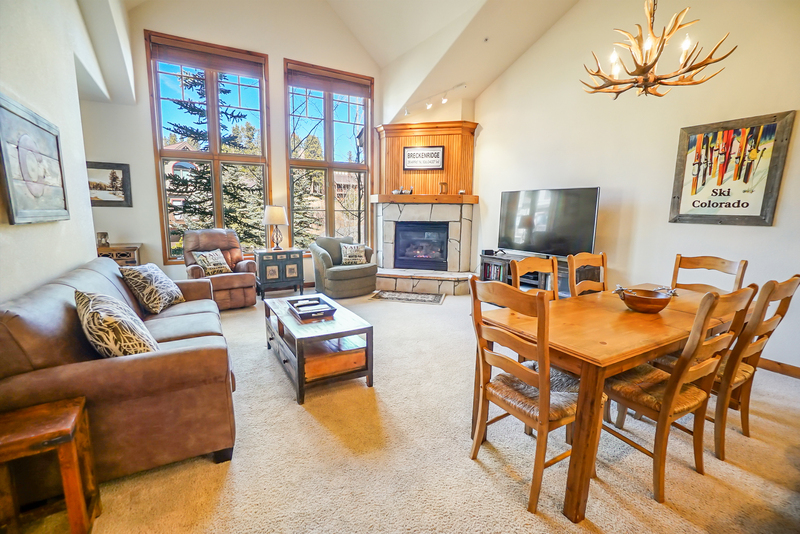 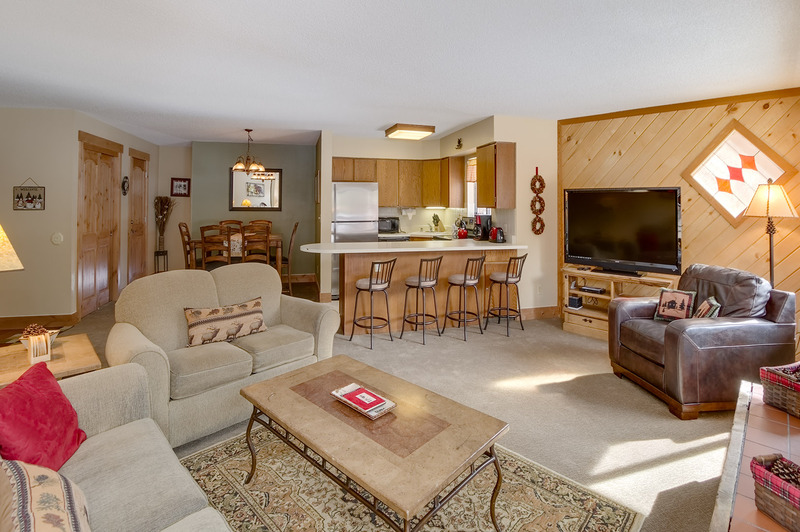 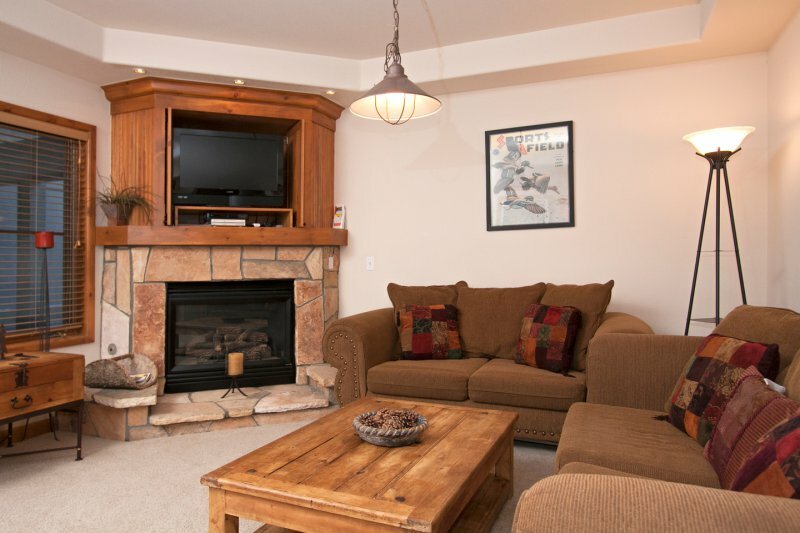 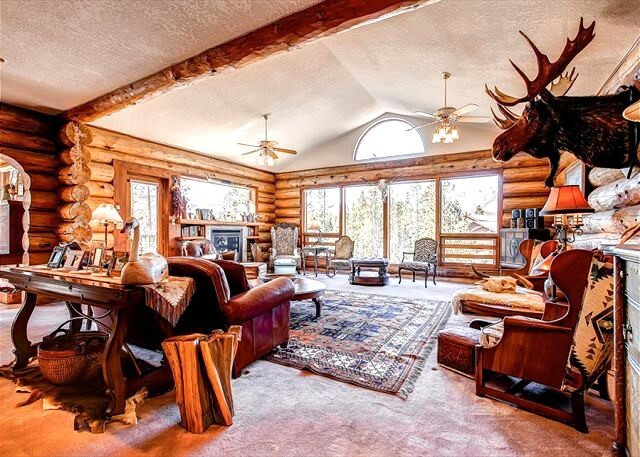 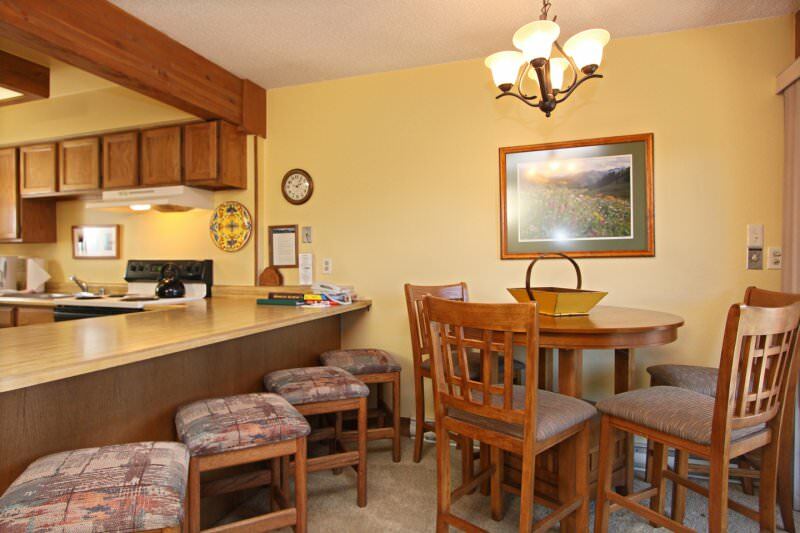 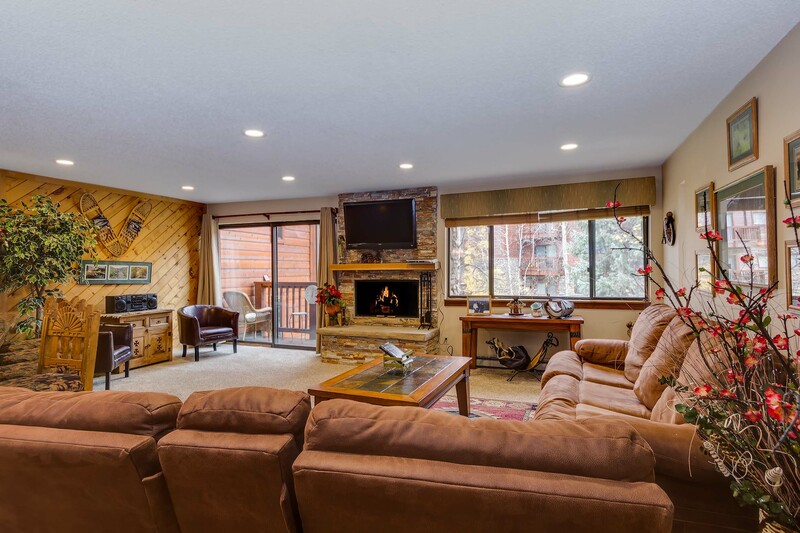 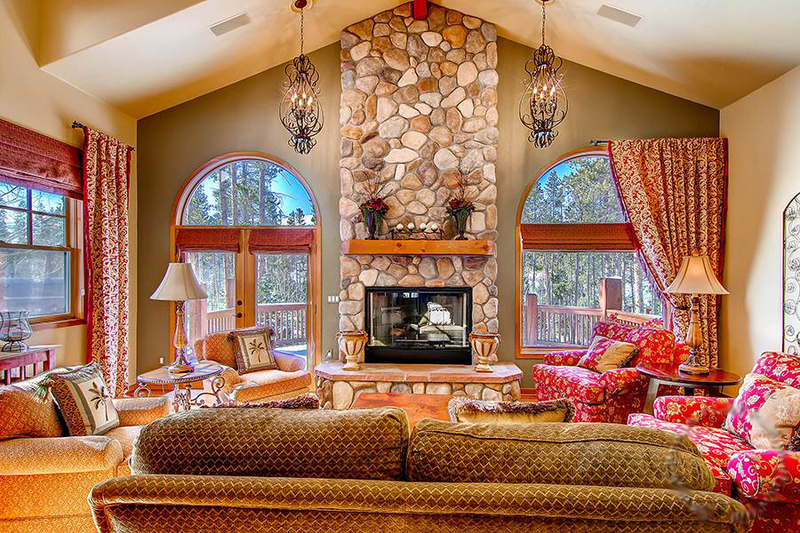 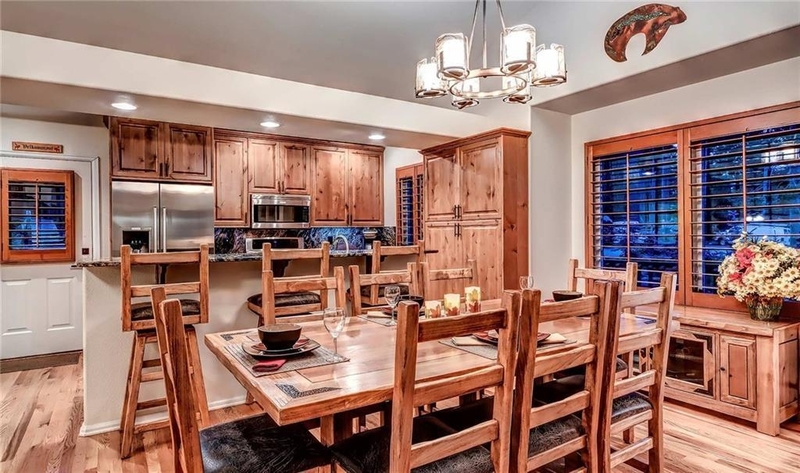 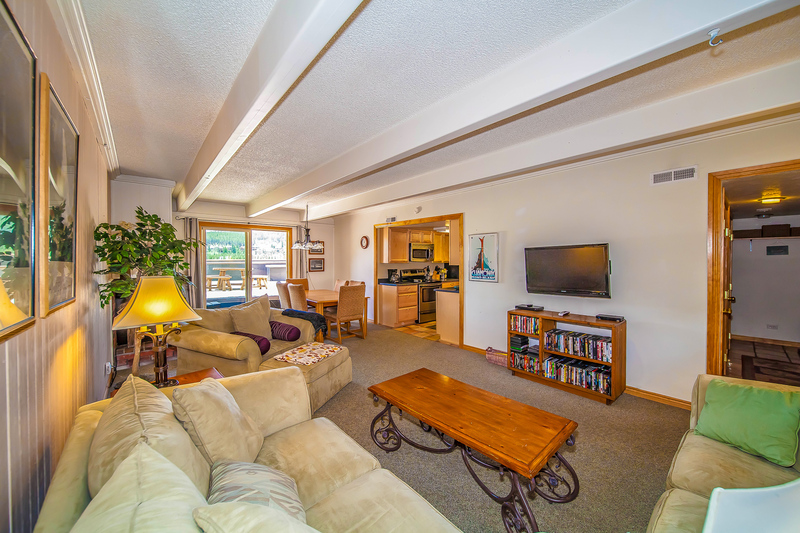 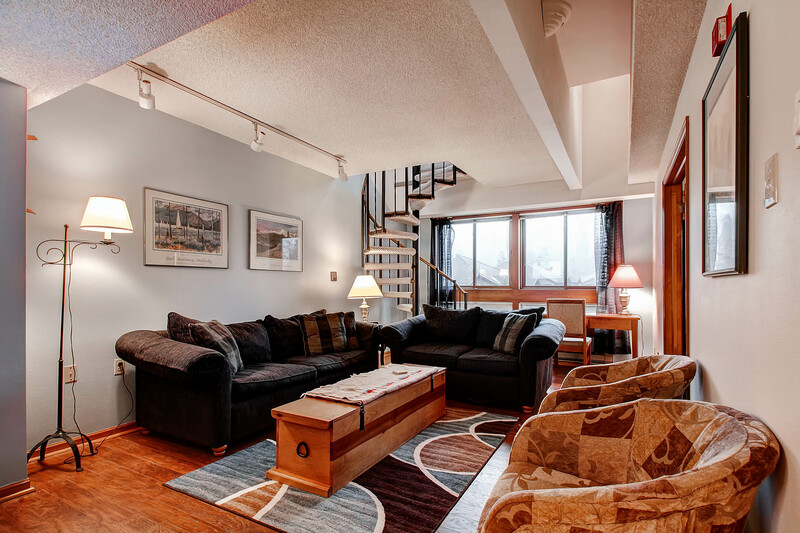 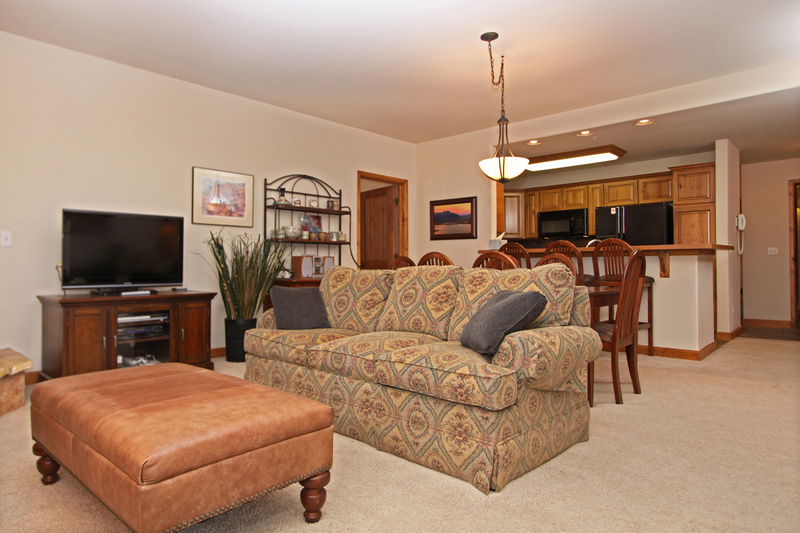 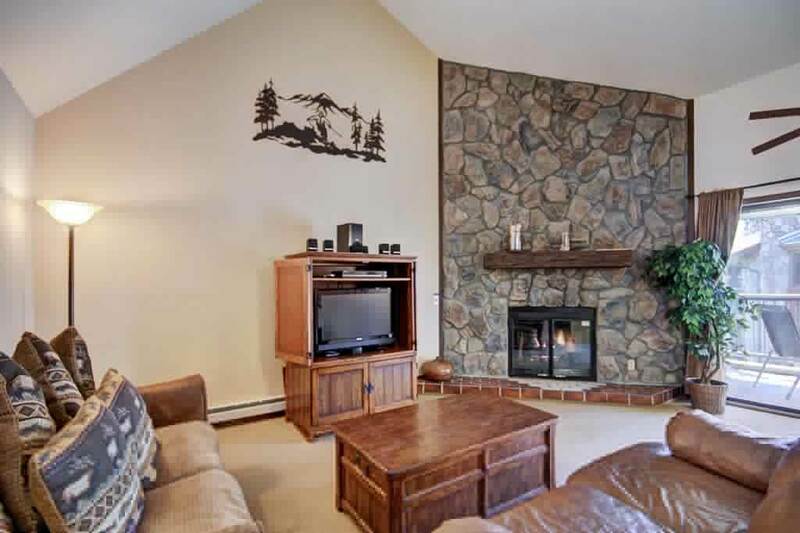 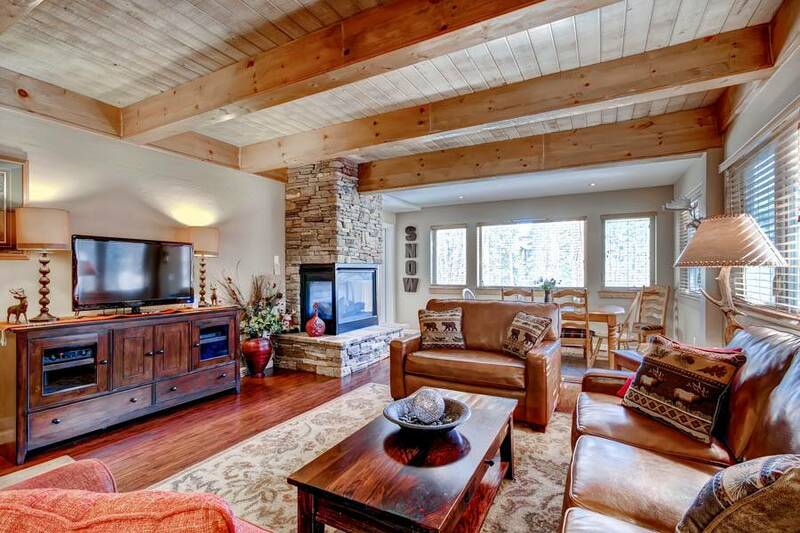 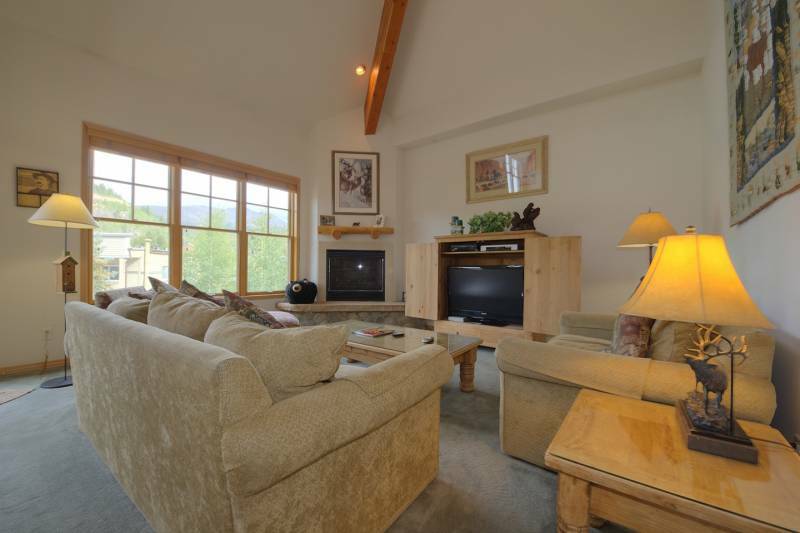 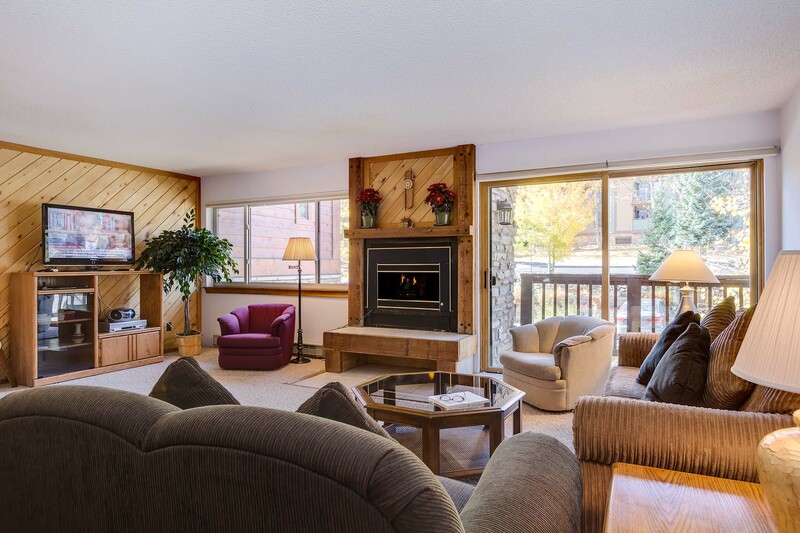 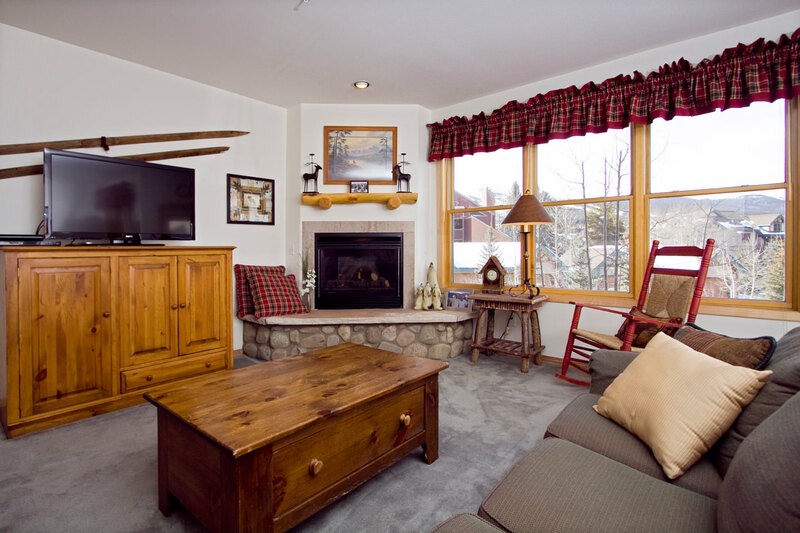 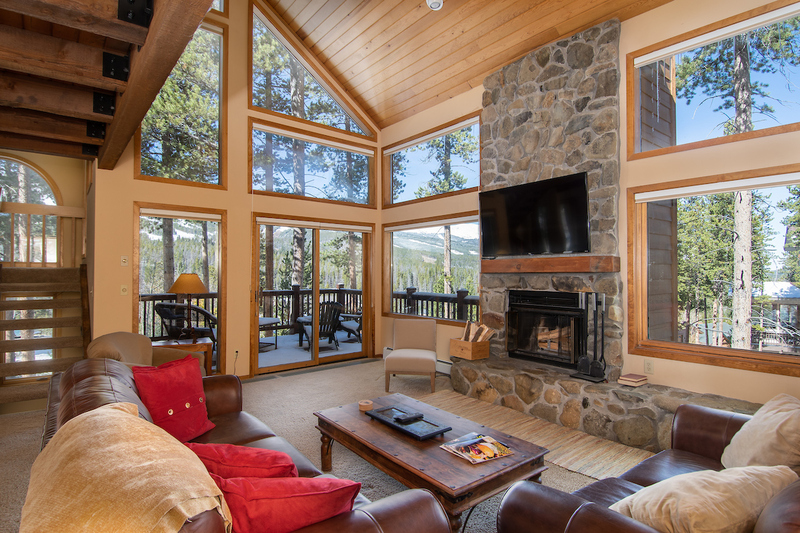 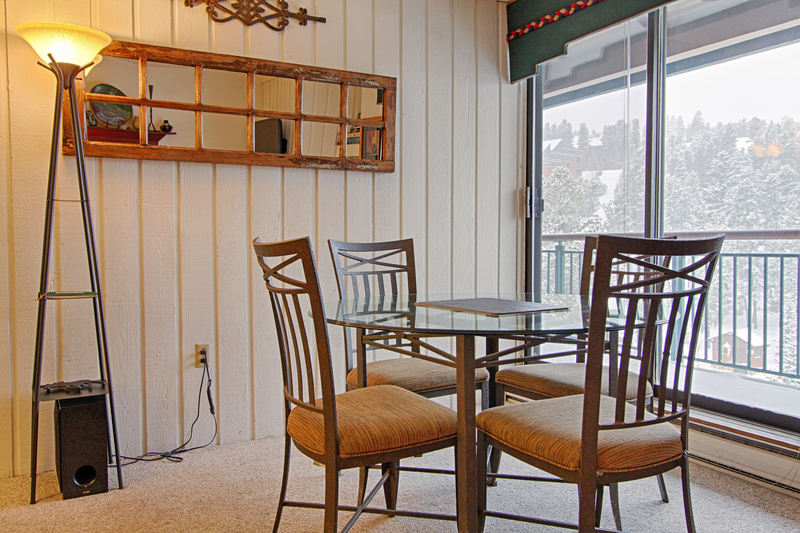 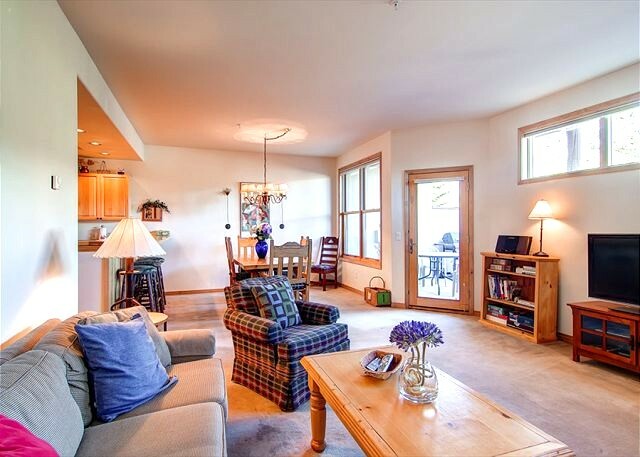 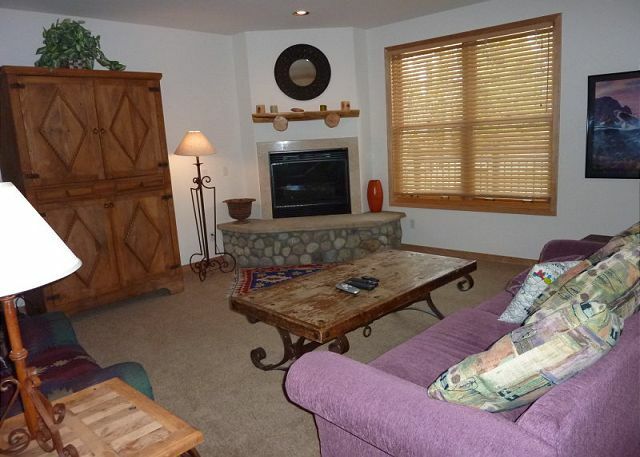 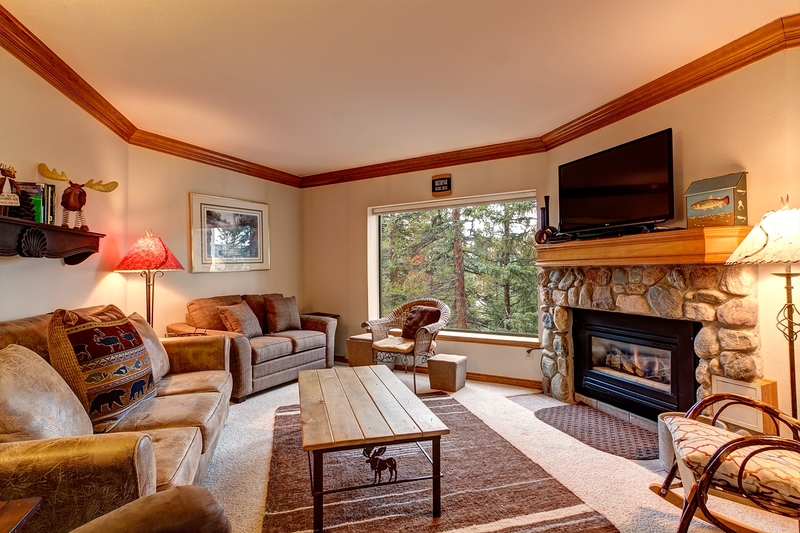 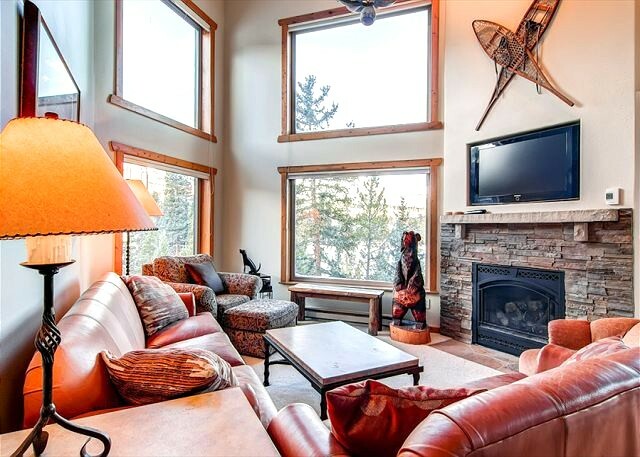 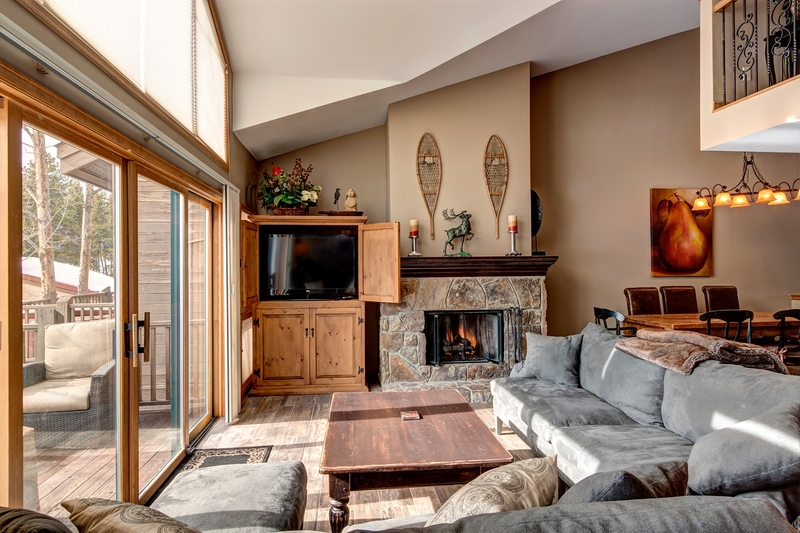 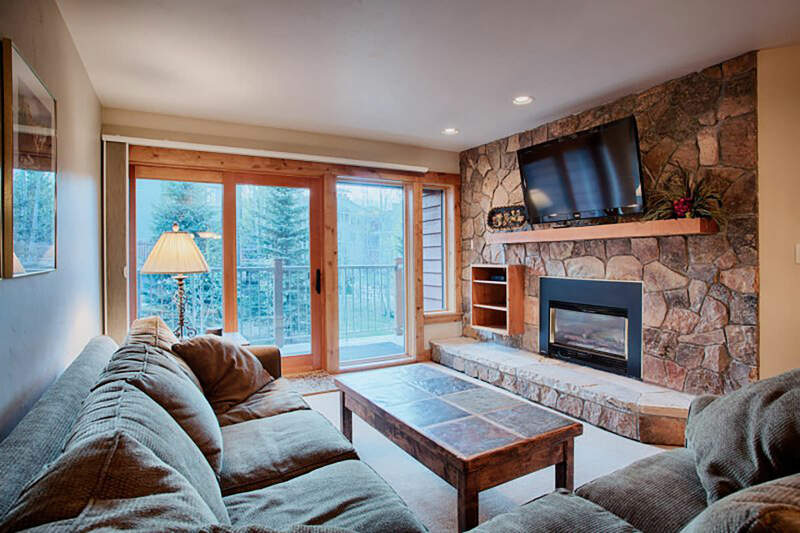 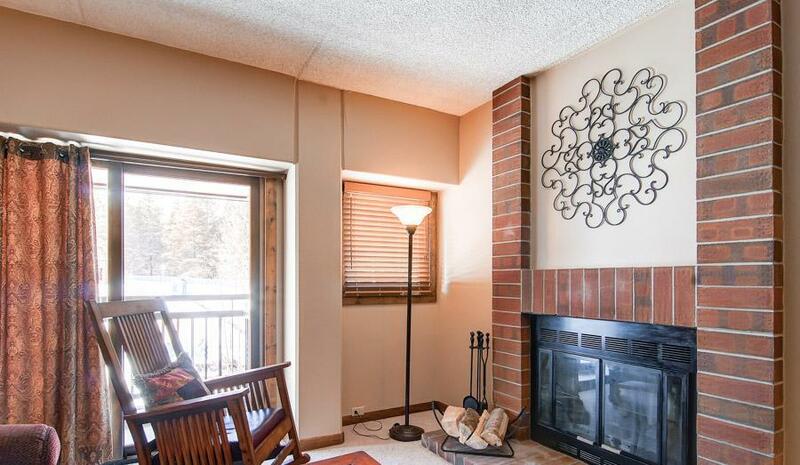 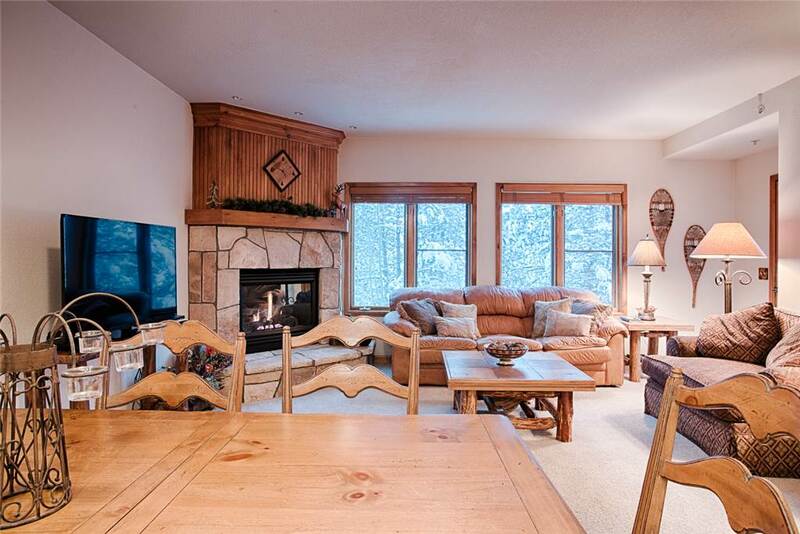 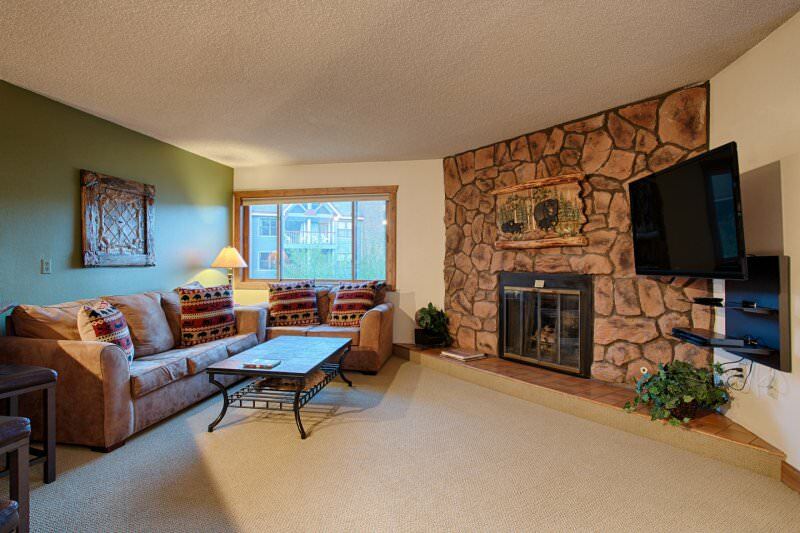 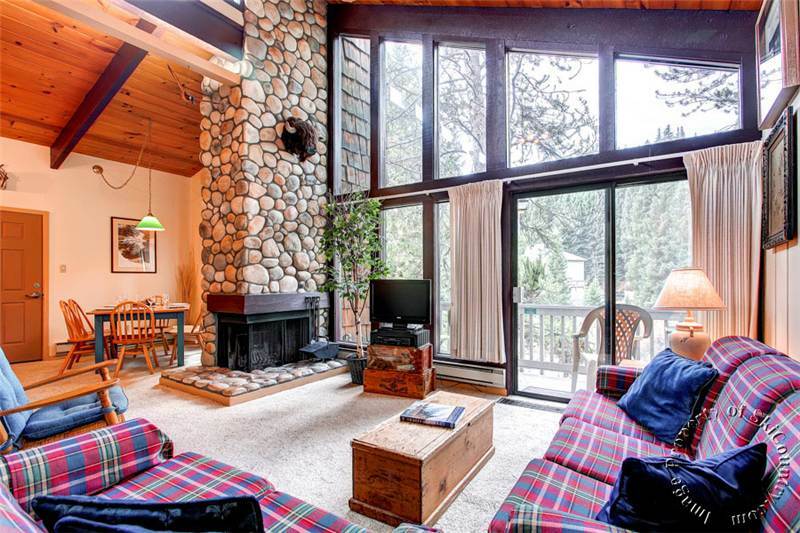 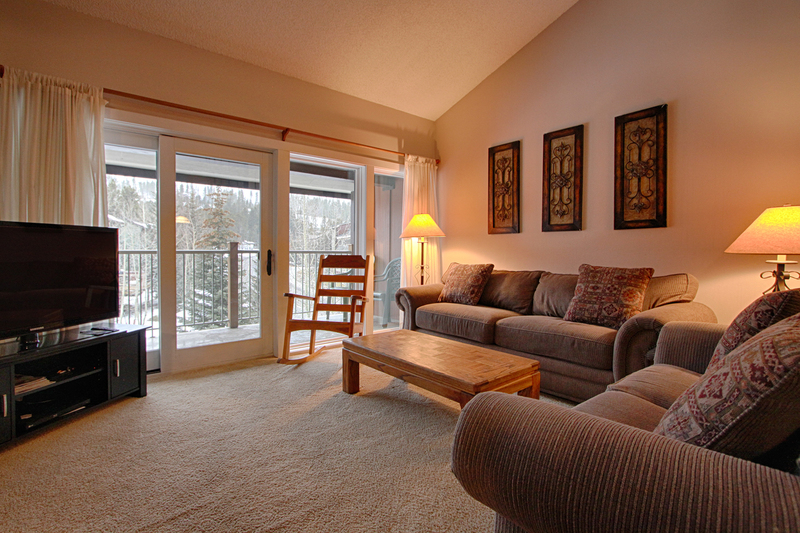 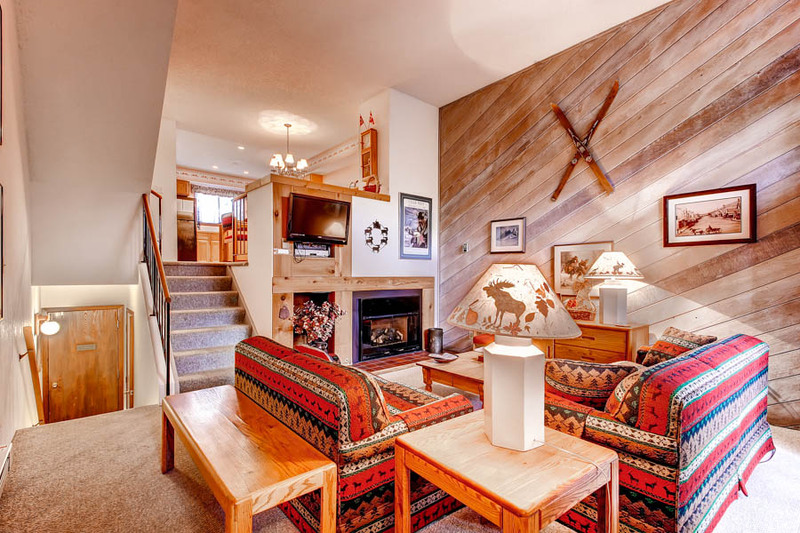 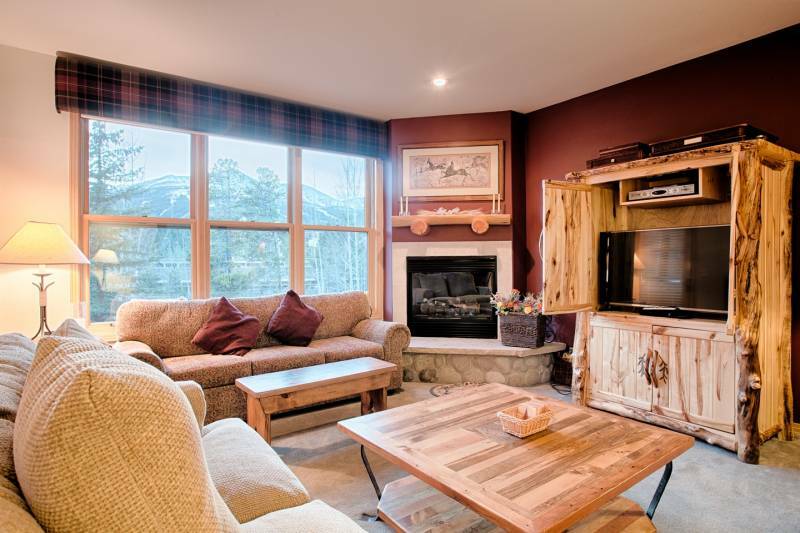 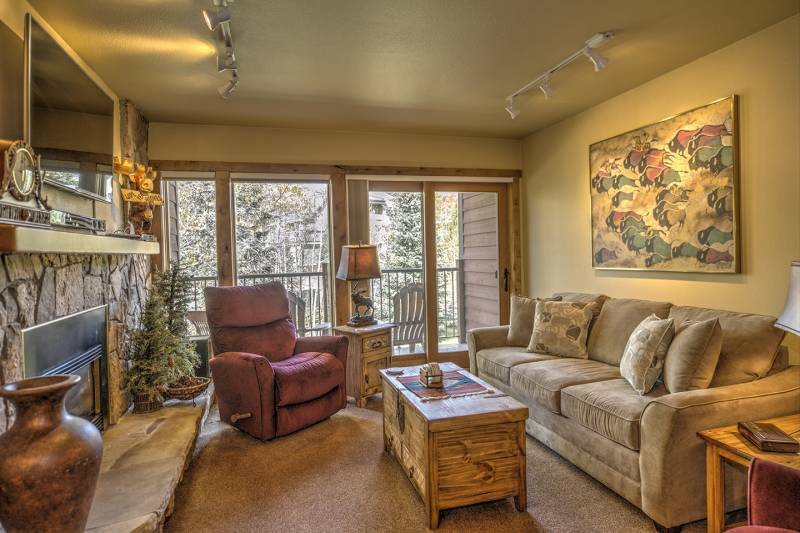 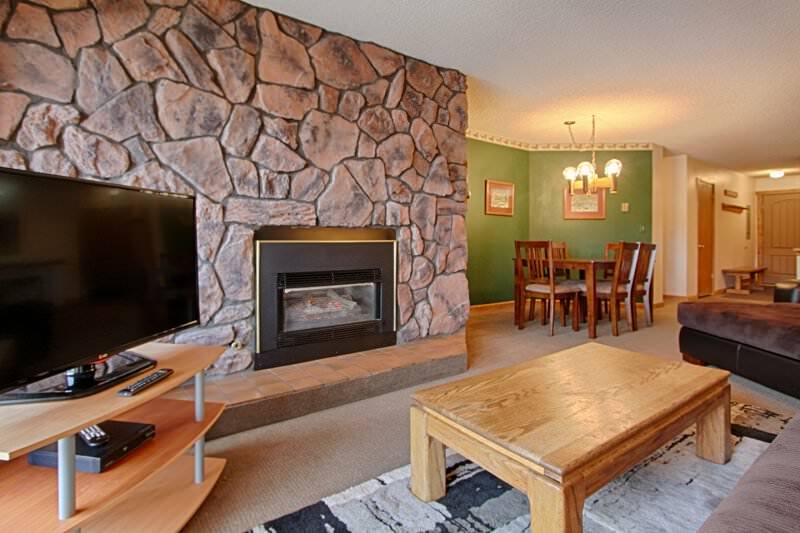 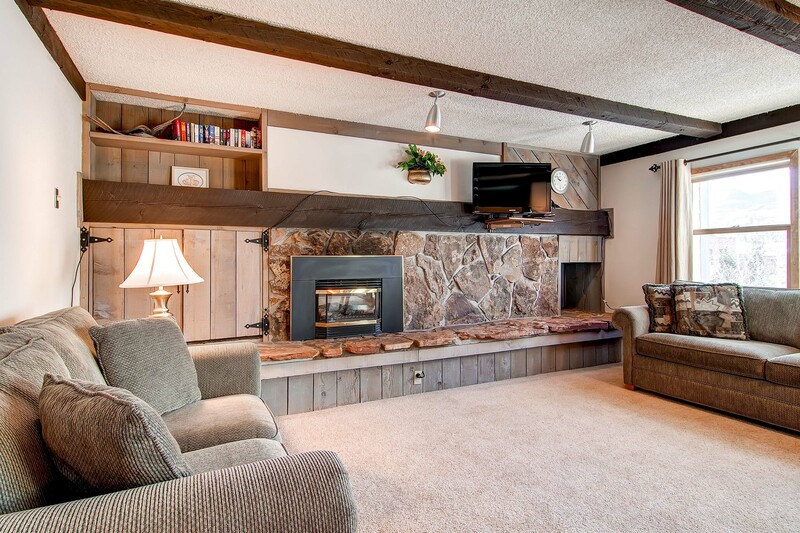 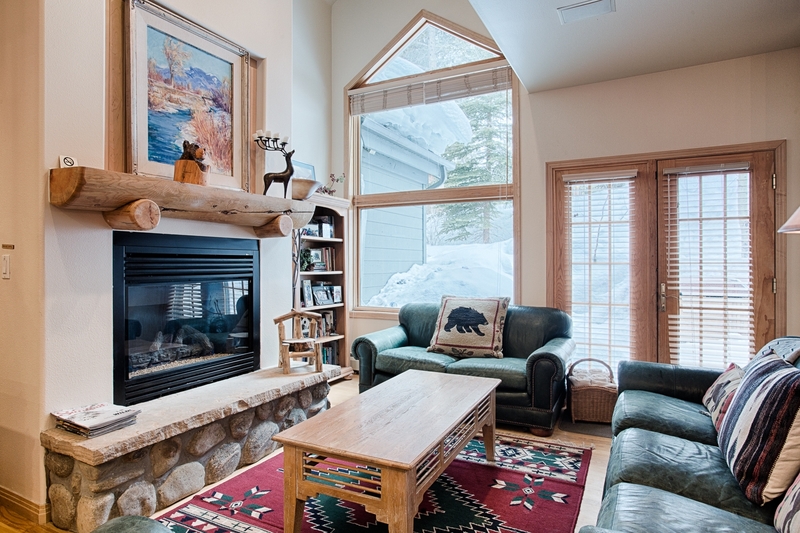 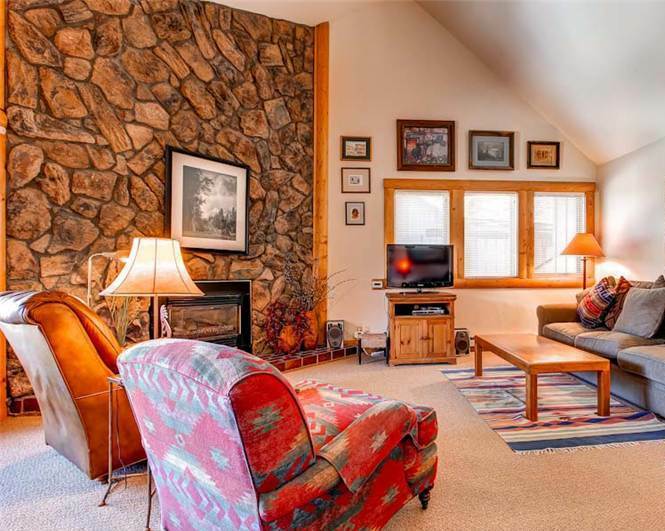 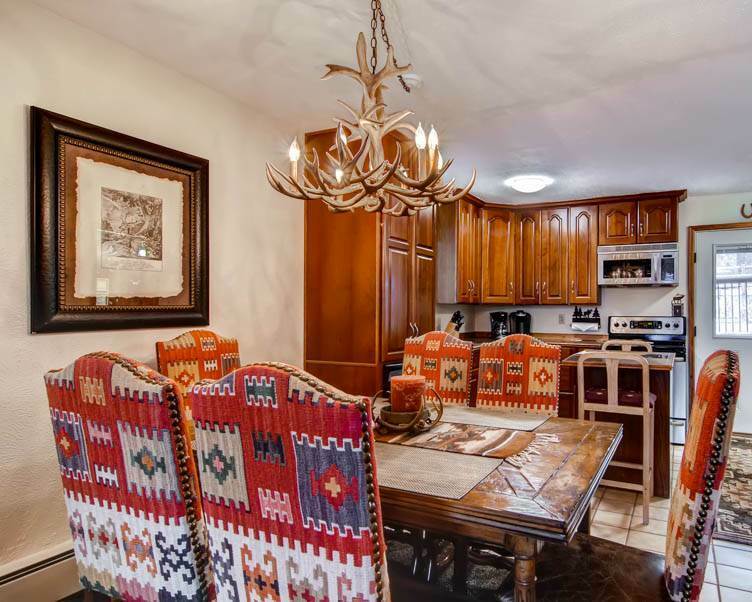 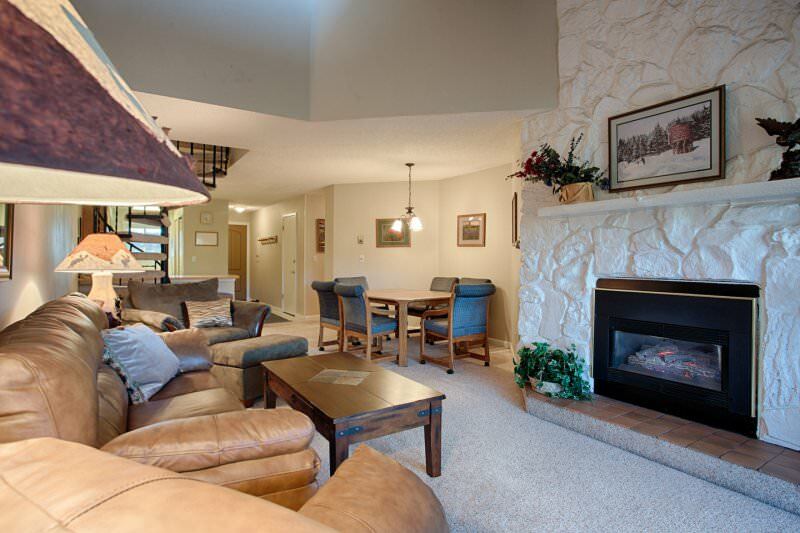 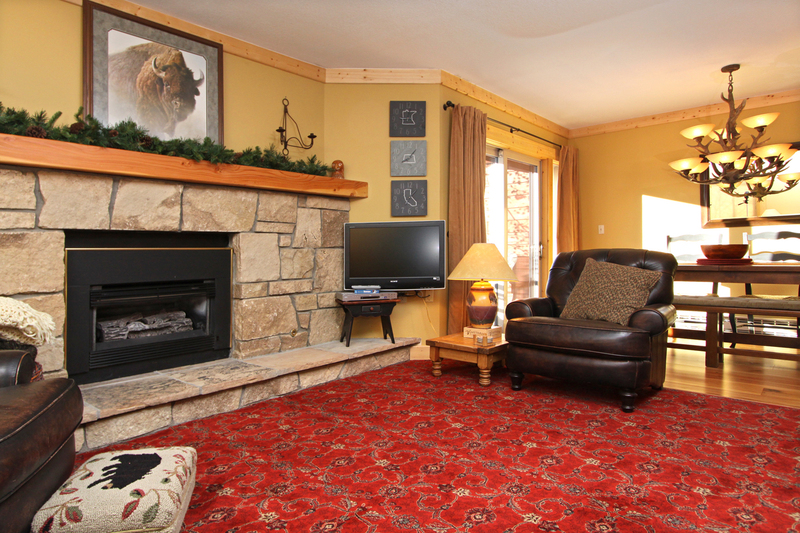 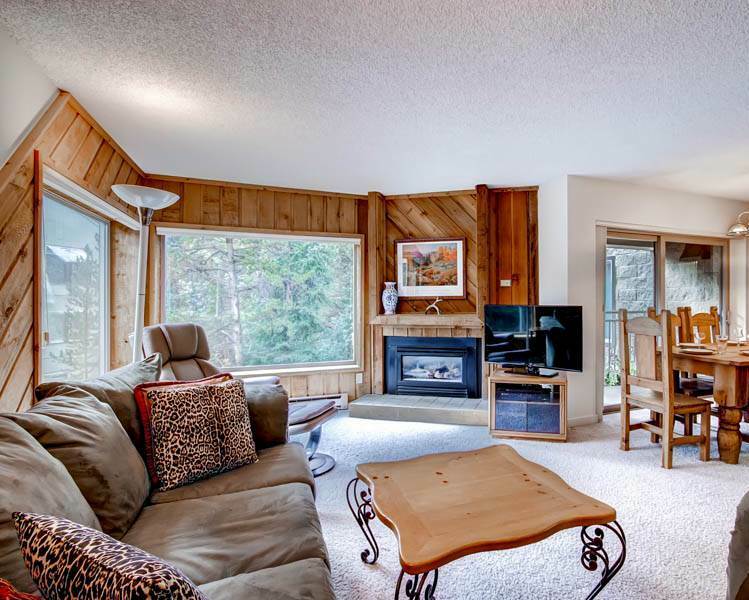 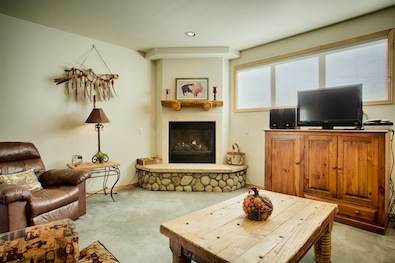 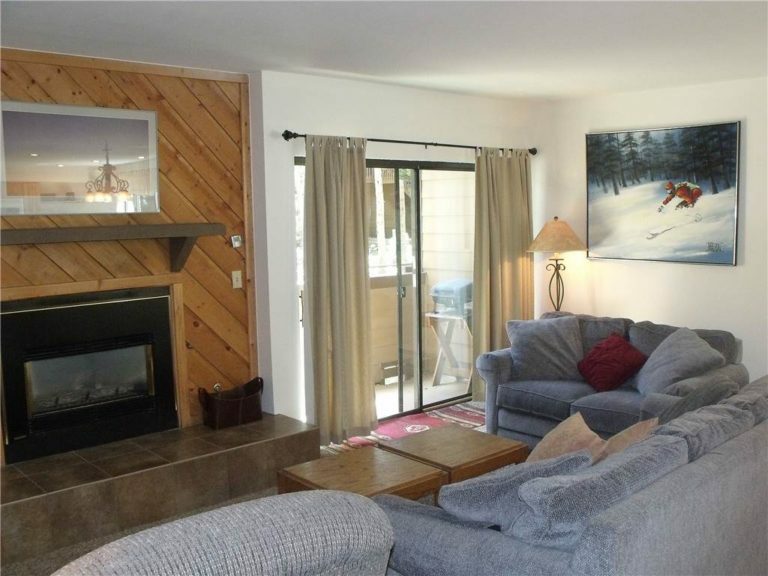 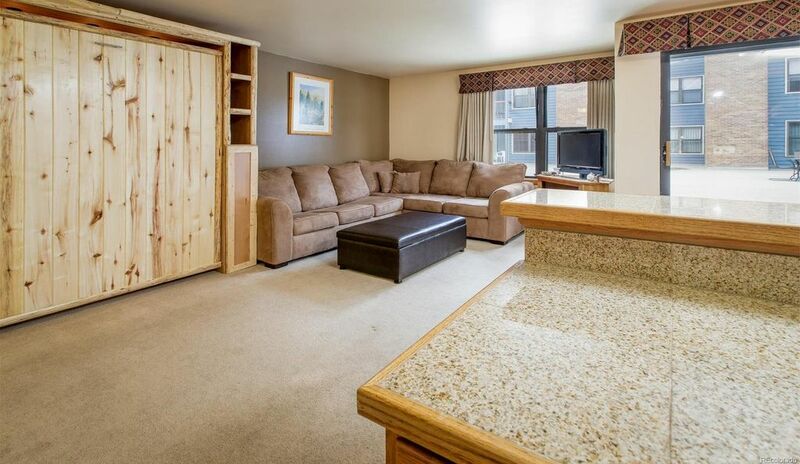 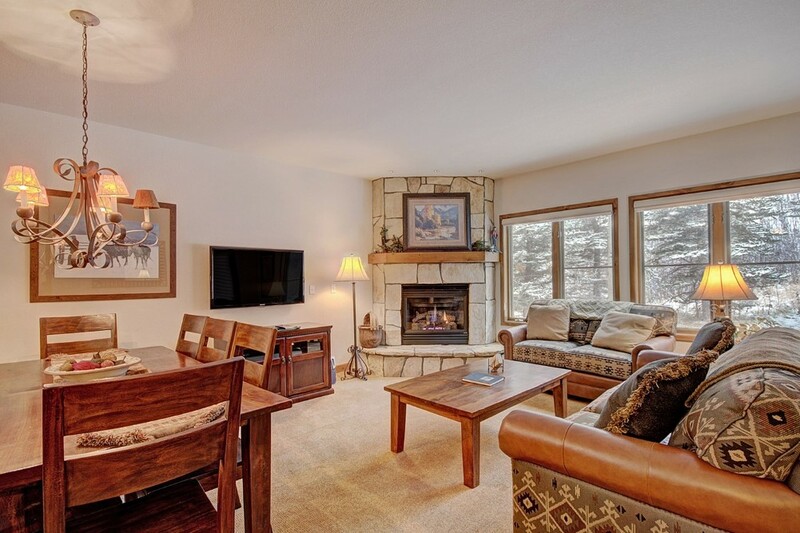 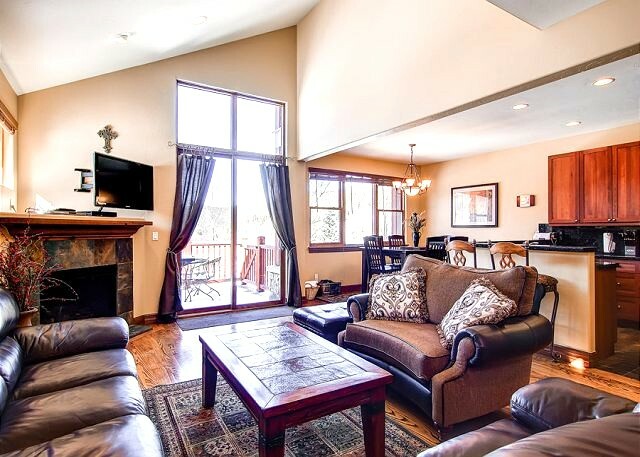 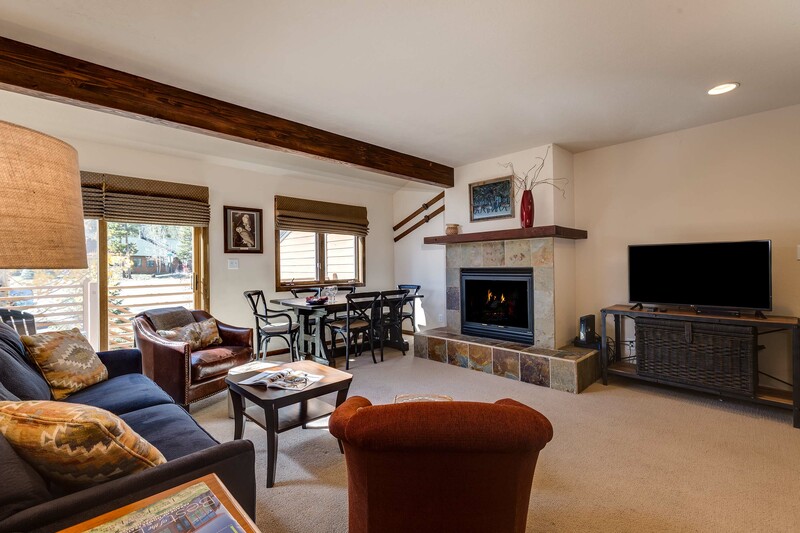 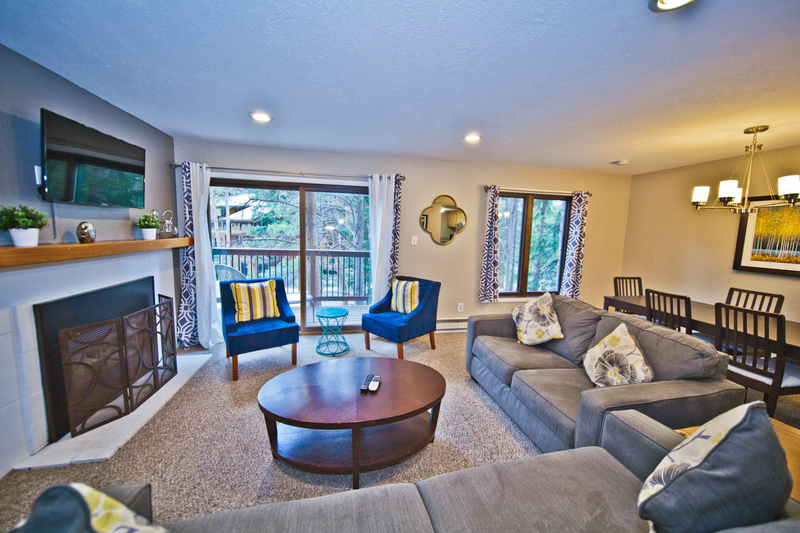 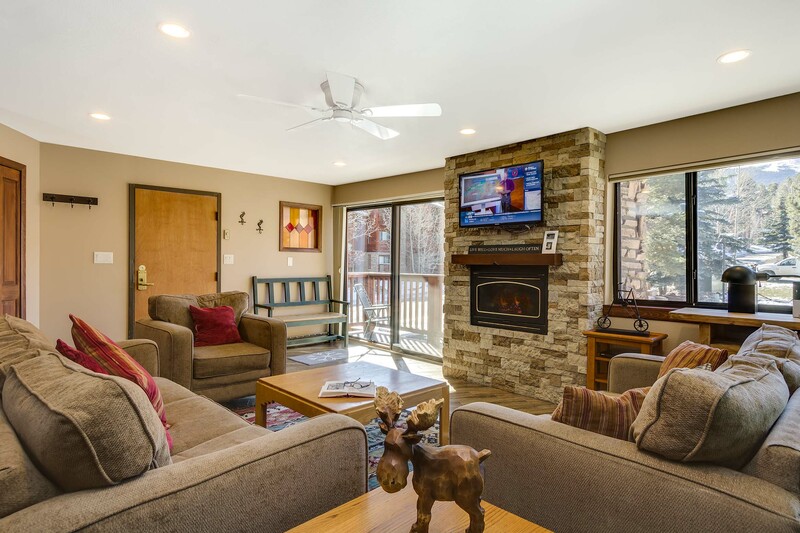 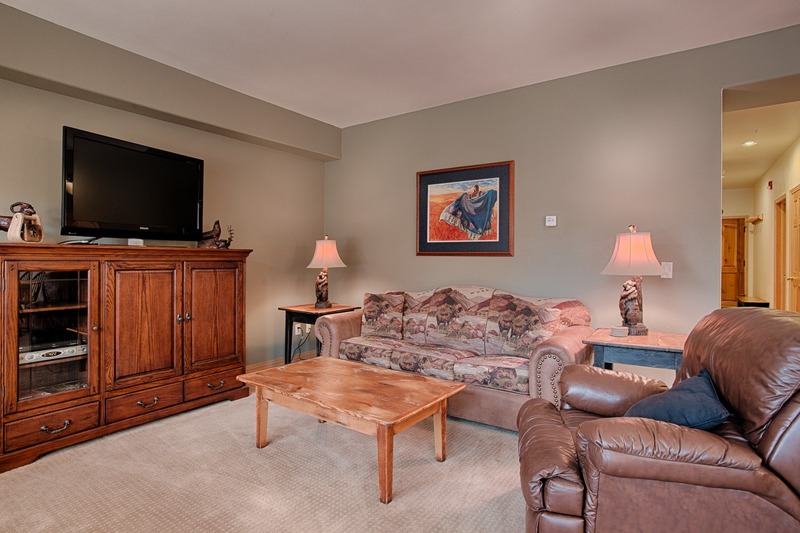 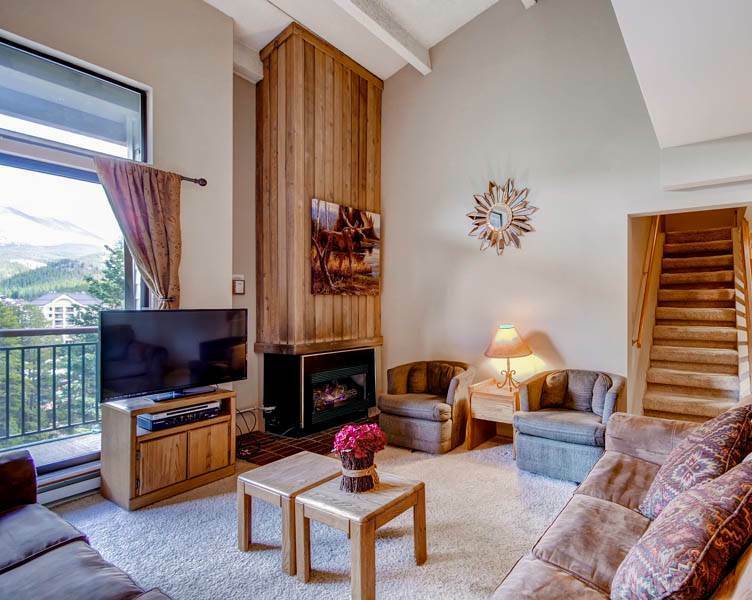 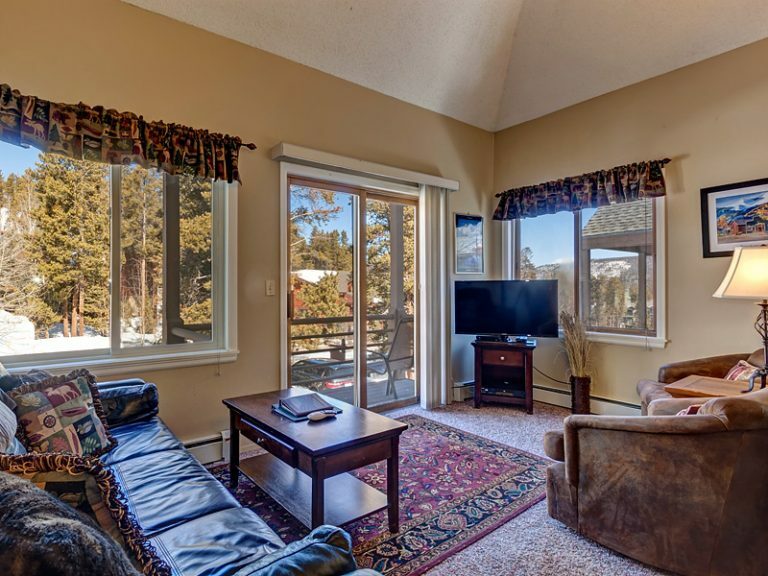 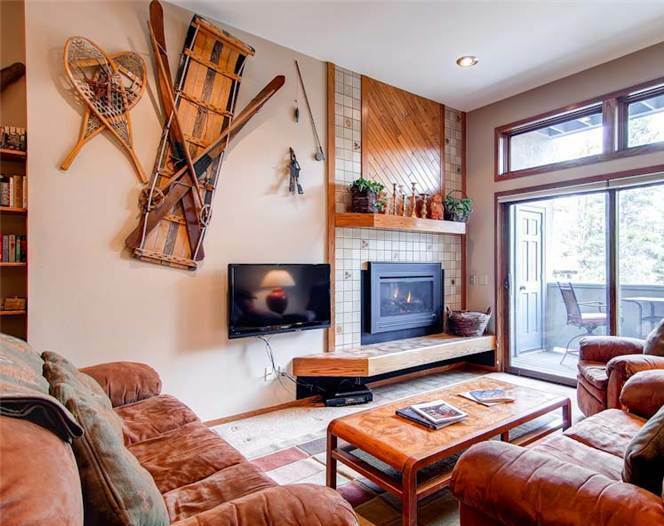 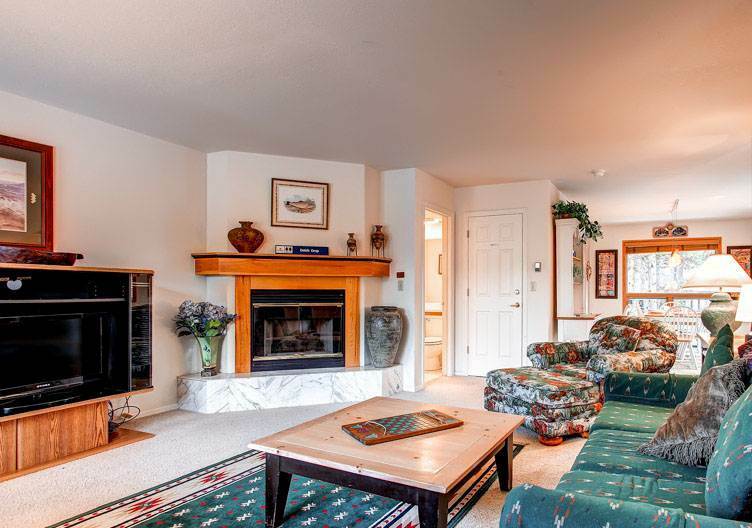 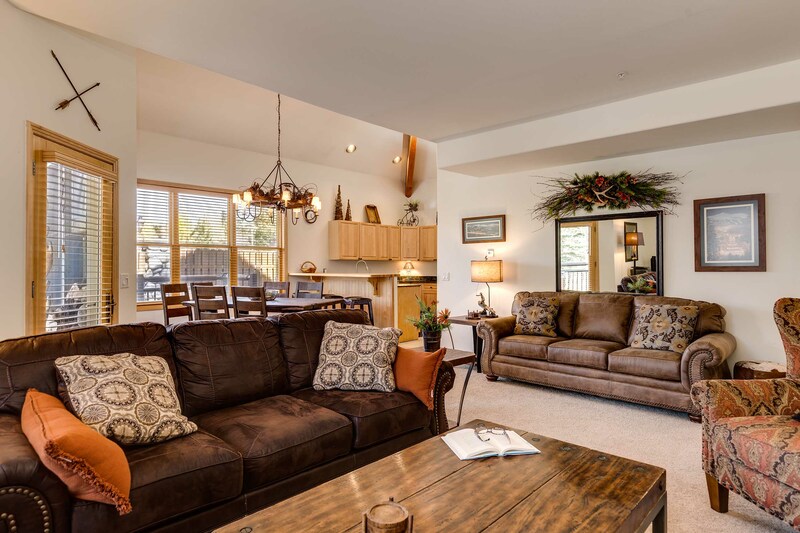 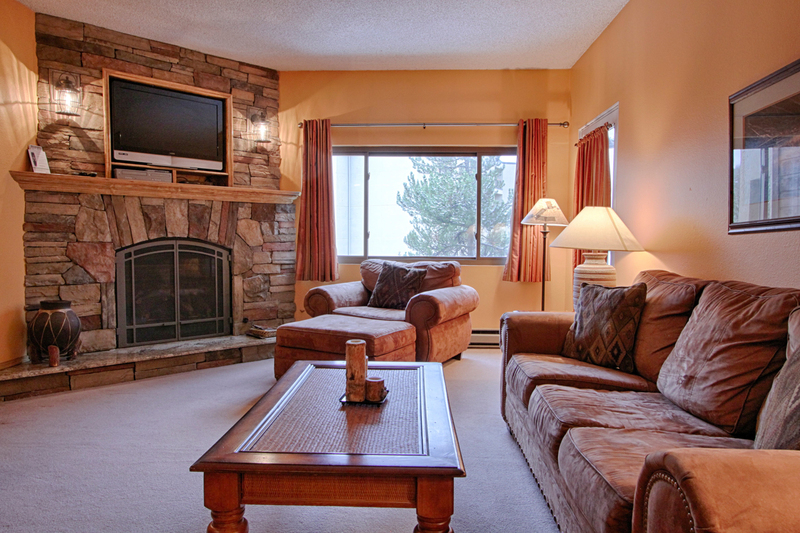 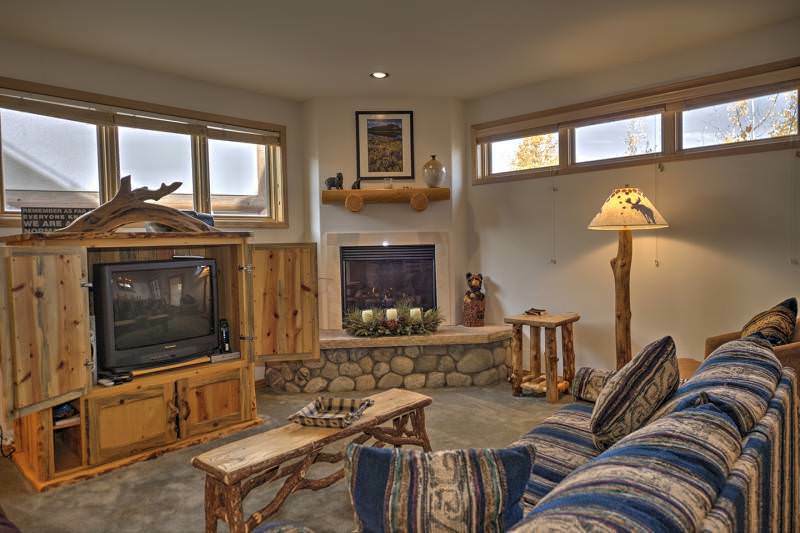 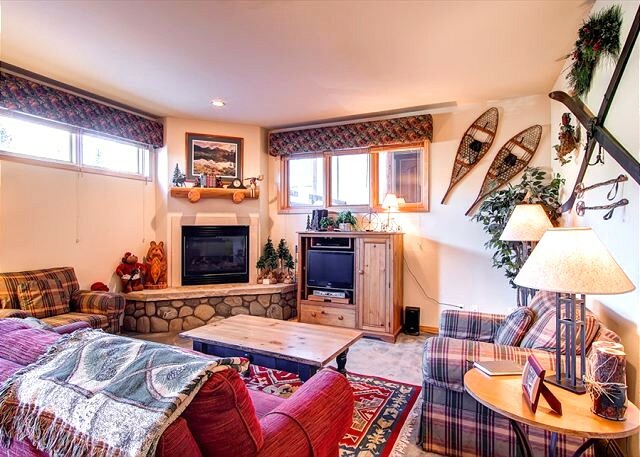 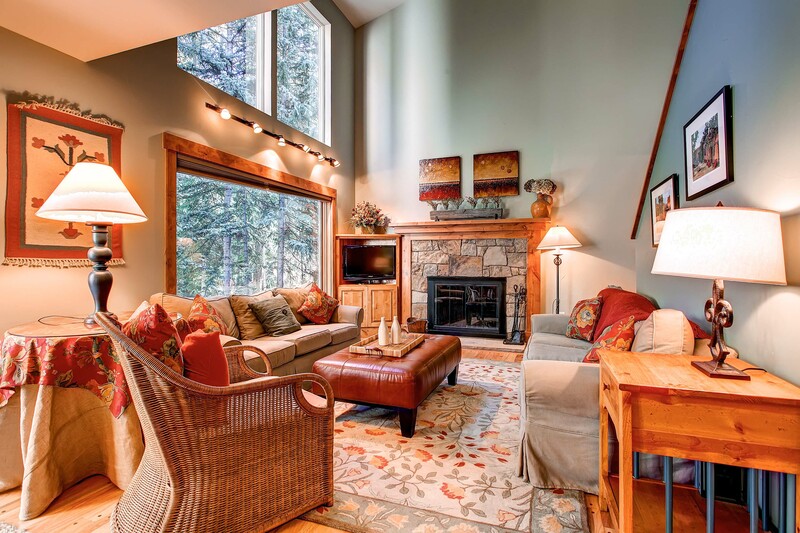 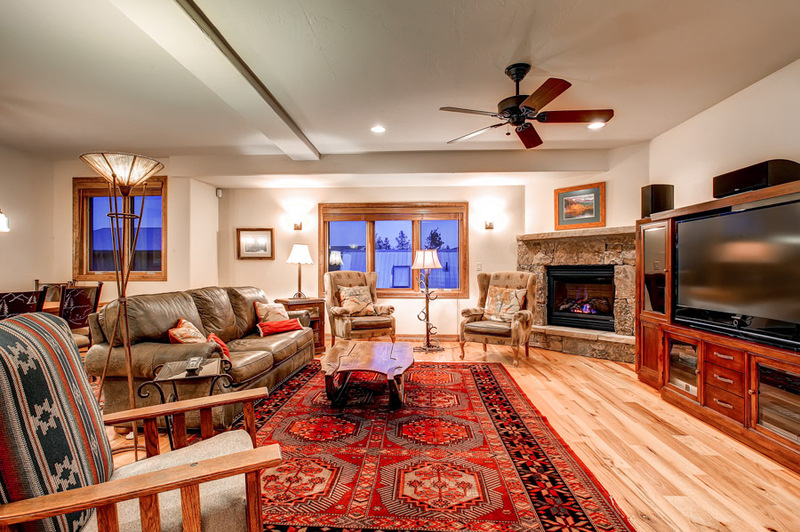 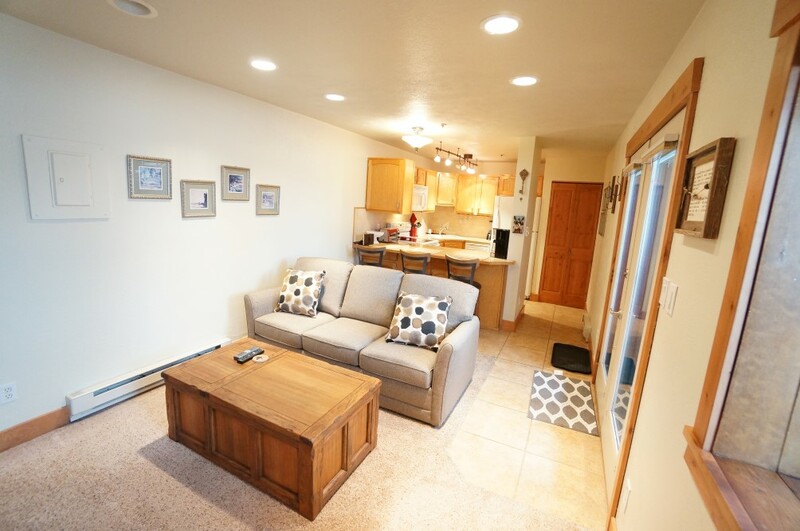 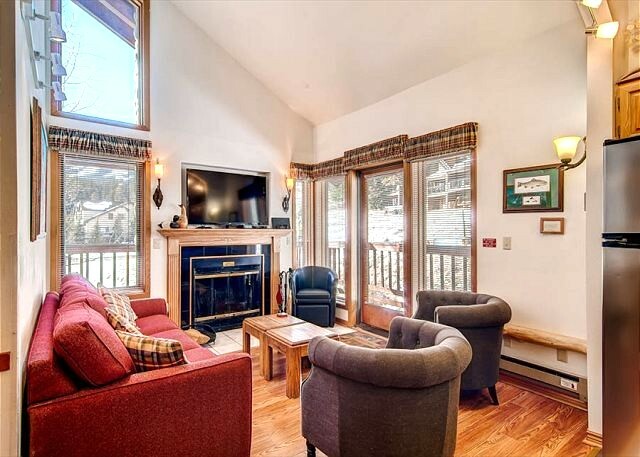 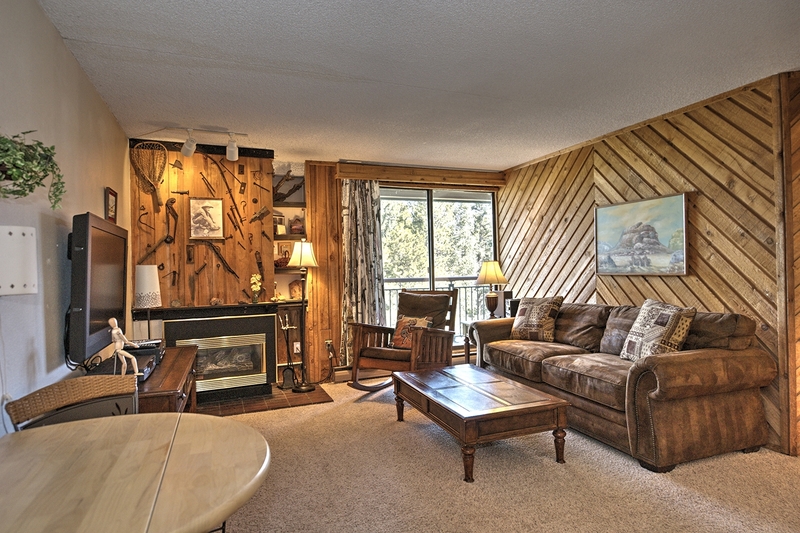 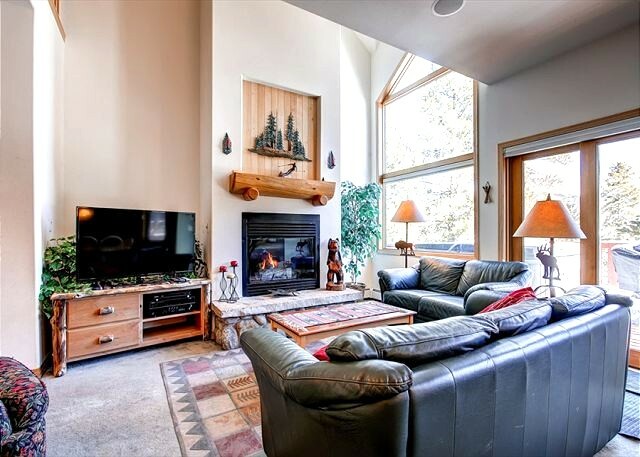 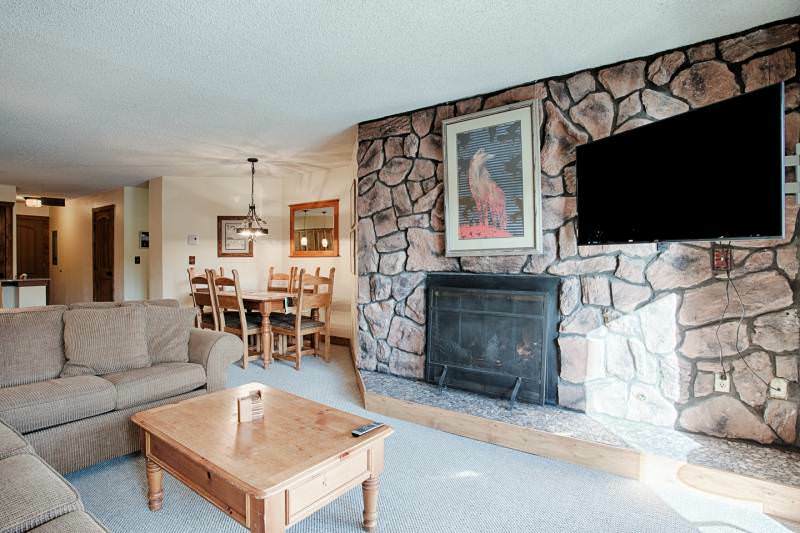 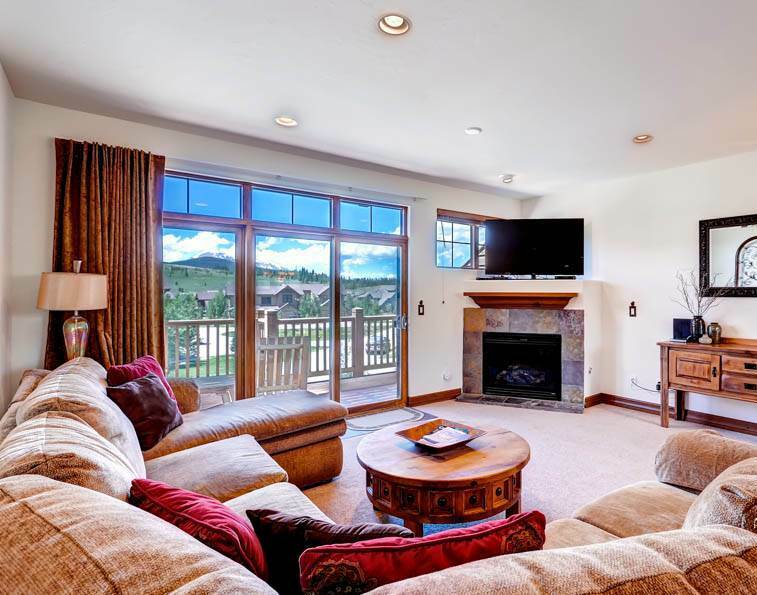 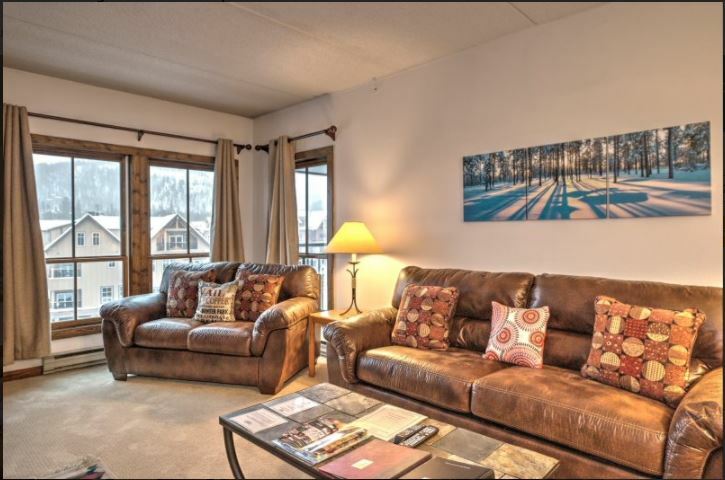 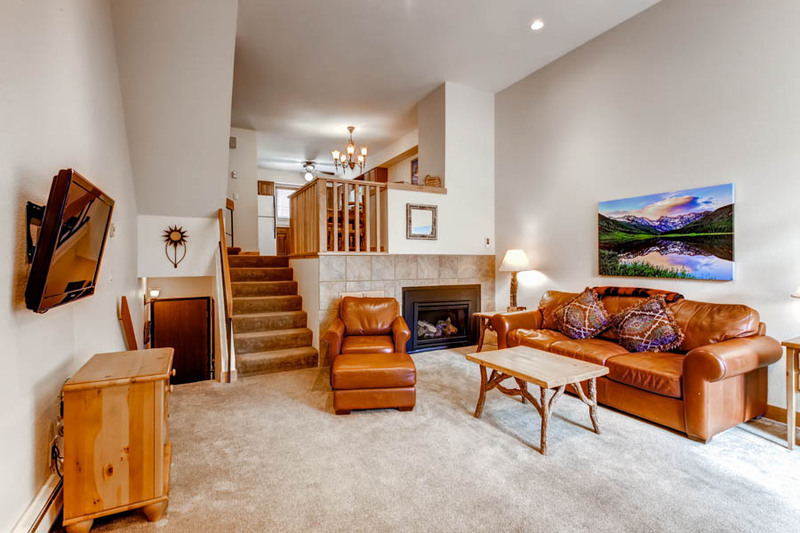 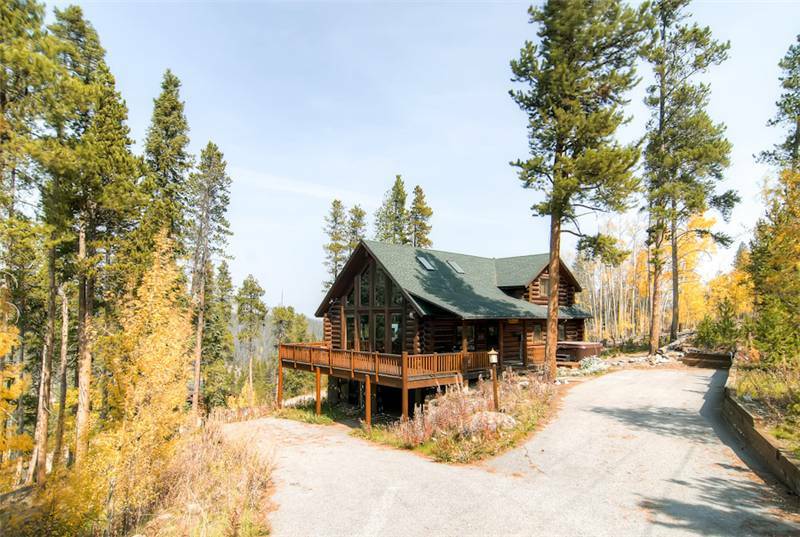 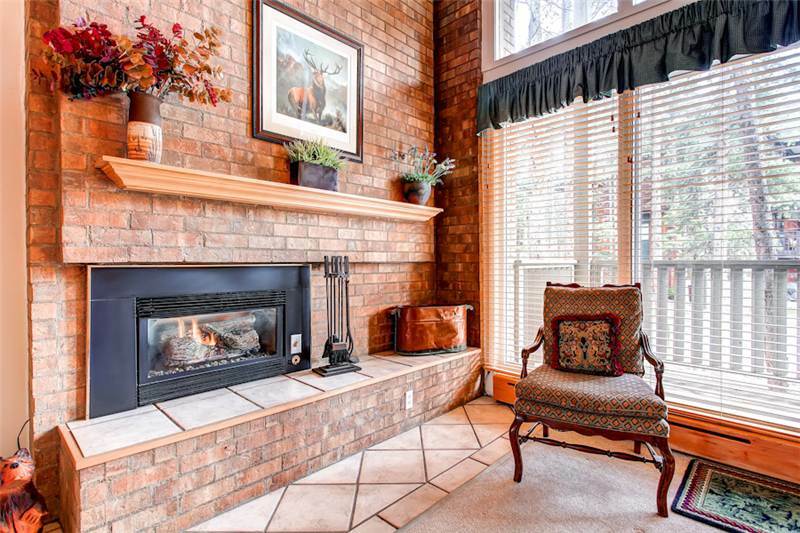 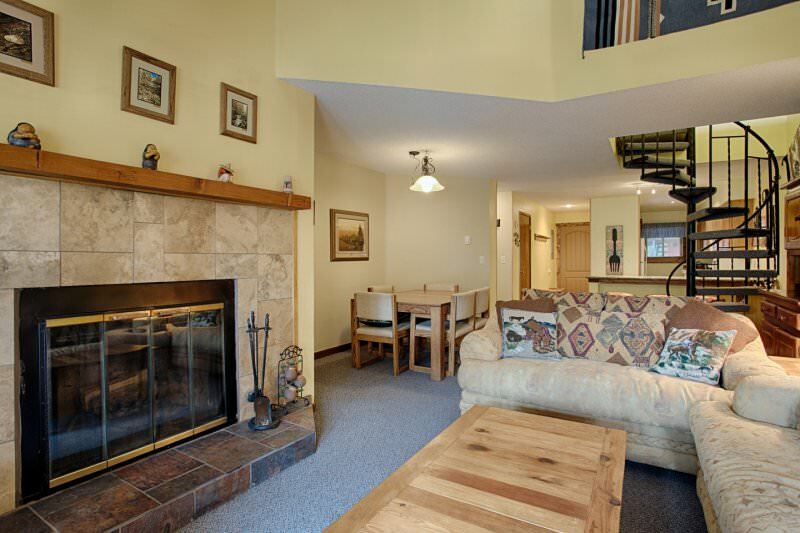 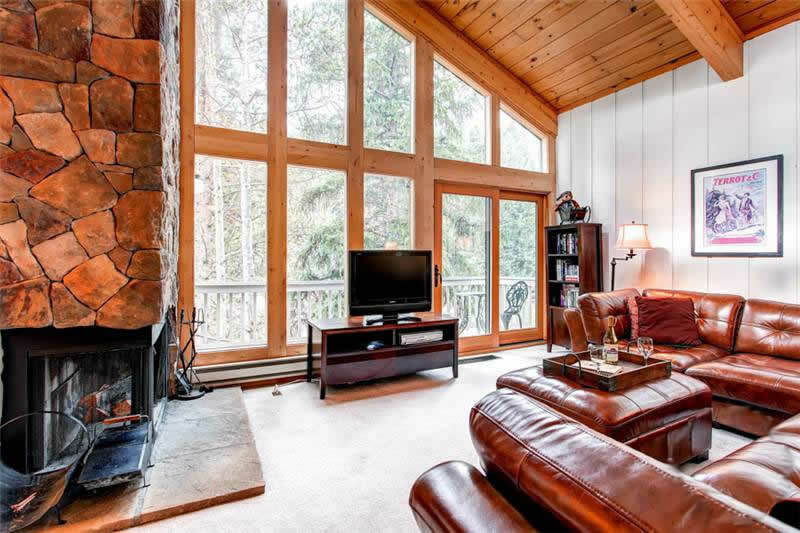 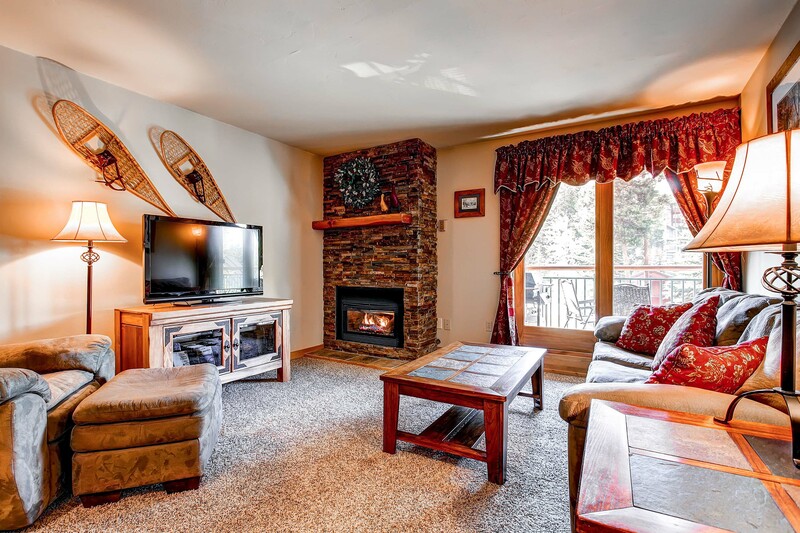 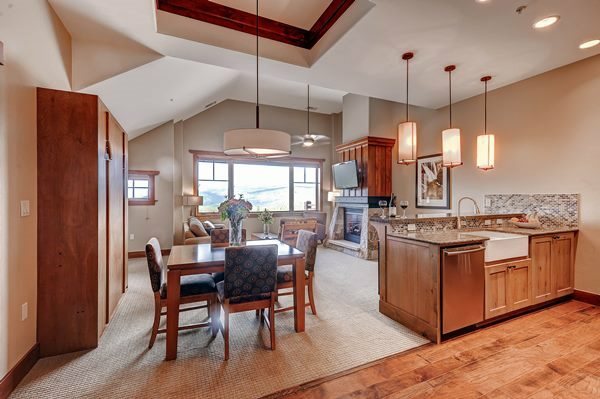 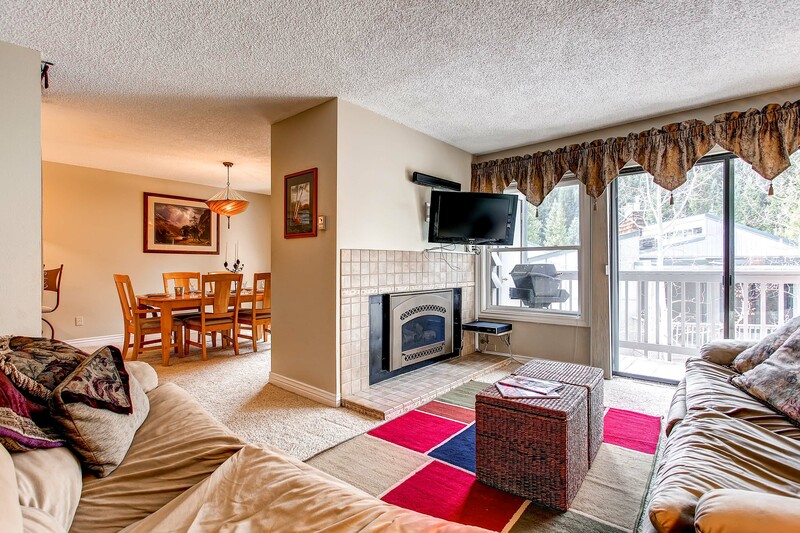 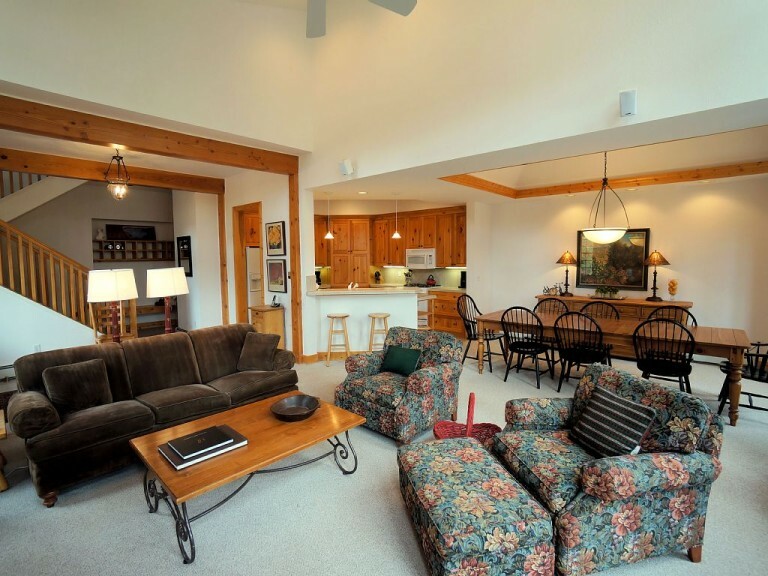 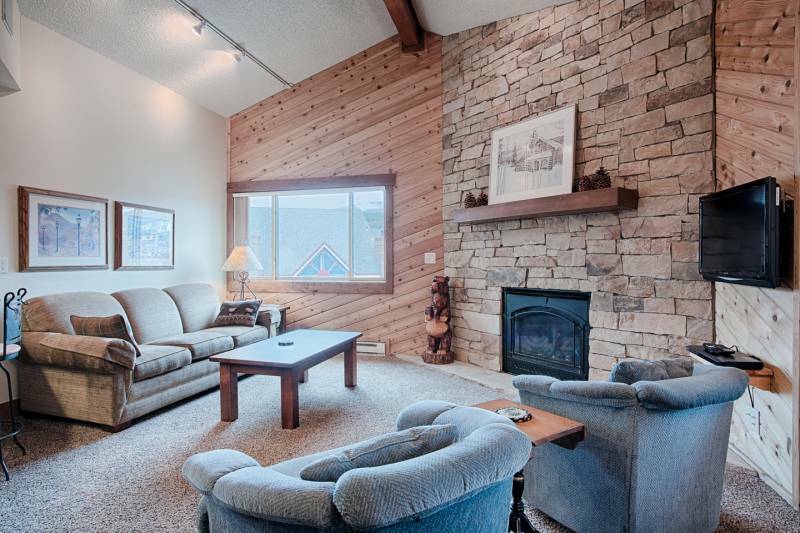 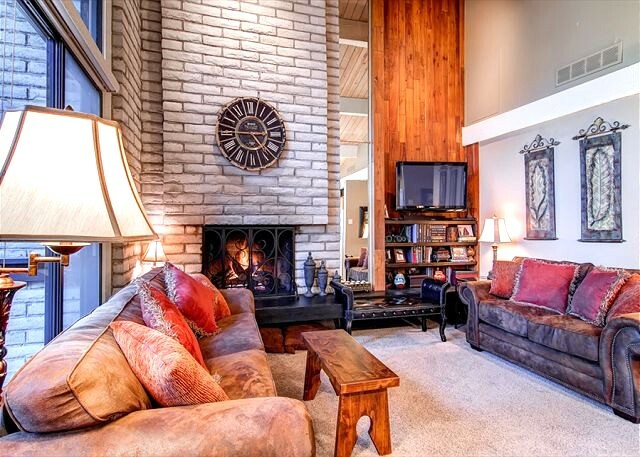 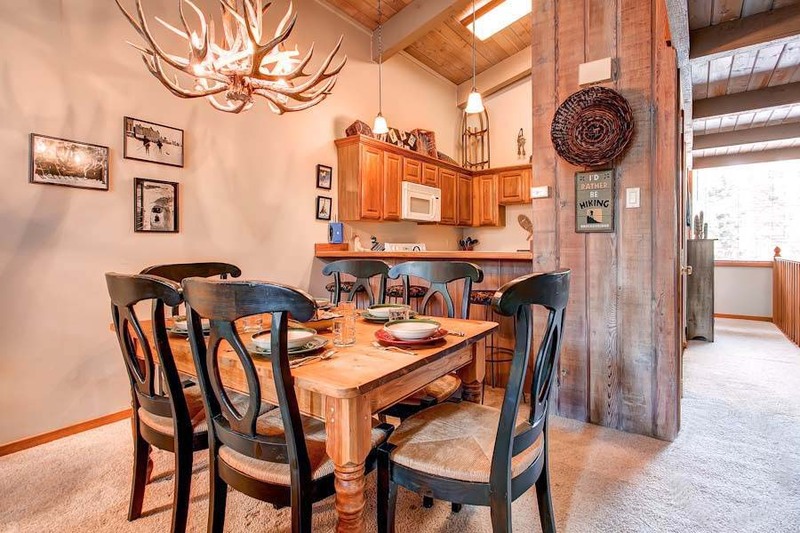 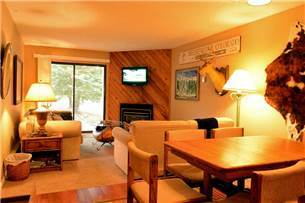 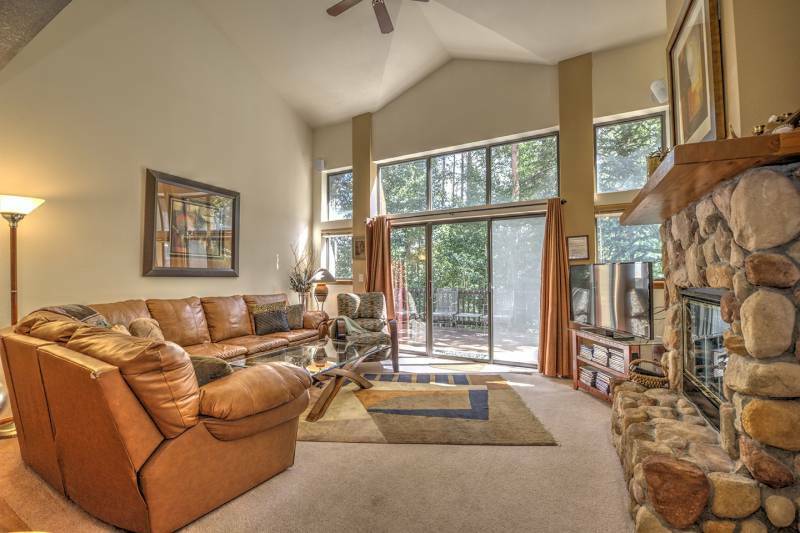 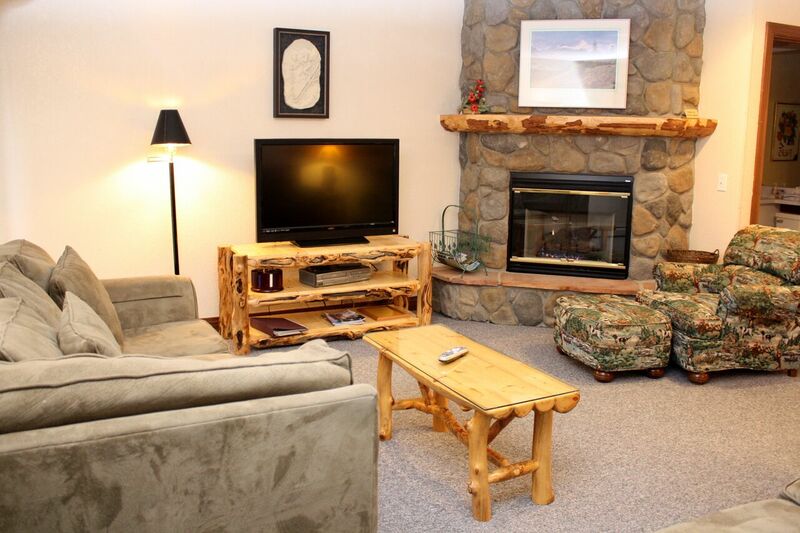 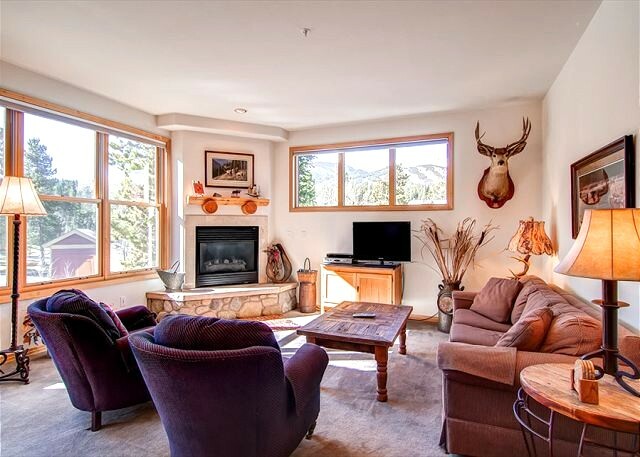 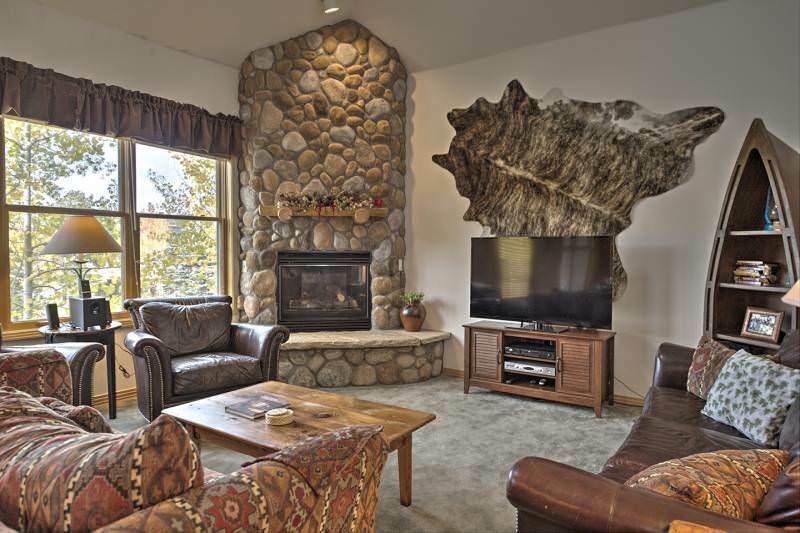 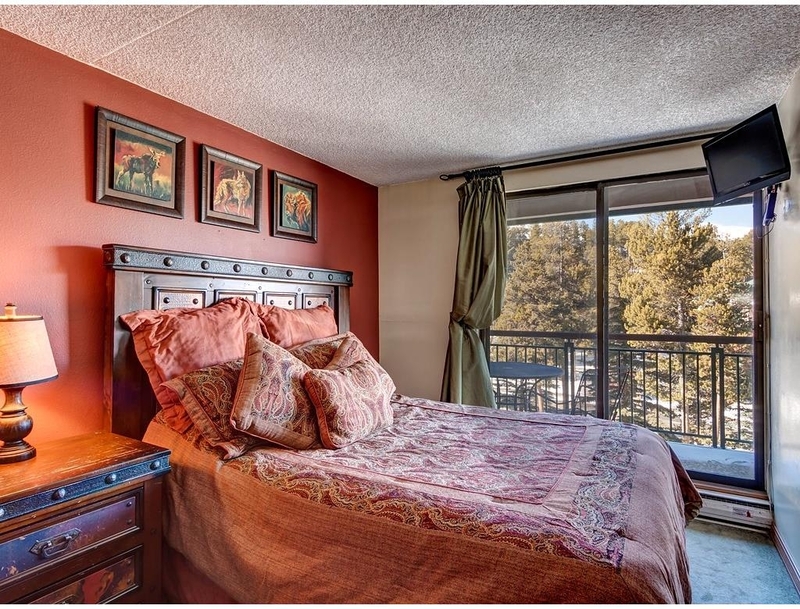 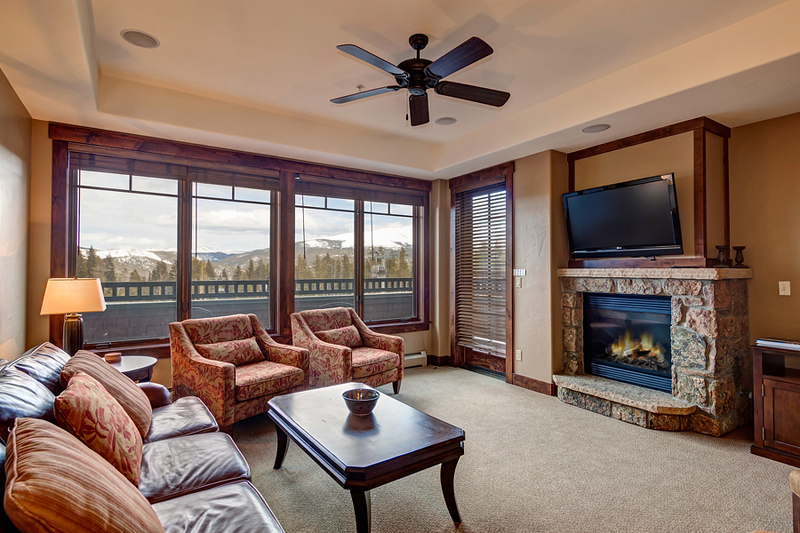 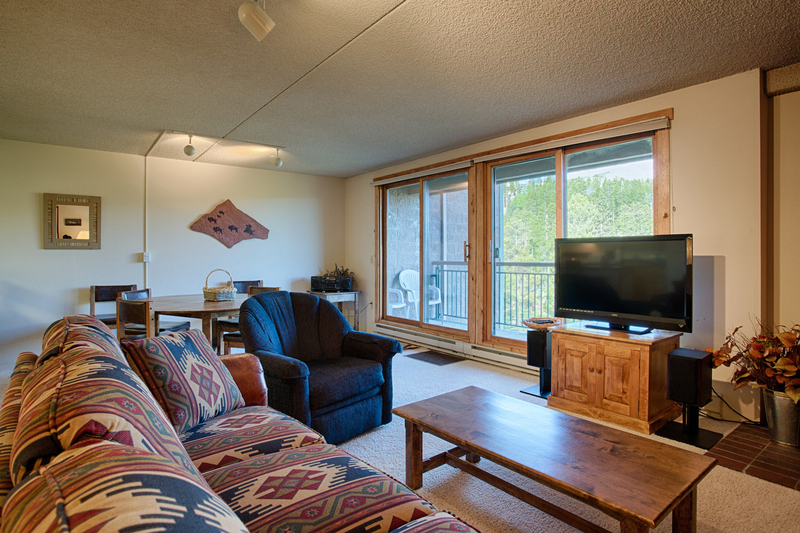 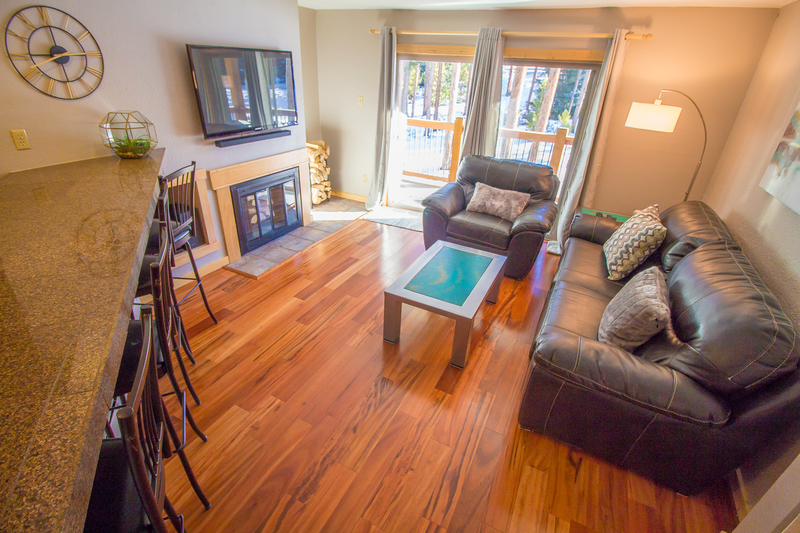 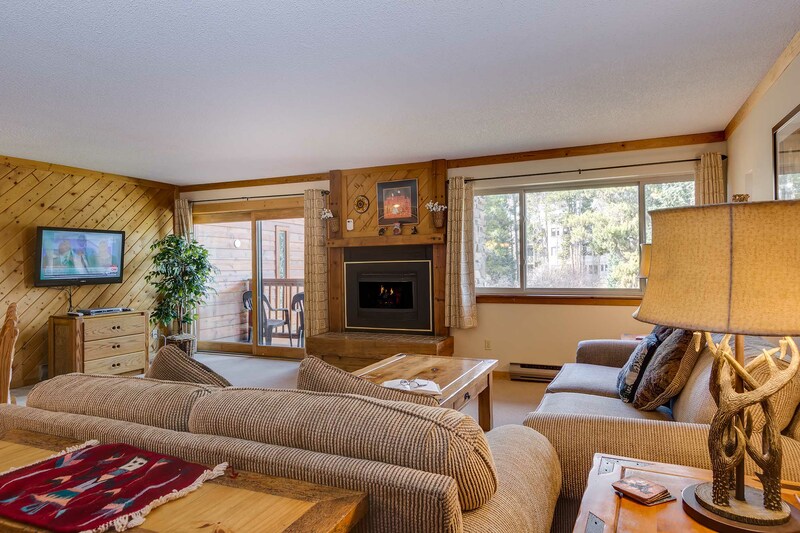 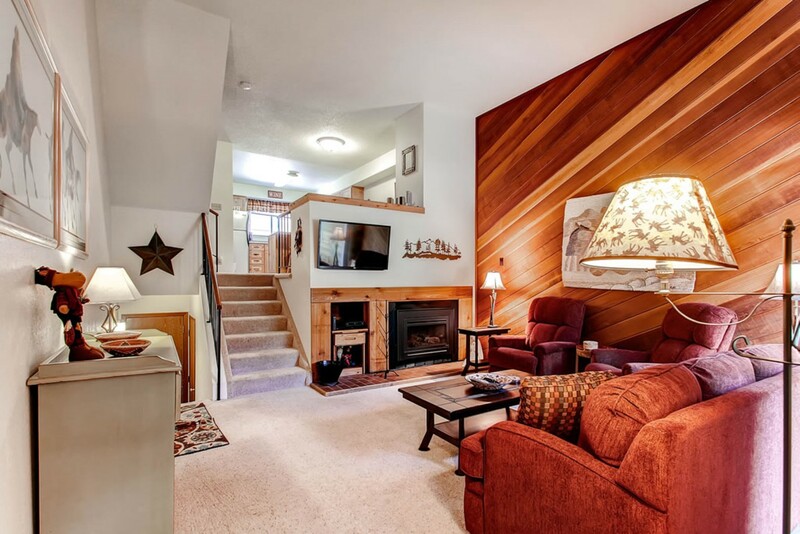 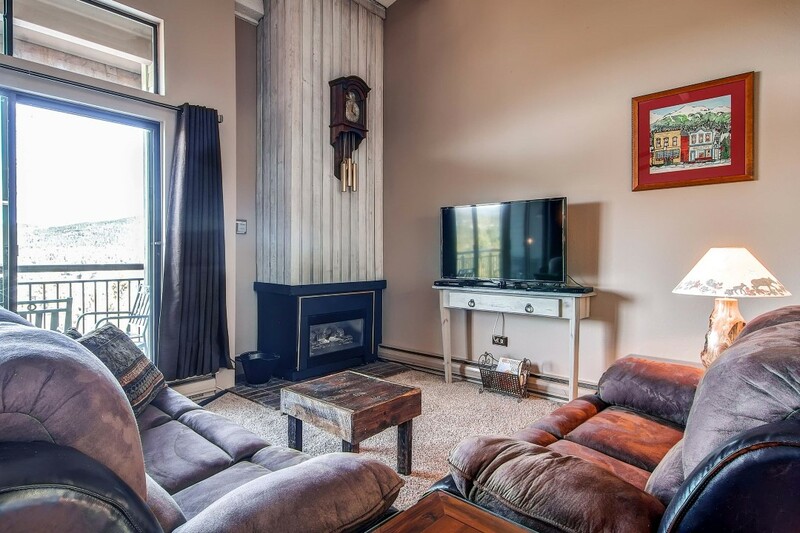 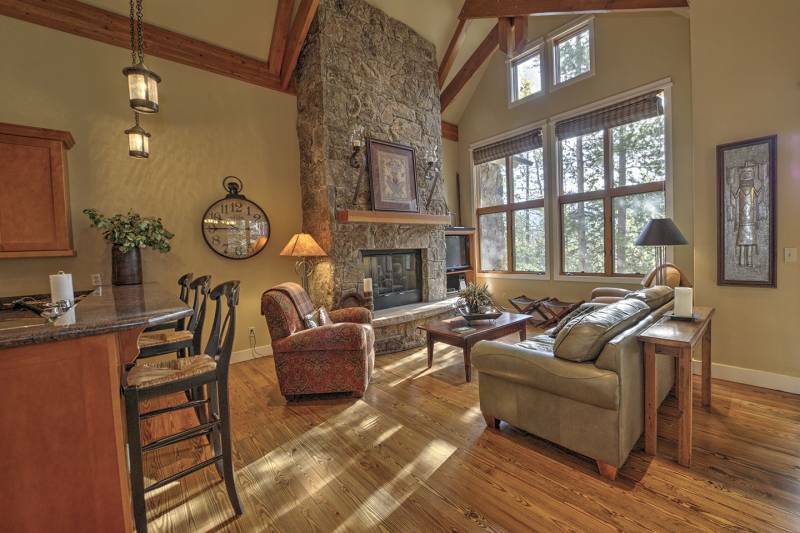 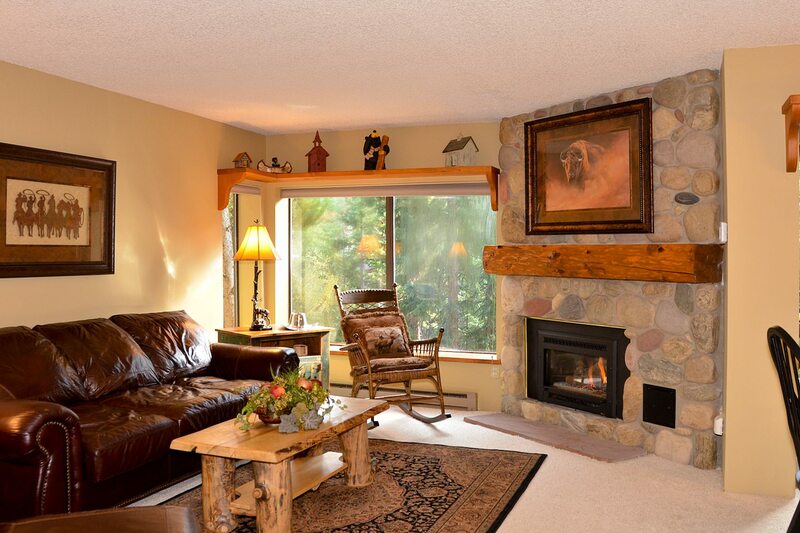 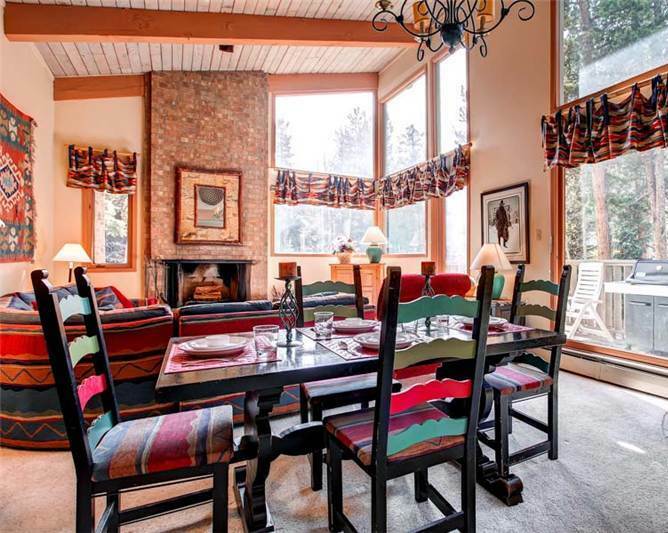 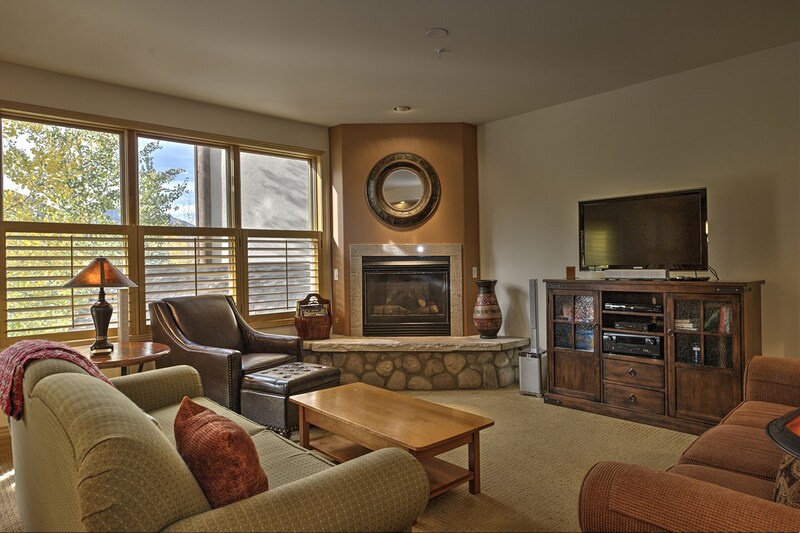 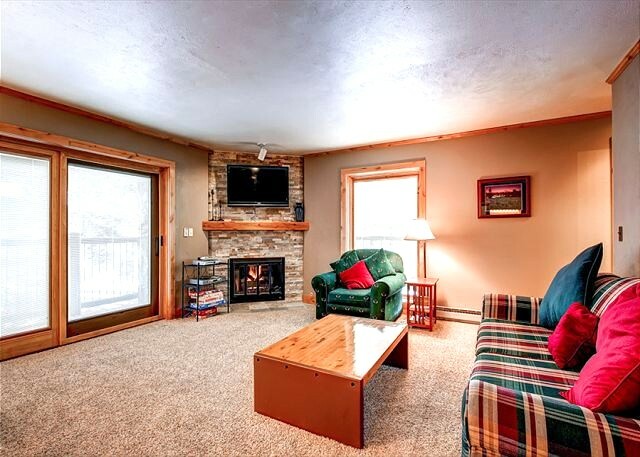 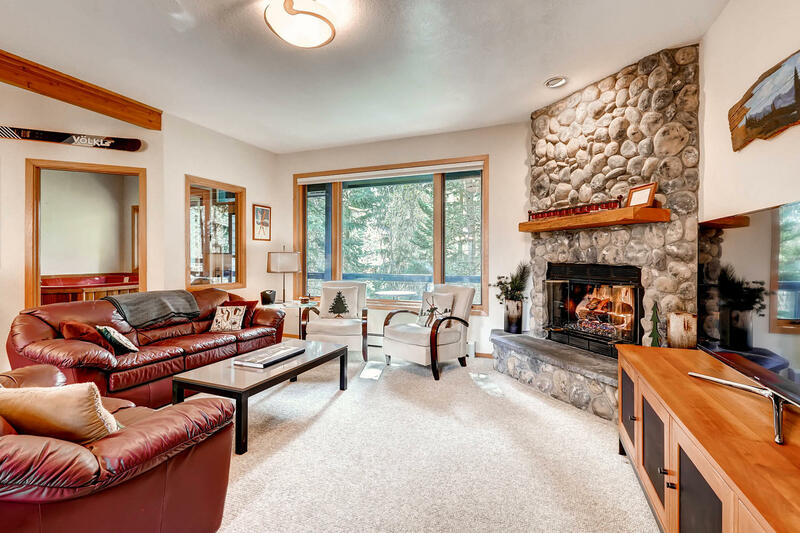 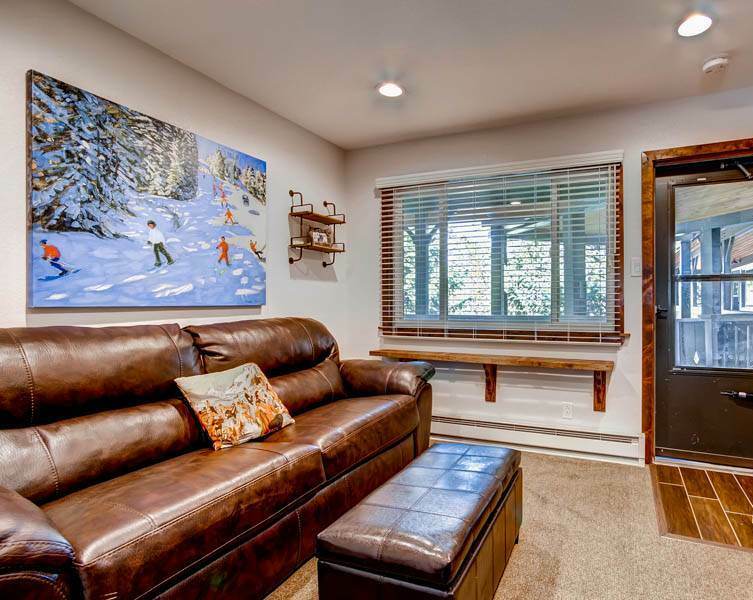 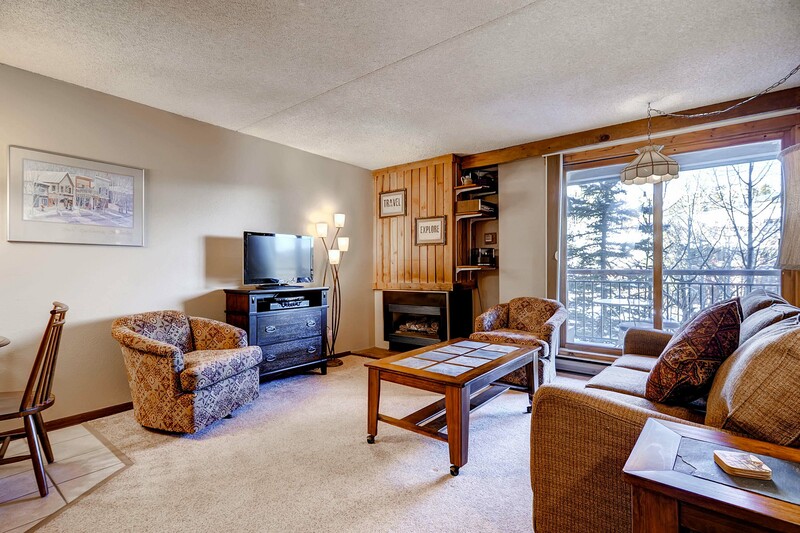 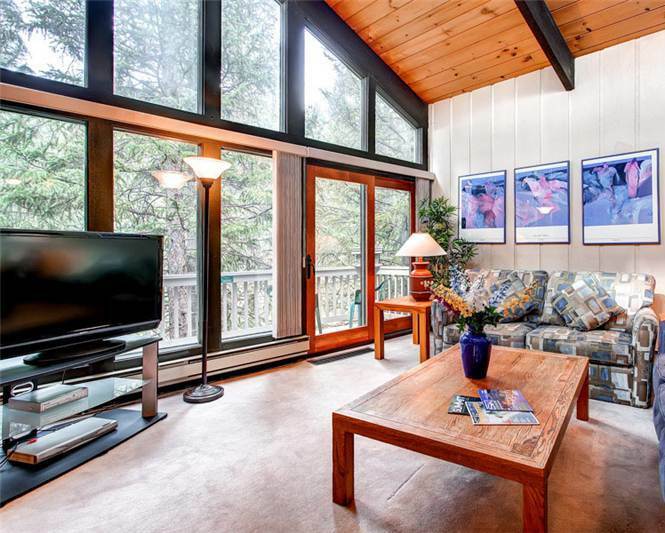 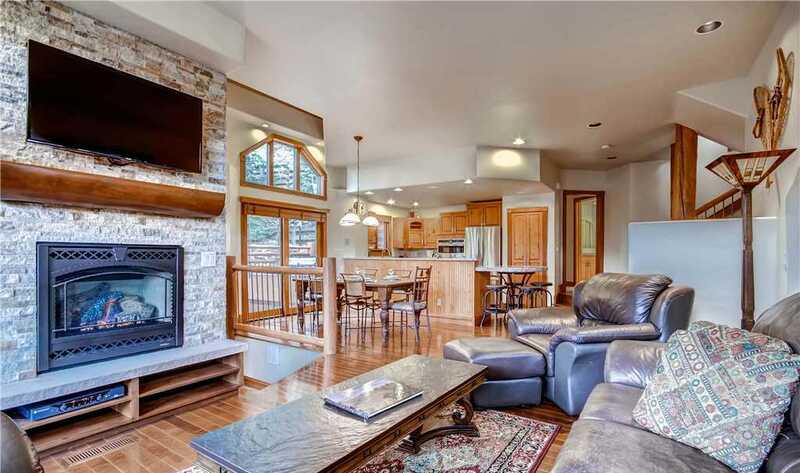 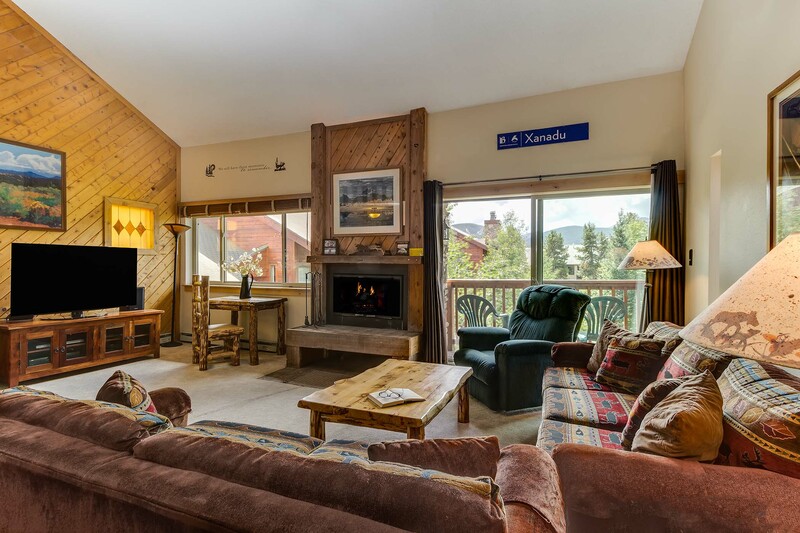 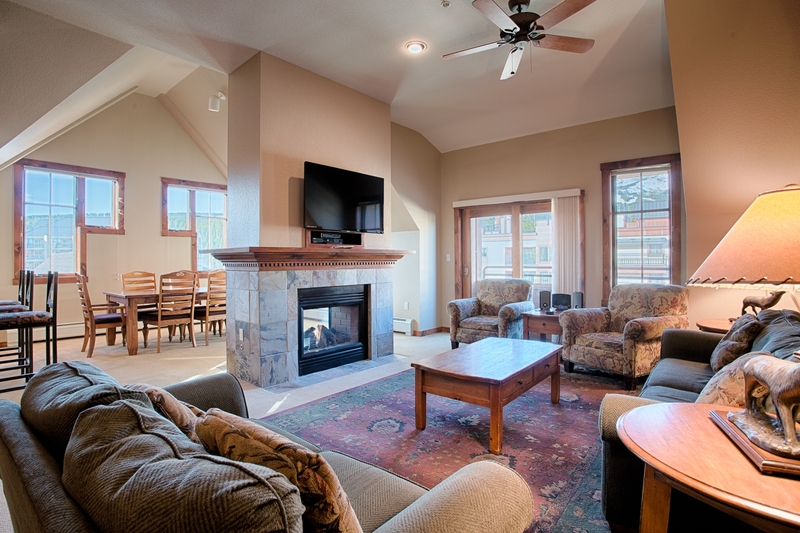 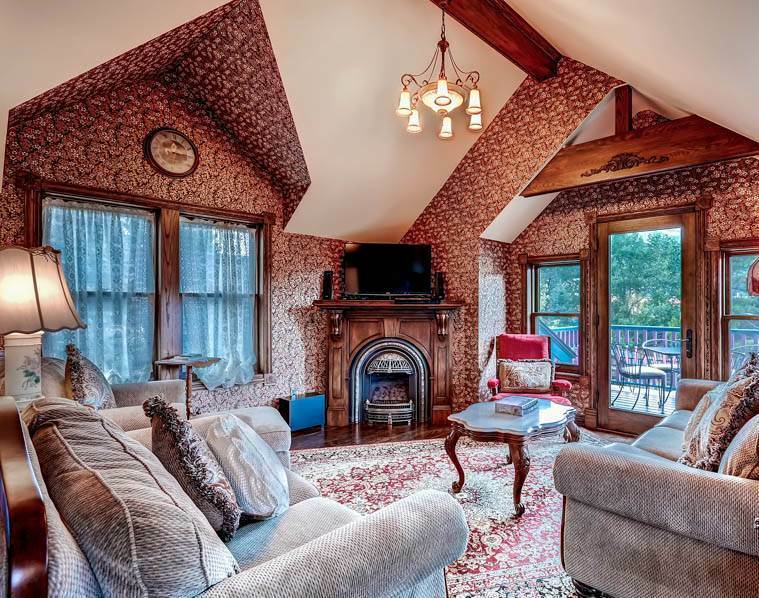 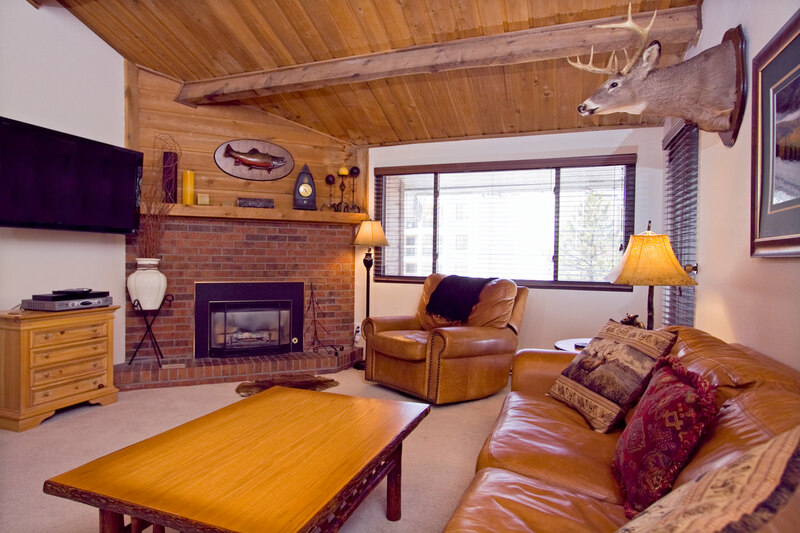 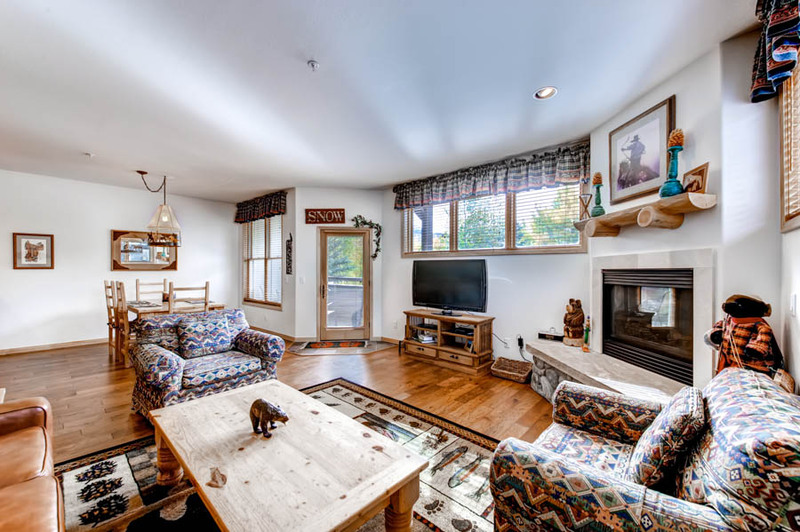 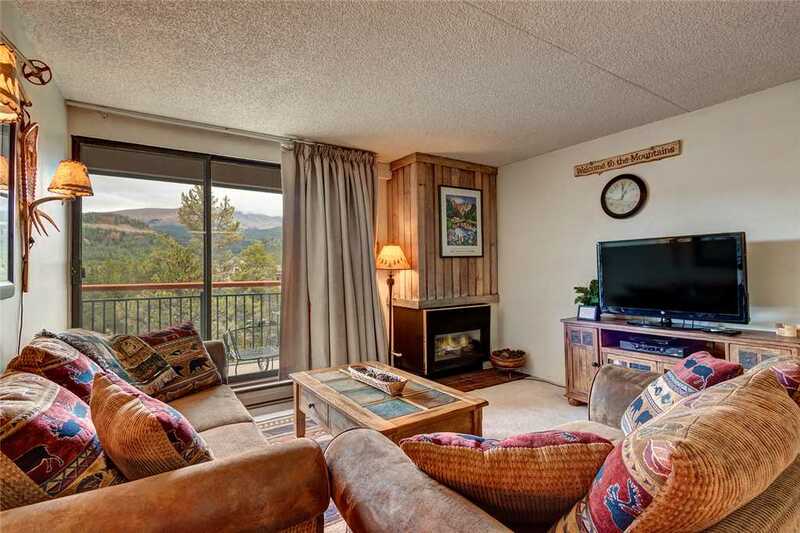 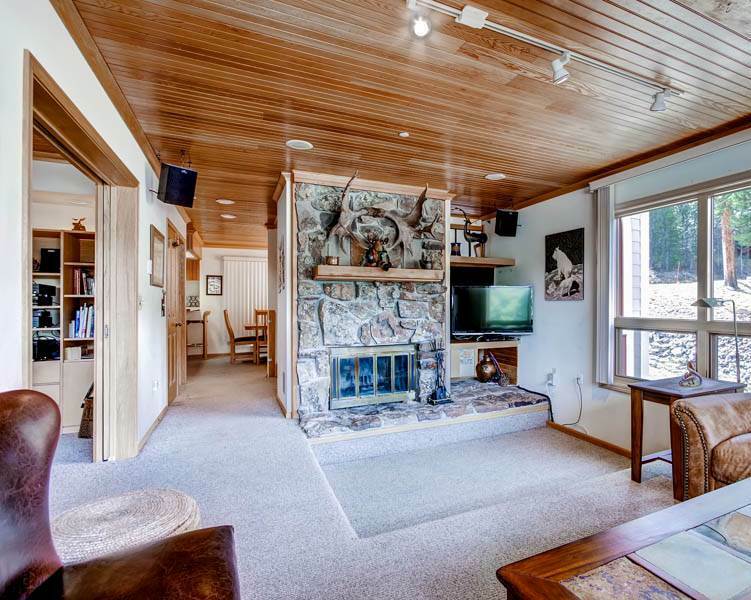 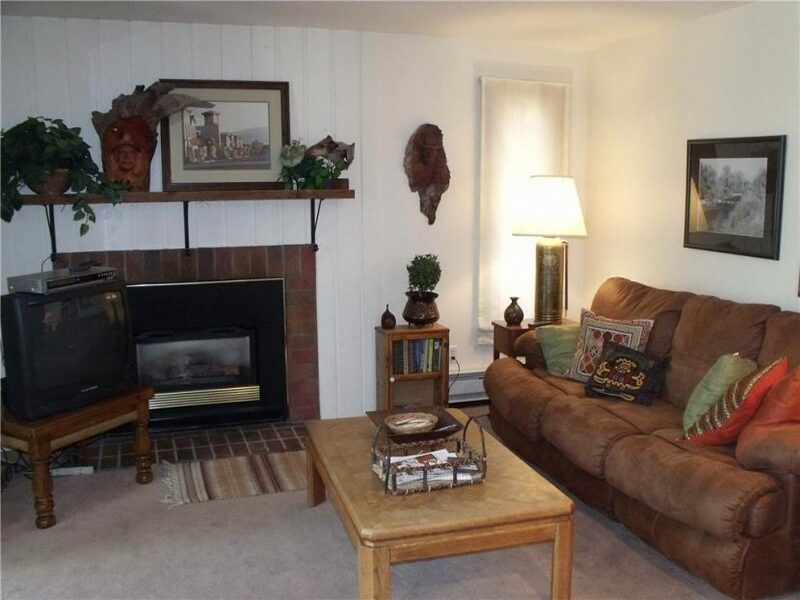 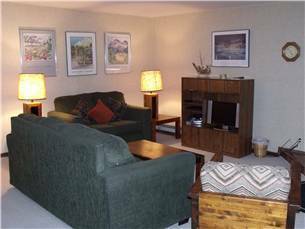 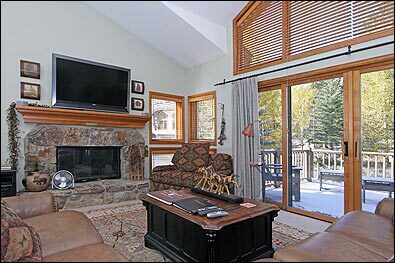 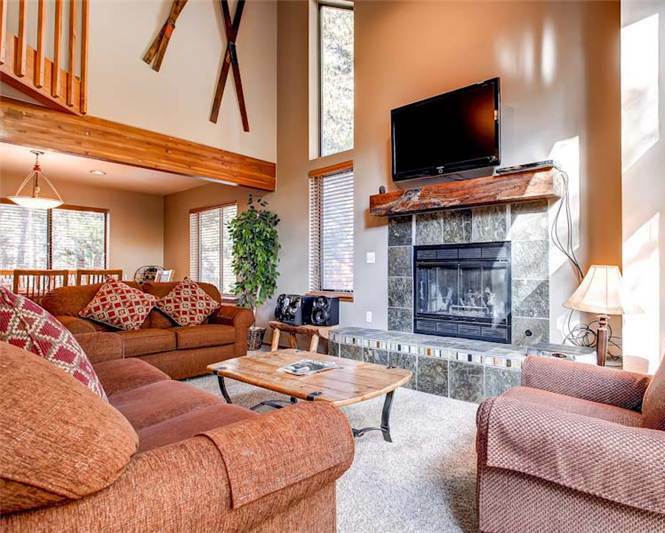 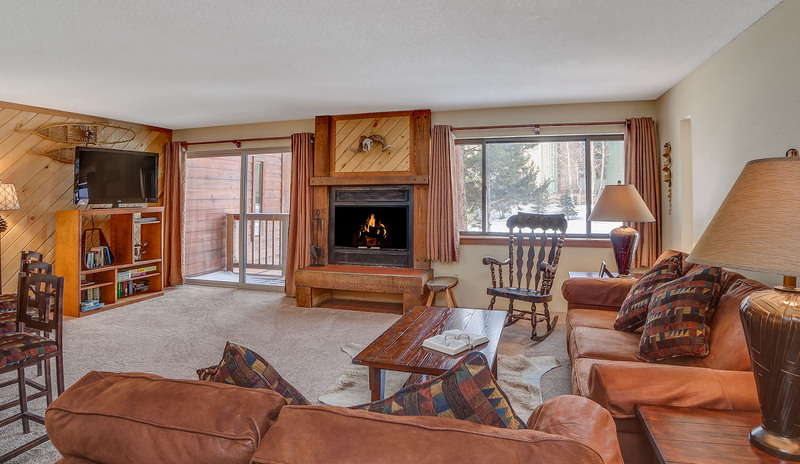 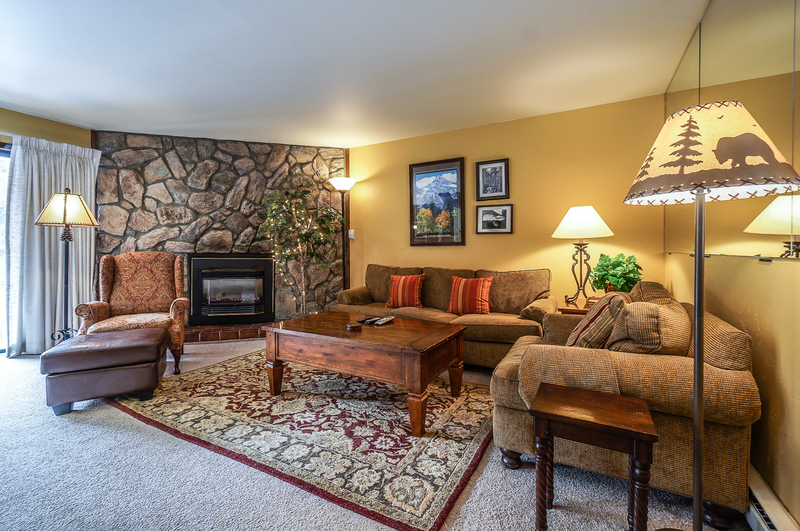 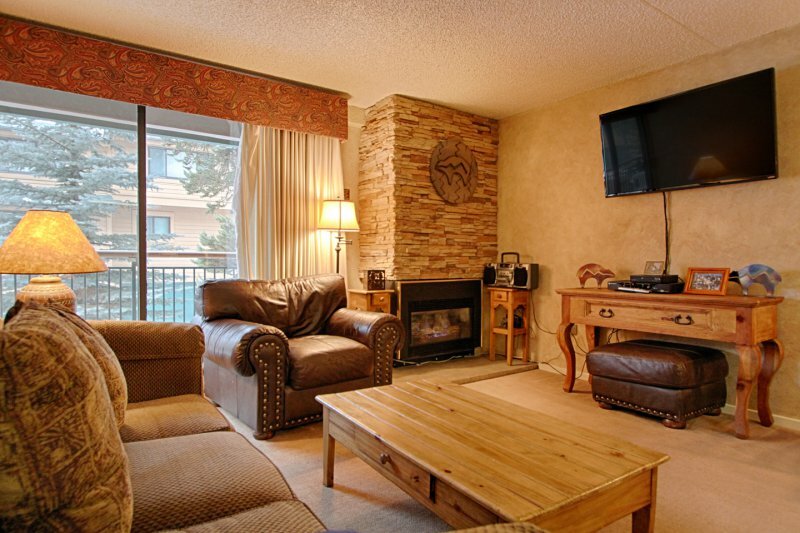 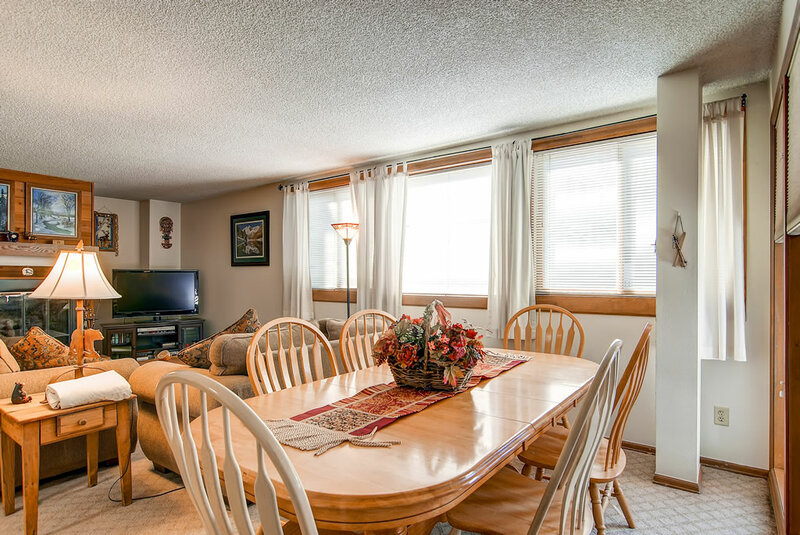 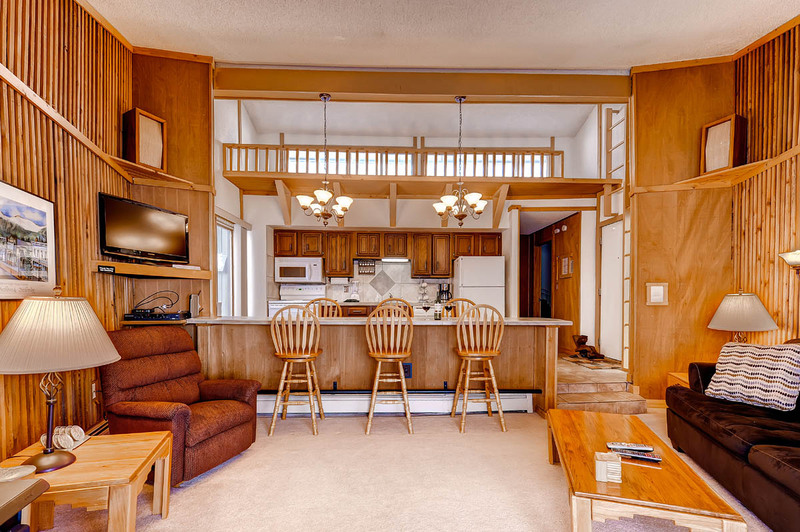 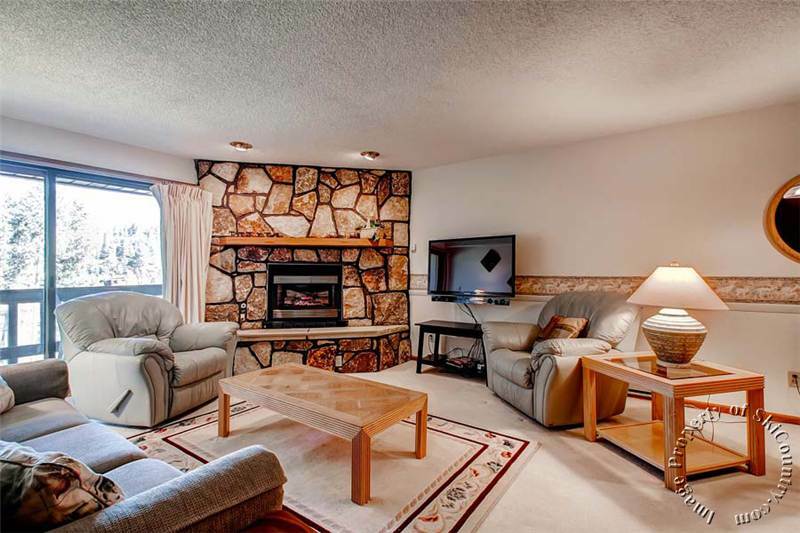 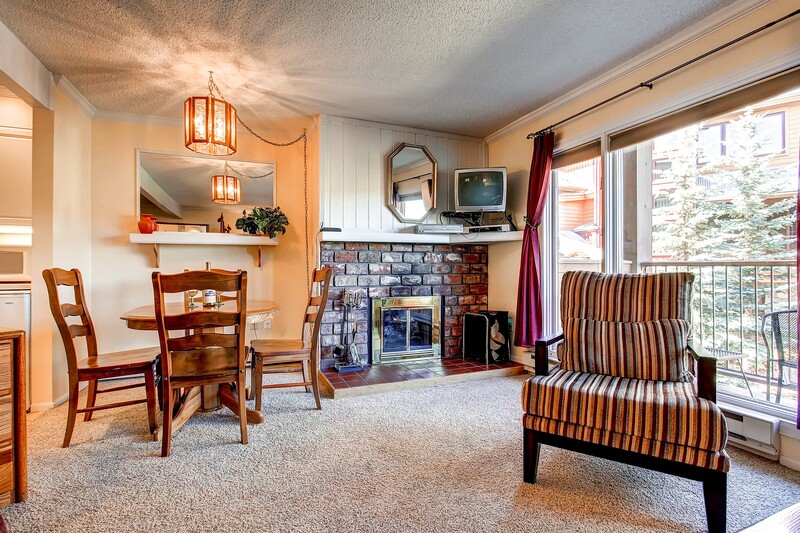 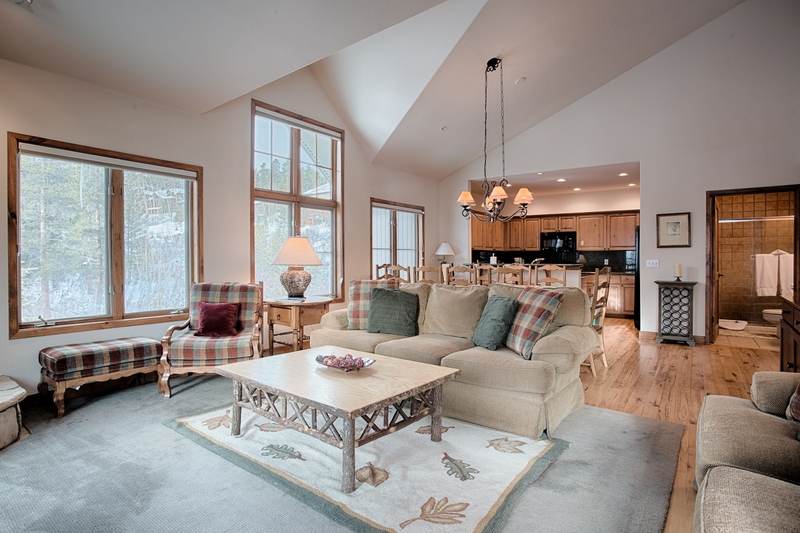 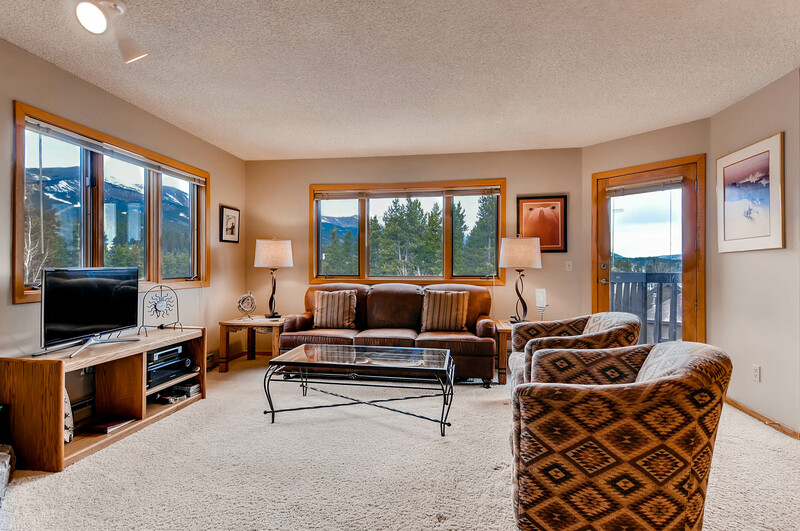 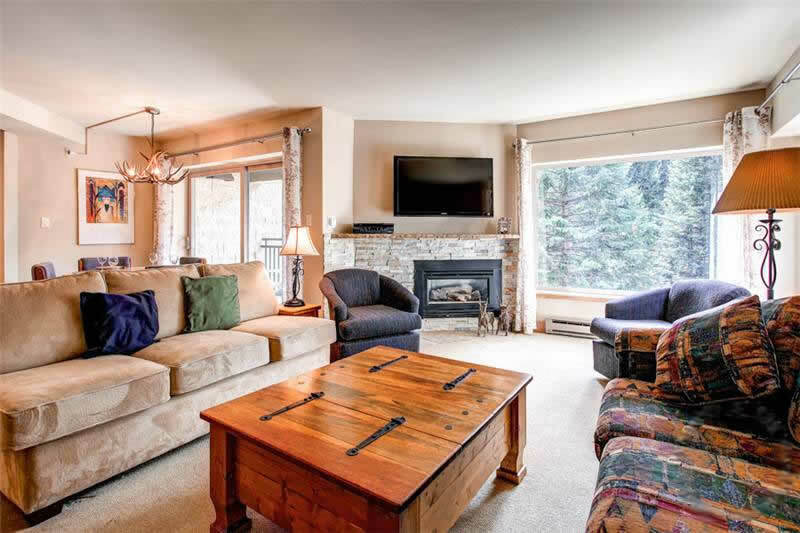 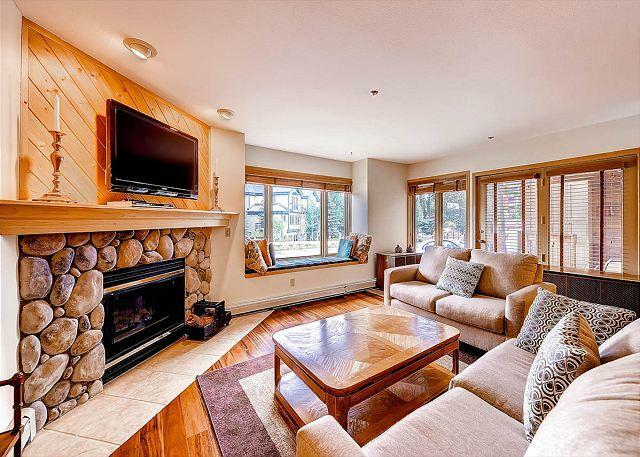 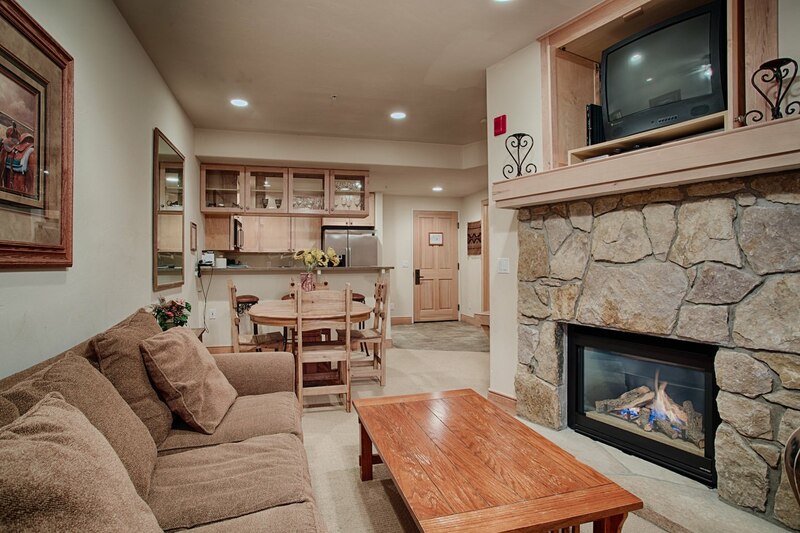 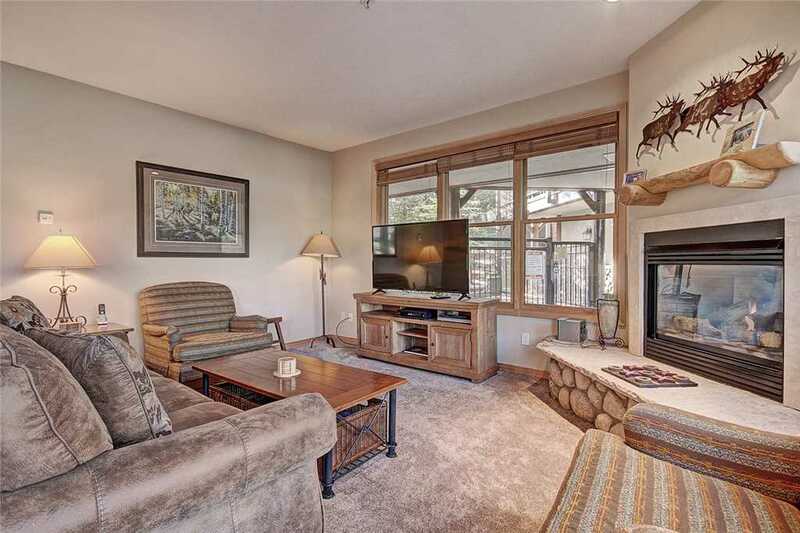 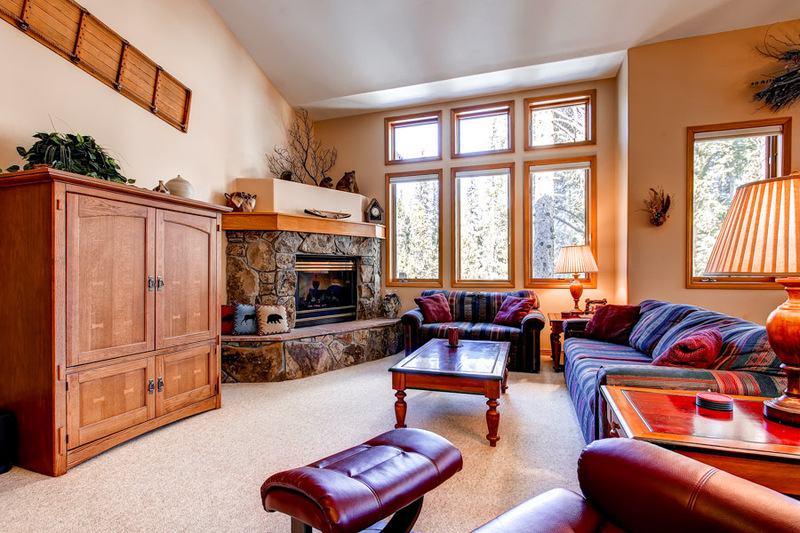 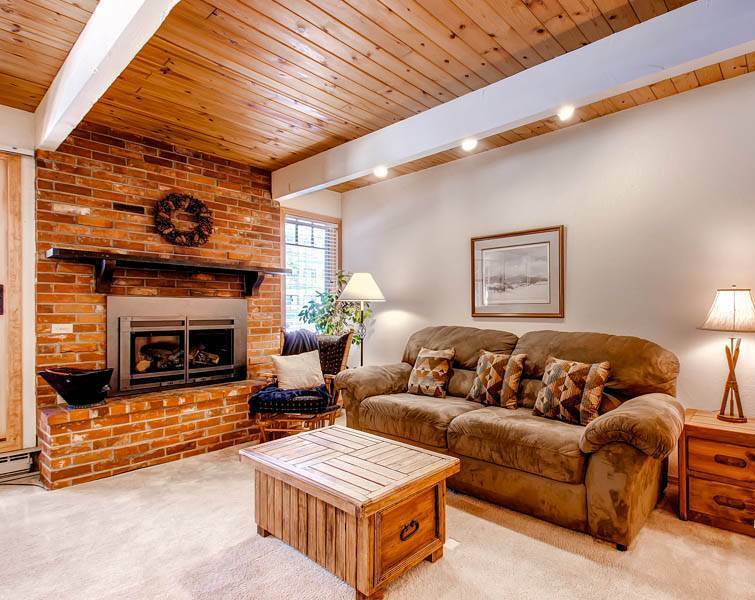 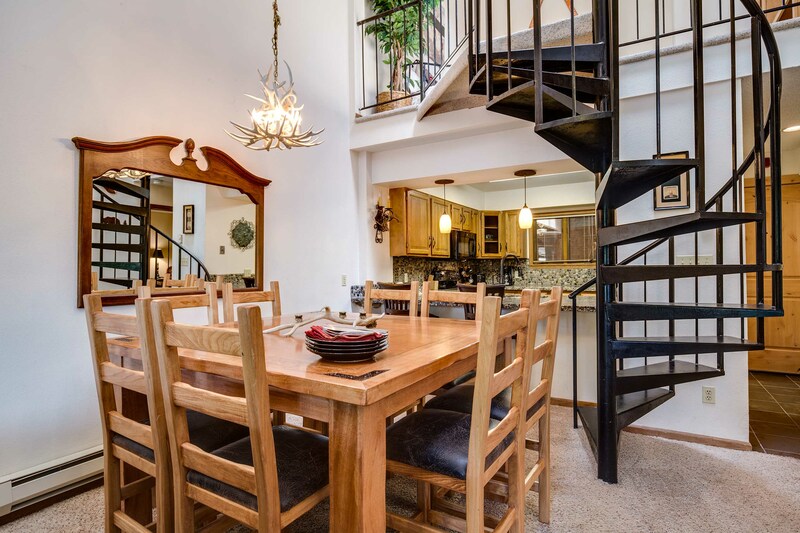 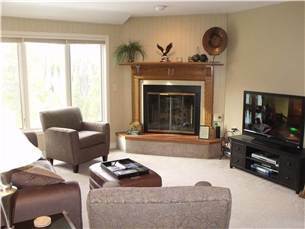 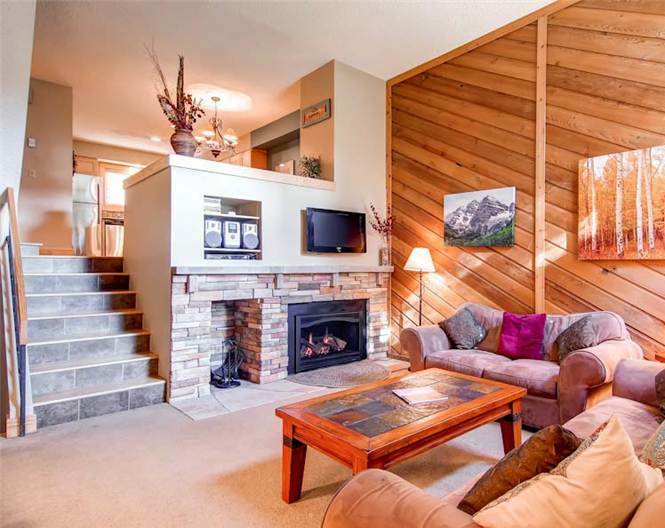 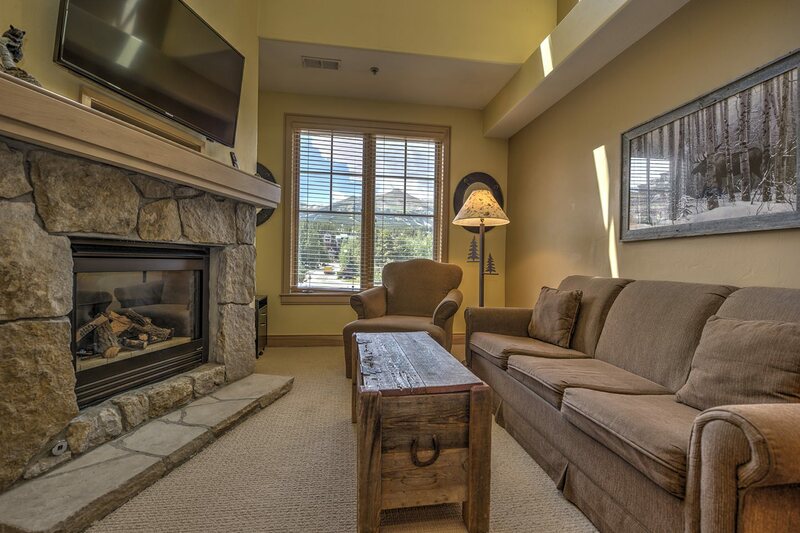 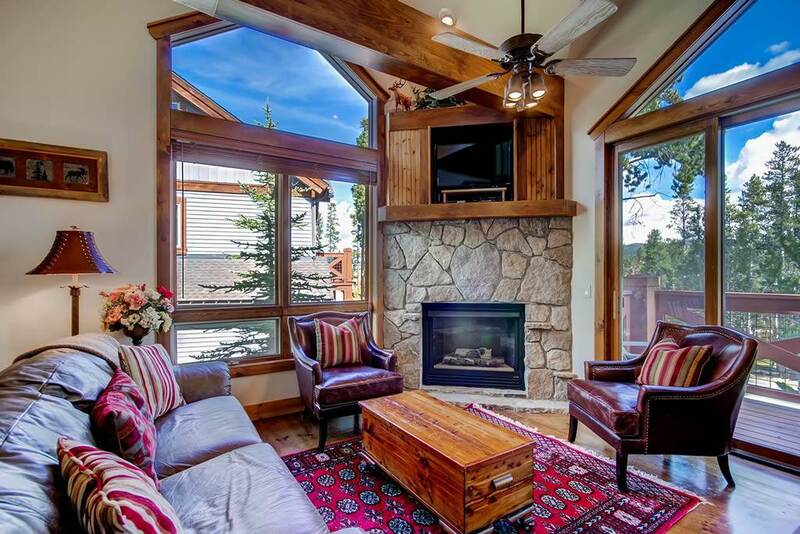 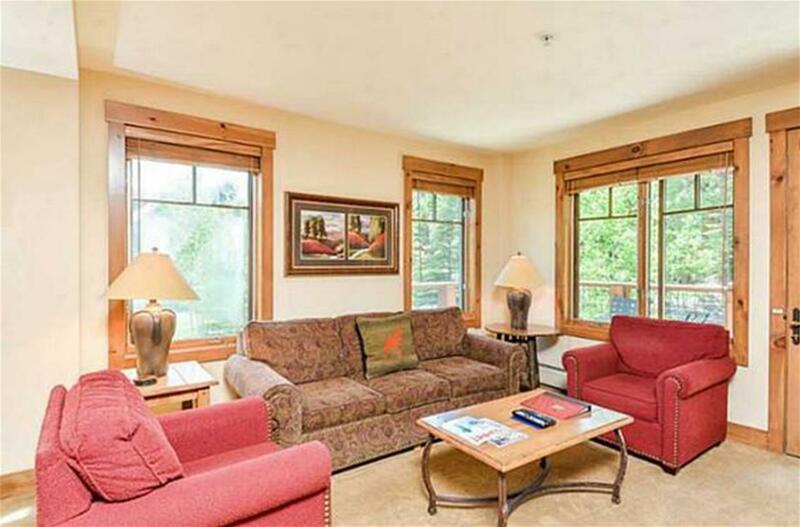 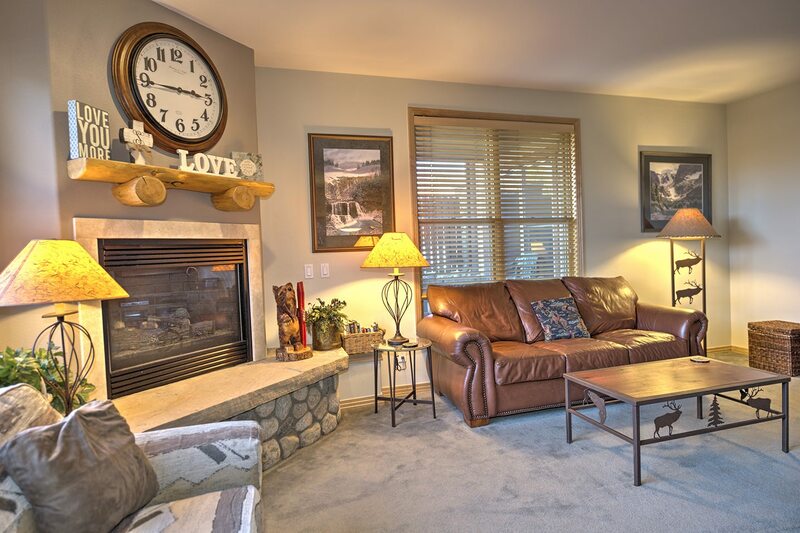 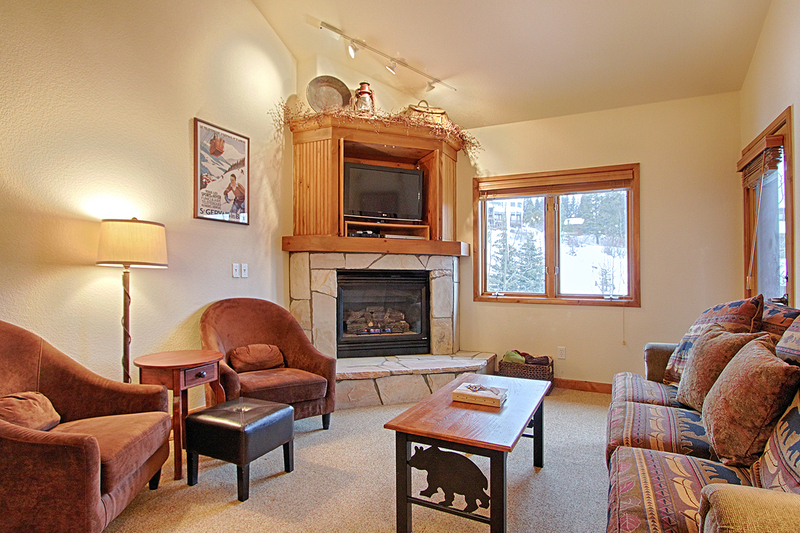 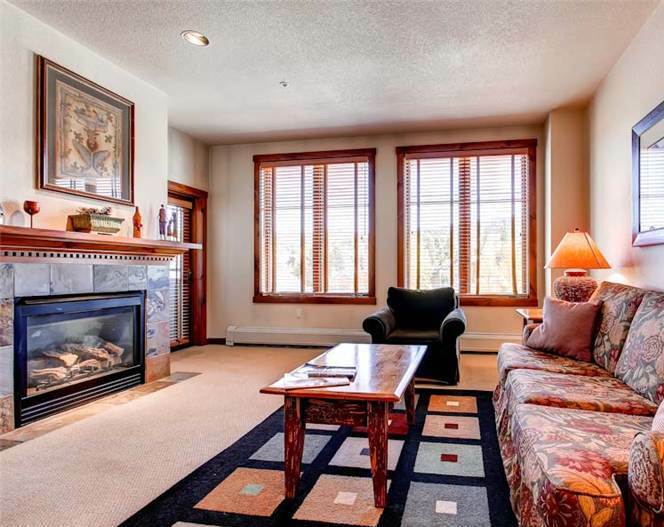 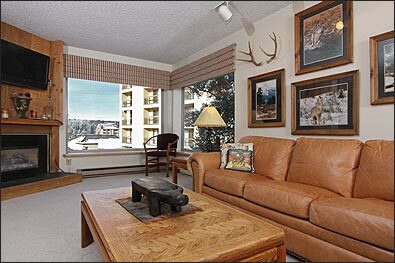 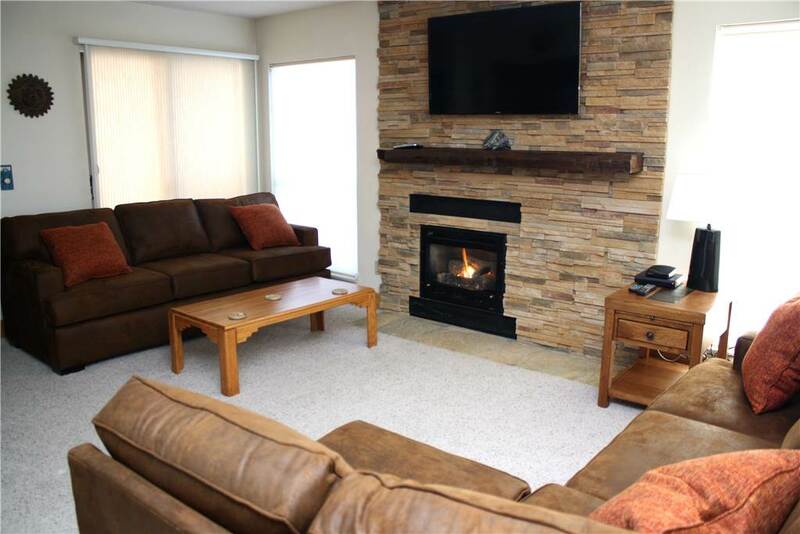 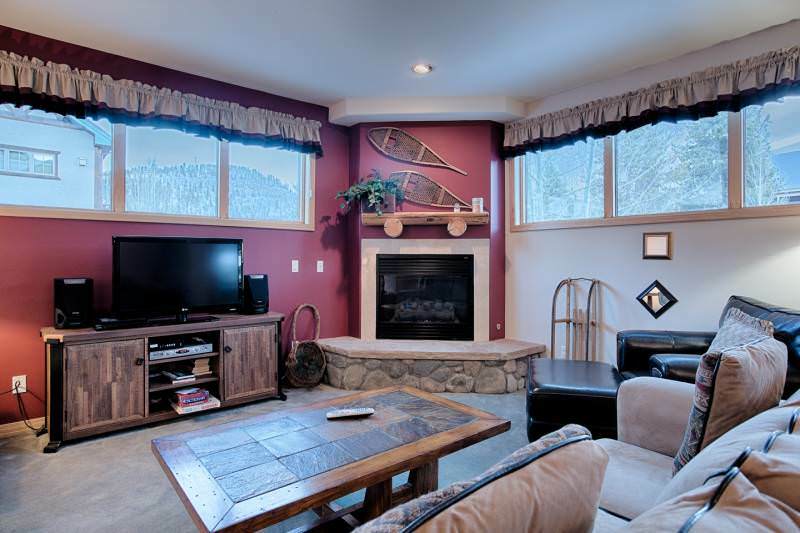 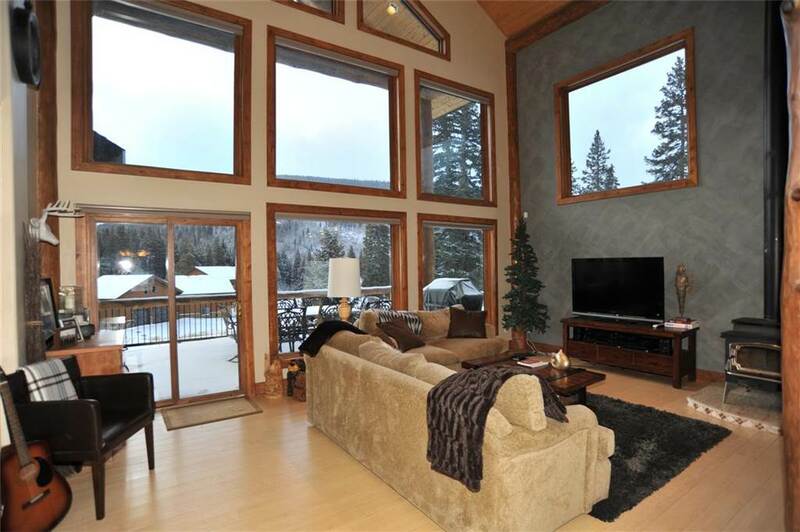 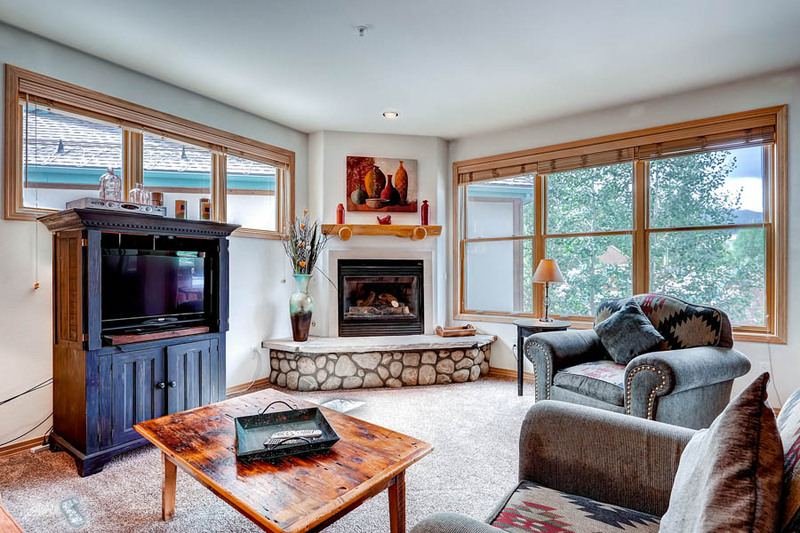 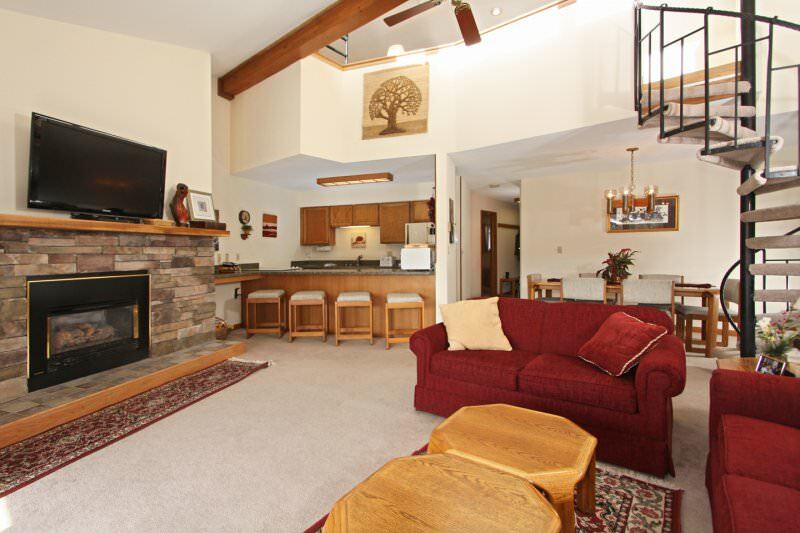 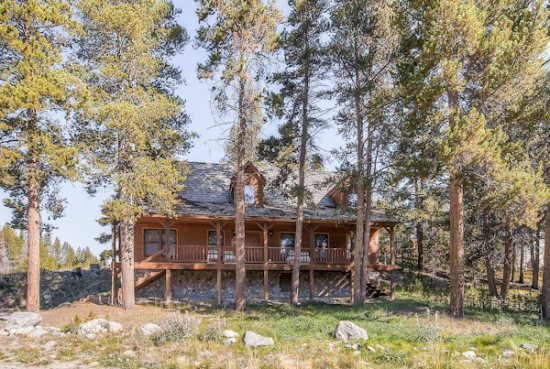 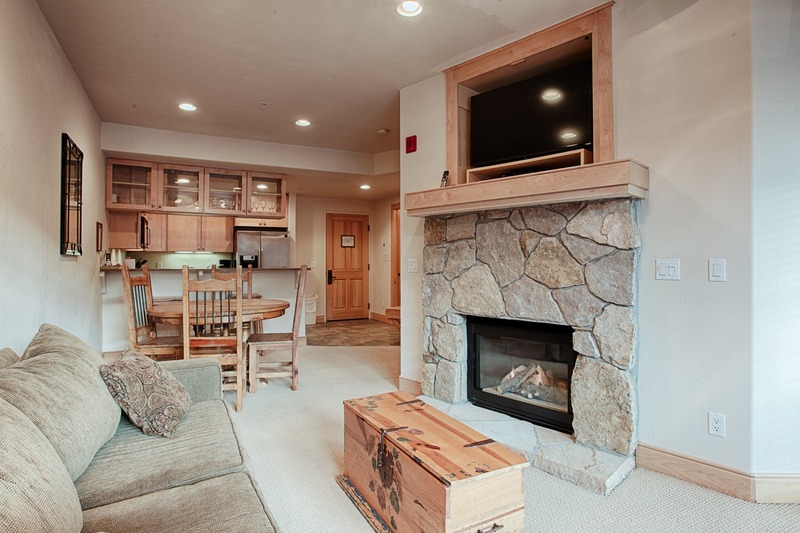 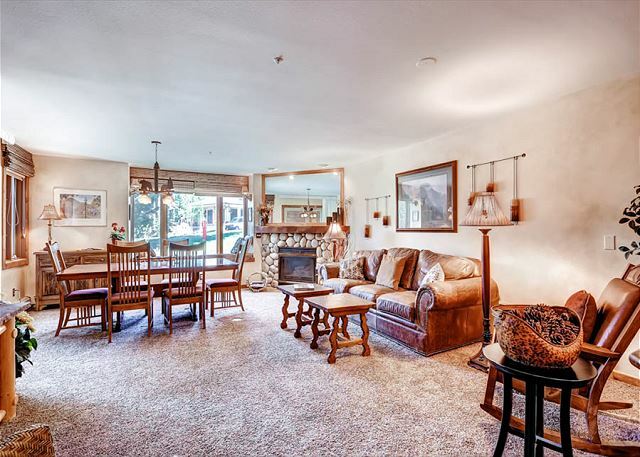 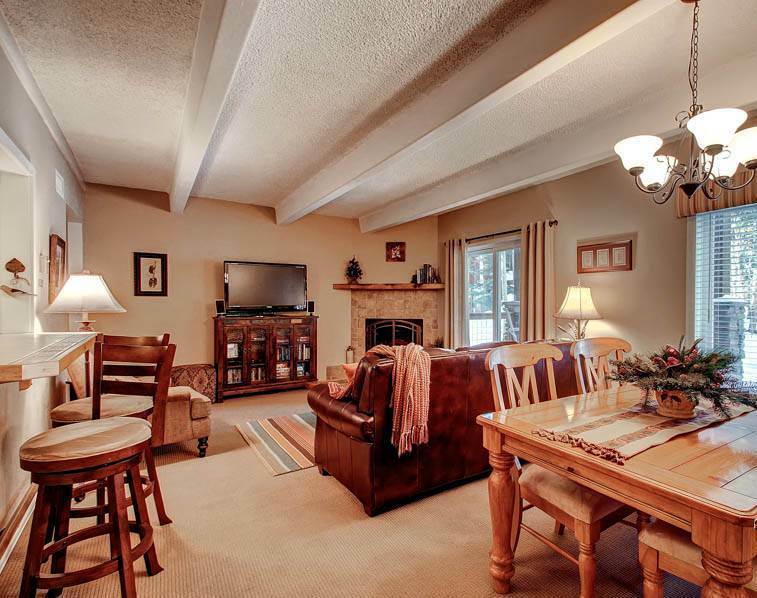 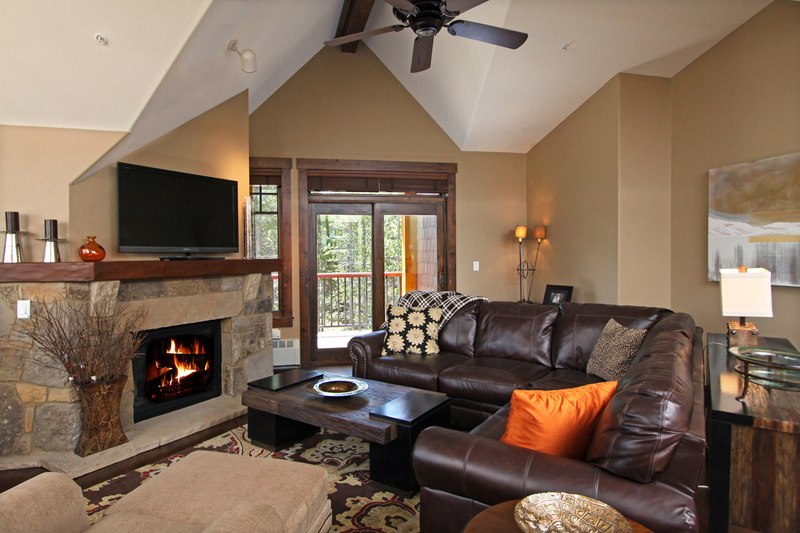 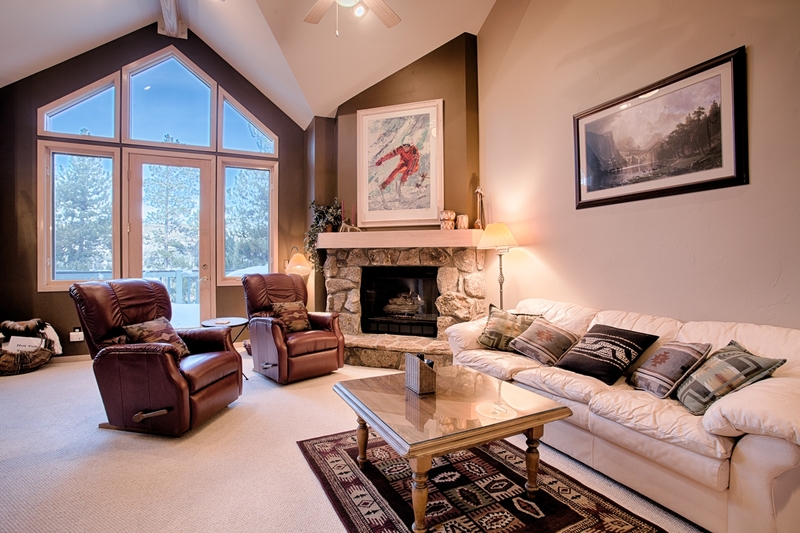 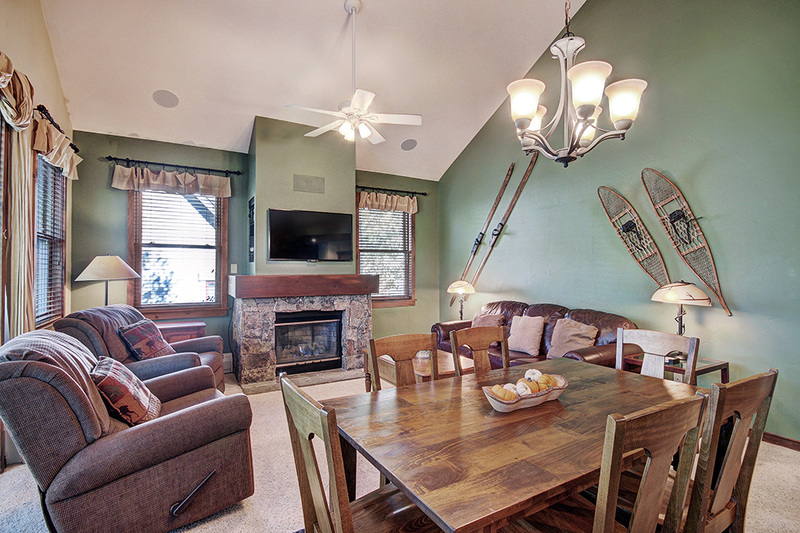 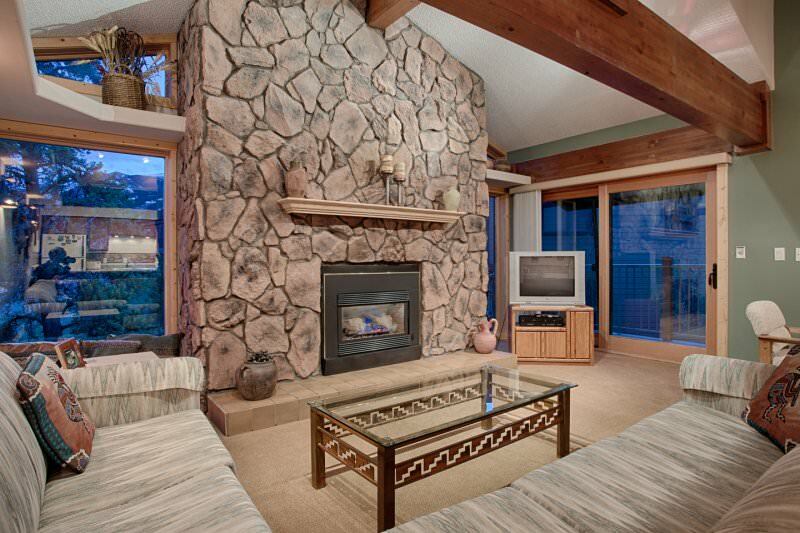 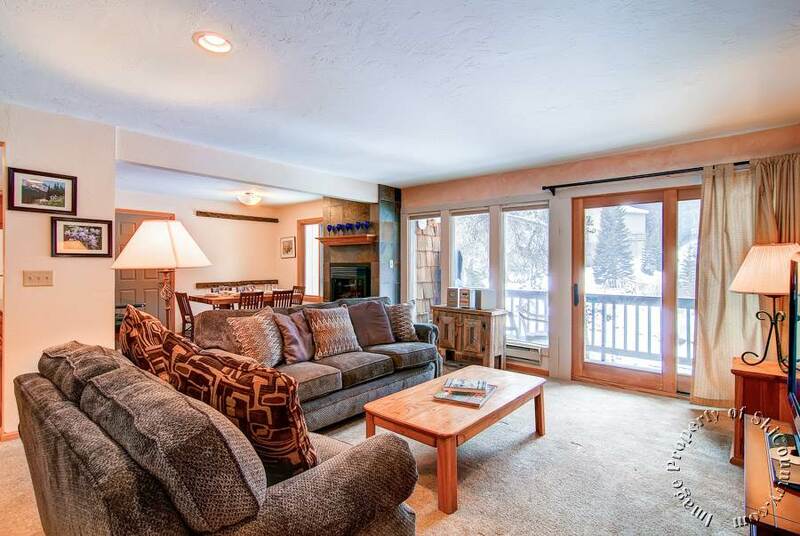 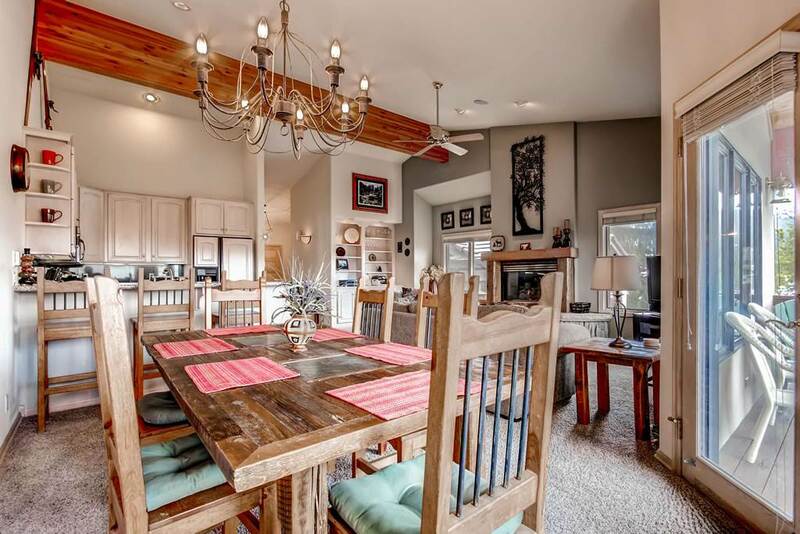 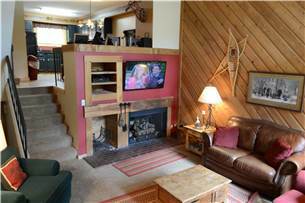 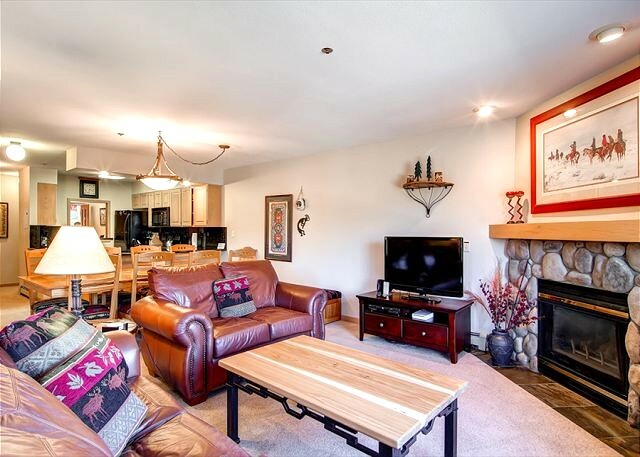 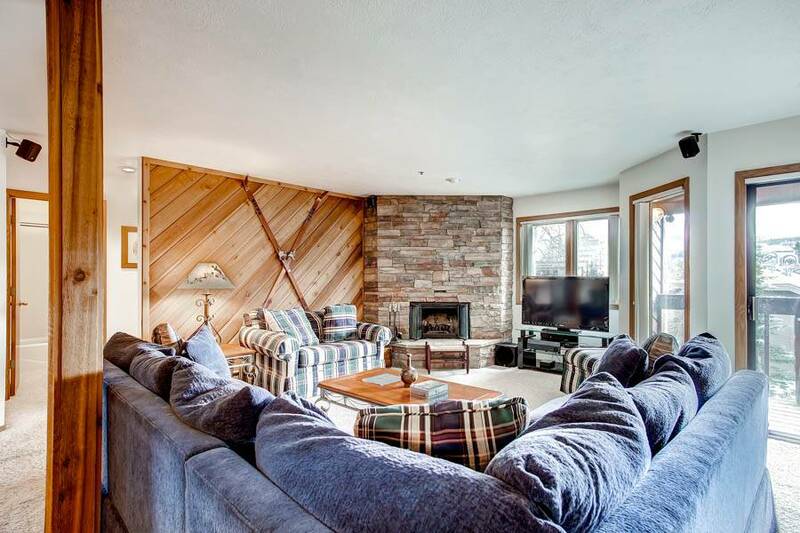 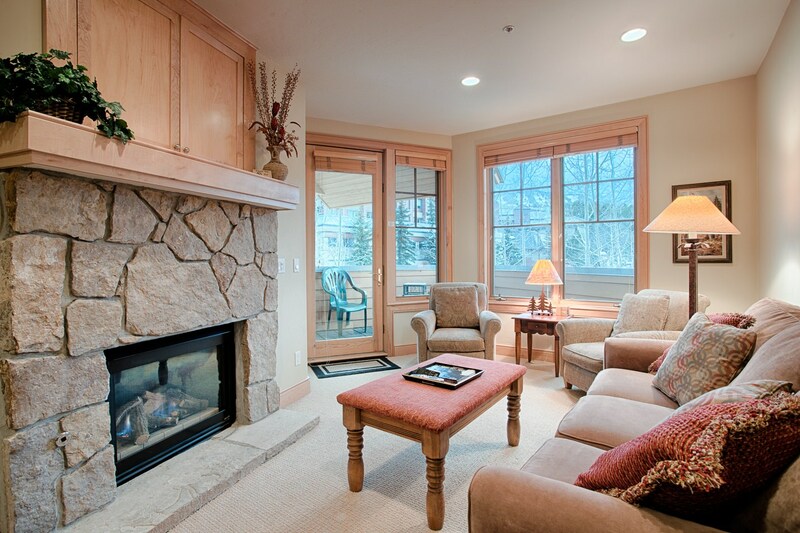 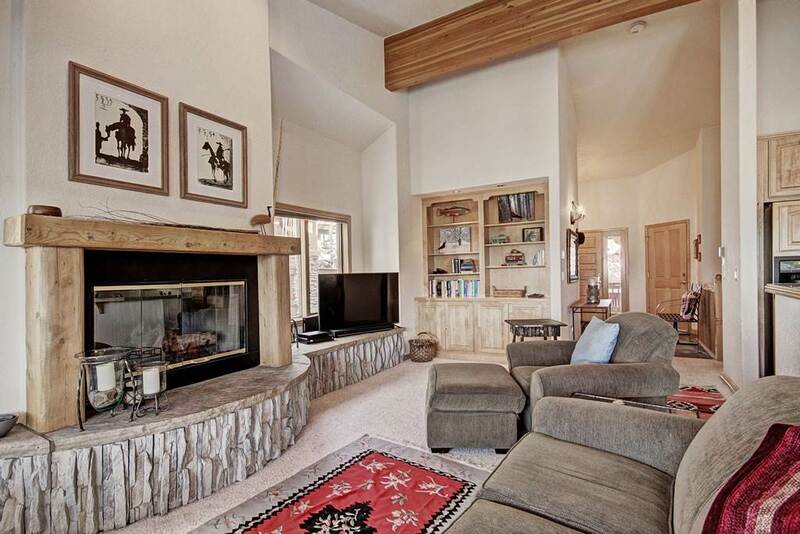 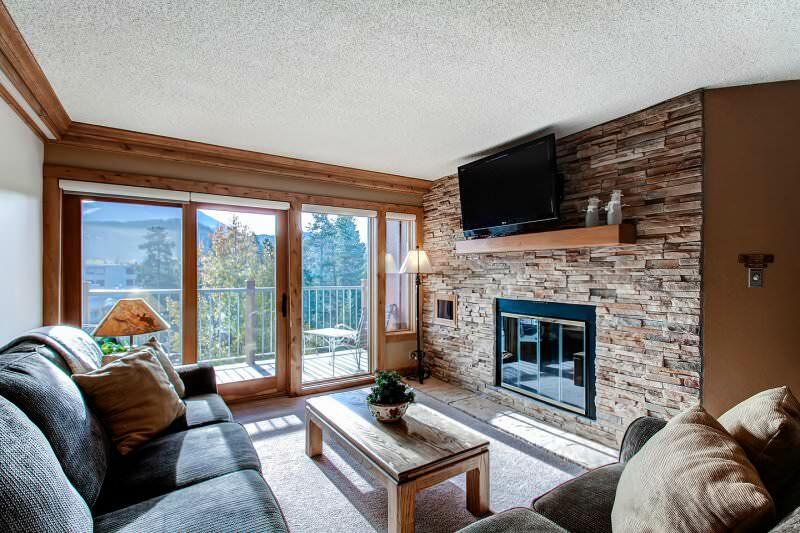 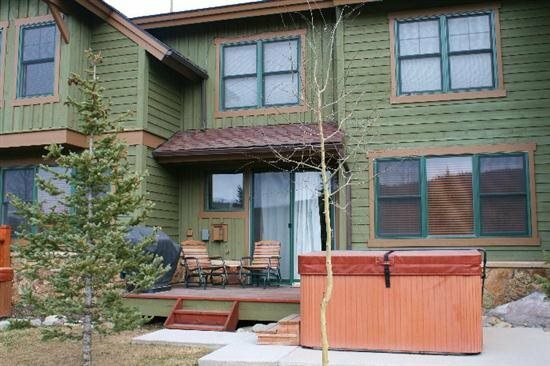 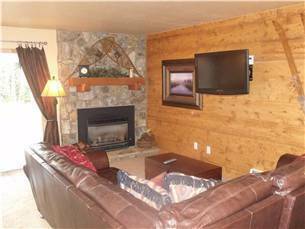 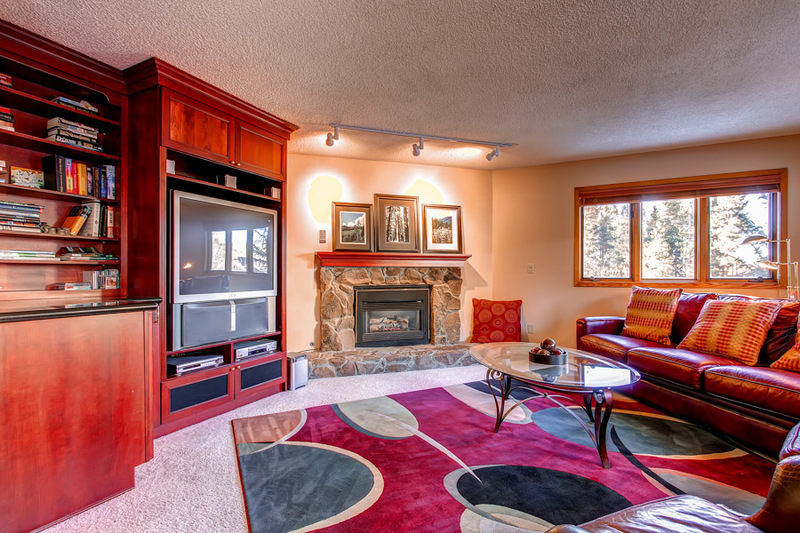 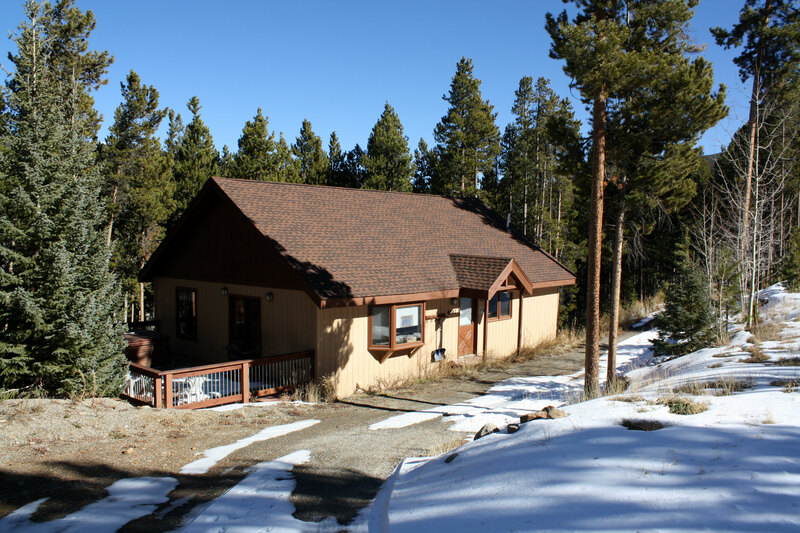 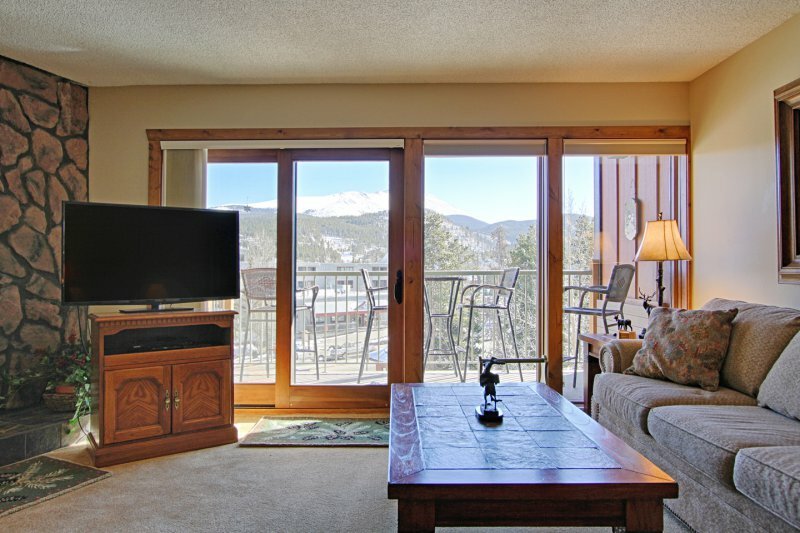 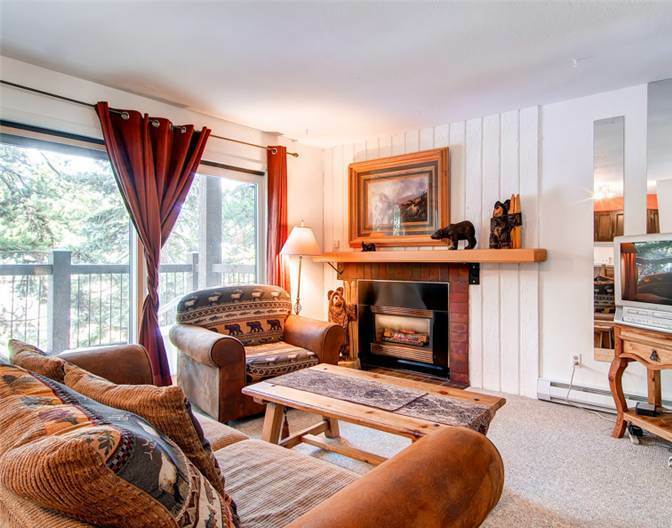 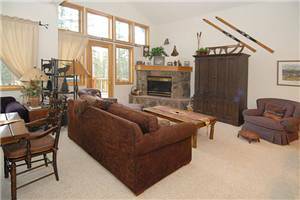 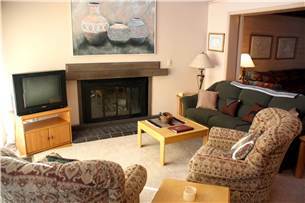 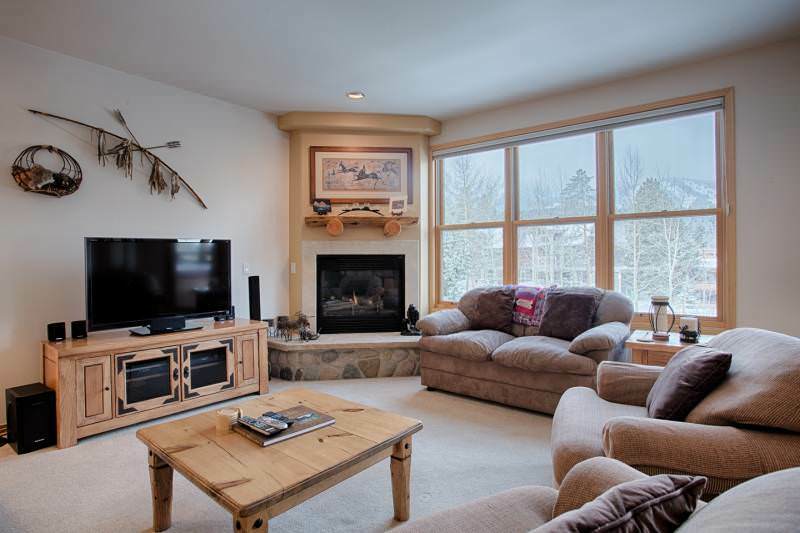 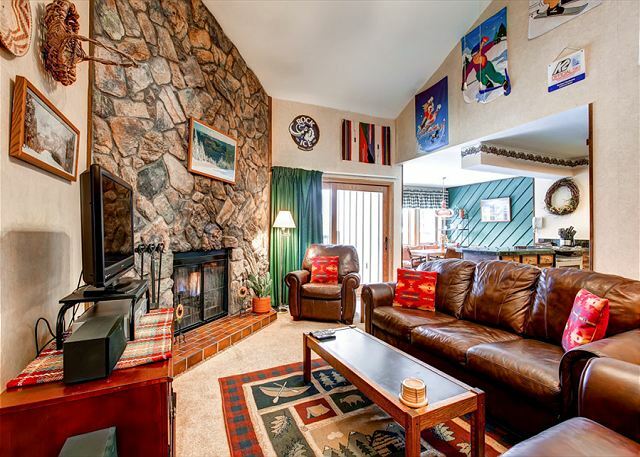 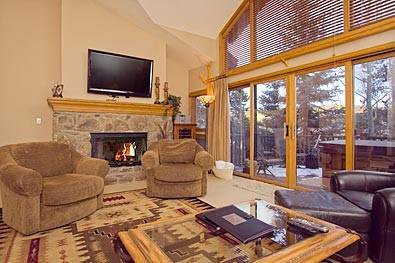 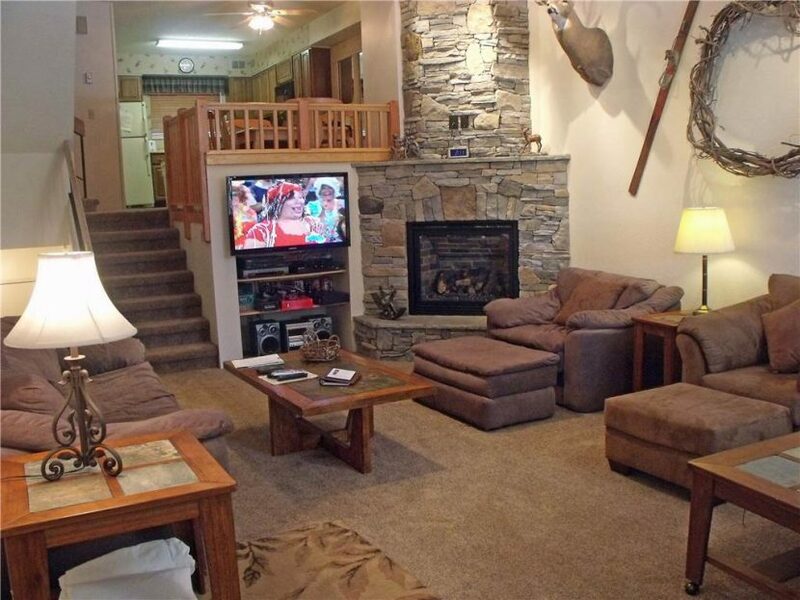 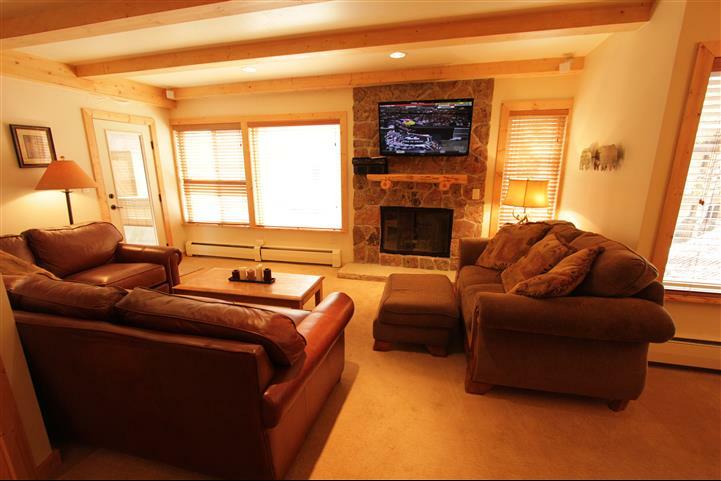 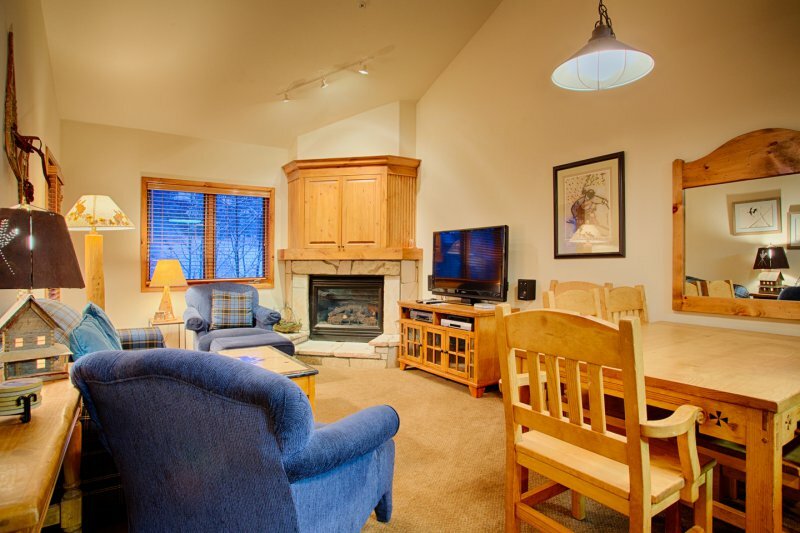 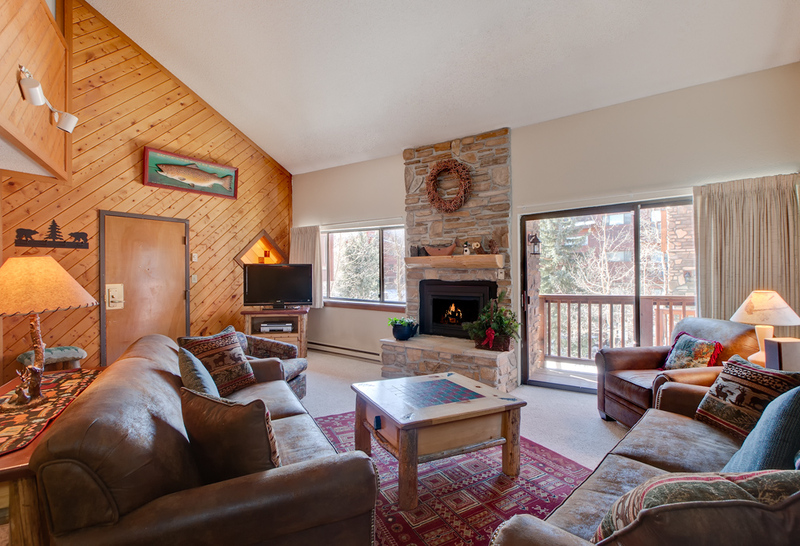 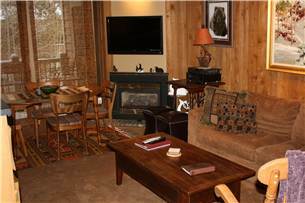 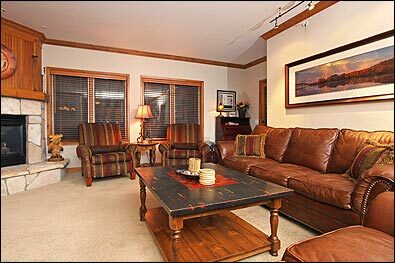 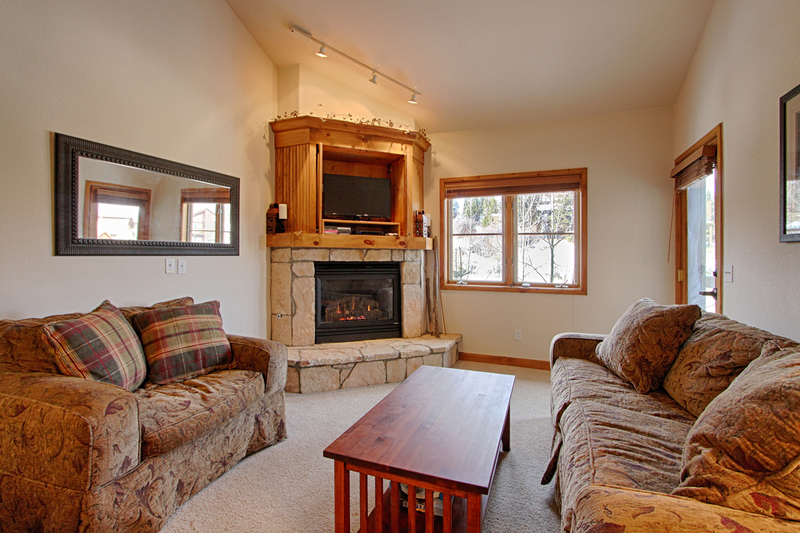 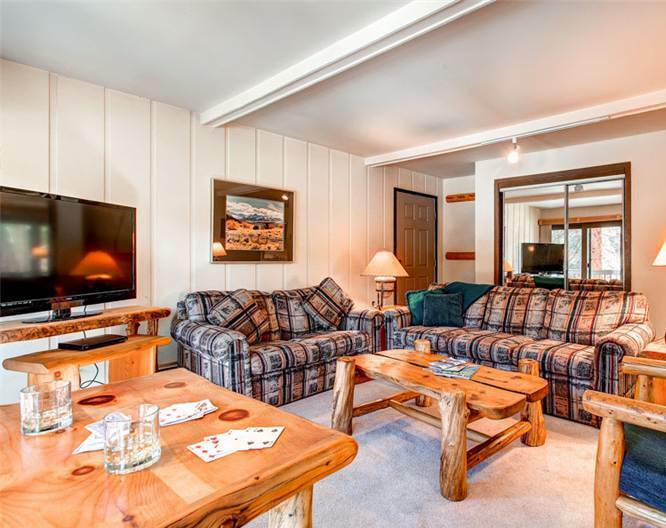 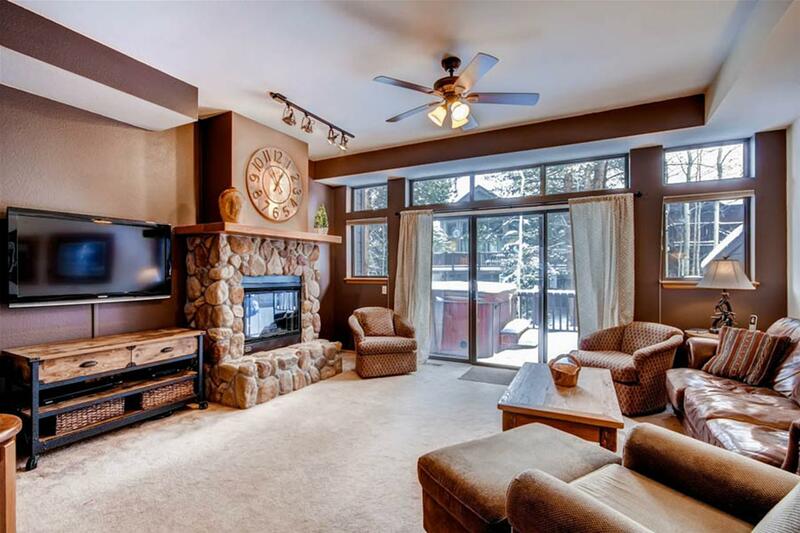 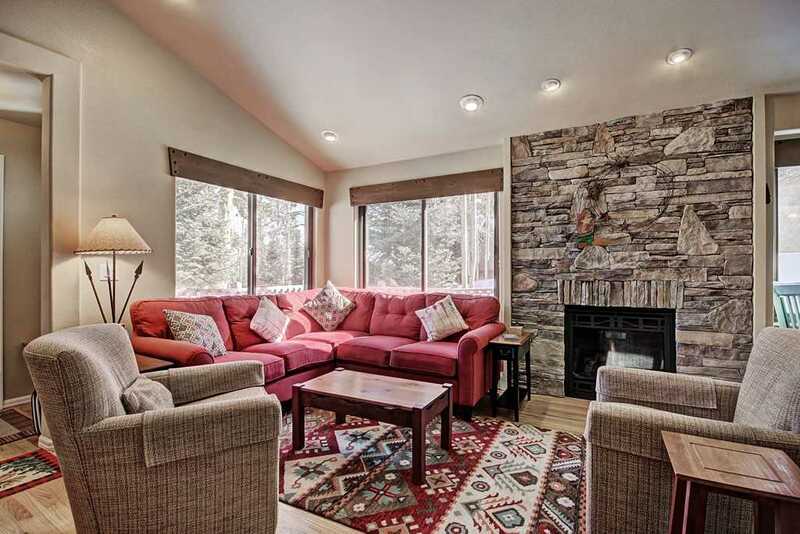 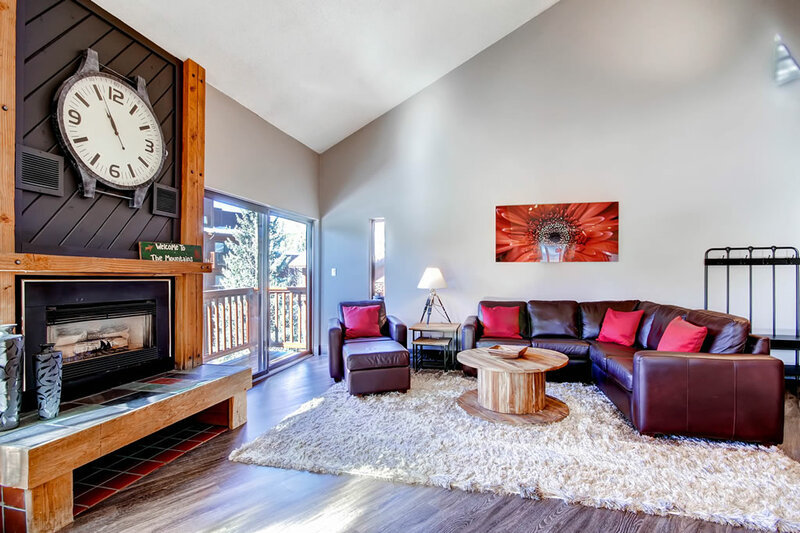 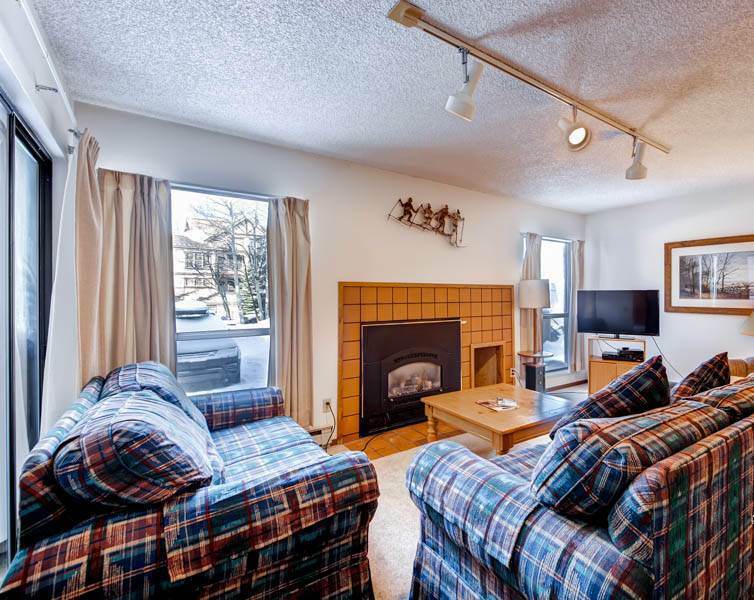 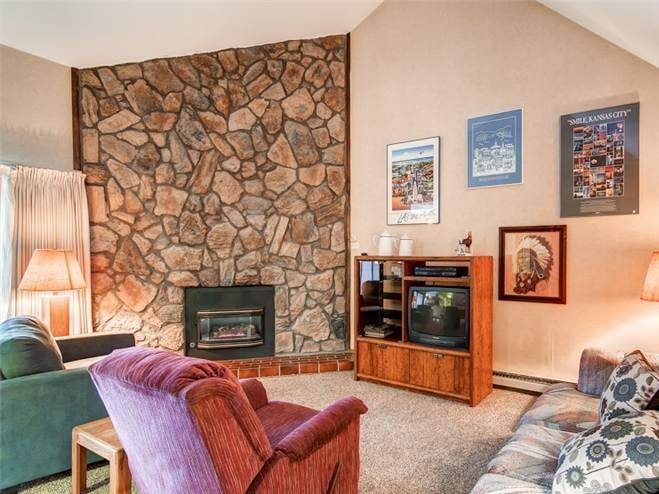 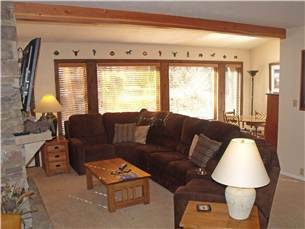 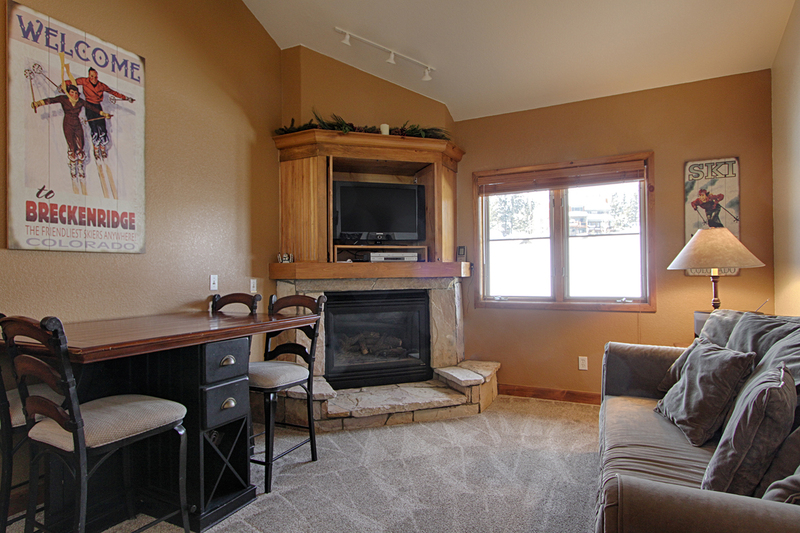 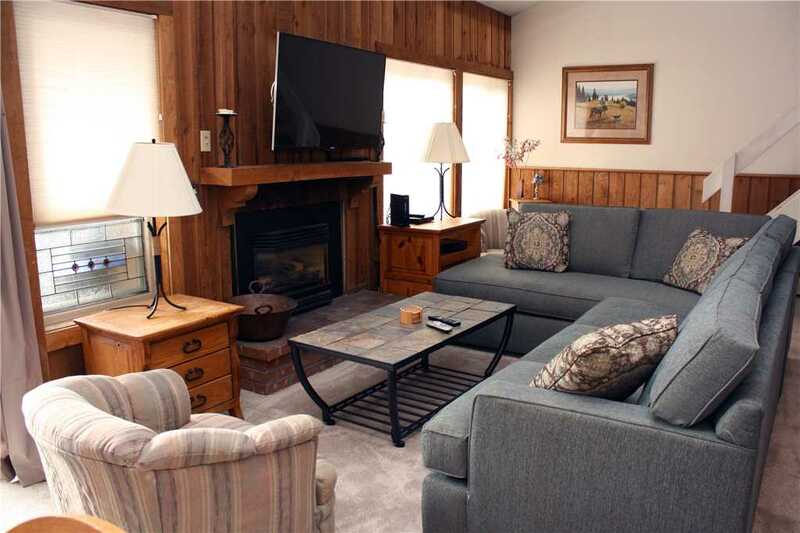 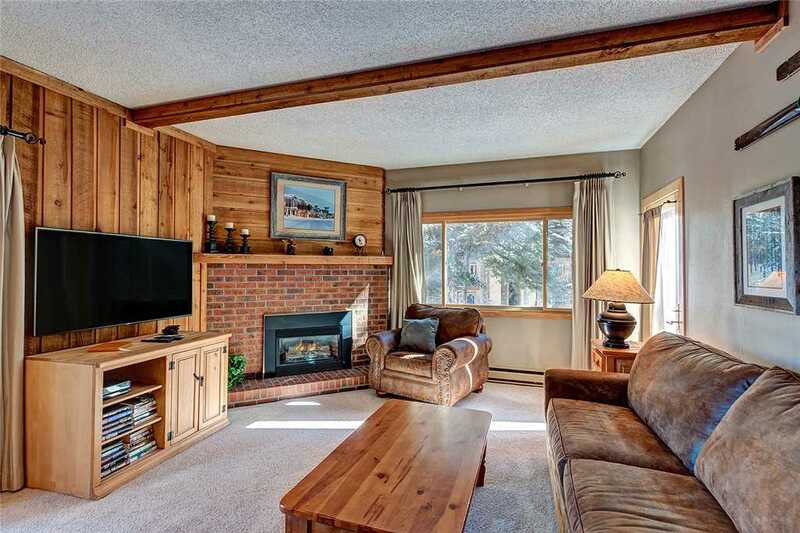 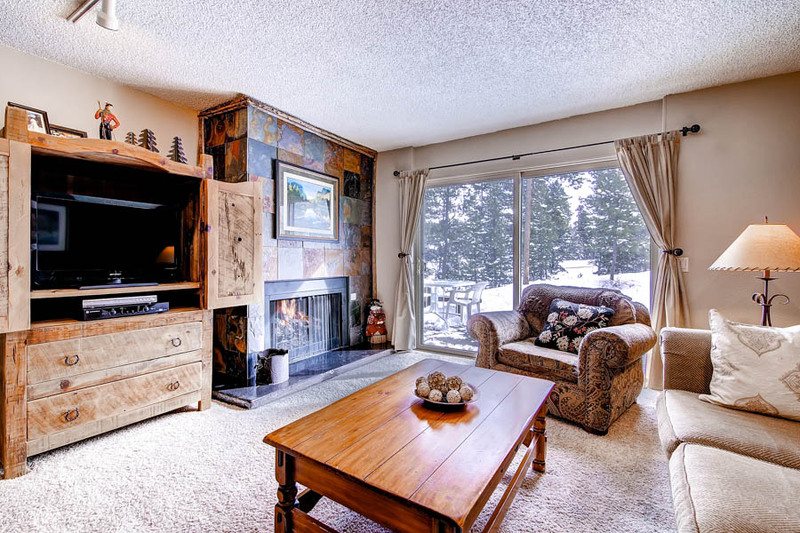 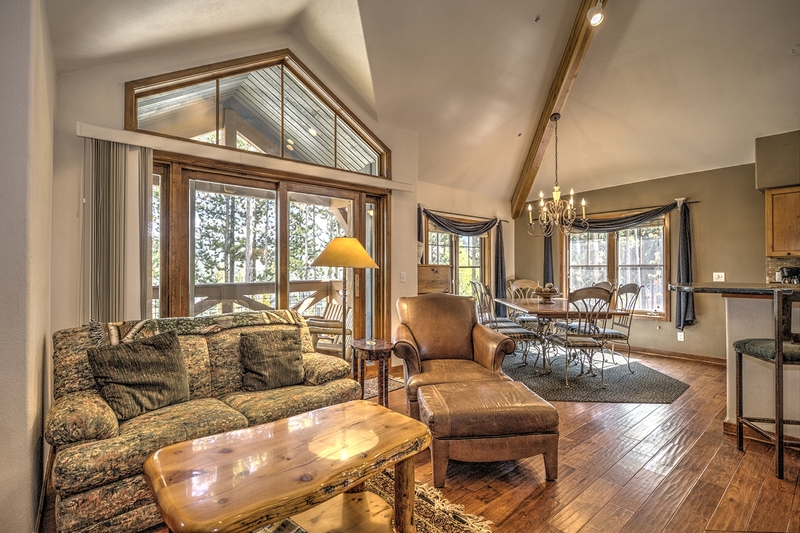 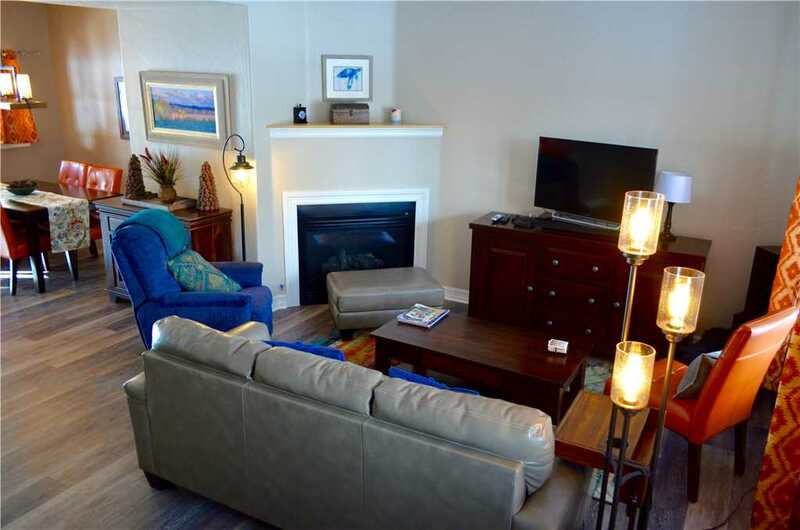 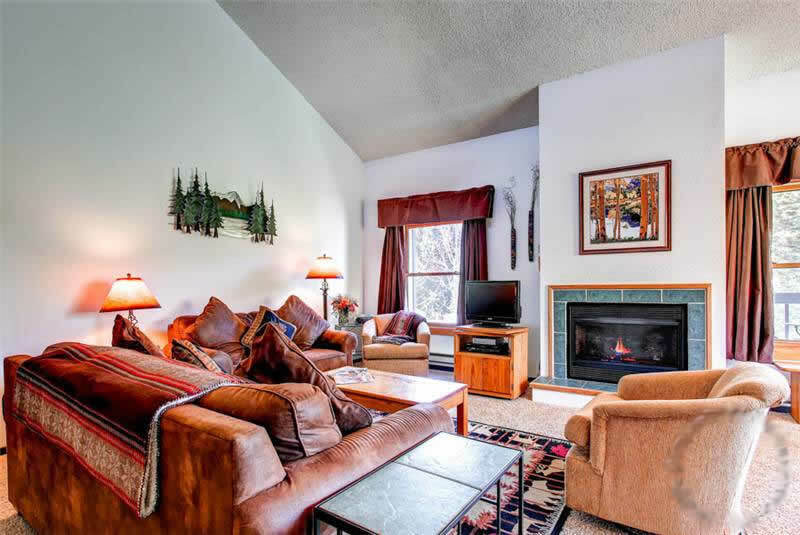 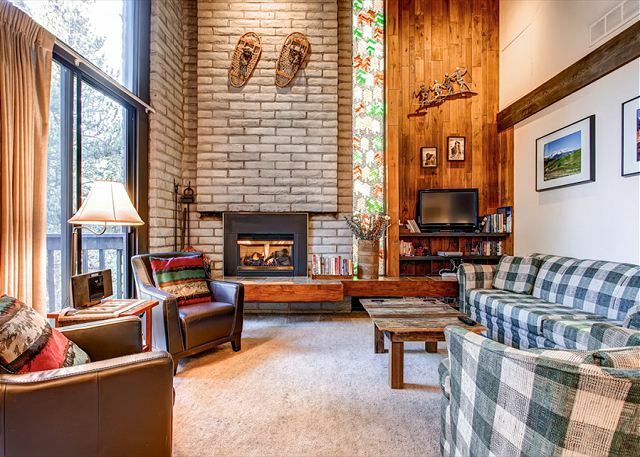 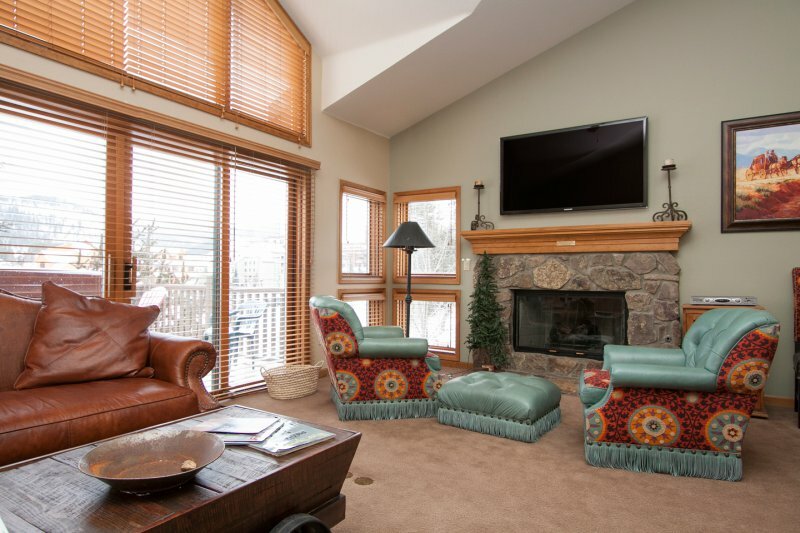 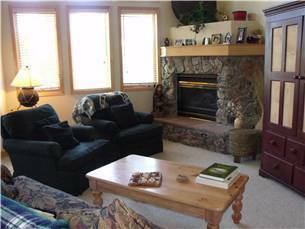 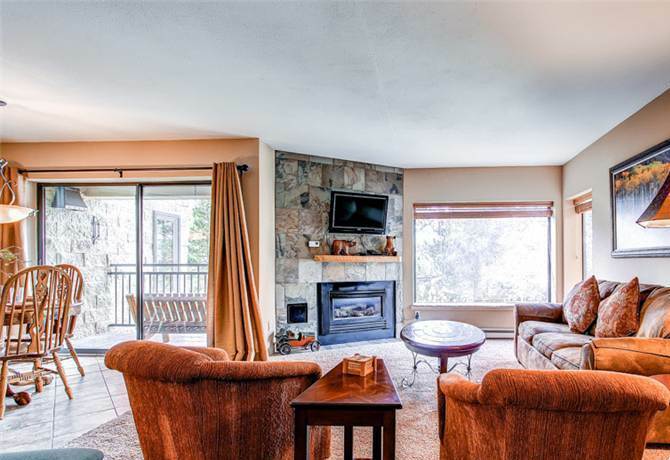 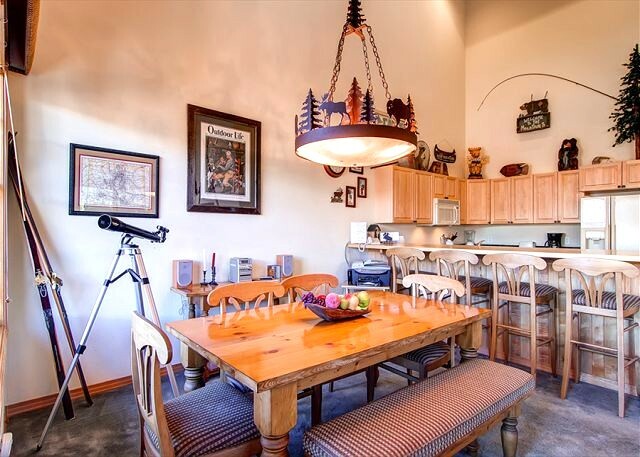 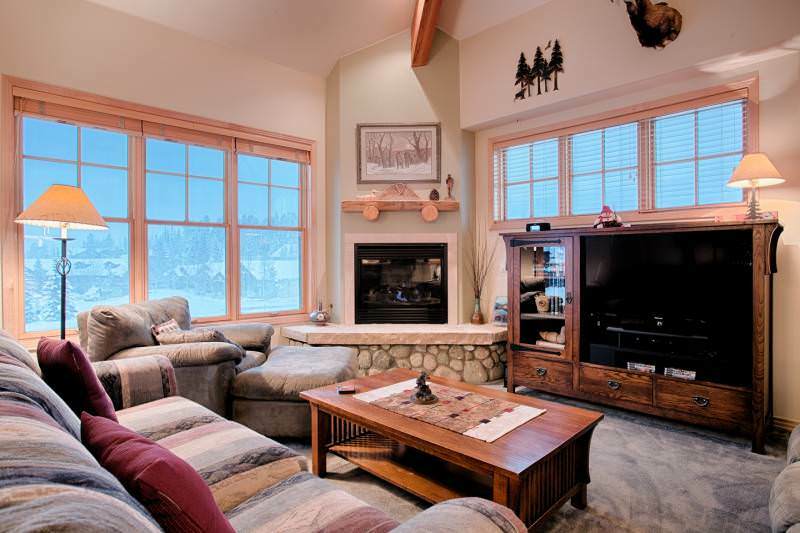 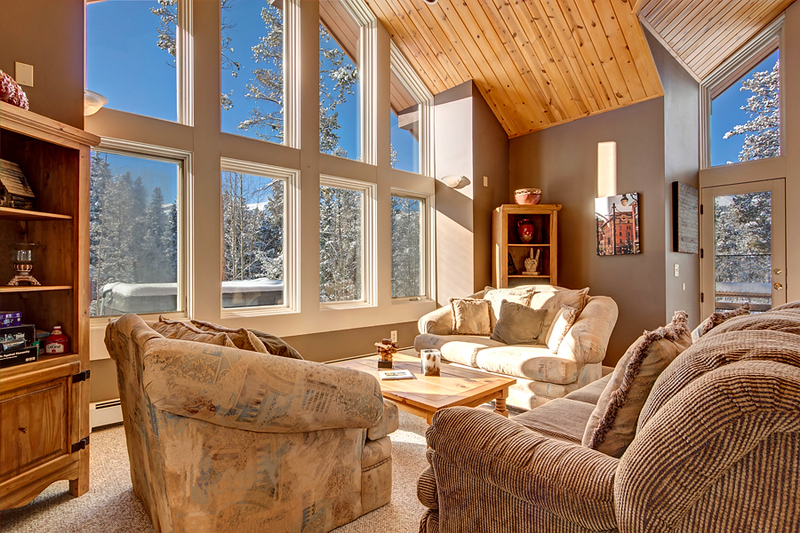 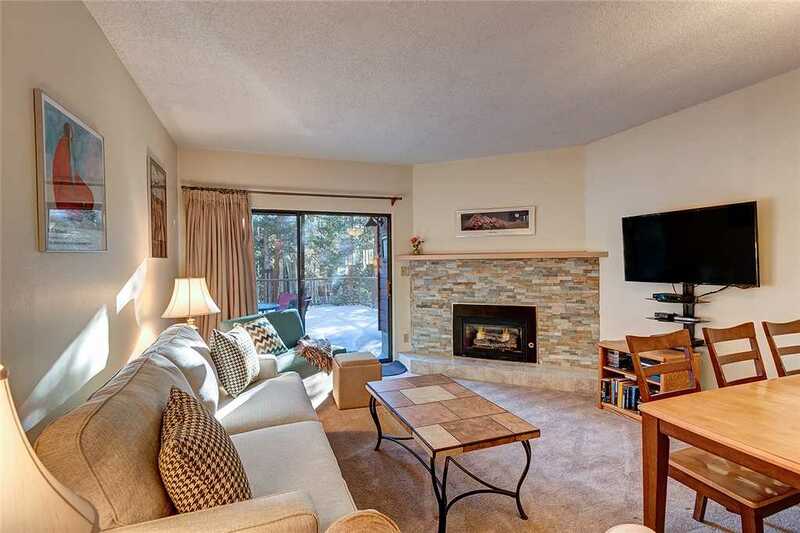 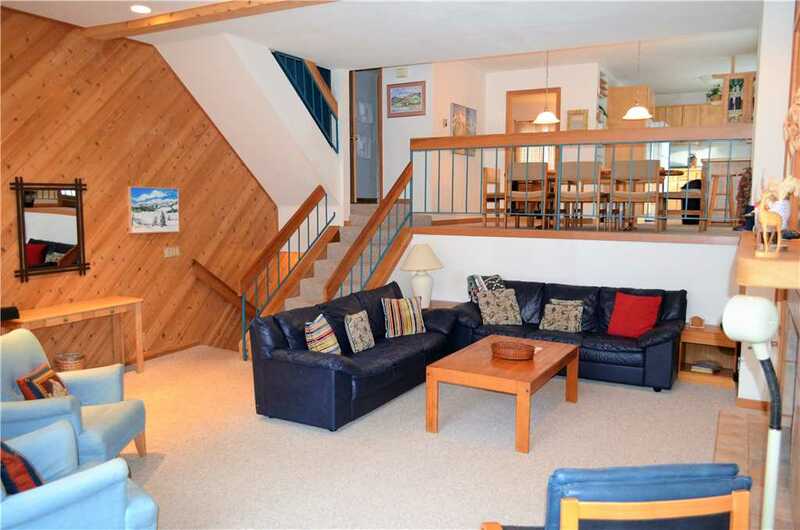 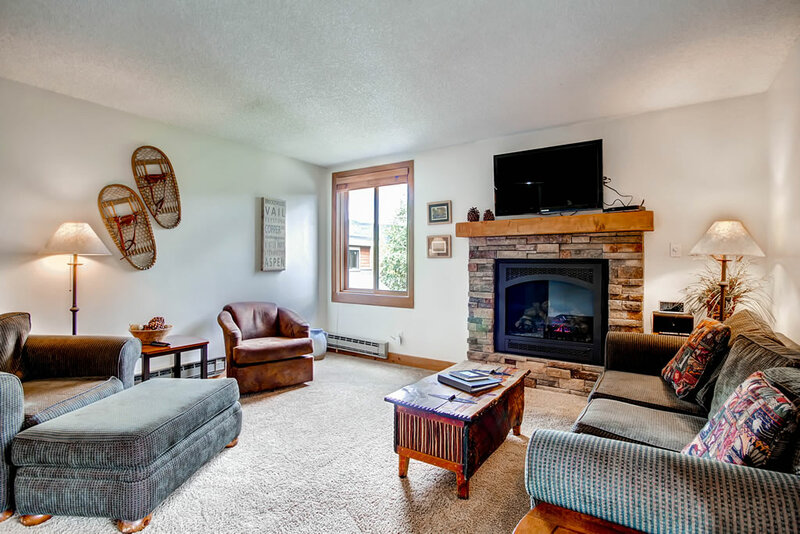 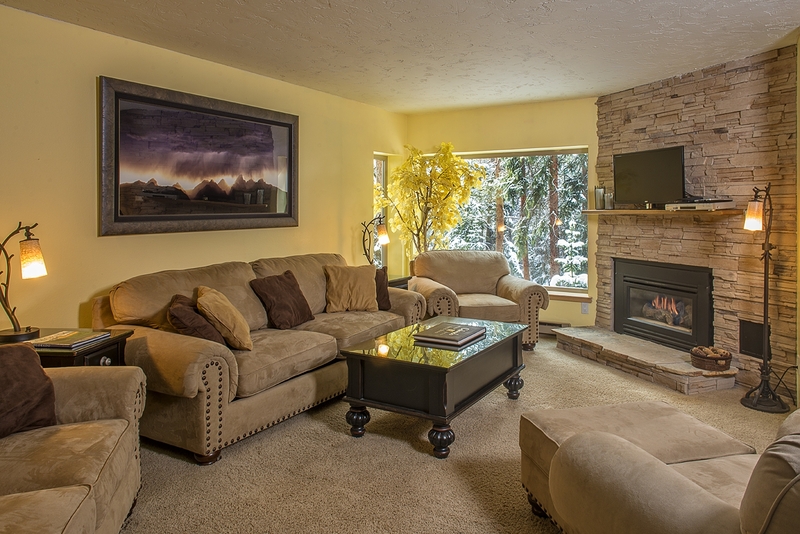 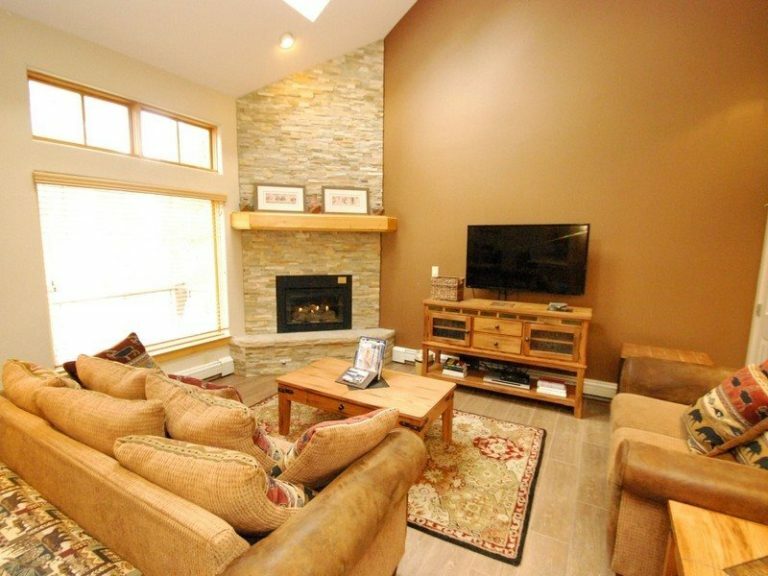 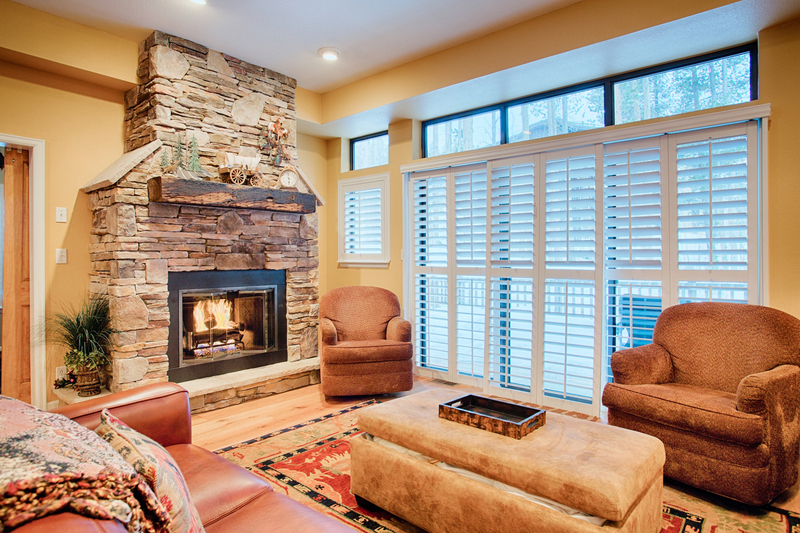 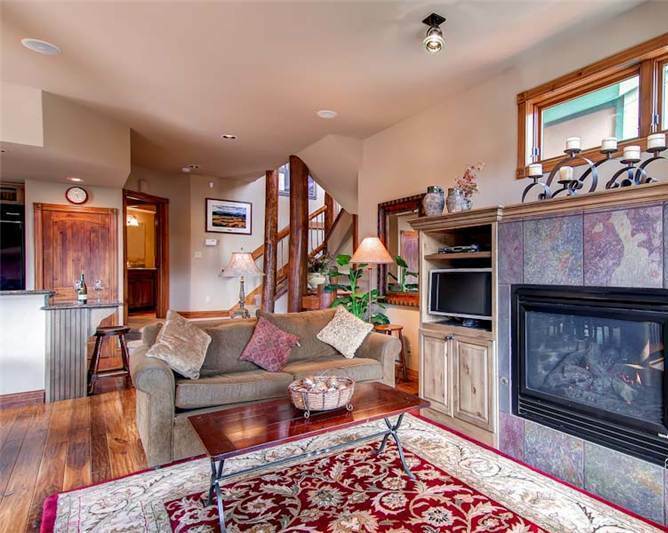 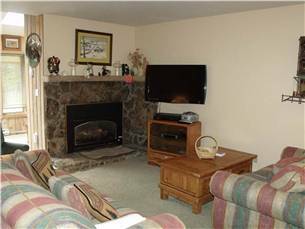 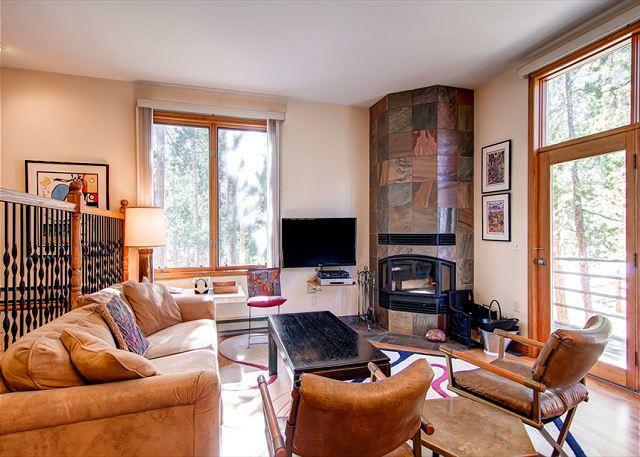 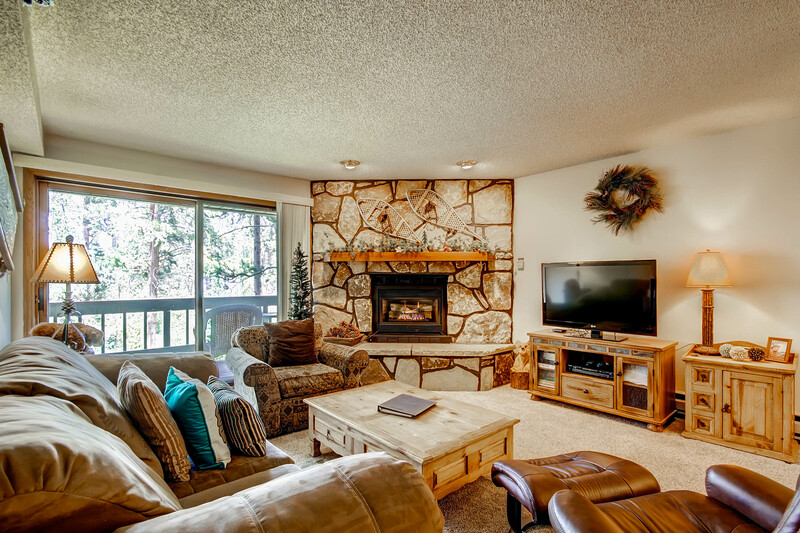 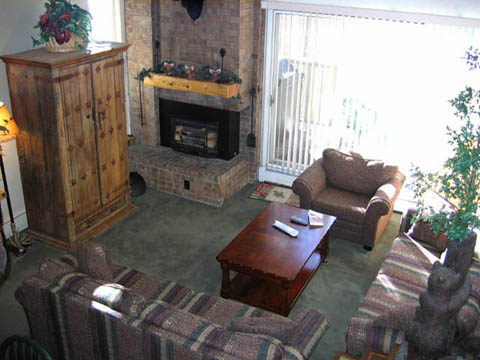 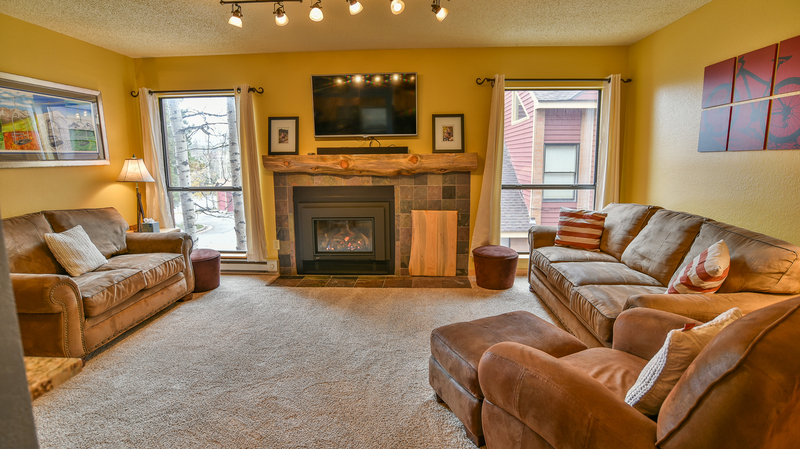 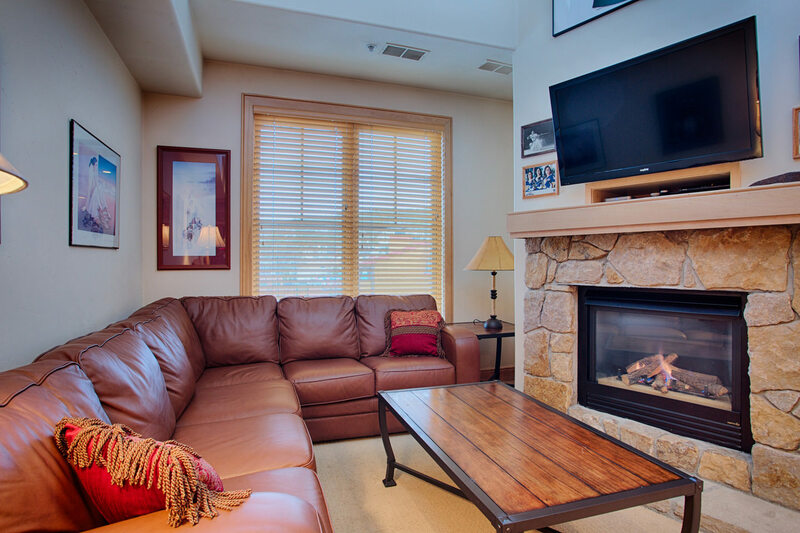 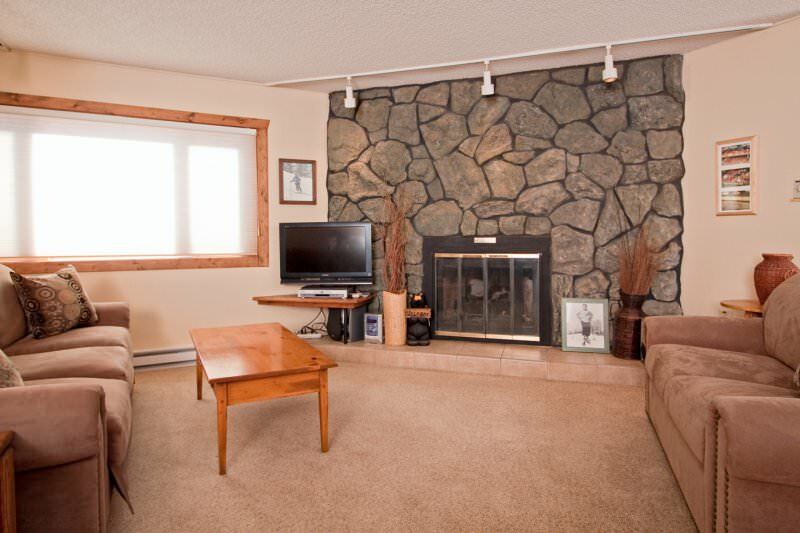 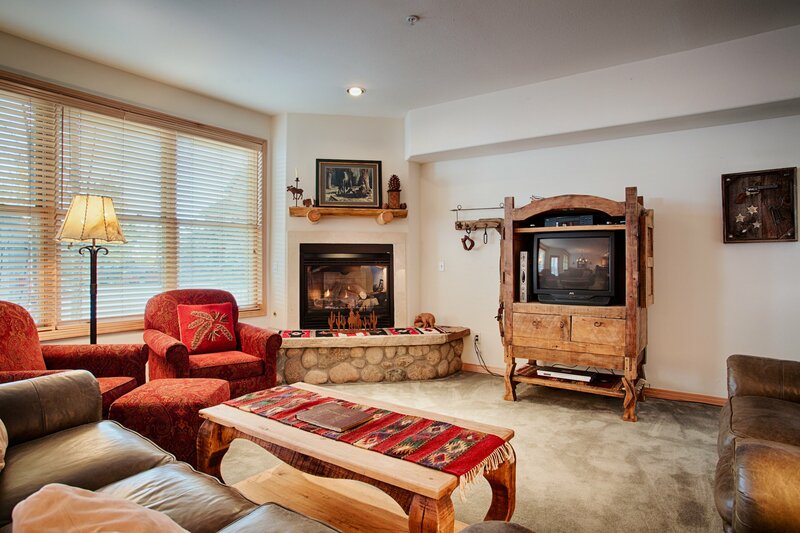 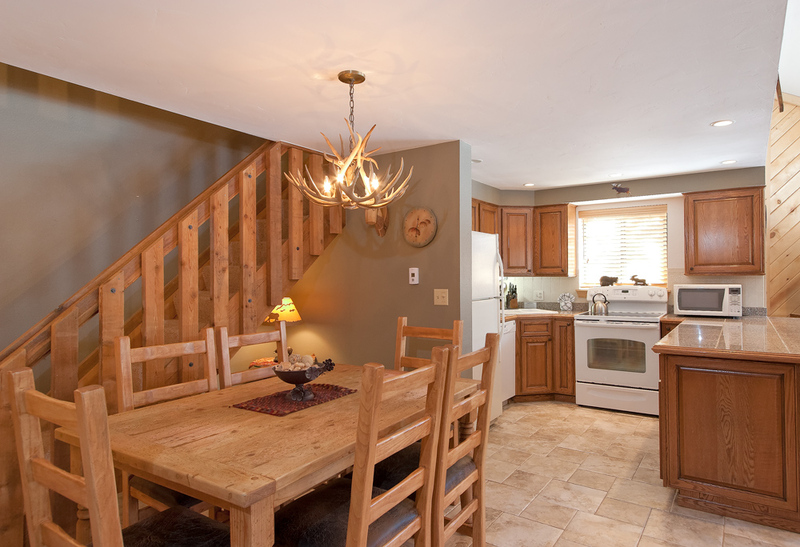 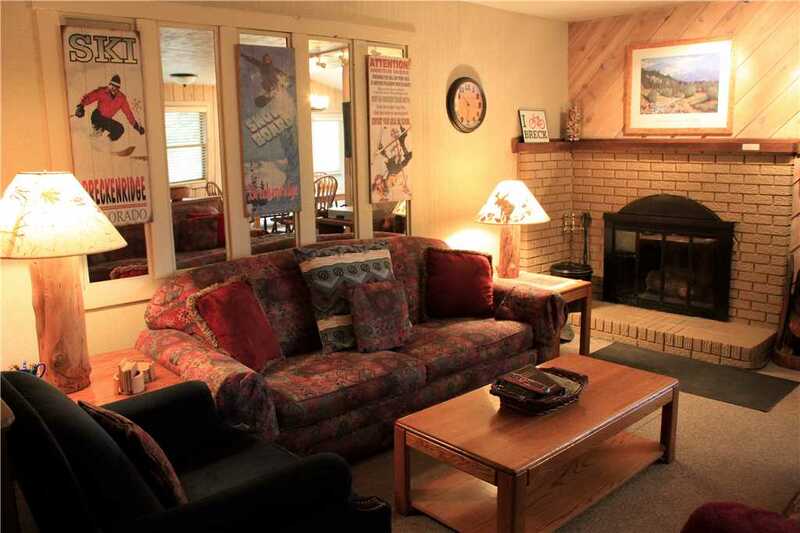 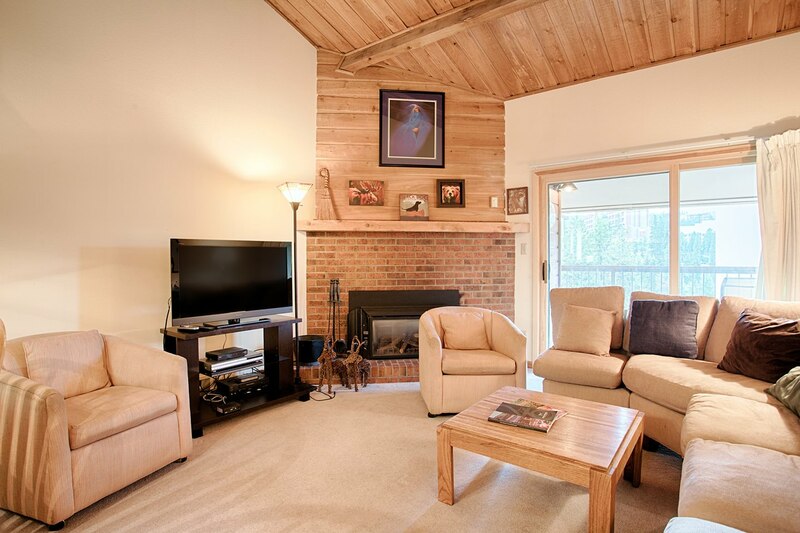 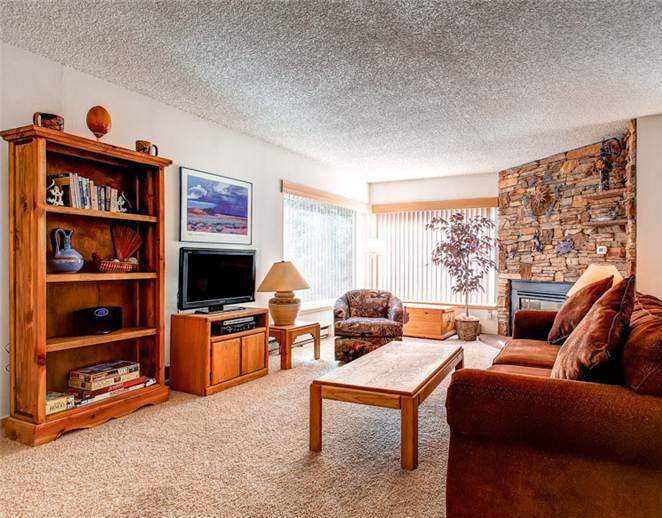 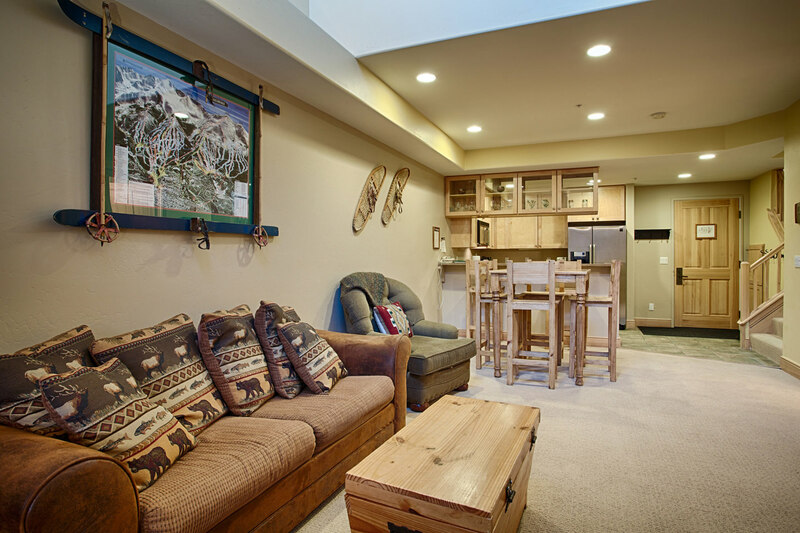 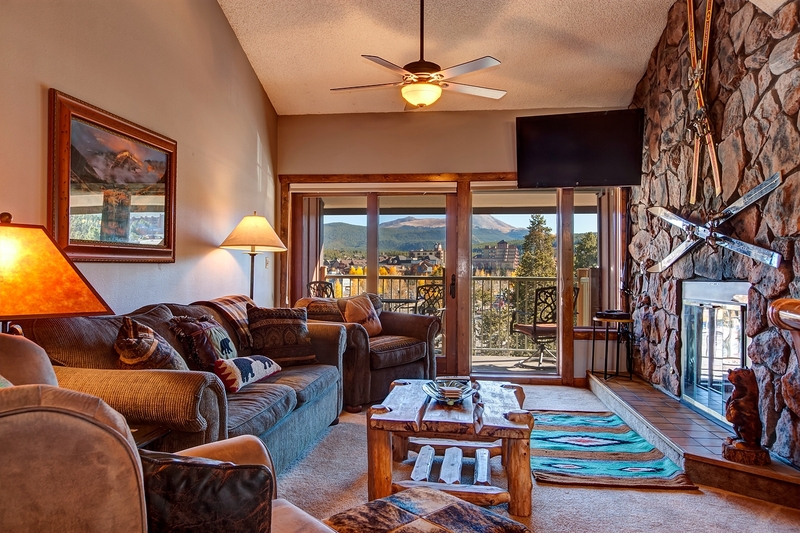 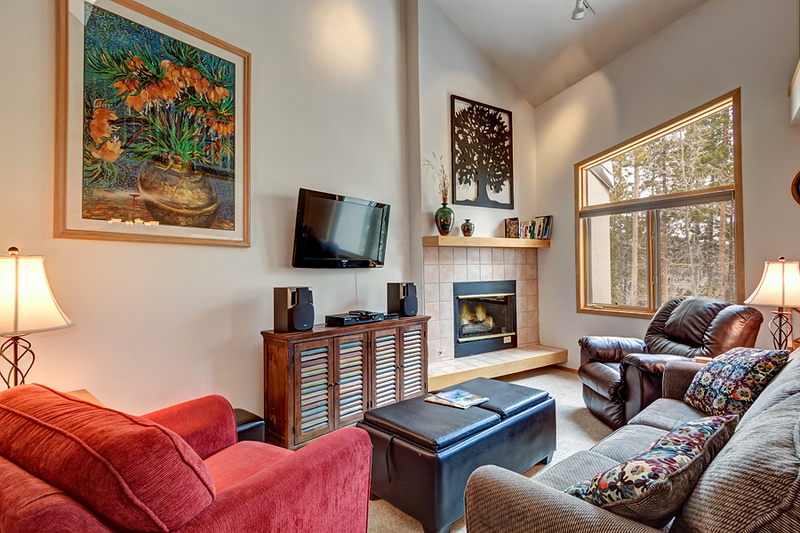 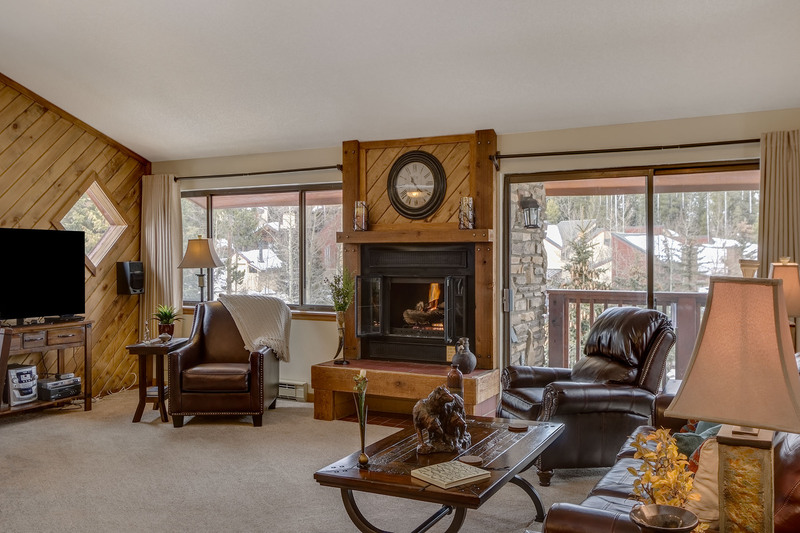 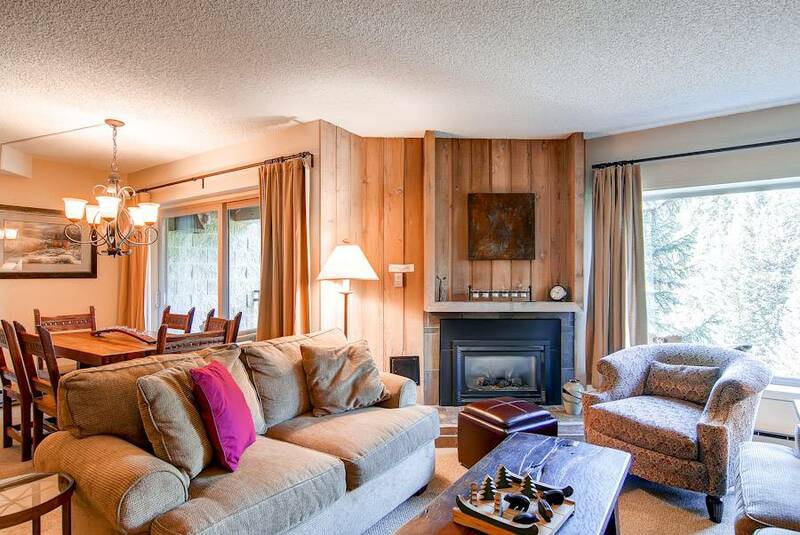 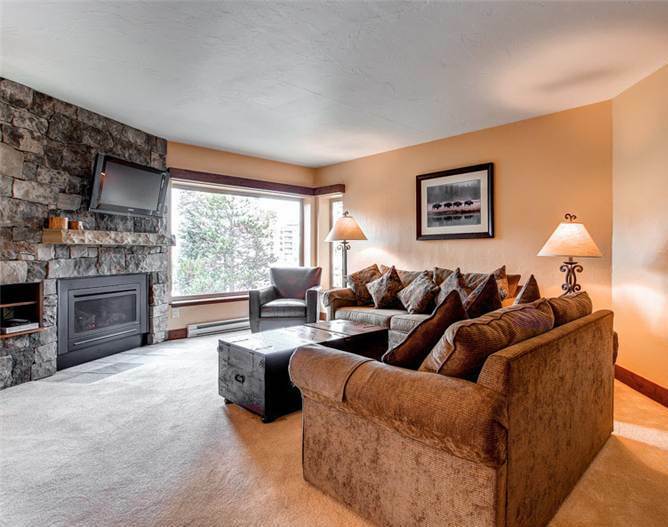 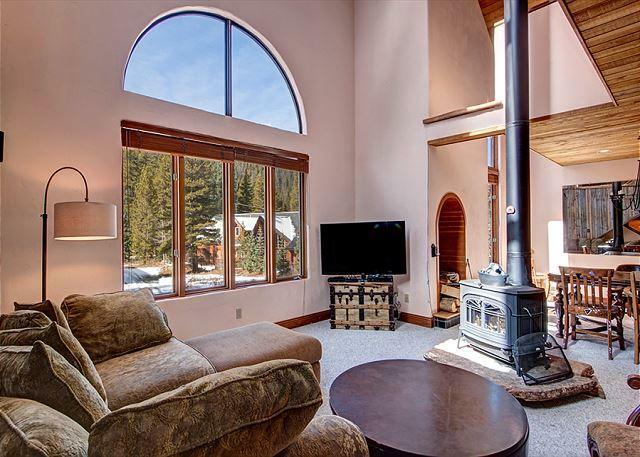 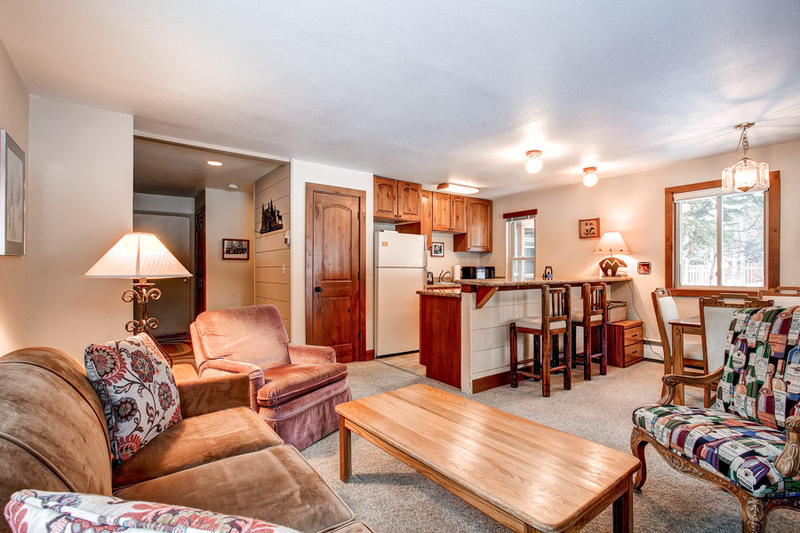 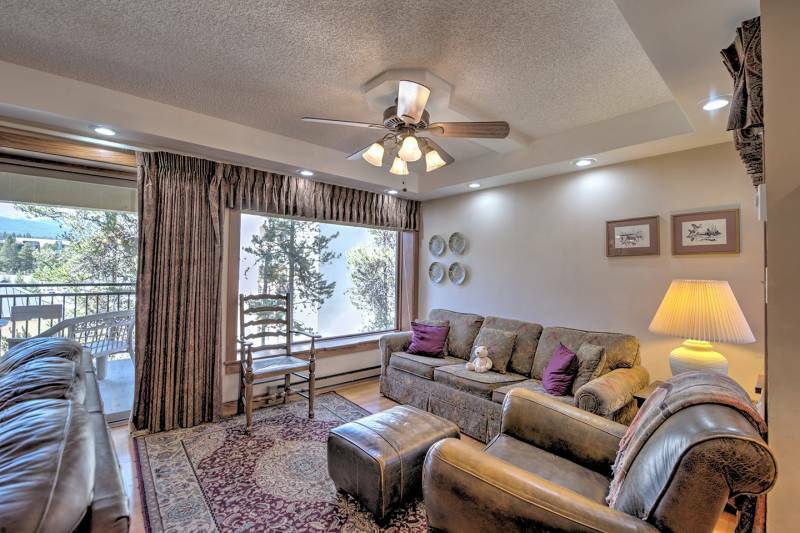 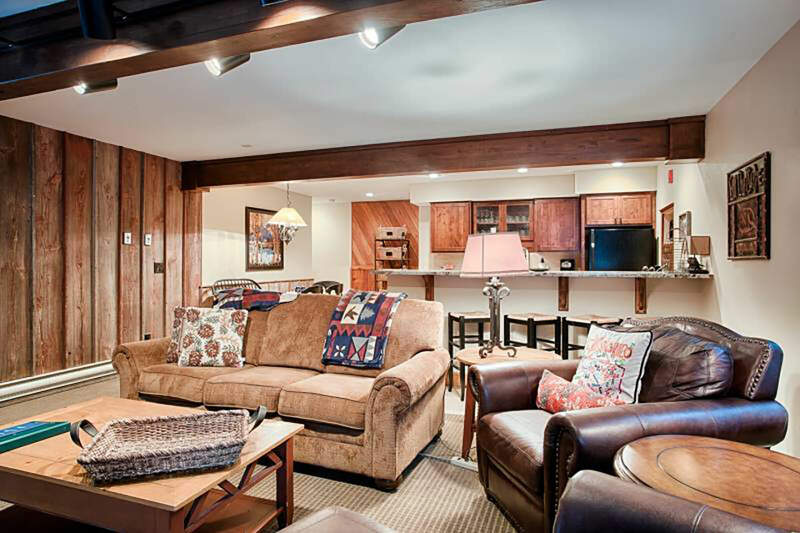 This mountain inspired condo is tastefully decorated throughout and if your vacation would be complete ending your day curled up in front of a warm gas fireplace then look no further because you have found the perfect getaway. 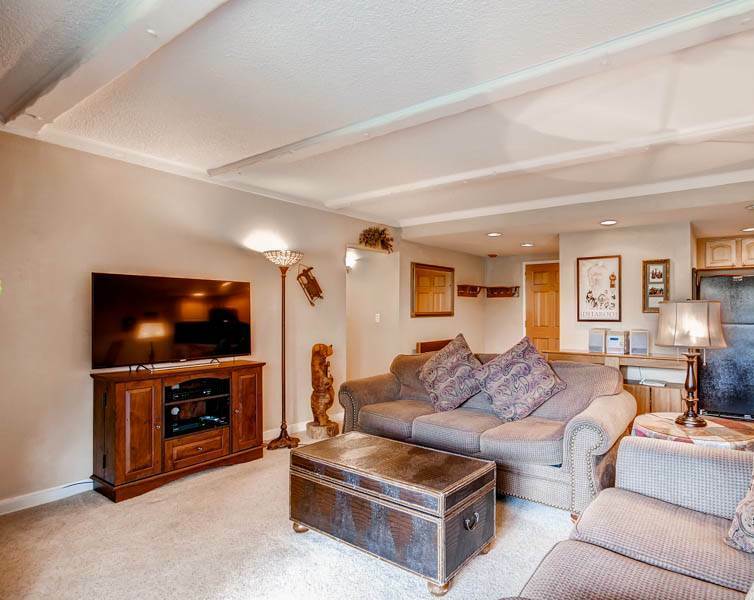 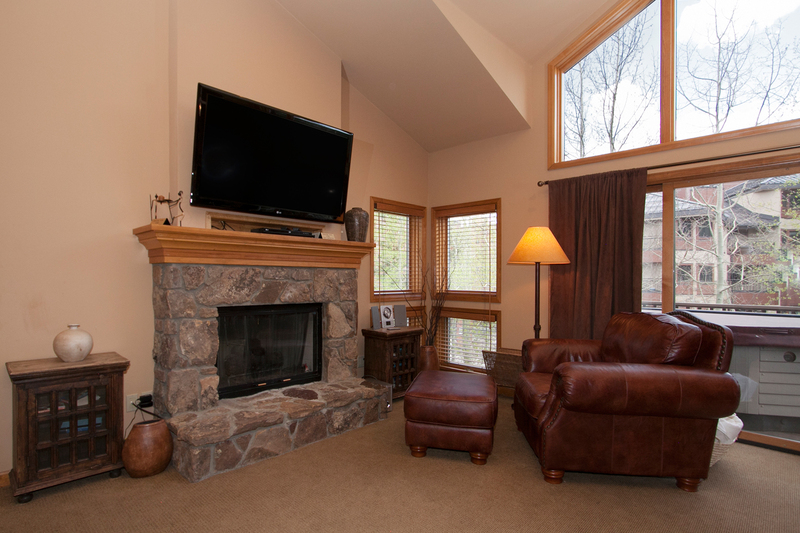 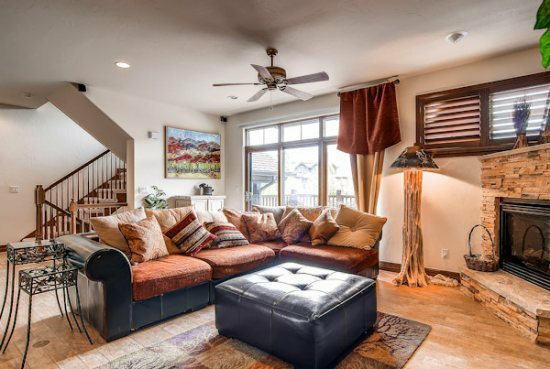 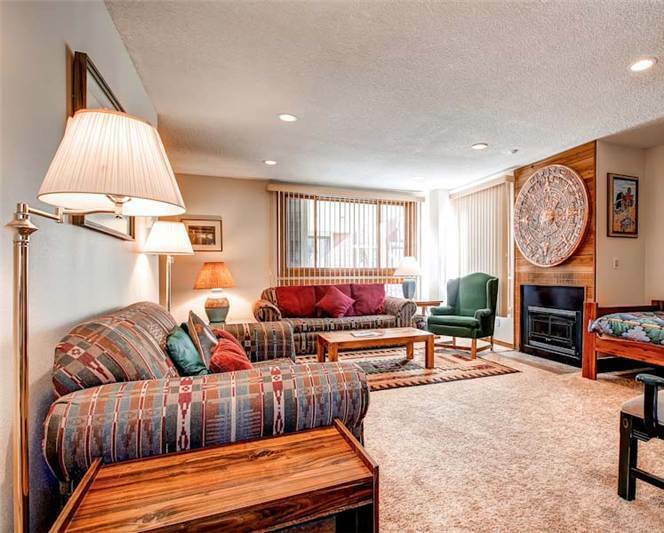 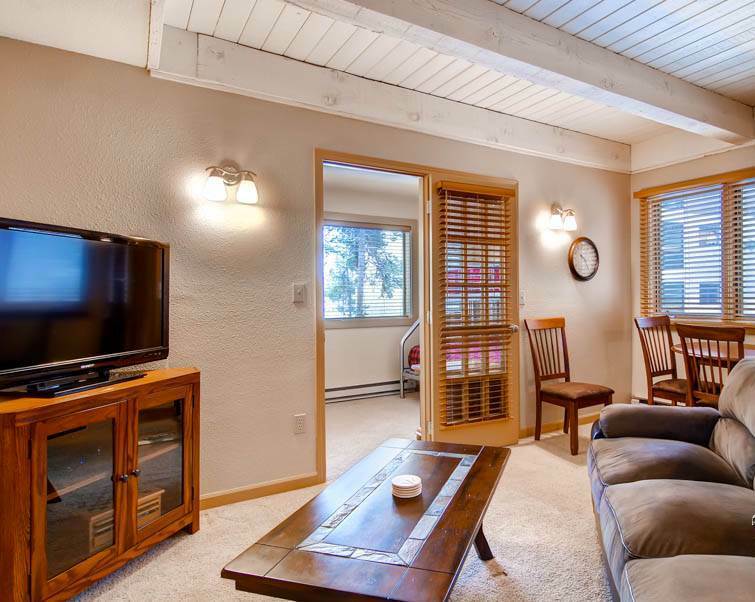 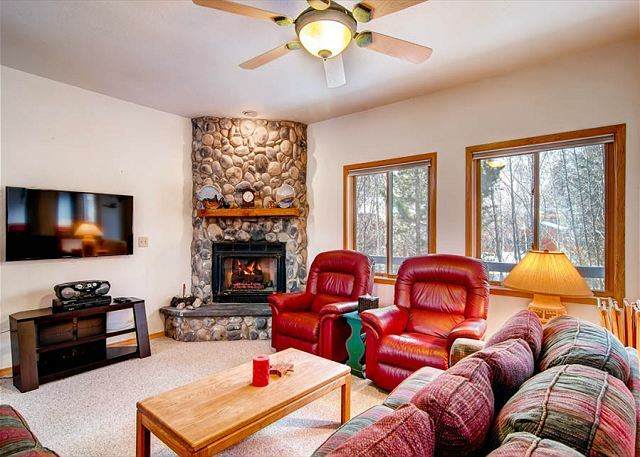 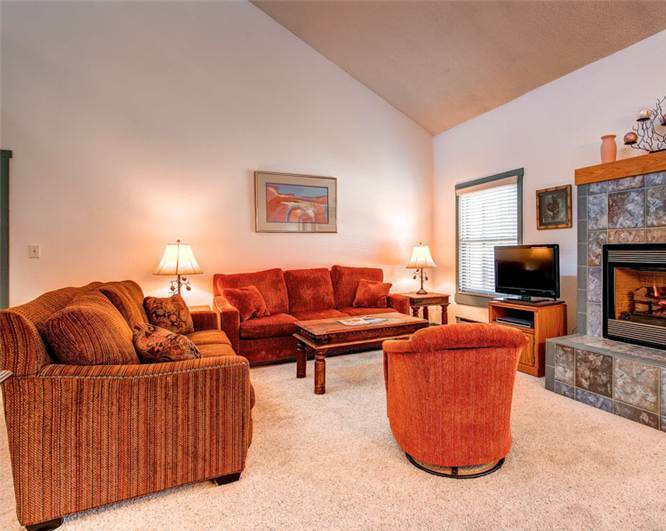 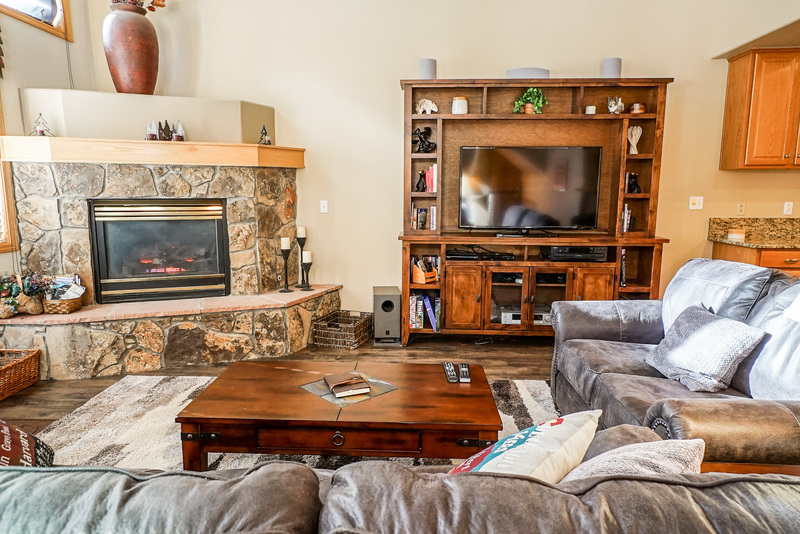 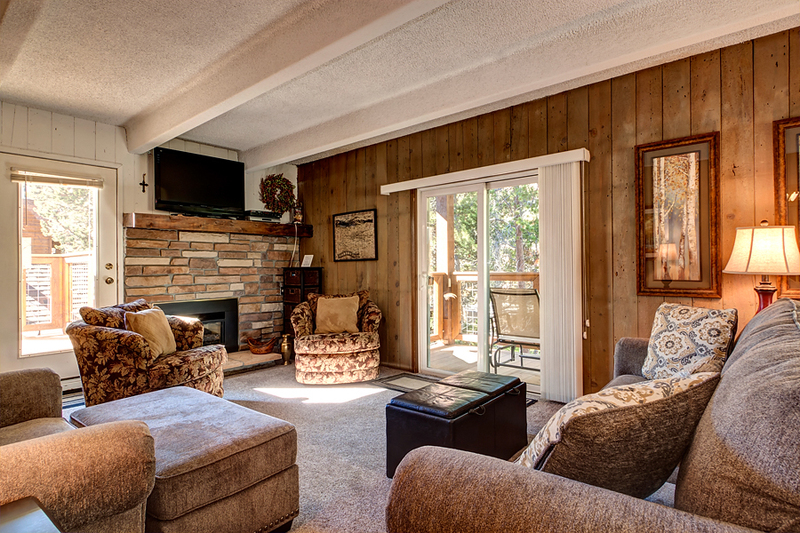 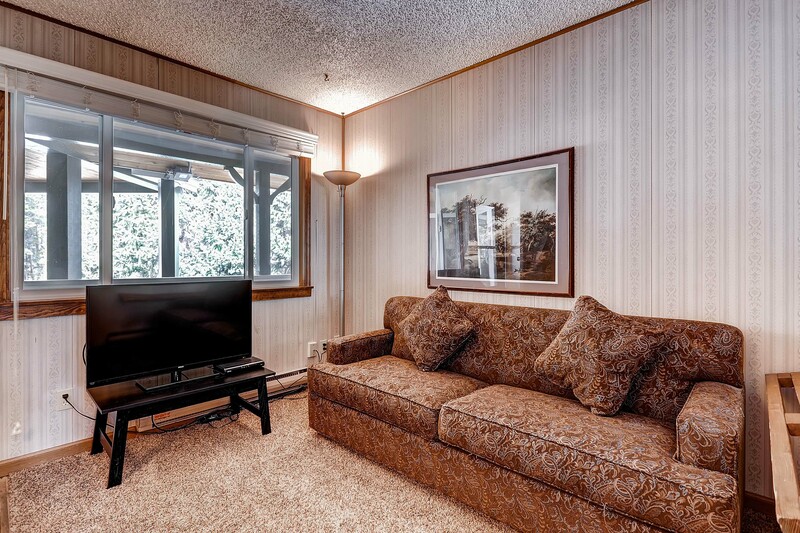 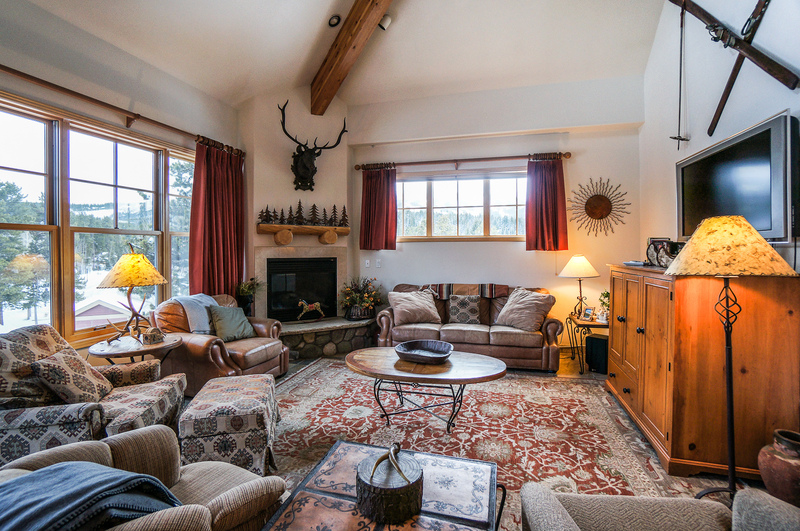 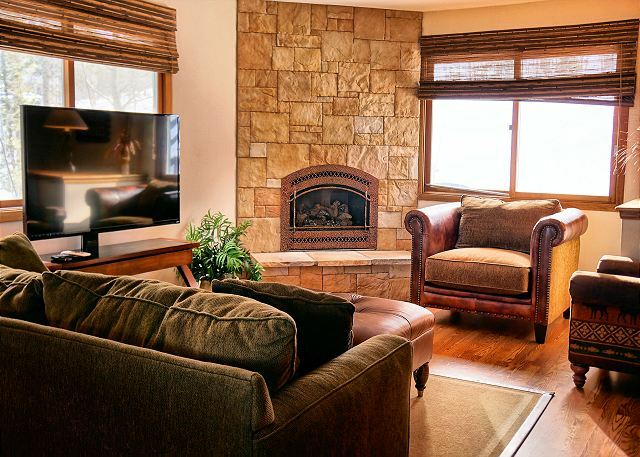 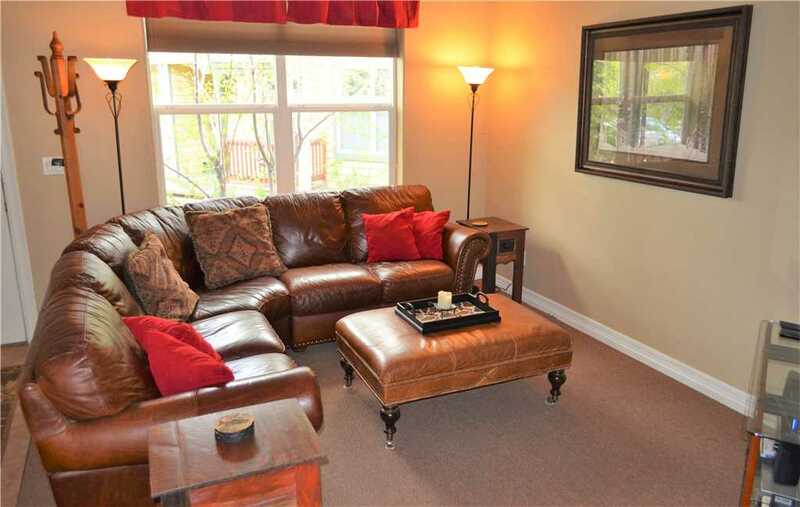 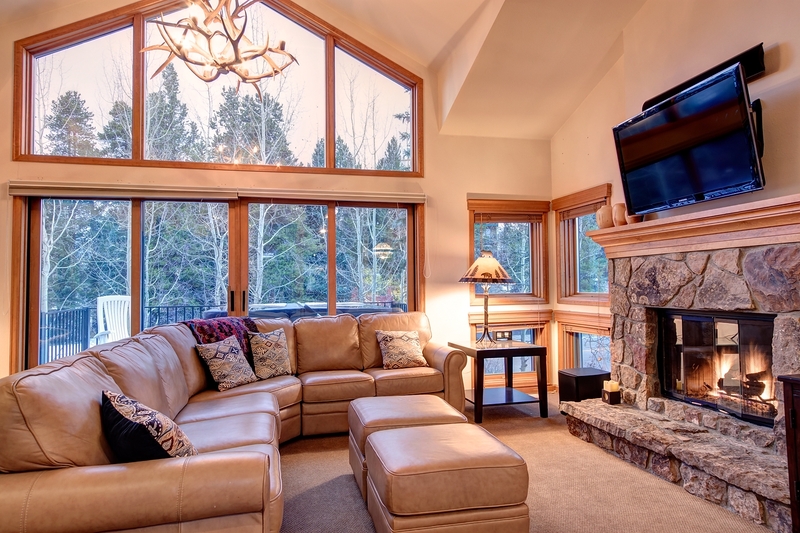 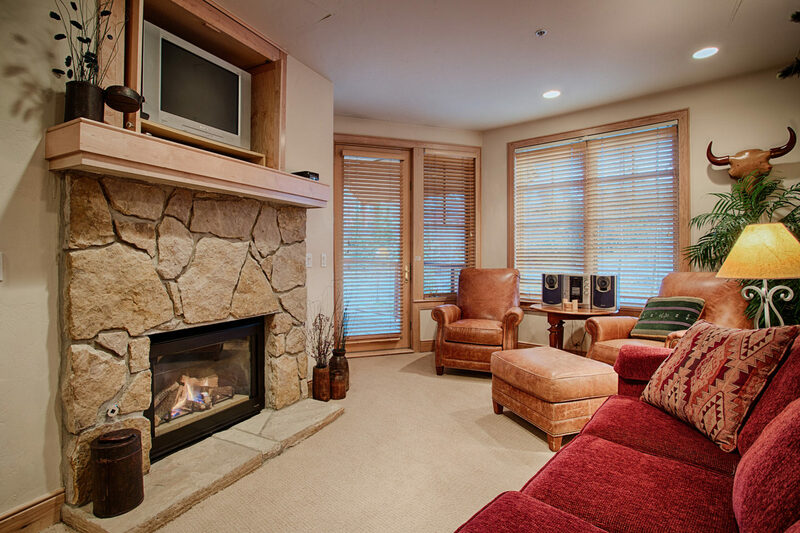 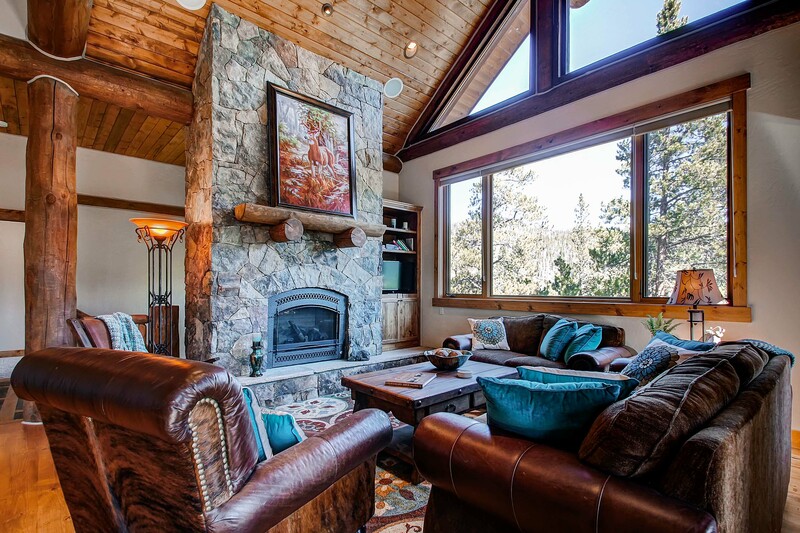 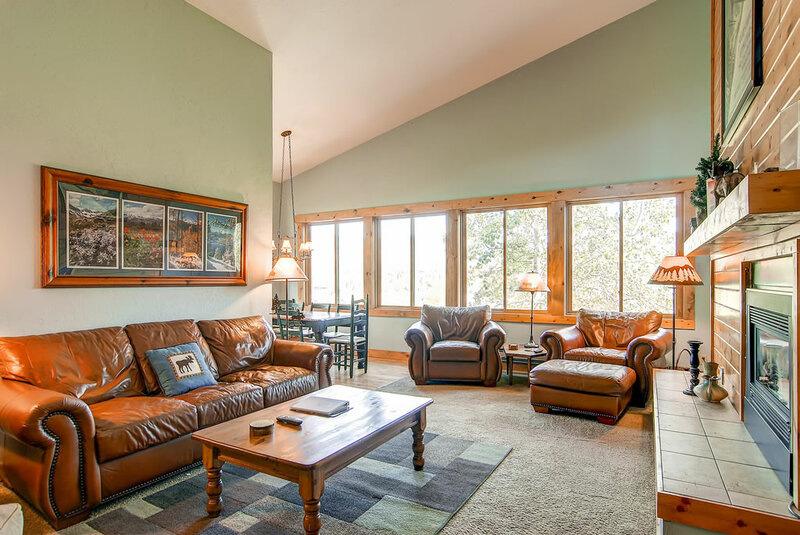 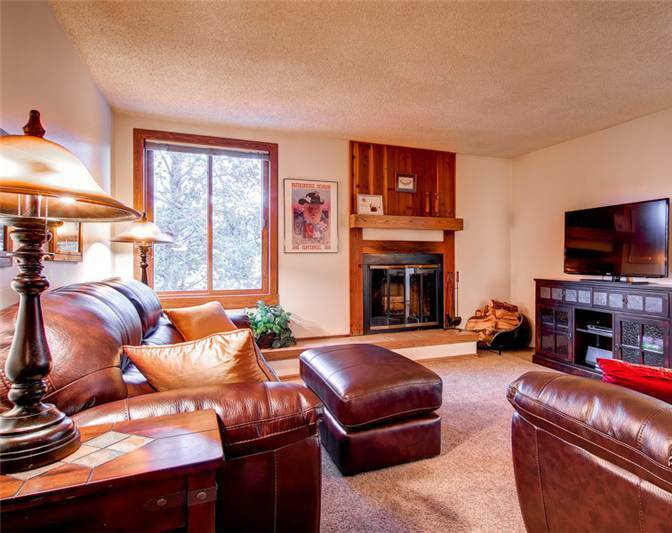 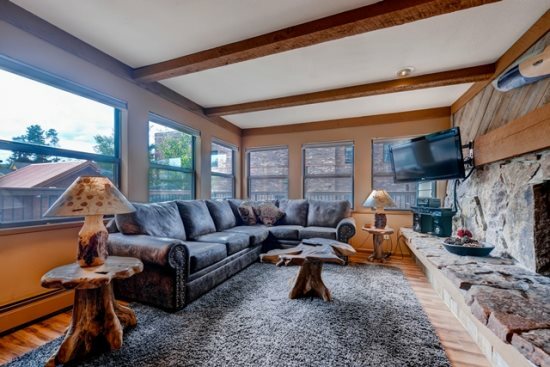 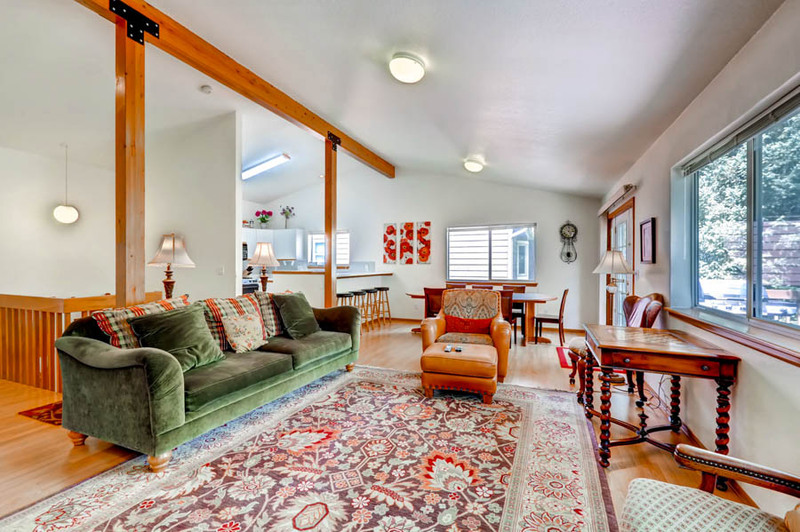 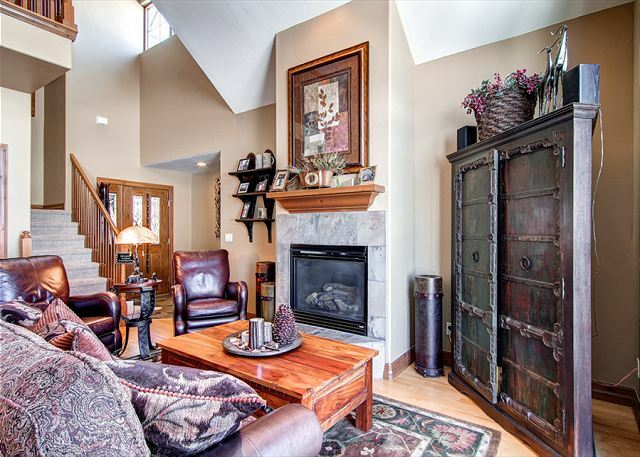 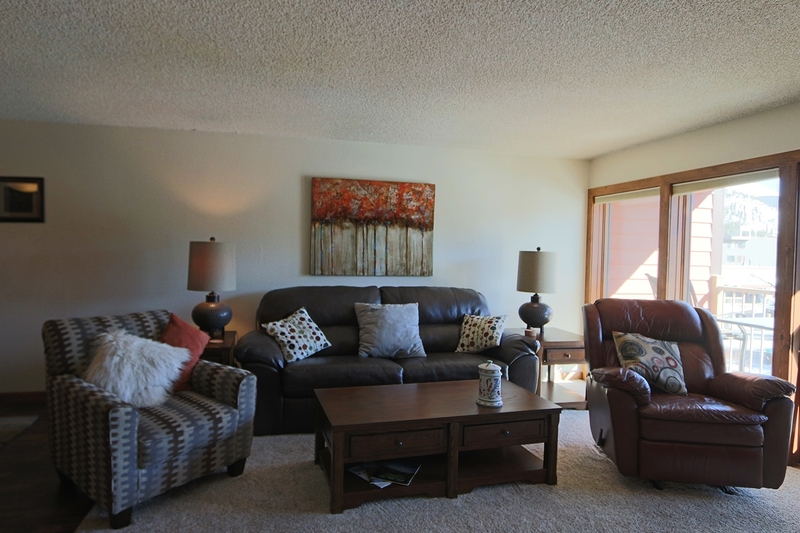 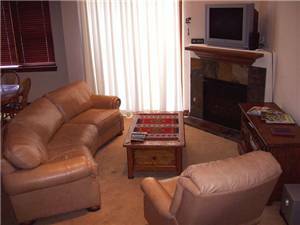 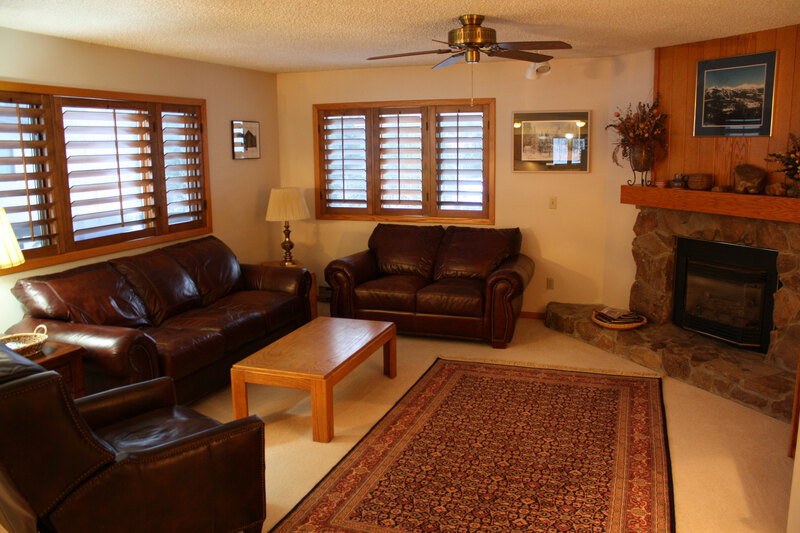 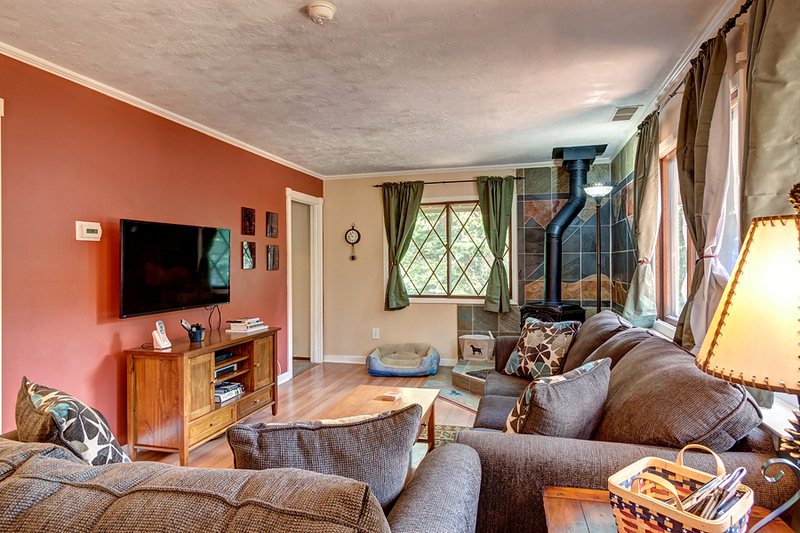 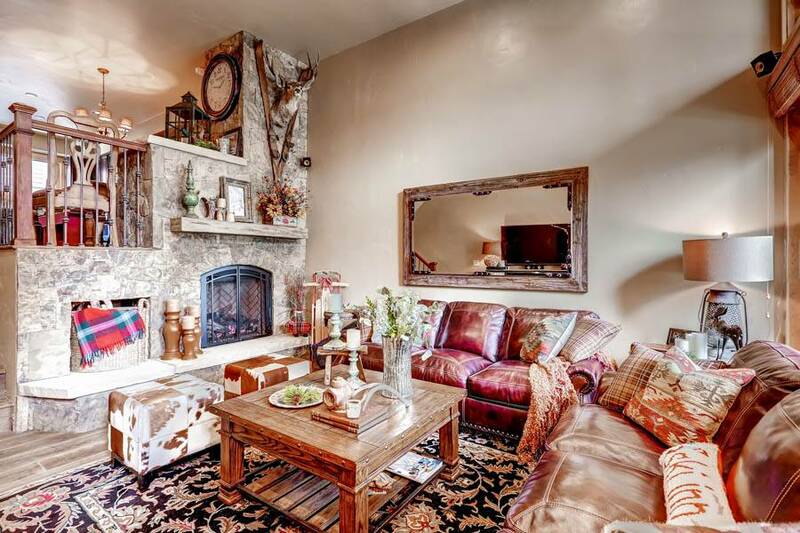 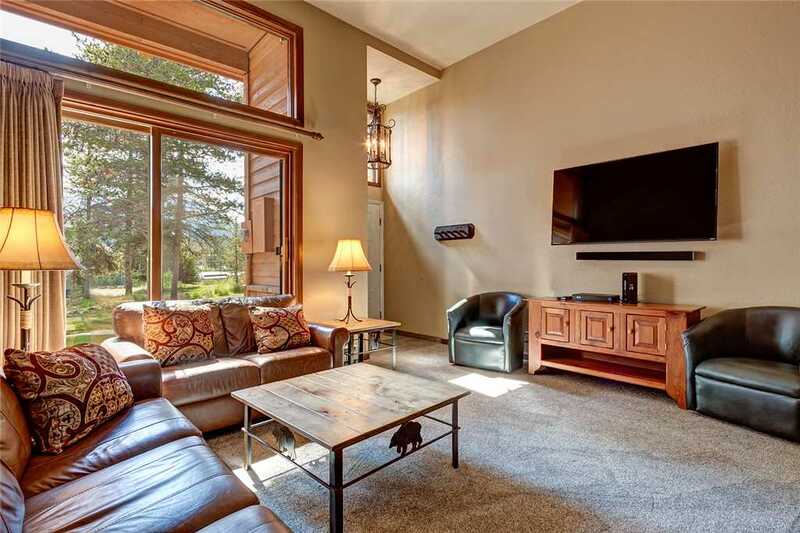 The inviting living room offers a large, L-shaped leather couch and cowhide side chair to relax & enjoy your favorite show on the 40″ flat screen TV. 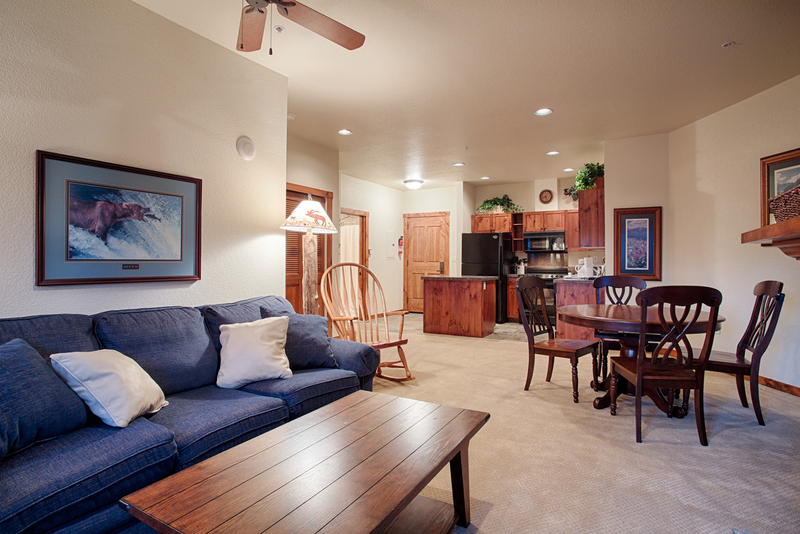 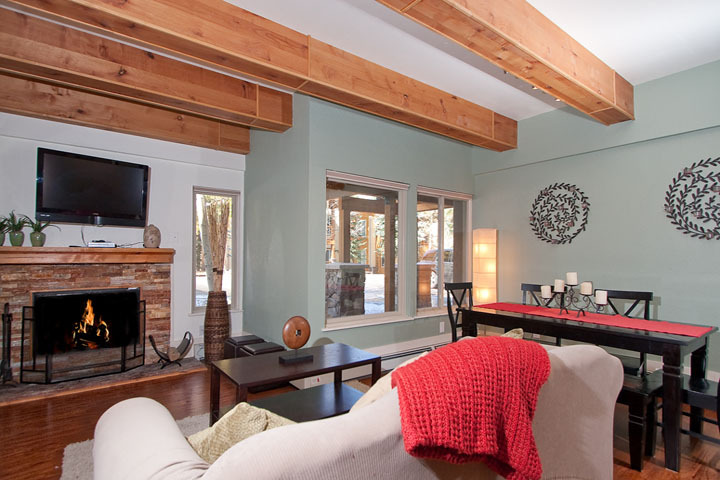 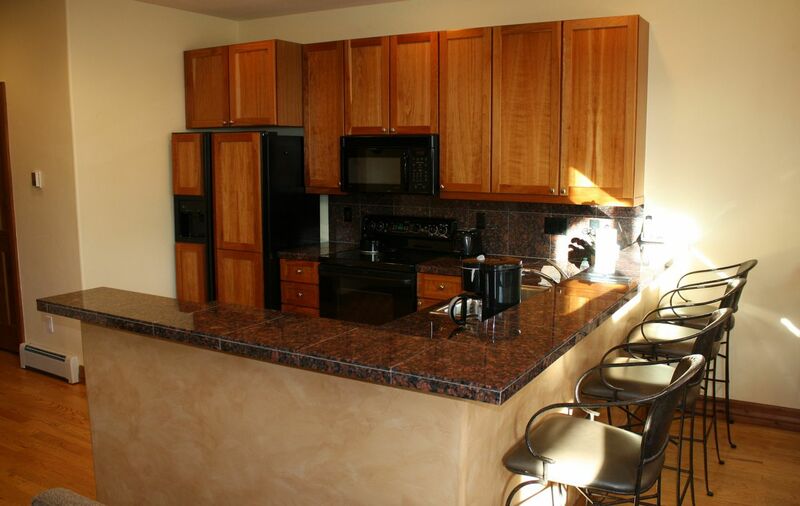 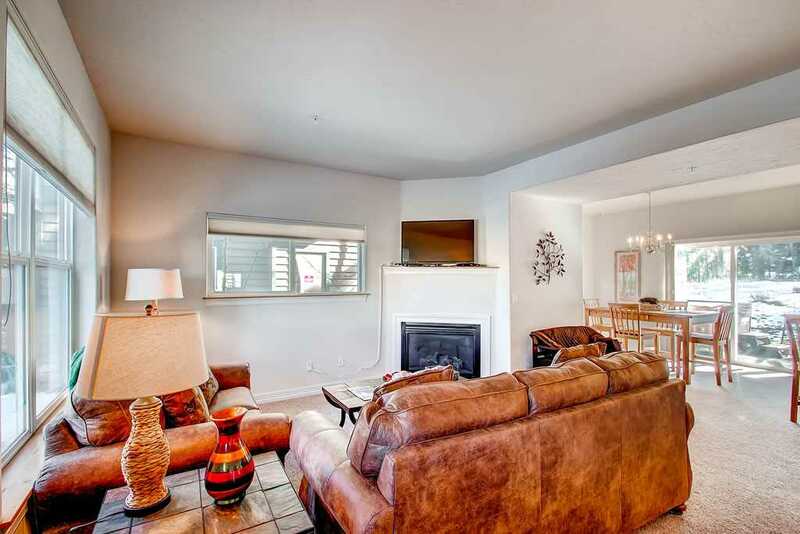 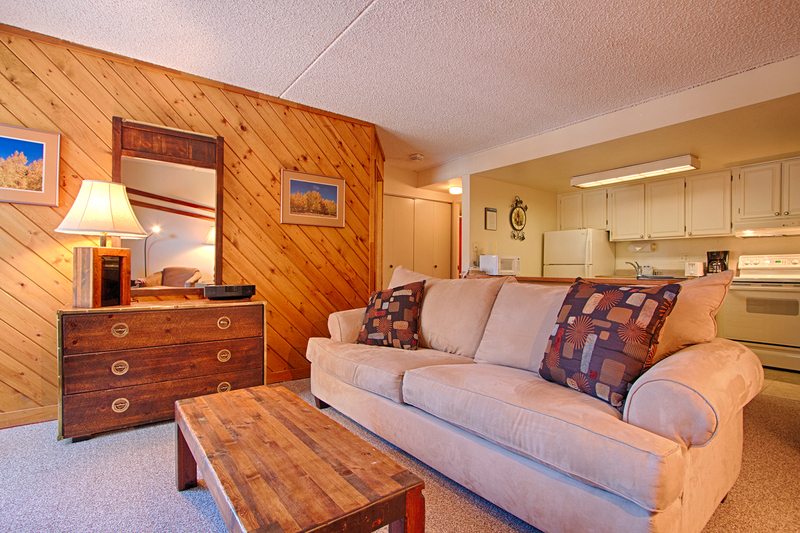 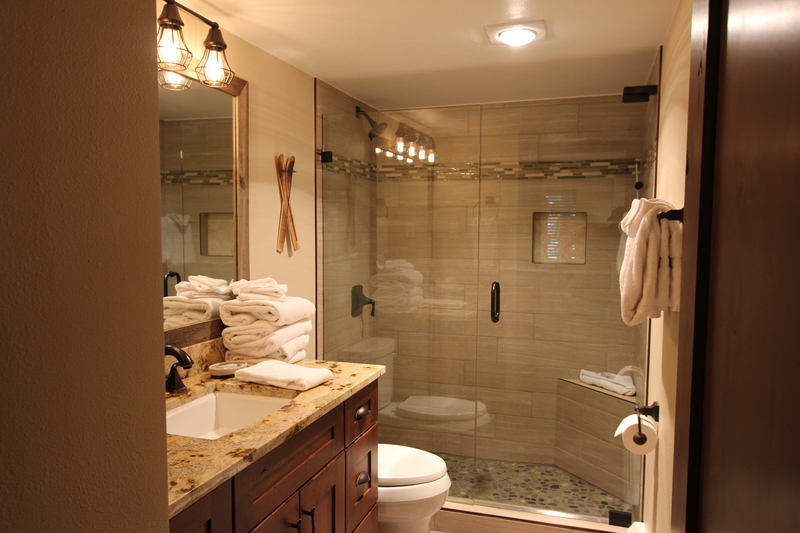 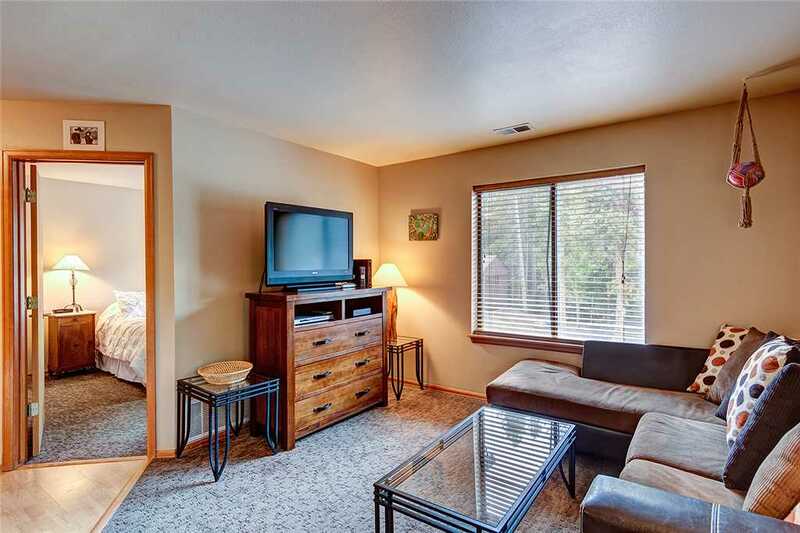 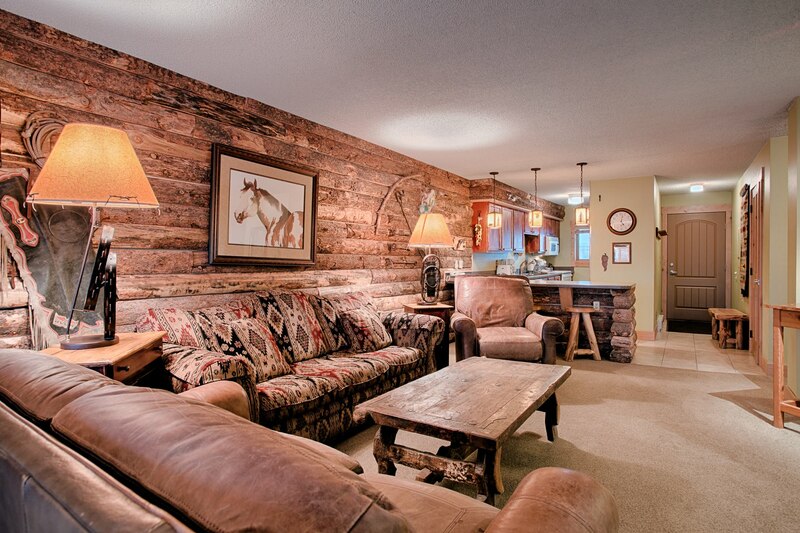 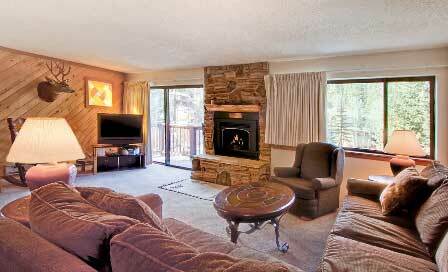 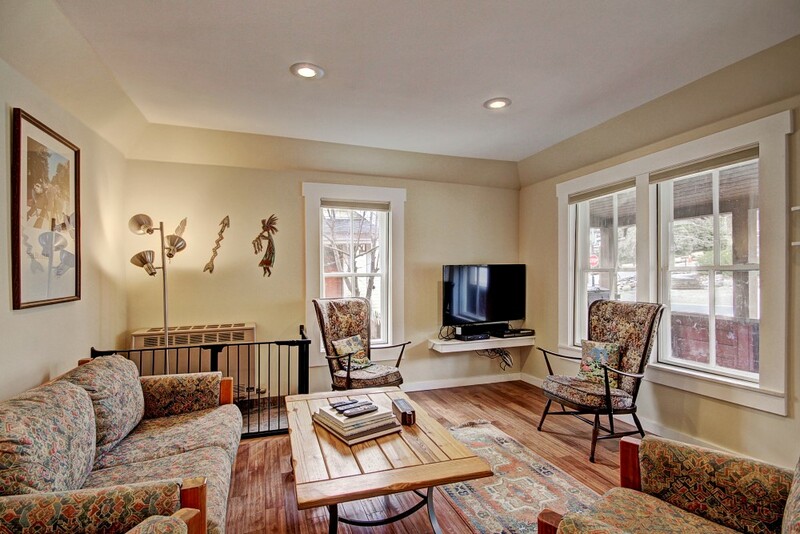 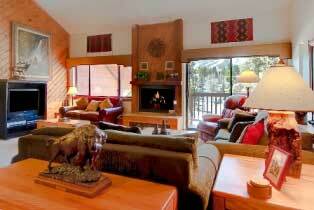 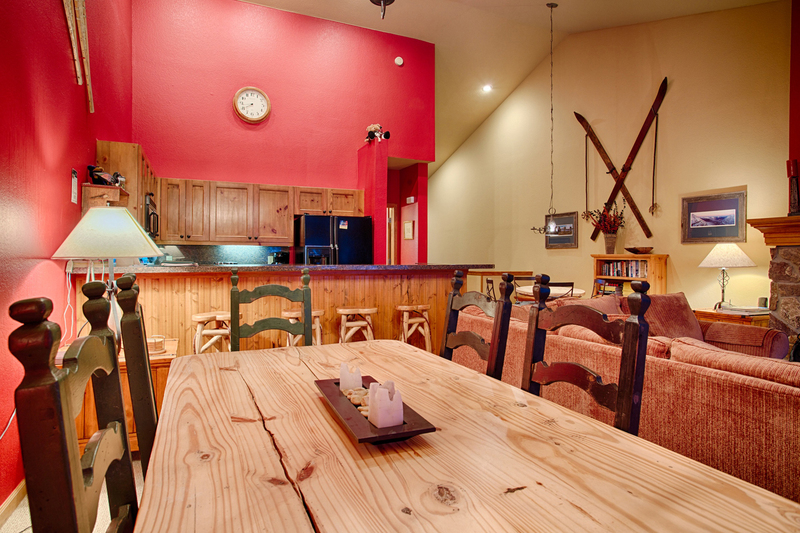 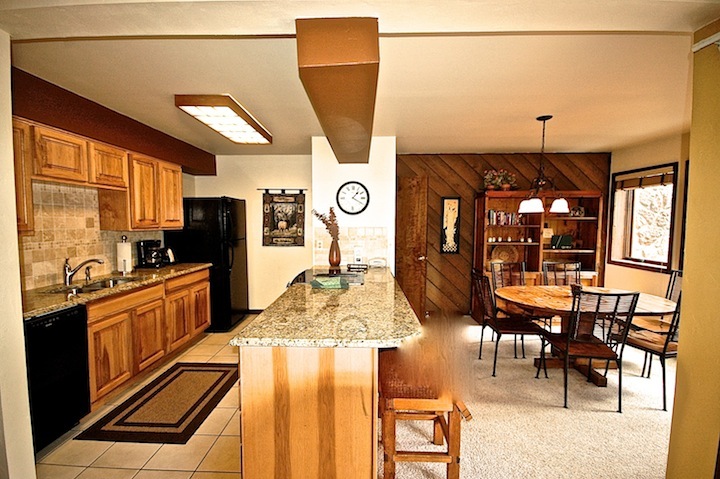 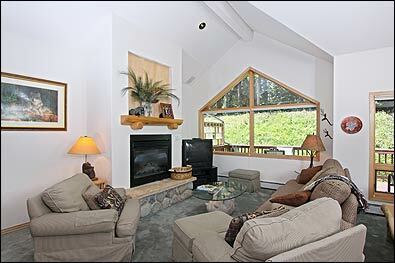 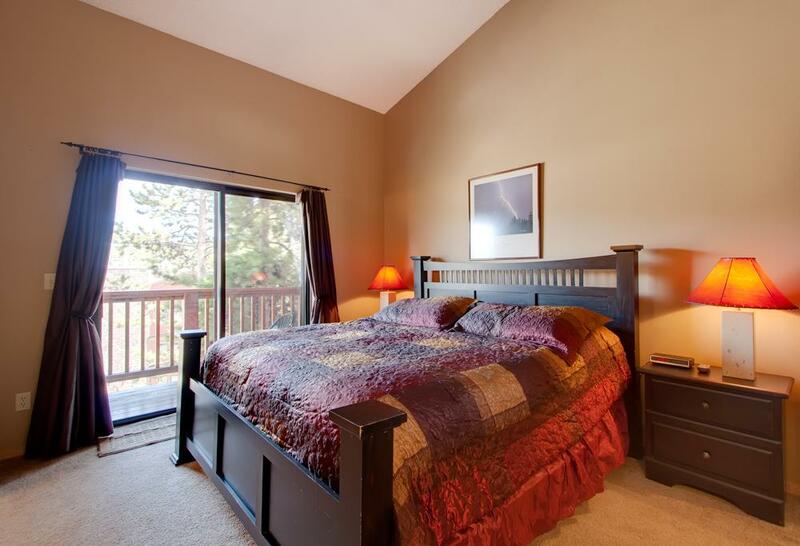 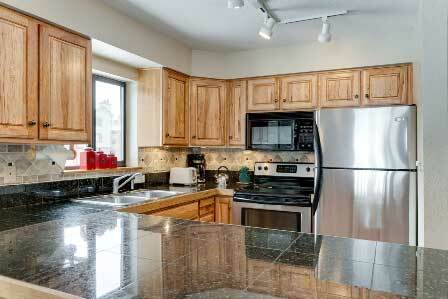 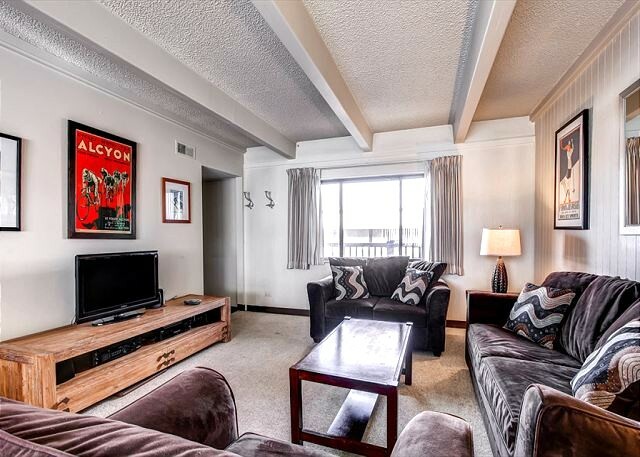 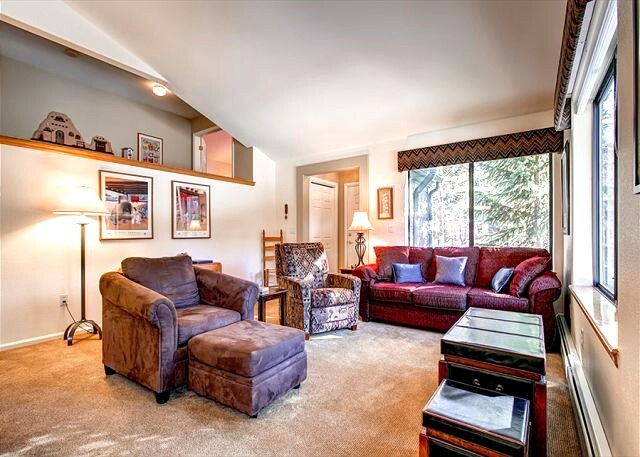 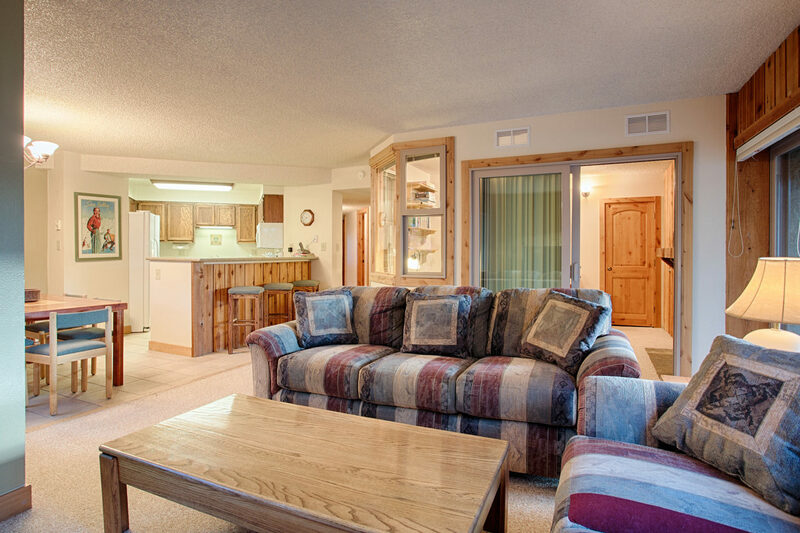 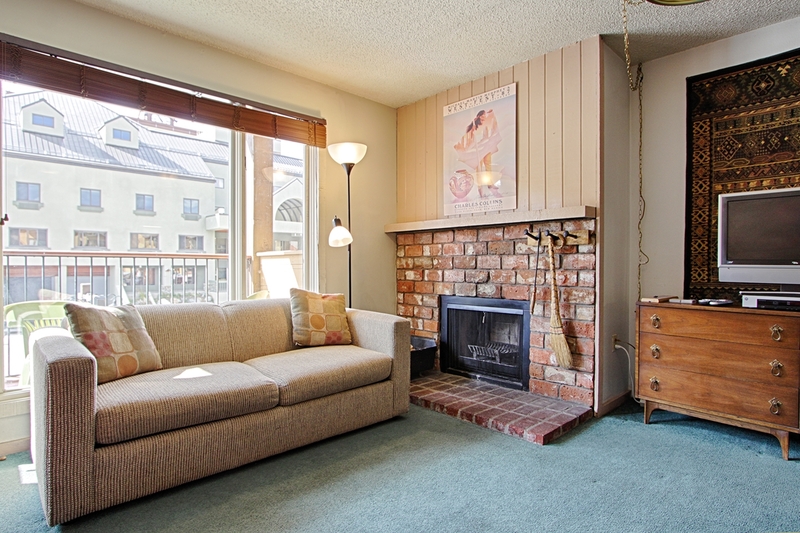 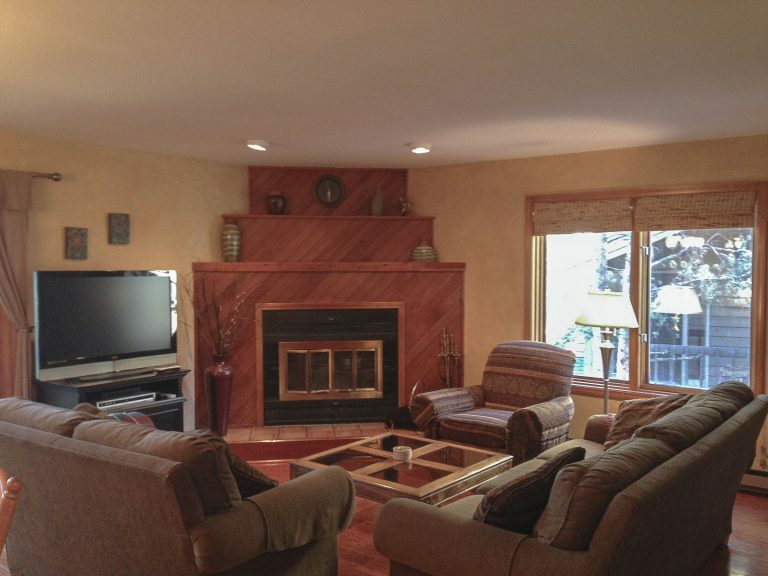 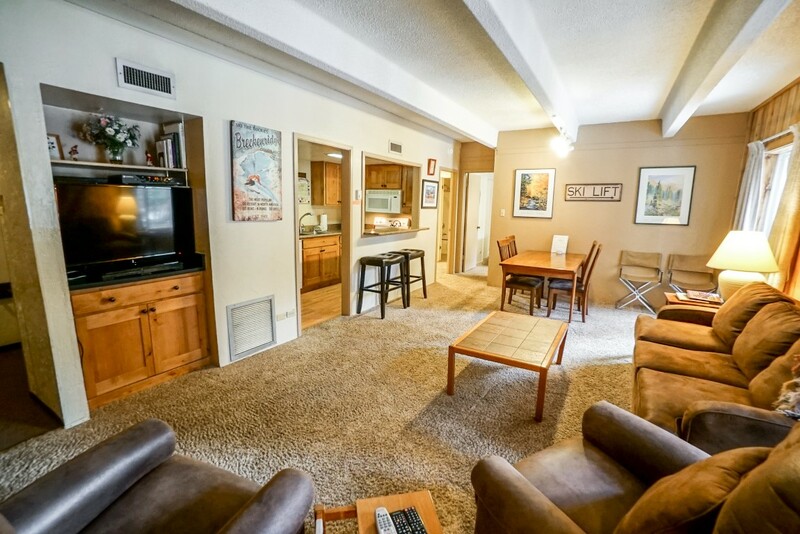 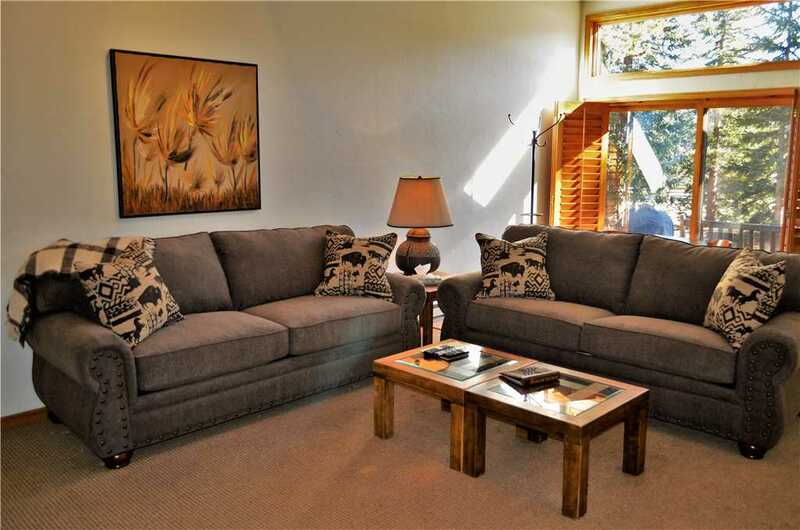 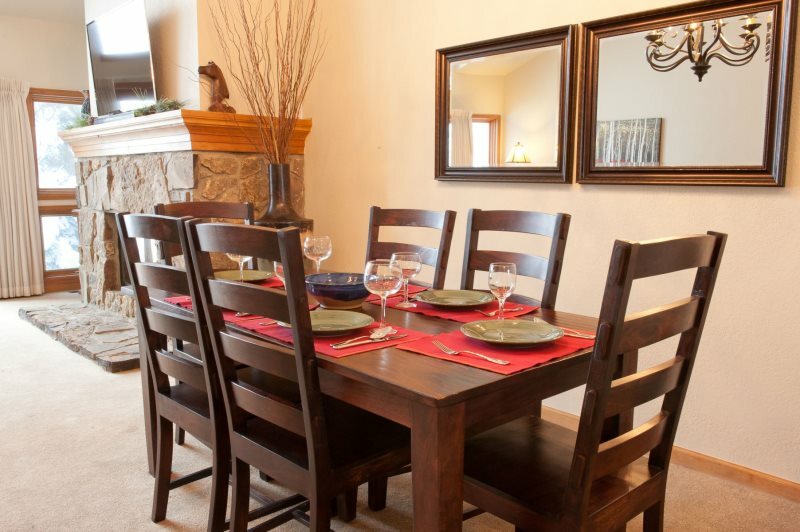 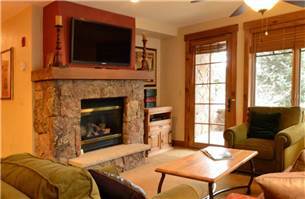 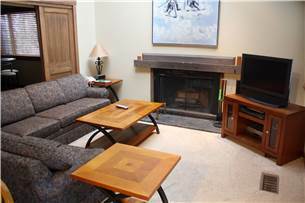 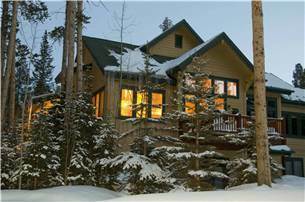 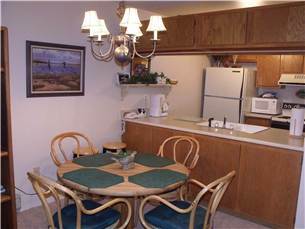 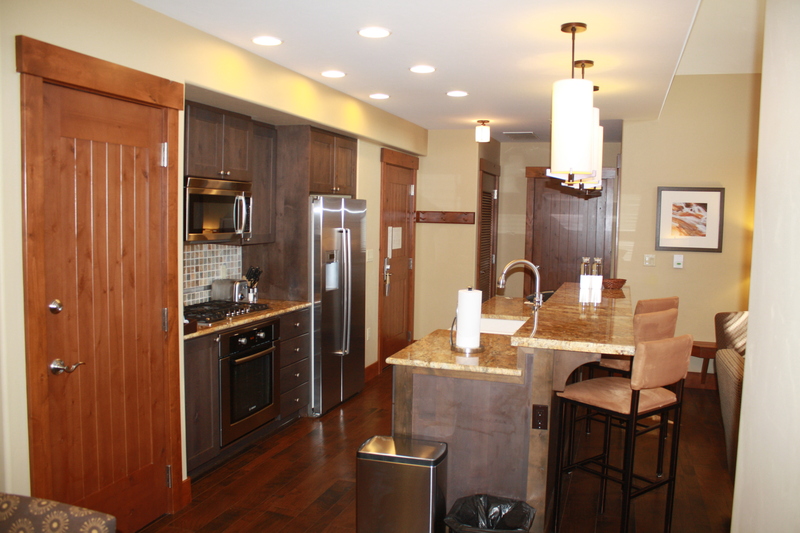 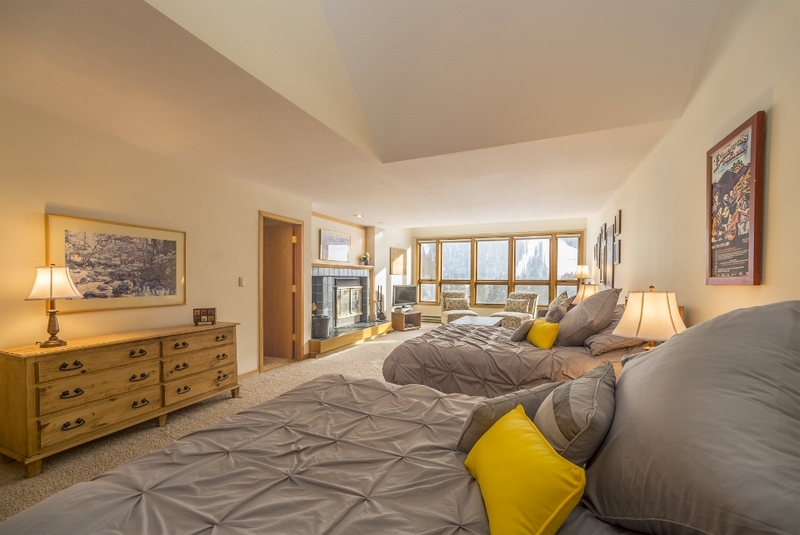 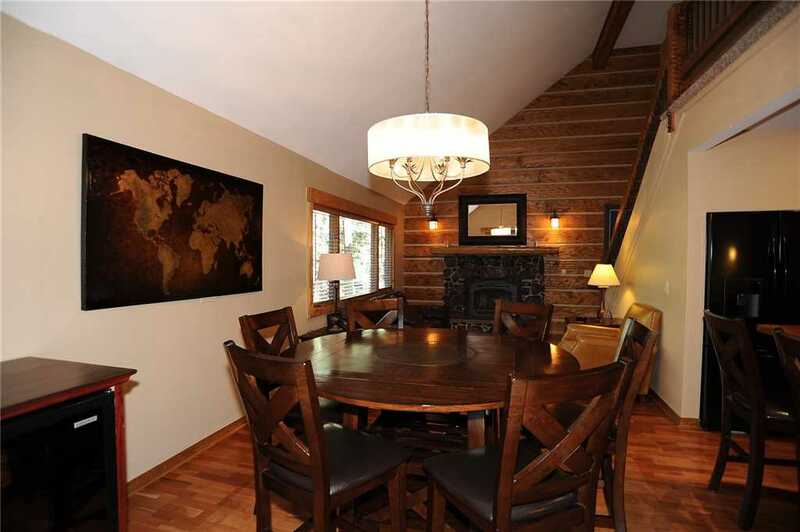 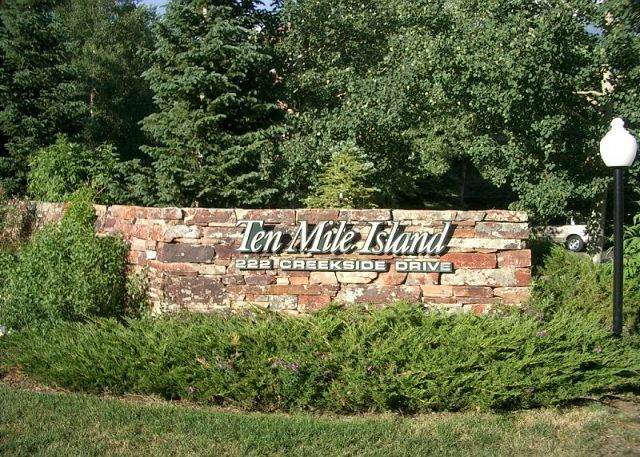 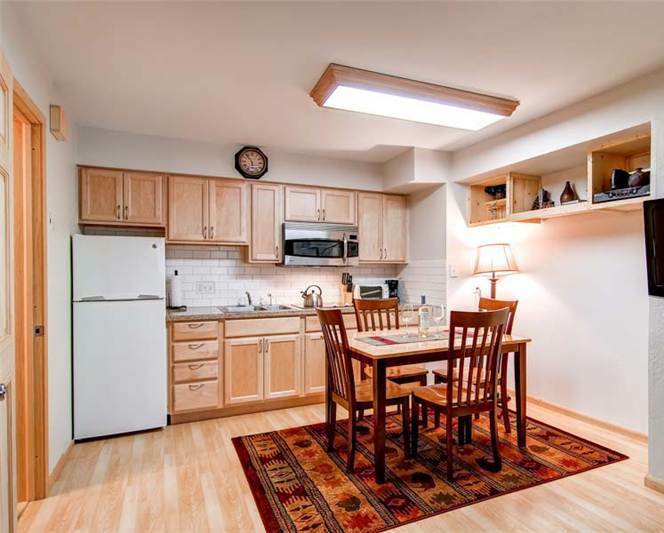 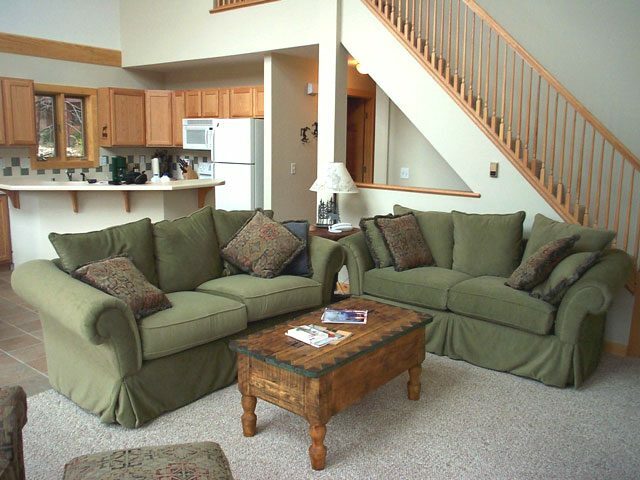 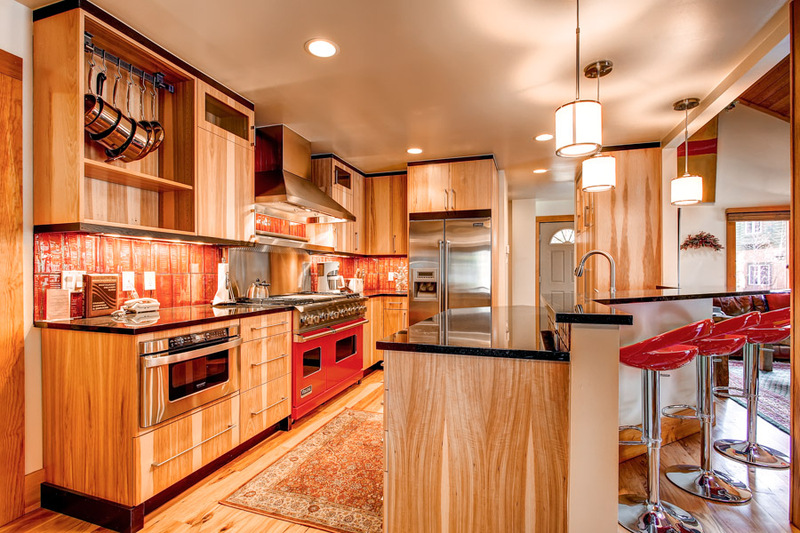 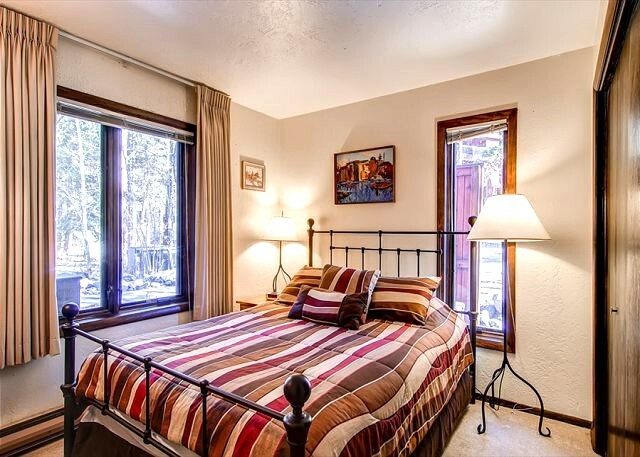 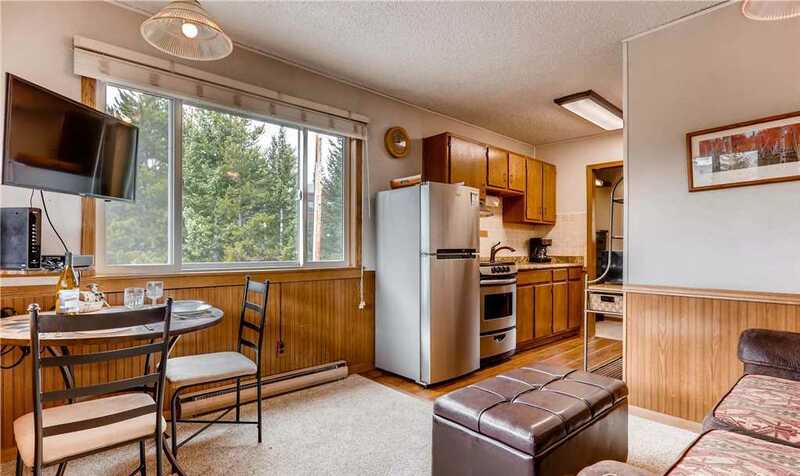 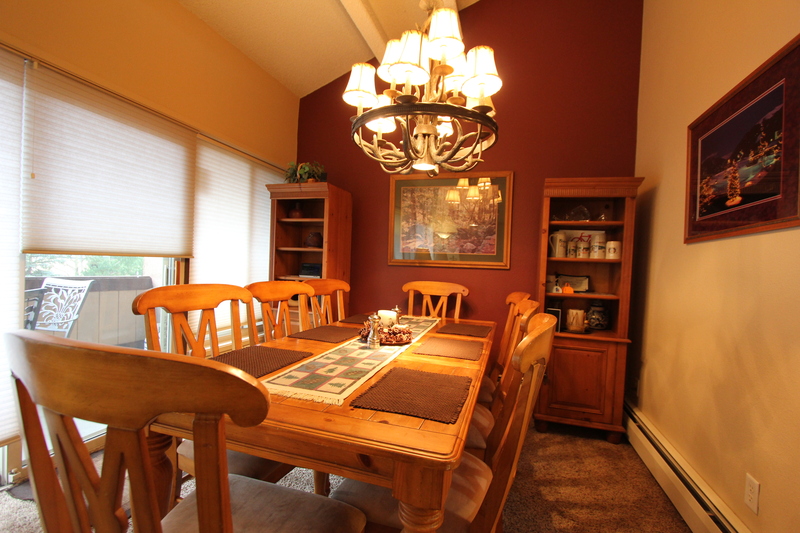 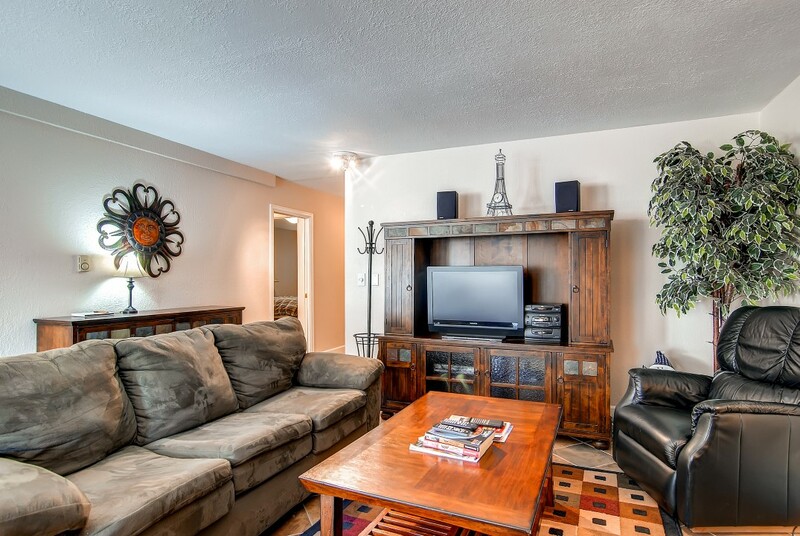 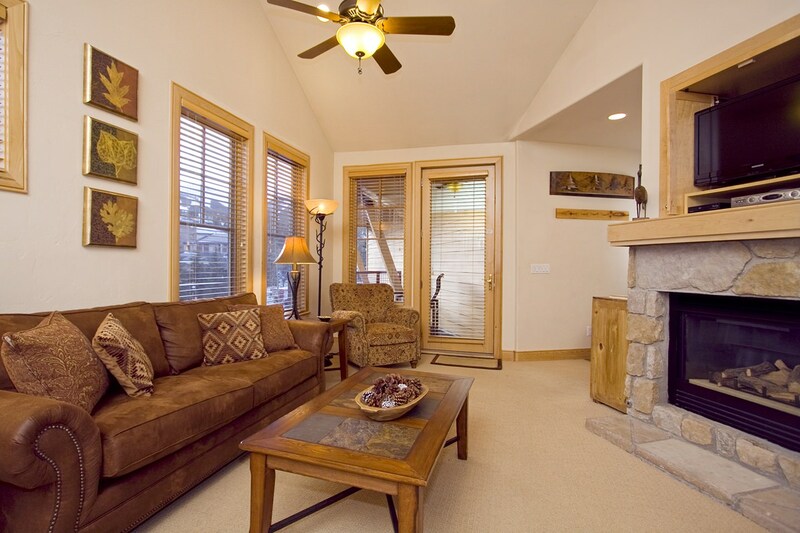 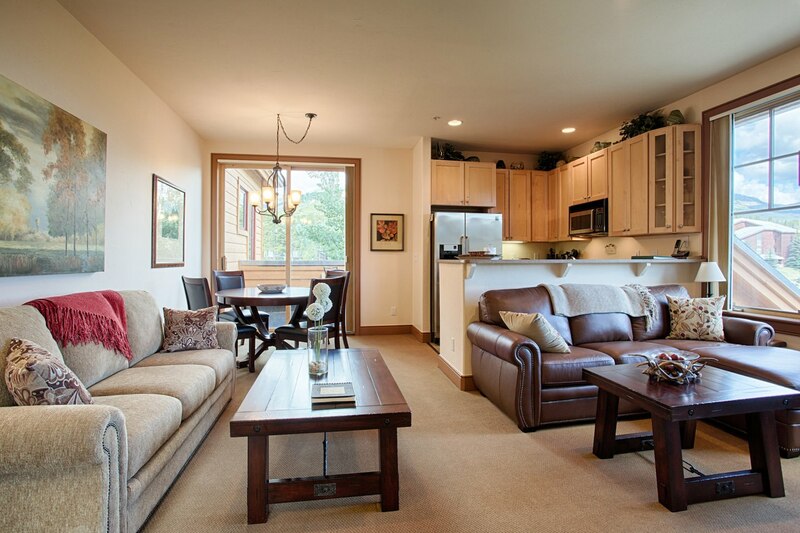 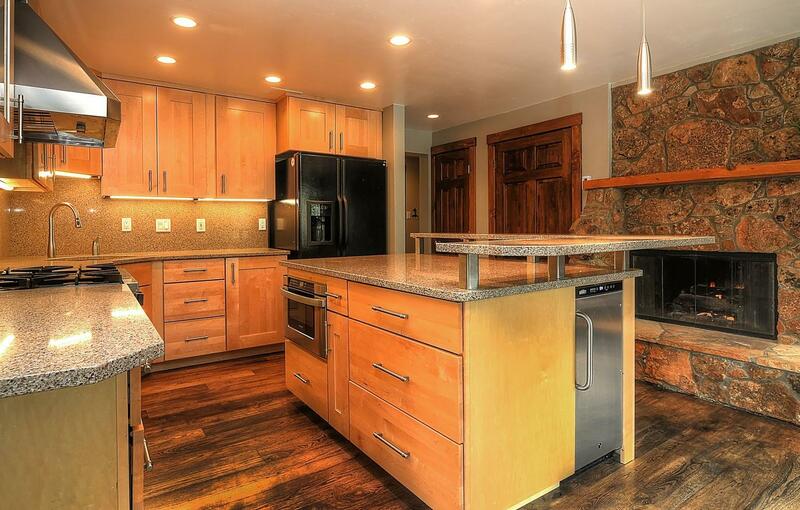 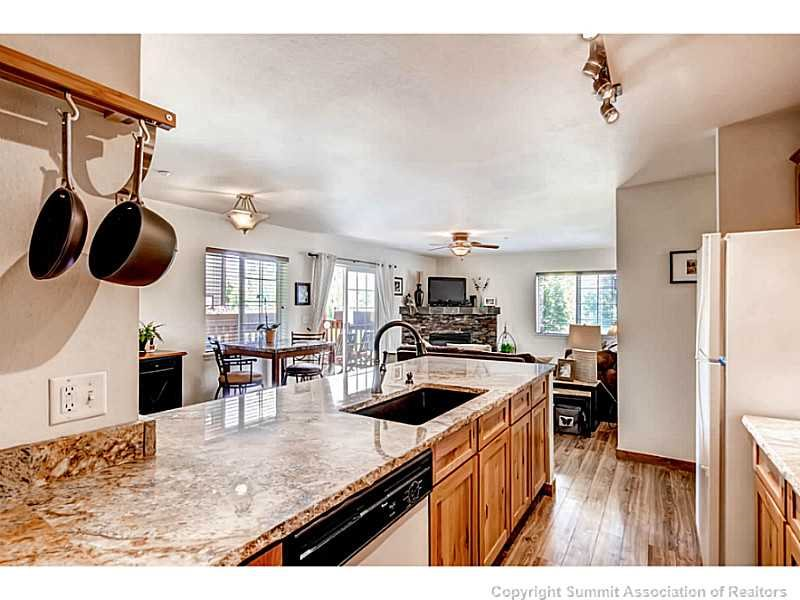 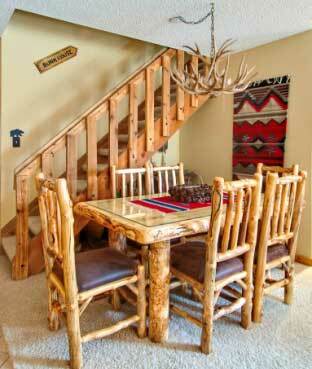 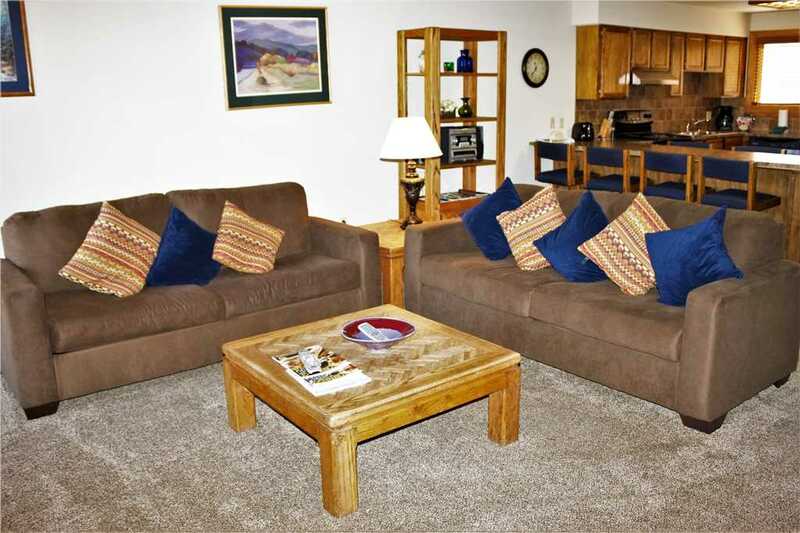 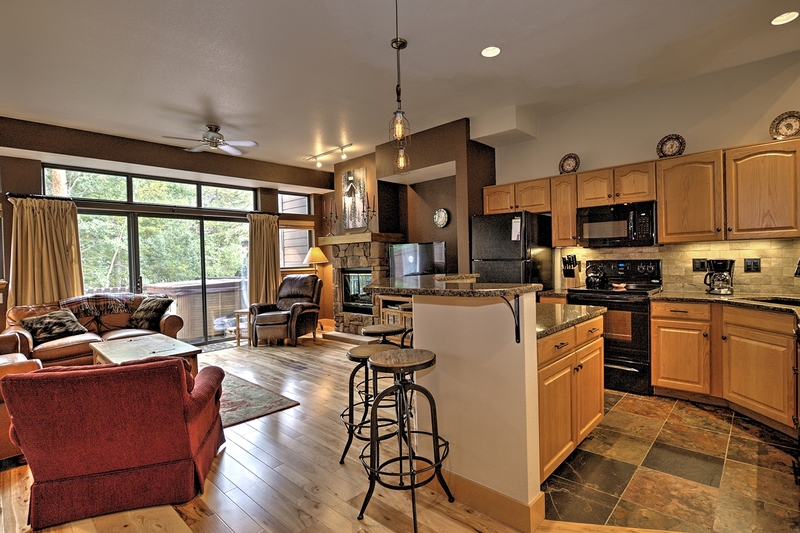 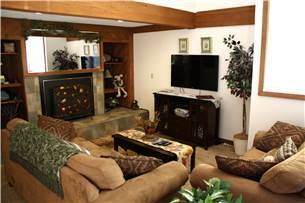 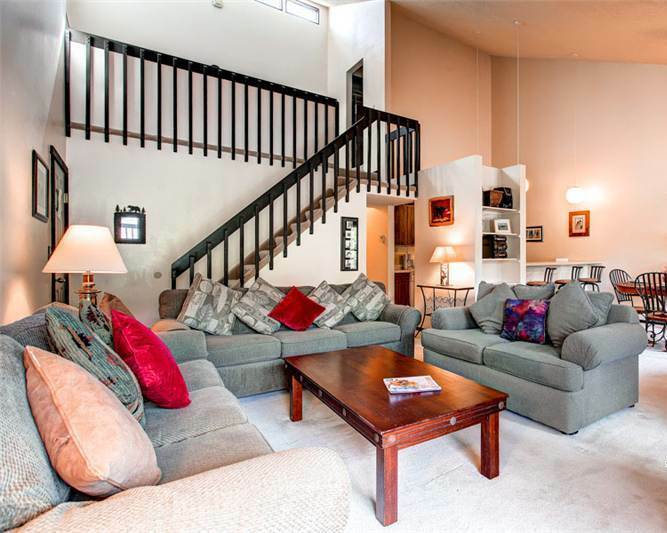 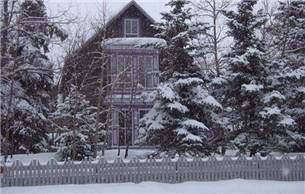 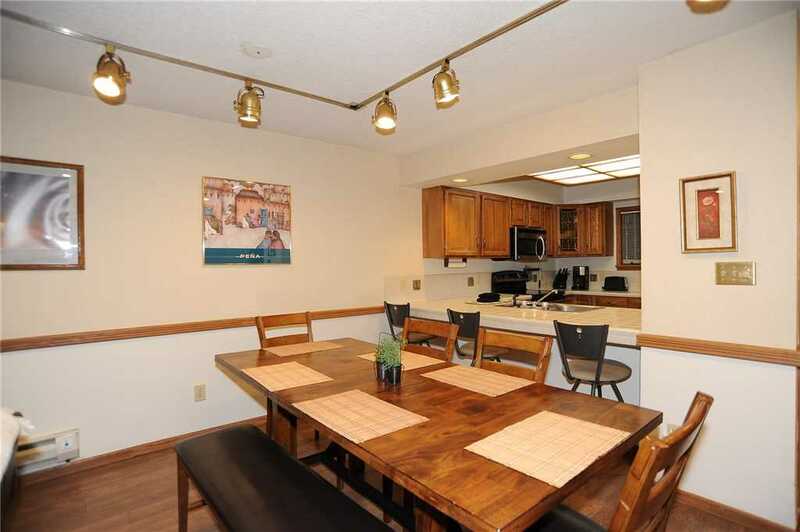 This 1,200 square foot unit has two bedrooms and two bathrooms that makes it easy to accommodate up to eight people. 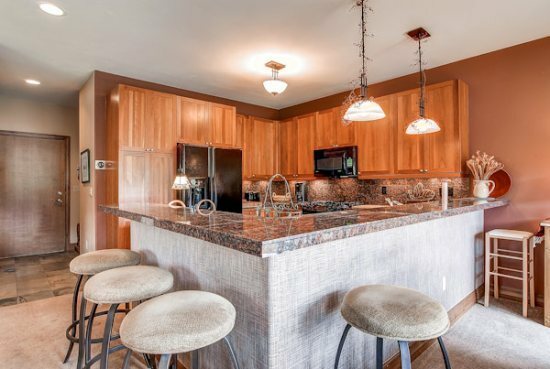 Just off the living room is the gourmet kitchen with granite countertops, stainless steel appliances, wood cabinets, and tile flooring. 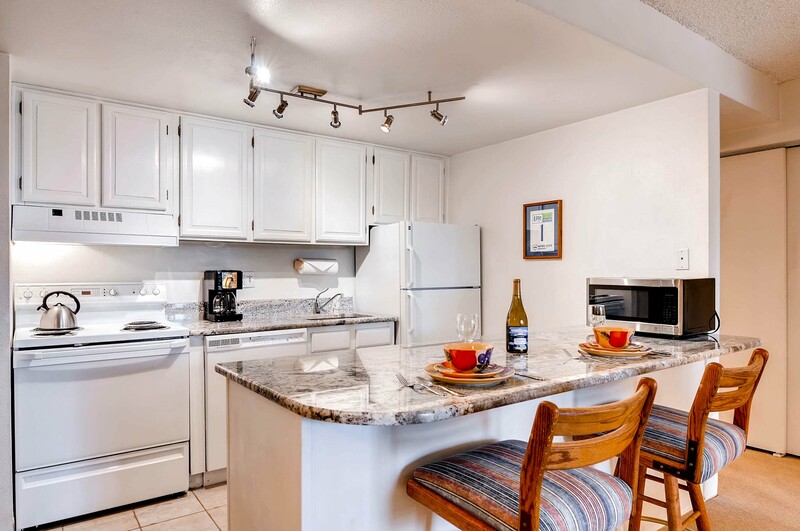 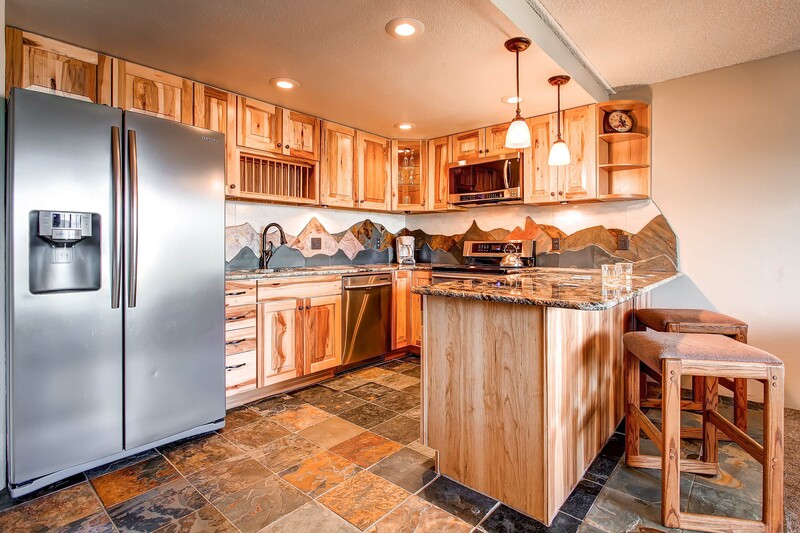 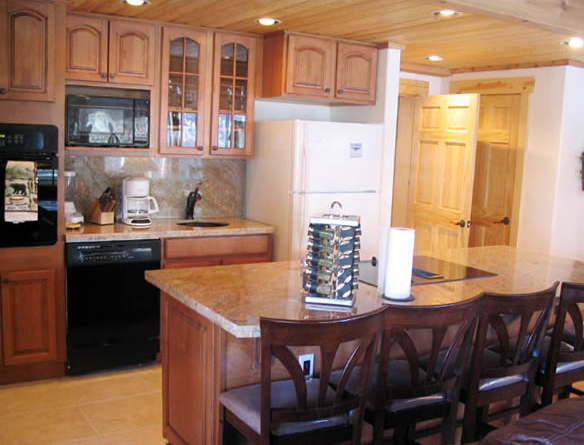 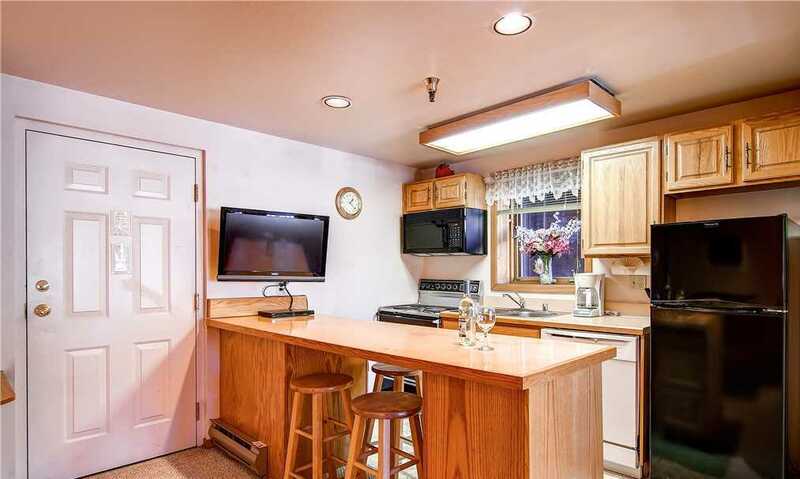 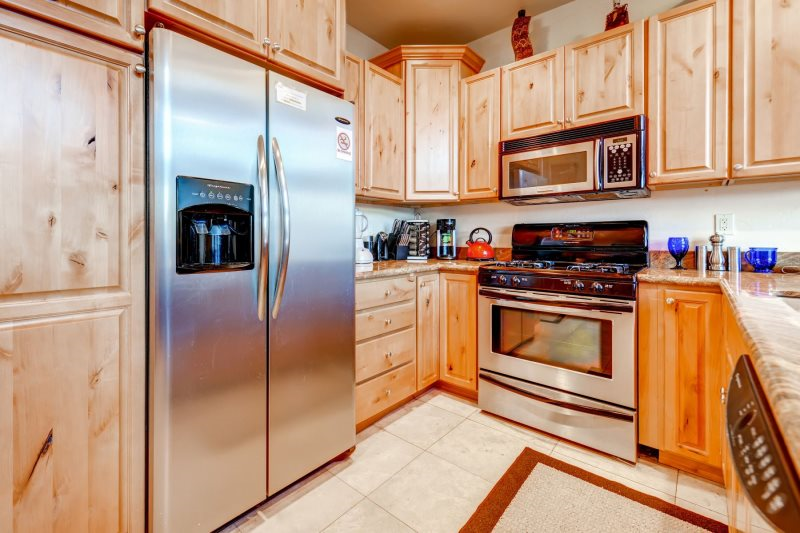 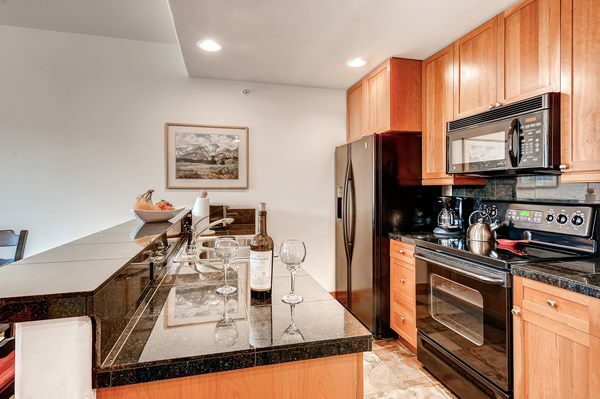 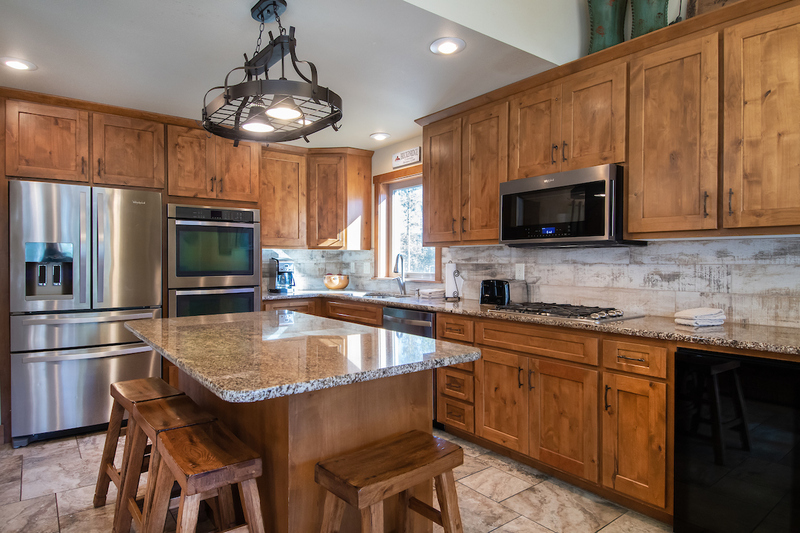 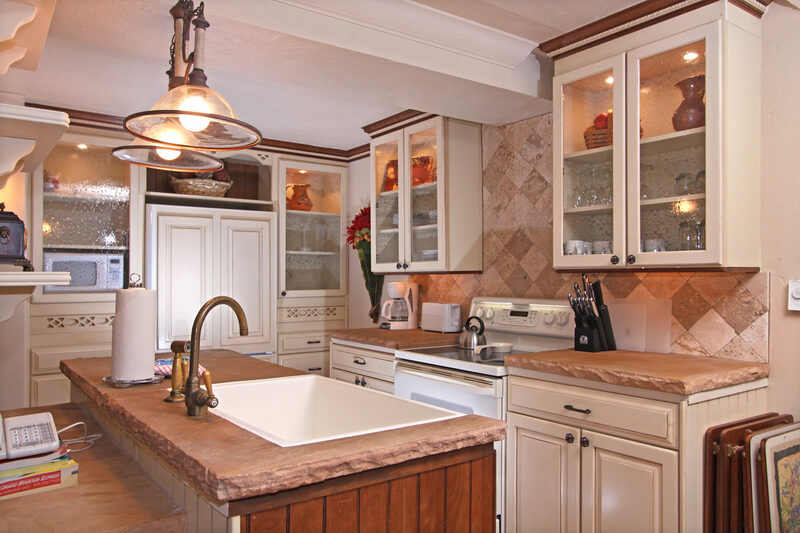 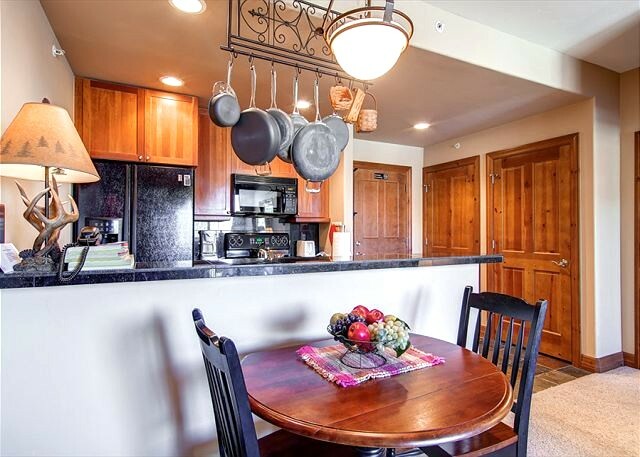 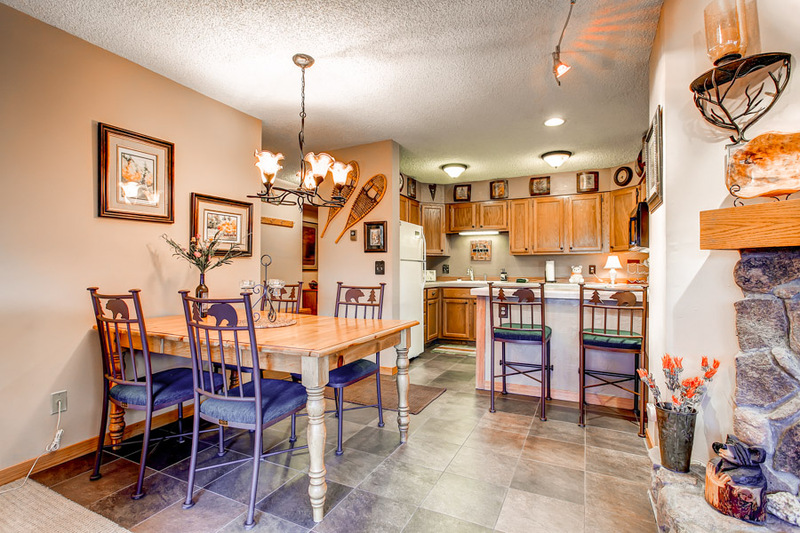 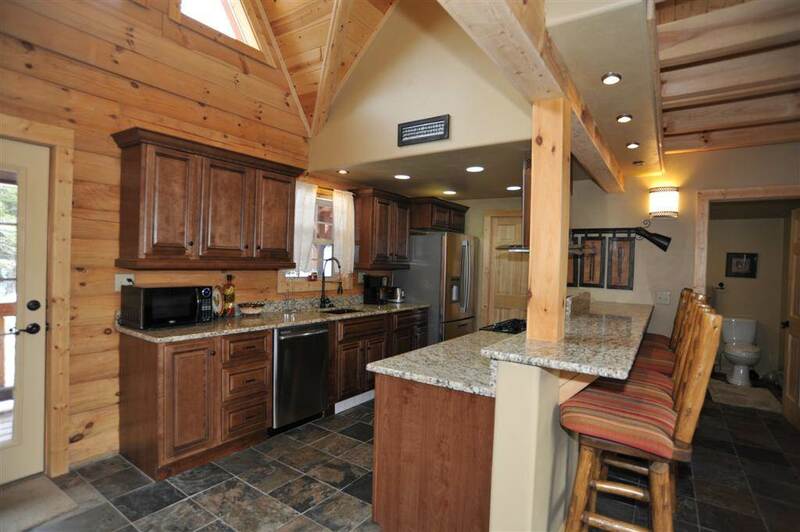 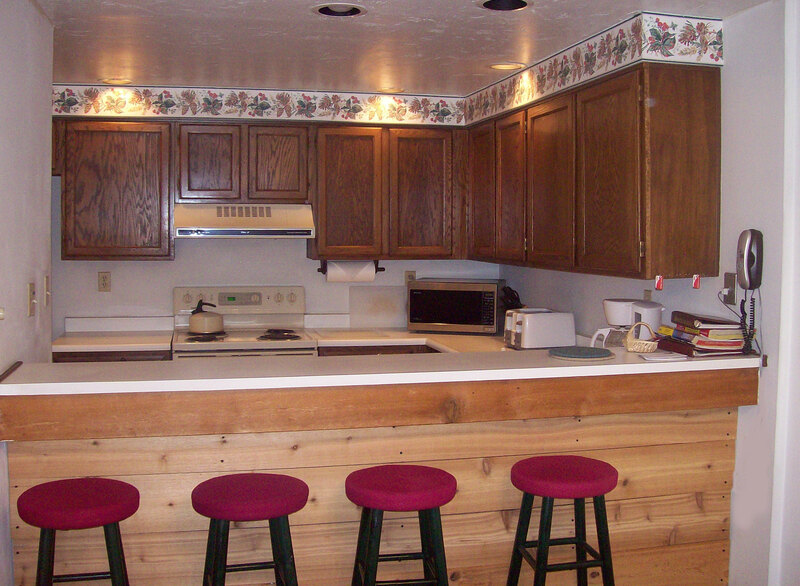 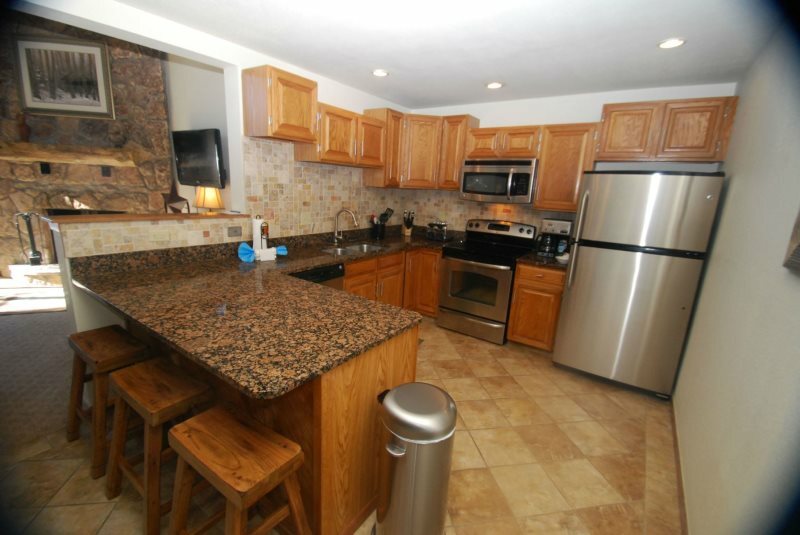 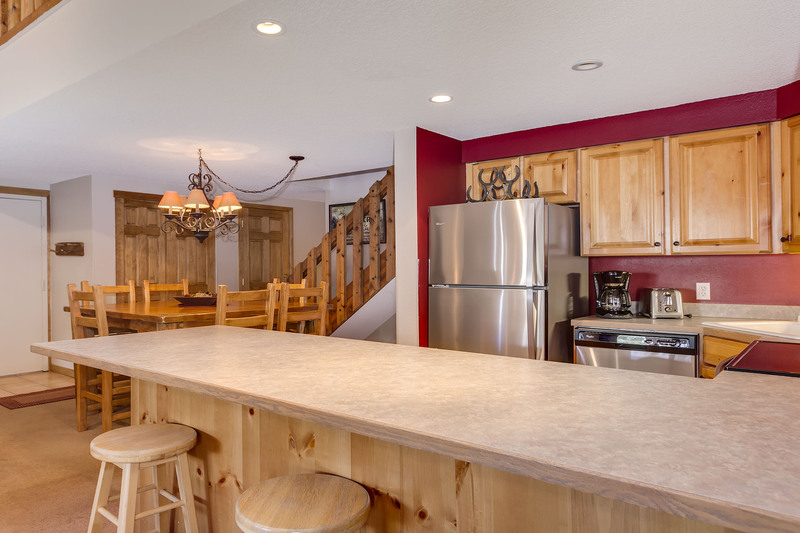 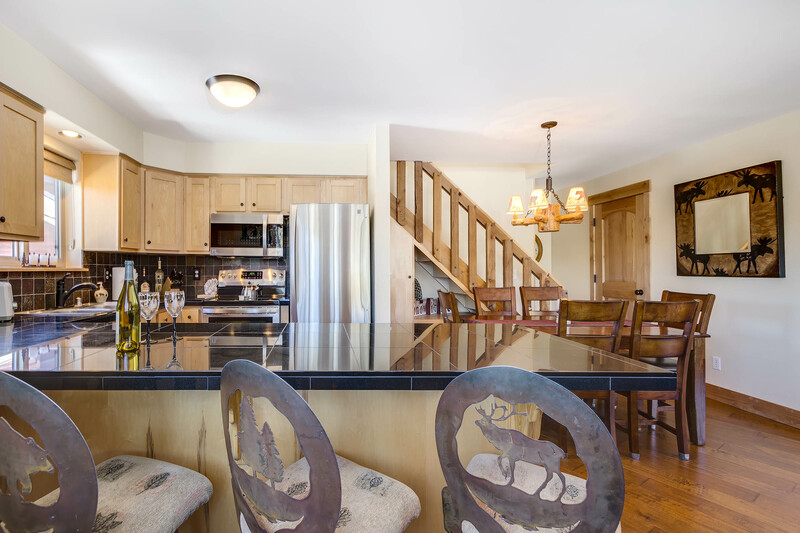 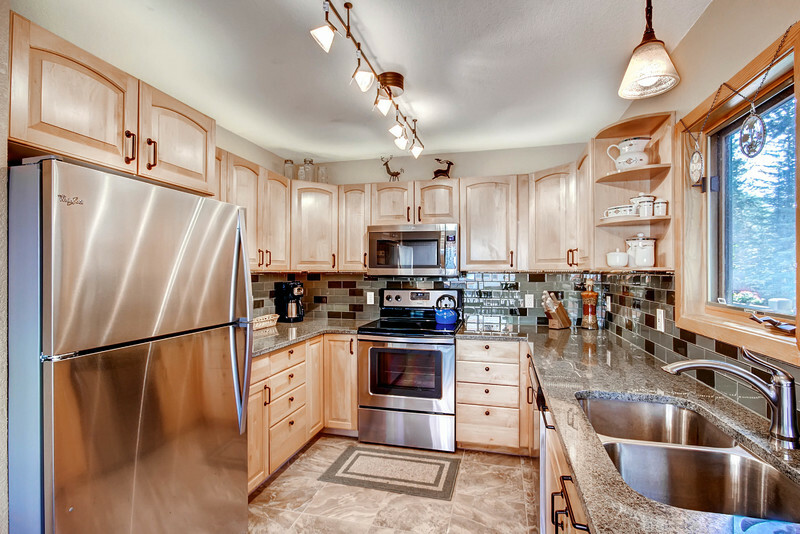 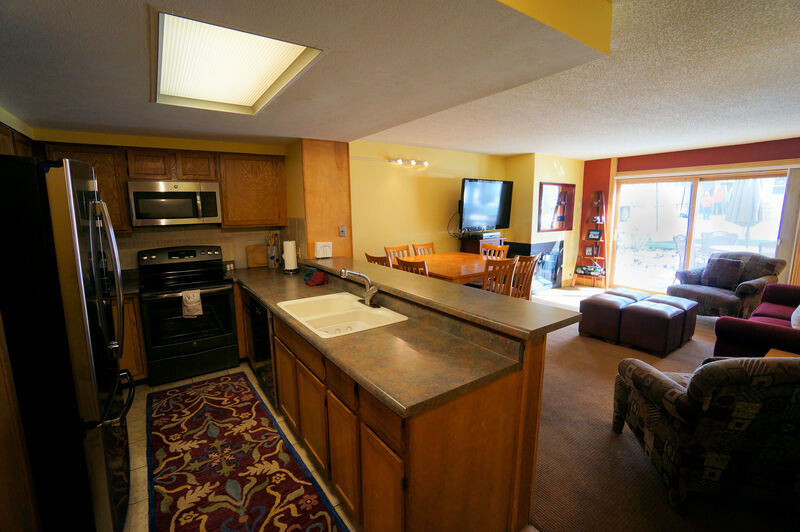 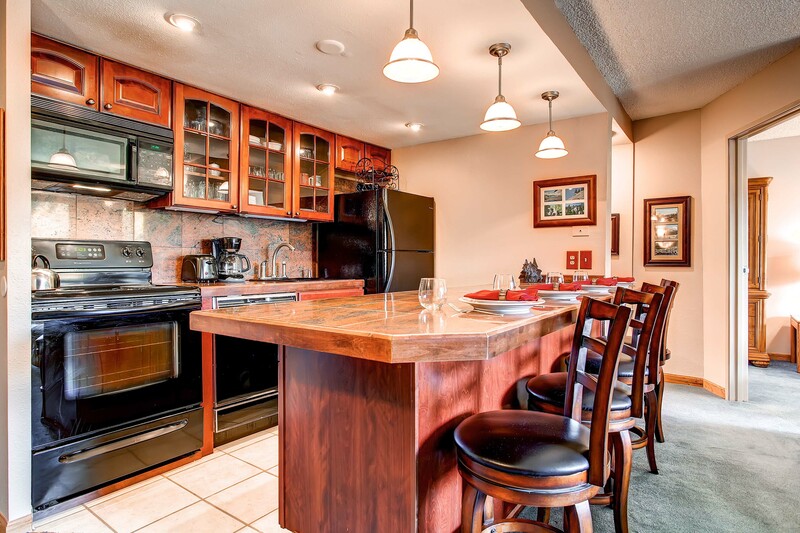 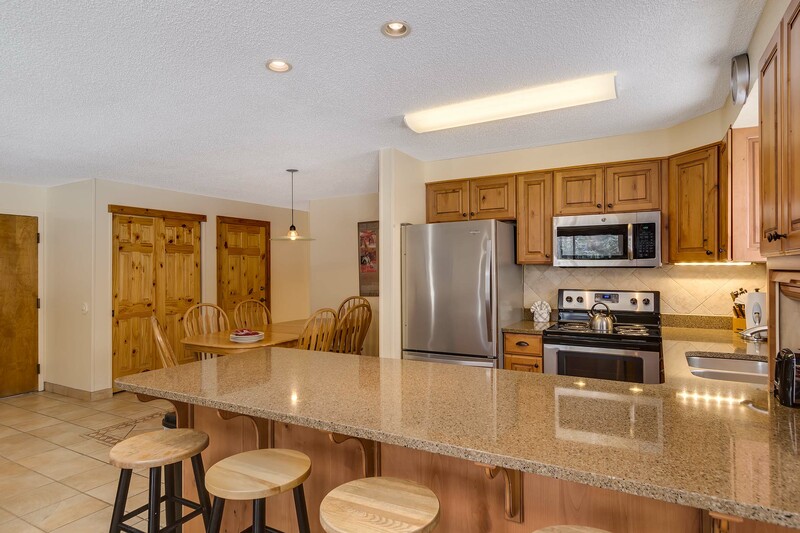 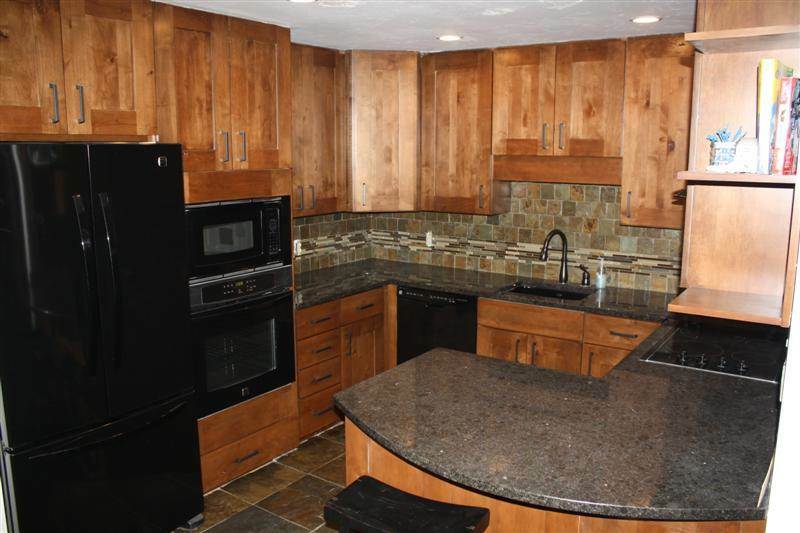 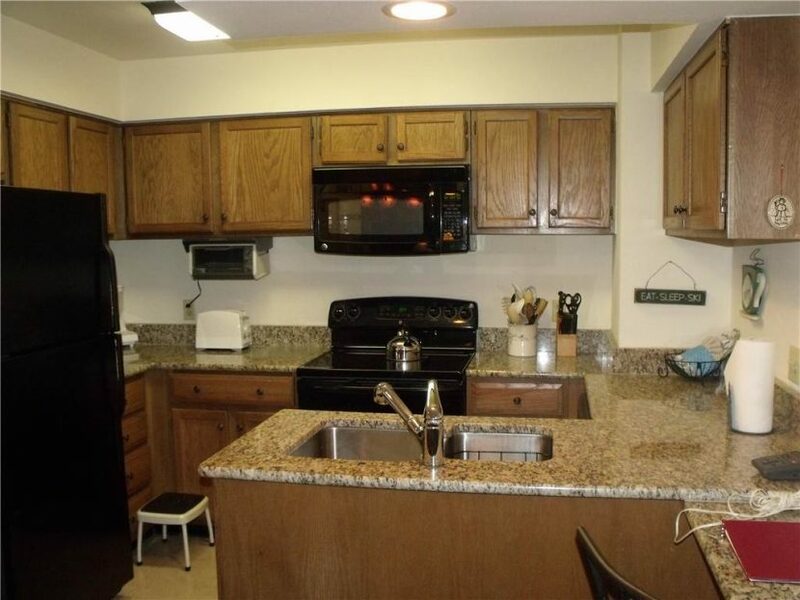 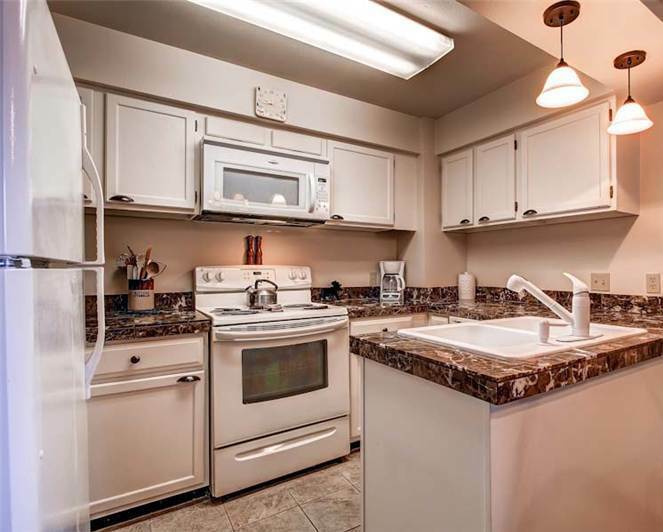 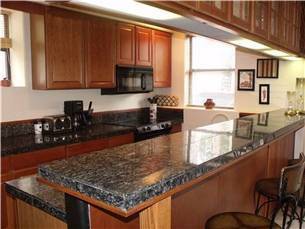 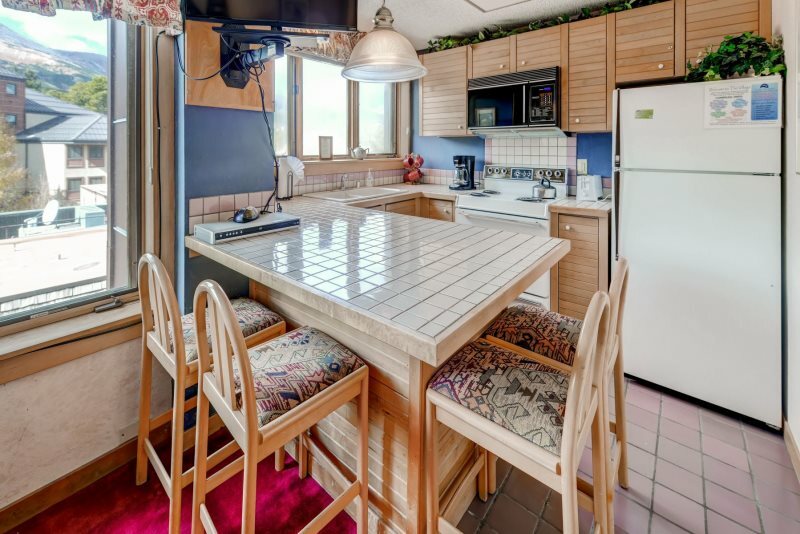 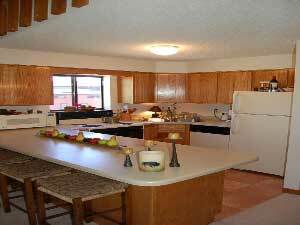 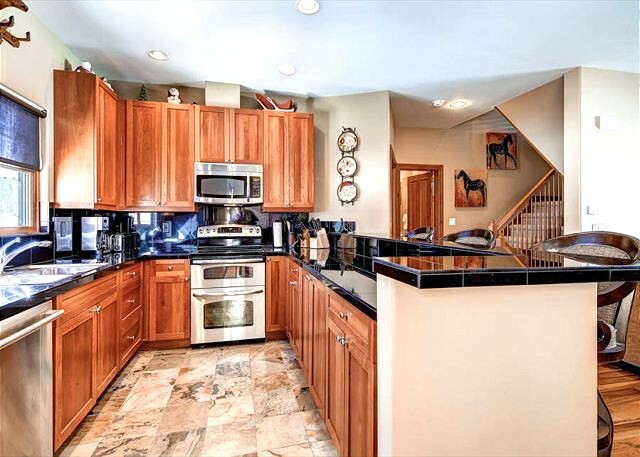 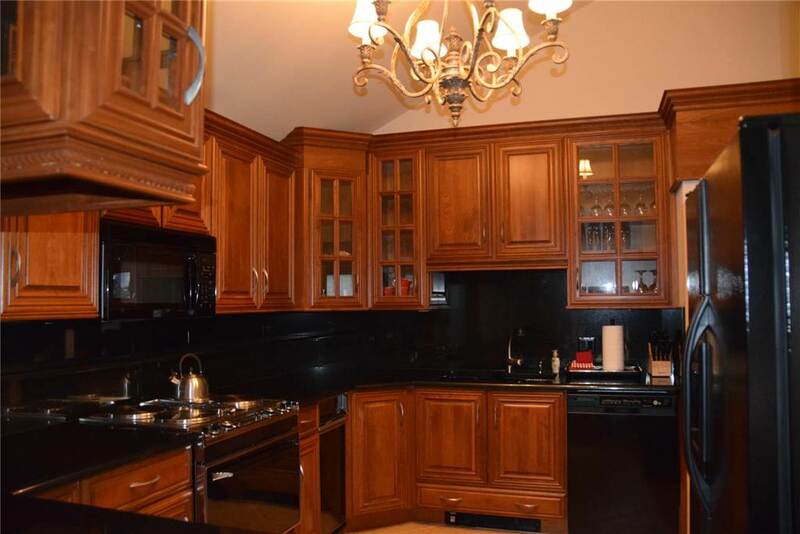 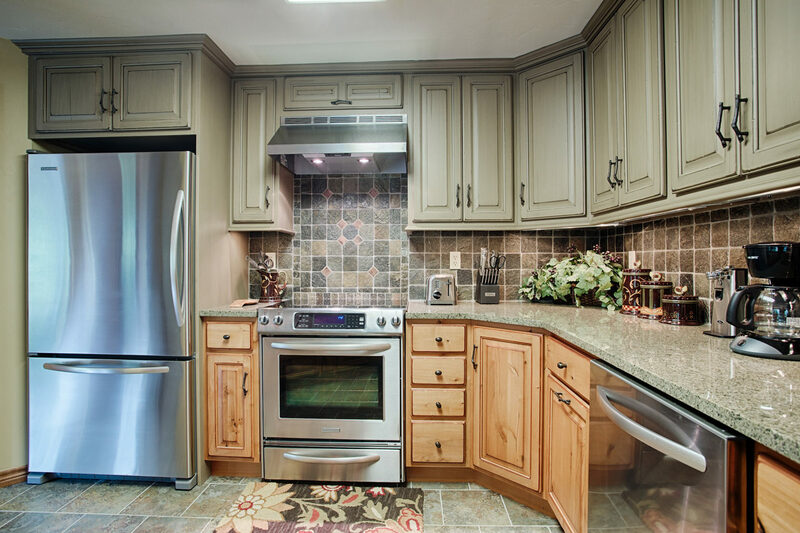 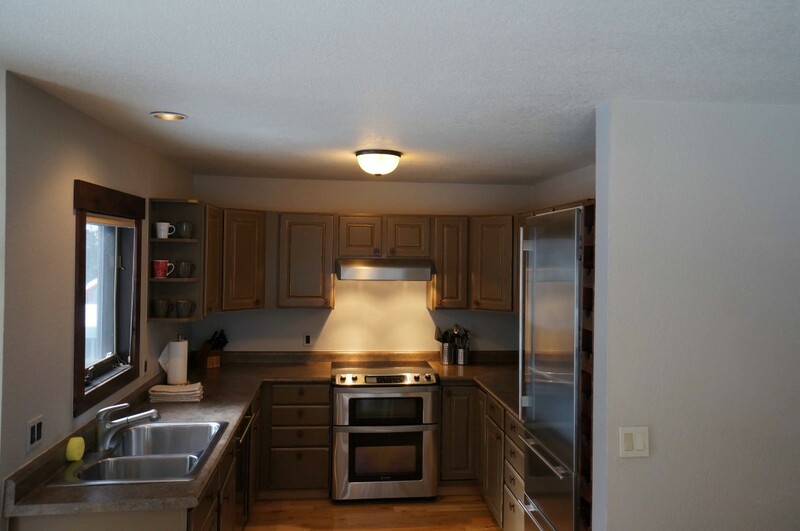 This fully equipped kitchen offers a coffee maker, stove top oven, microwave, refrigerator, and dishwasher as well as cooking and dining utensils. 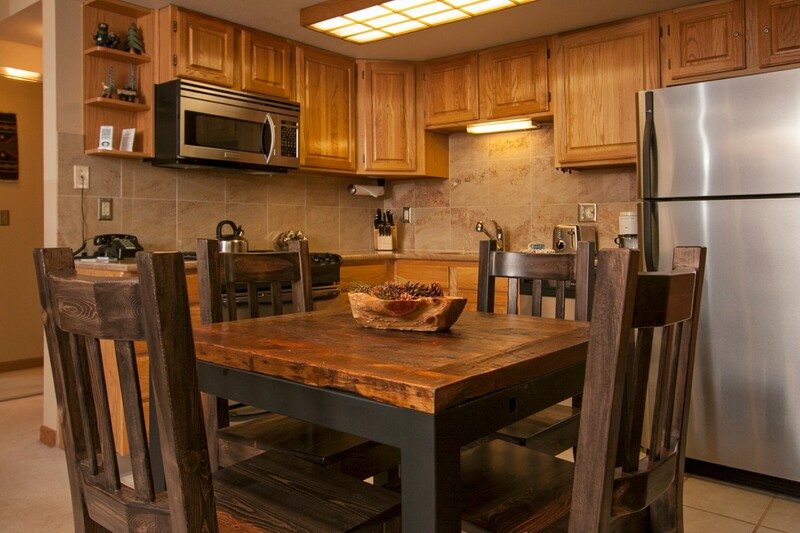 Enjoy a home cooked meal at the wood dining table for eight that encourages lively conversations, even long after dessert has been served. 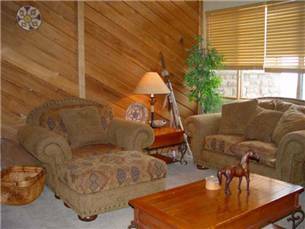 In between the living room and dining area there is a small private deck with outdoor seating for two plus a private gas grill. 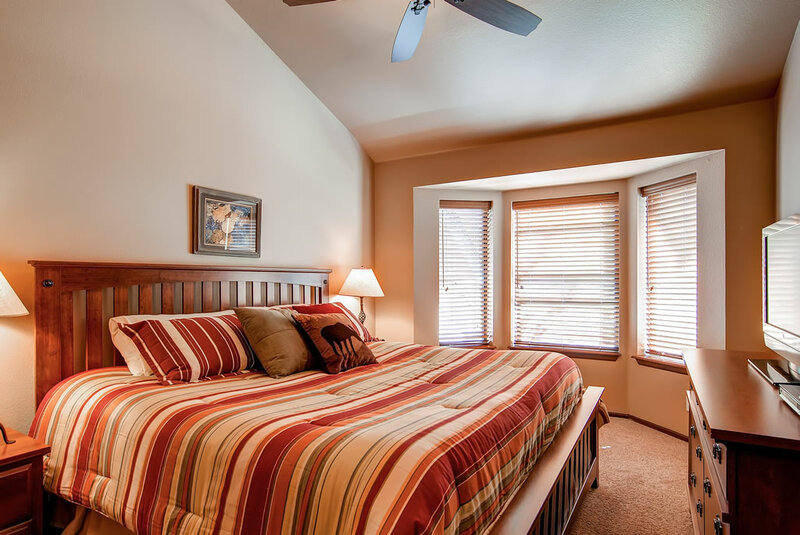 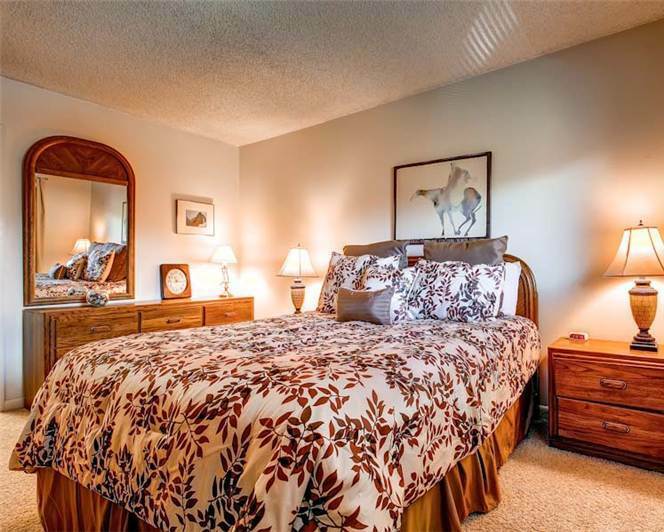 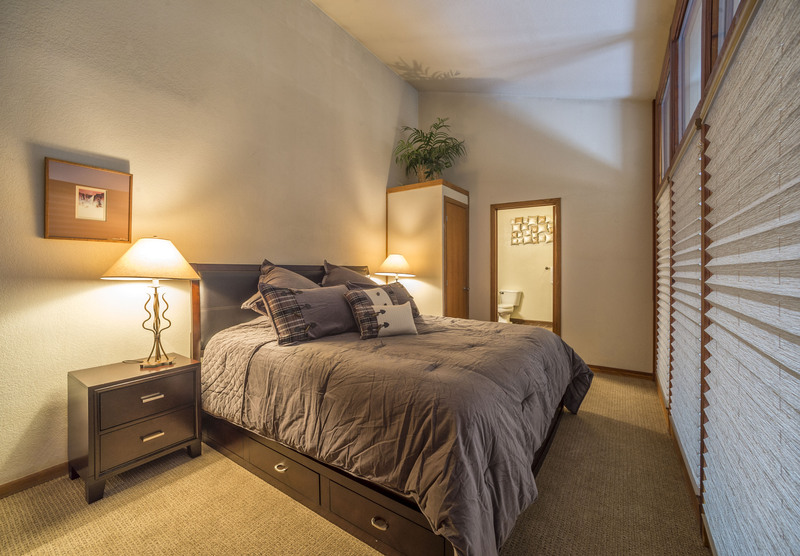 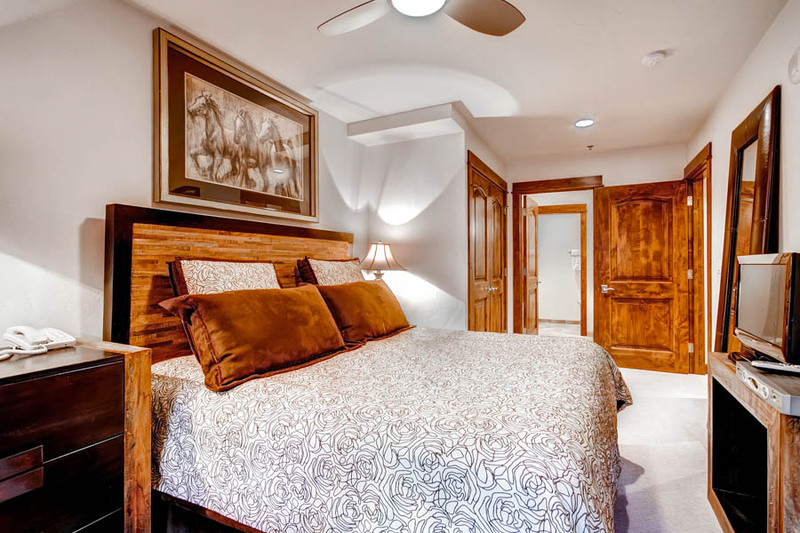 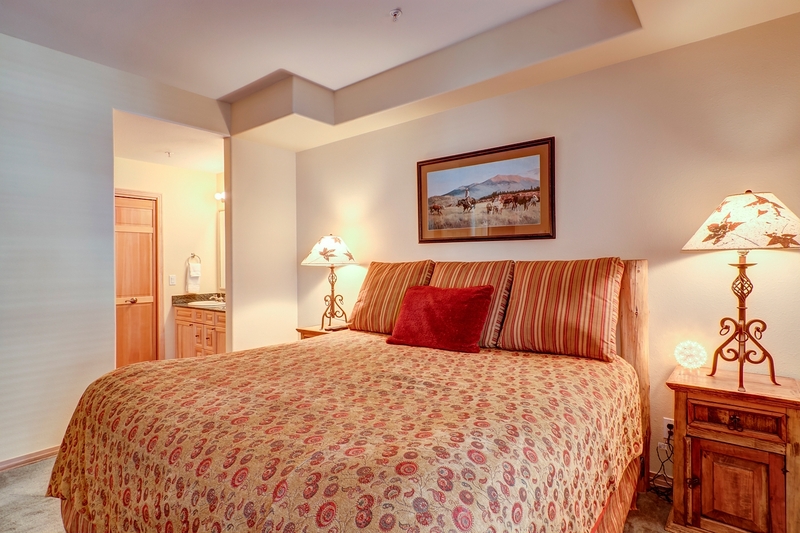 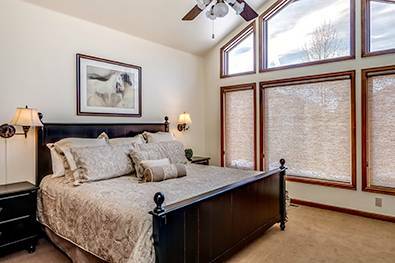 The cozy master bedroom located at the rear of the condo offers a plush King bed, 32″ flat screen TV, and a private bathroom with tile flooring, dual sinks, and a tiled shower. 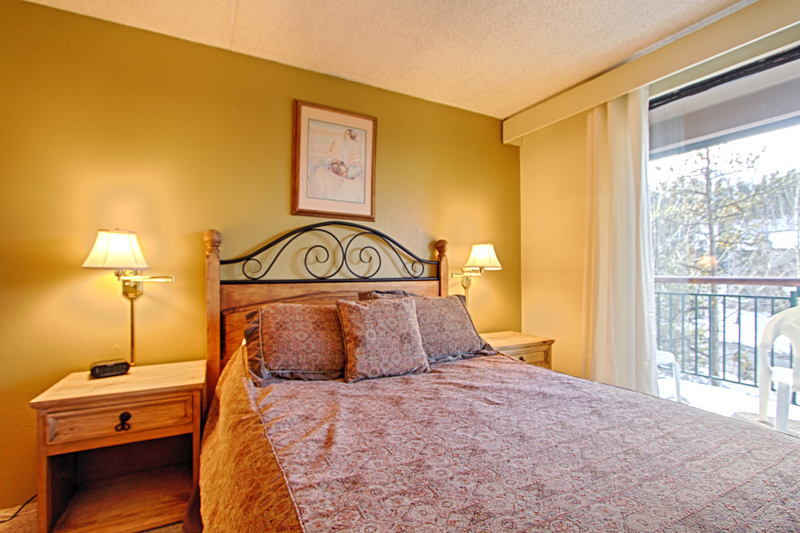 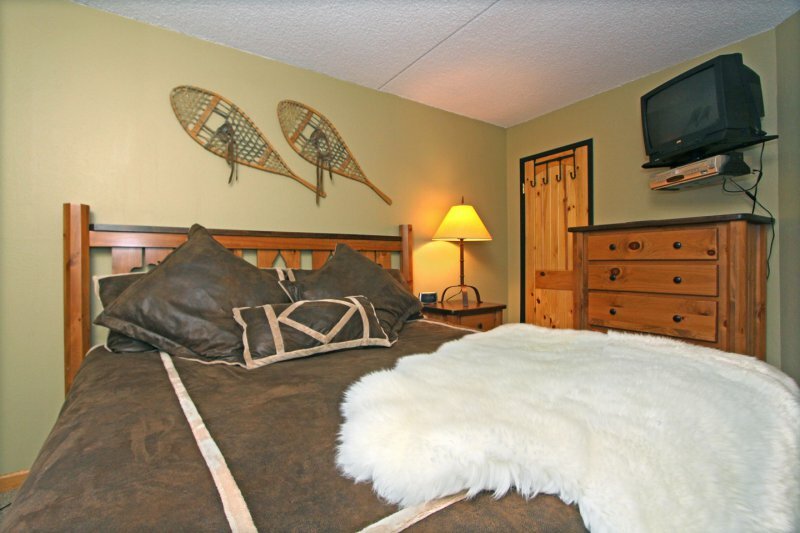 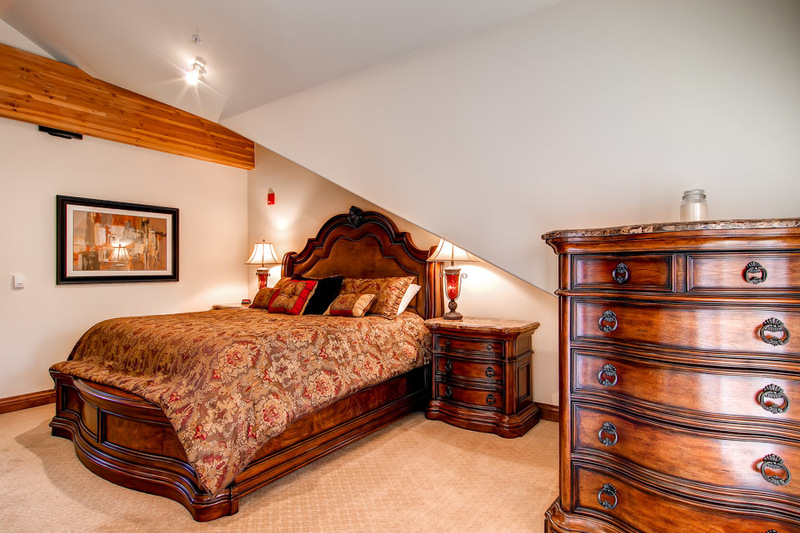 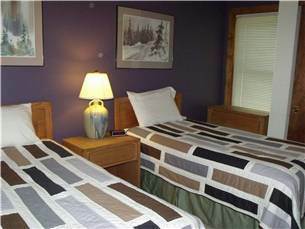 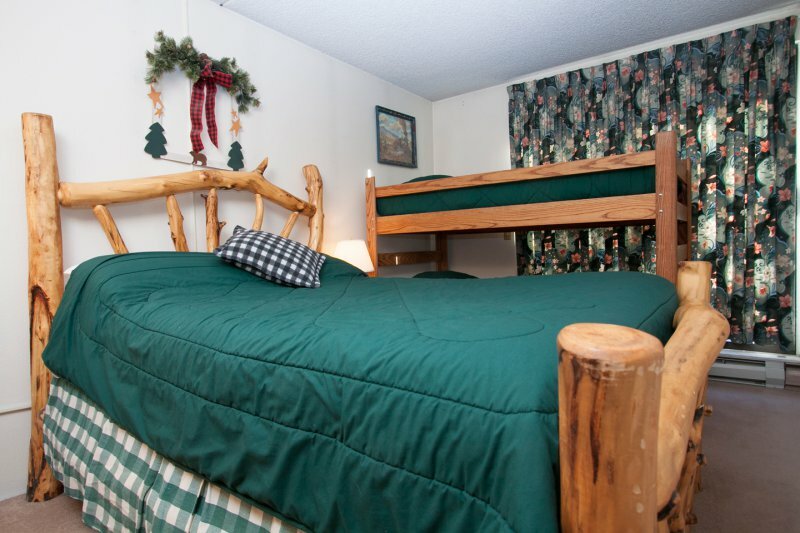 The second bedroom offers a Full Bed and a 32″ flat screen TV. 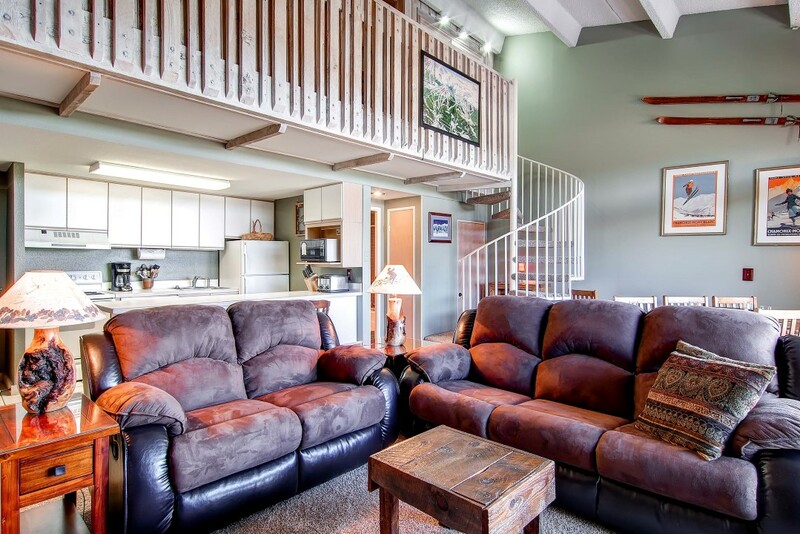 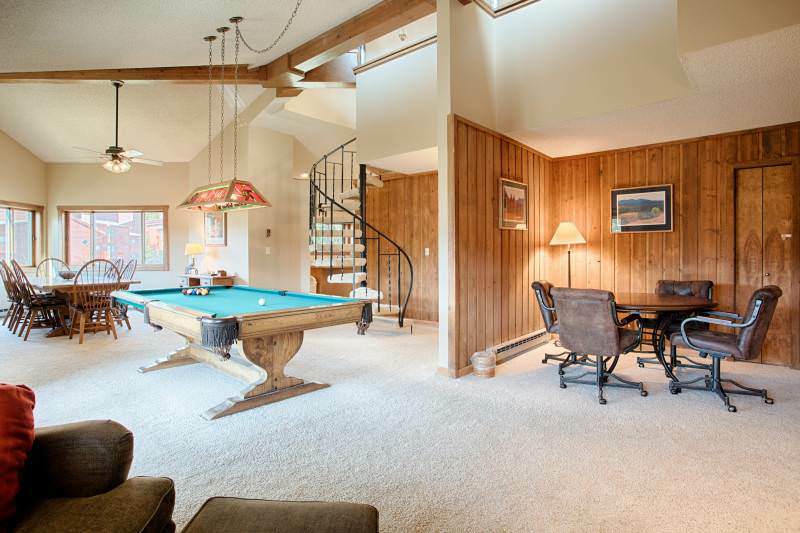 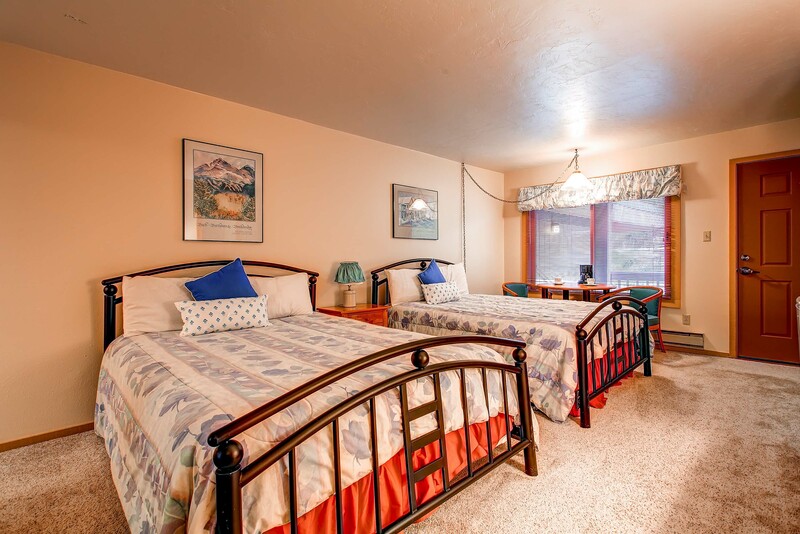 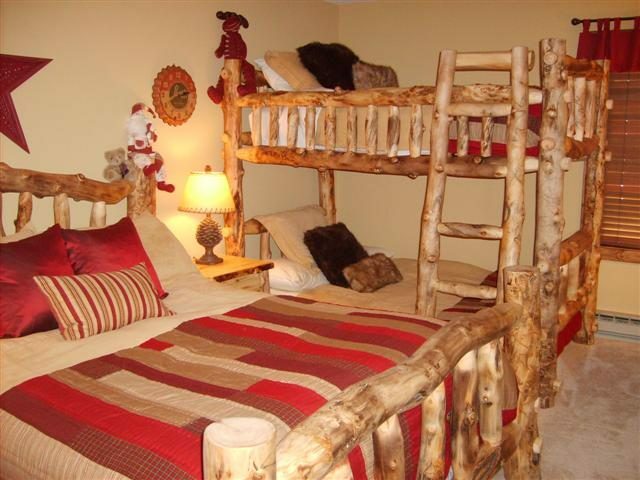 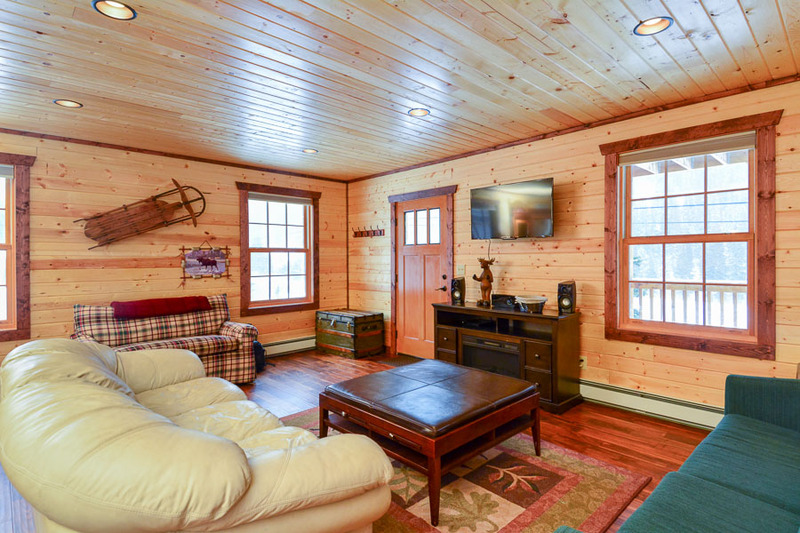 The small open den/game room has a Full Bunk Bed (For Children), a 32″ flat screen TV, and a connected XBOX 360 with games for entertaining the kids. 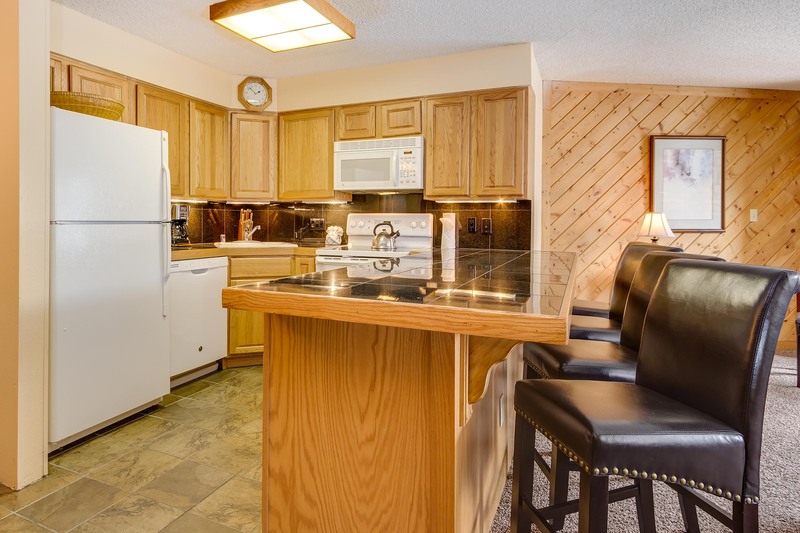 The hallway connecting the bedrooms and den offers a nicely decorated shared bathroom with tile flooring and a shower/tub combination along with a private washer & dryer.